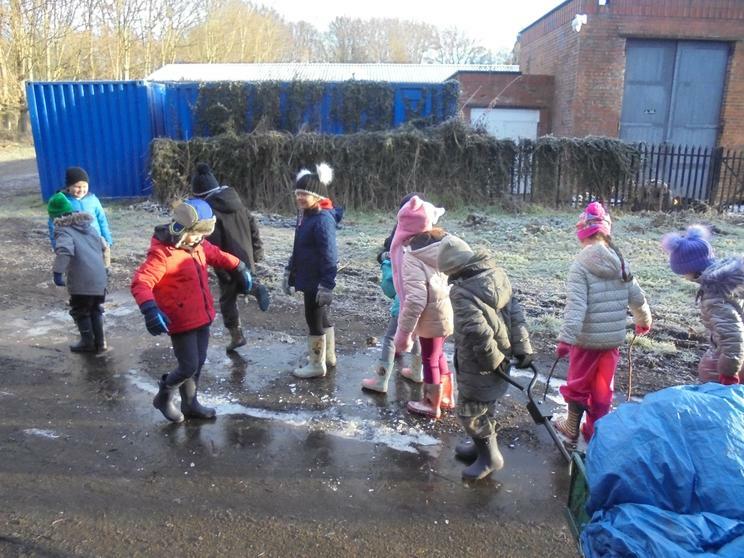 We had a very full last session doing all the things that the children like to do. 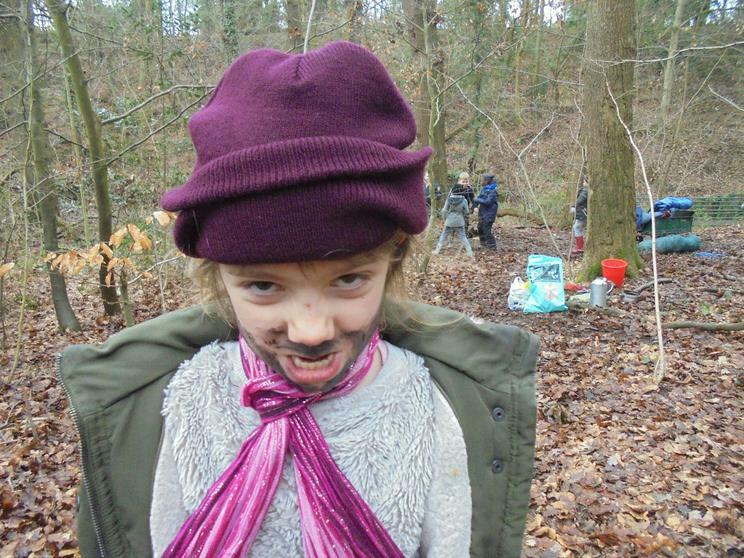 We had a game of Wolfie Julia. 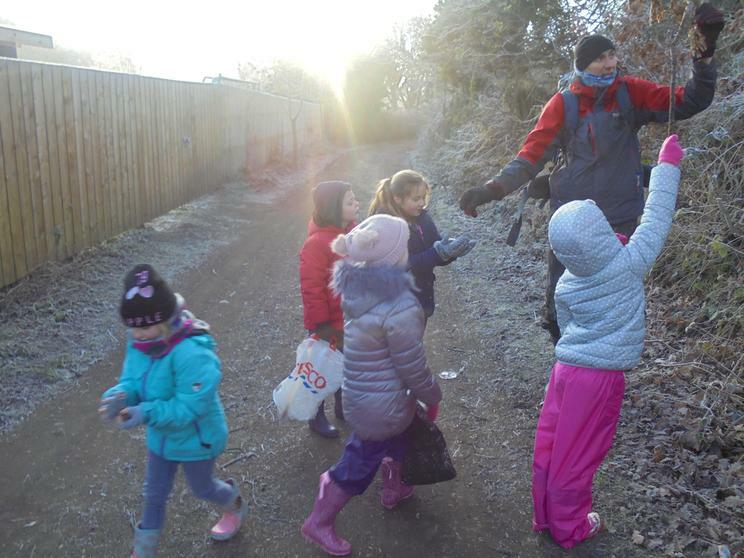 It was nice that the children didn't freeze this week. 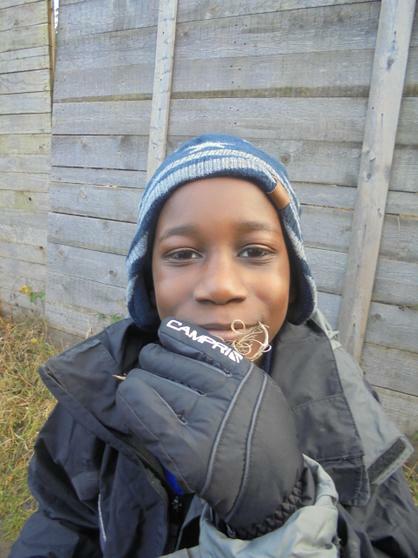 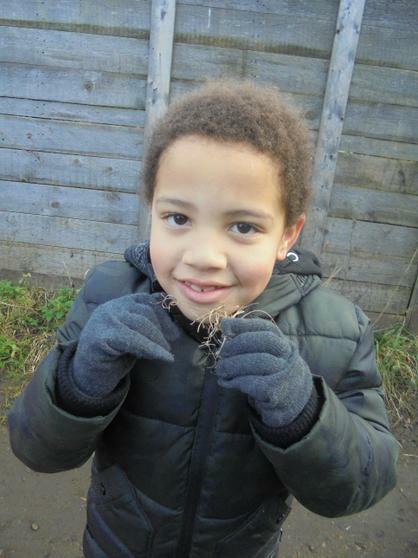 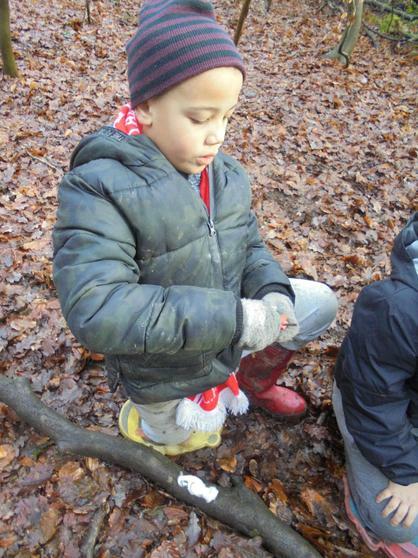 Some children thought they saw Aydin's scarf that went missing a couple of weeks ago. 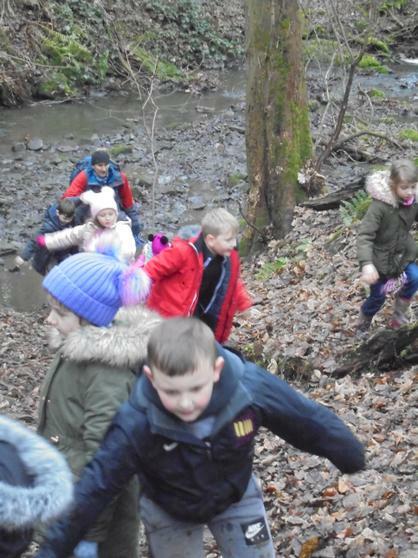 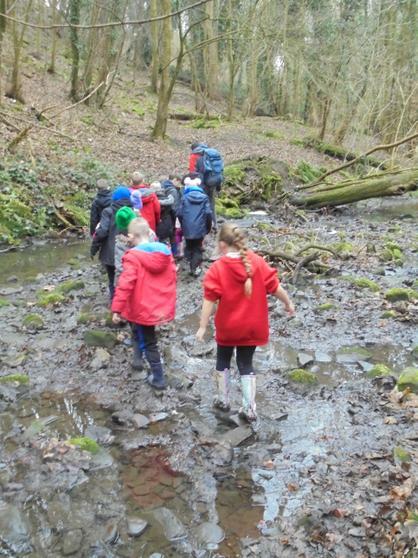 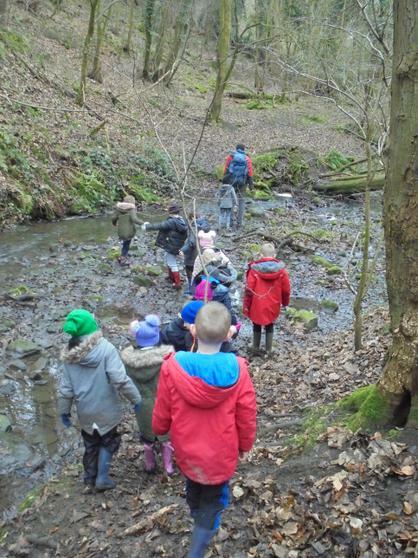 We set off on an adventure but where we have had rain the stream had grown. 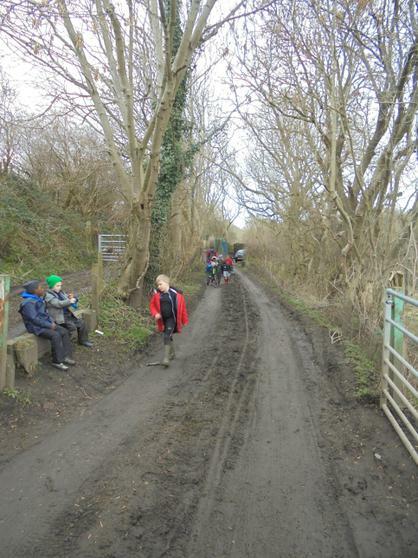 We could no longer safely cross so we had to turn back. 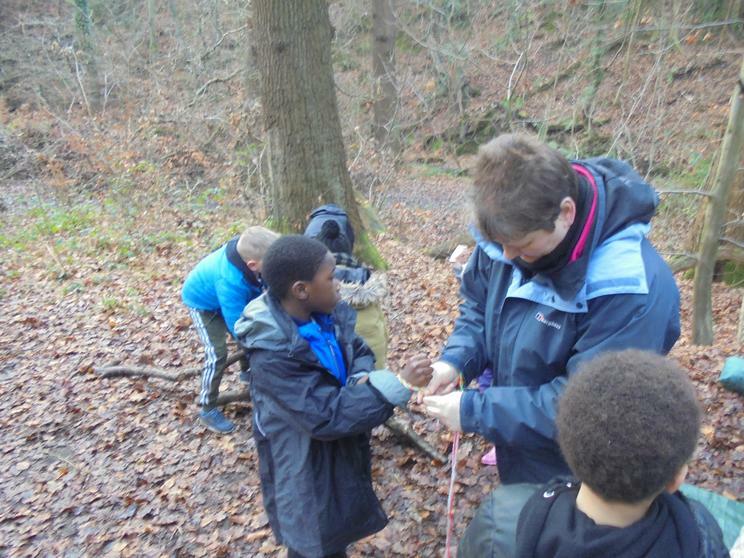 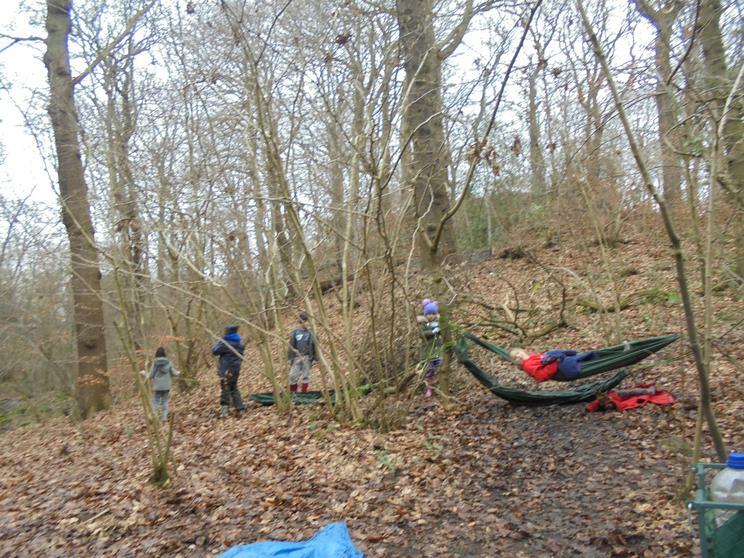 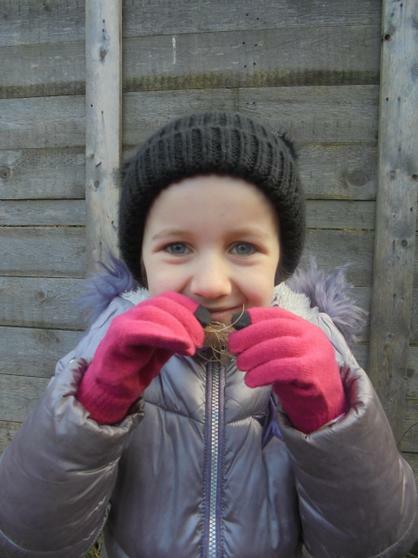 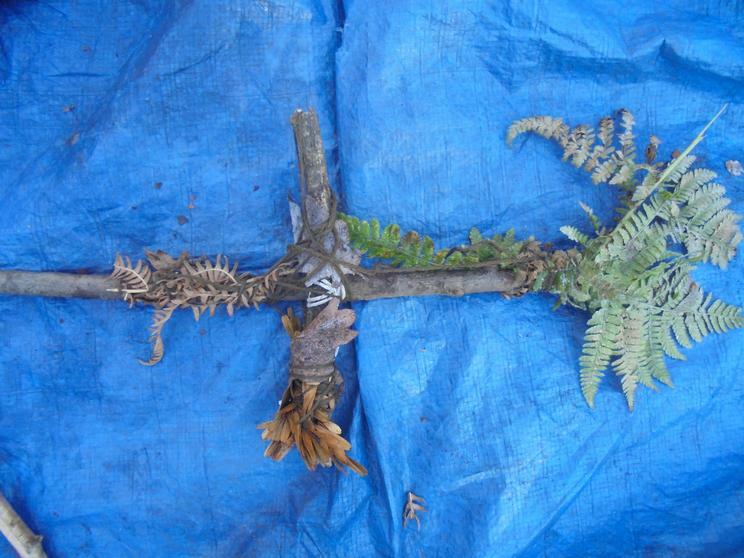 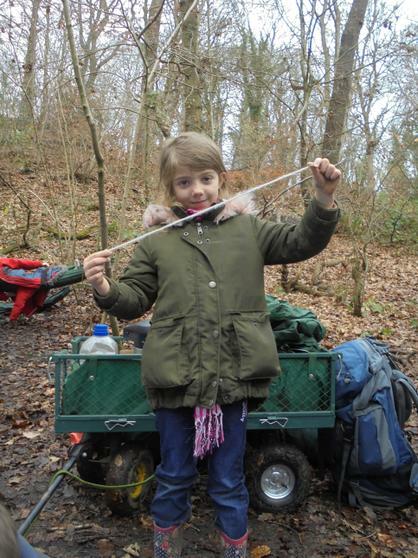 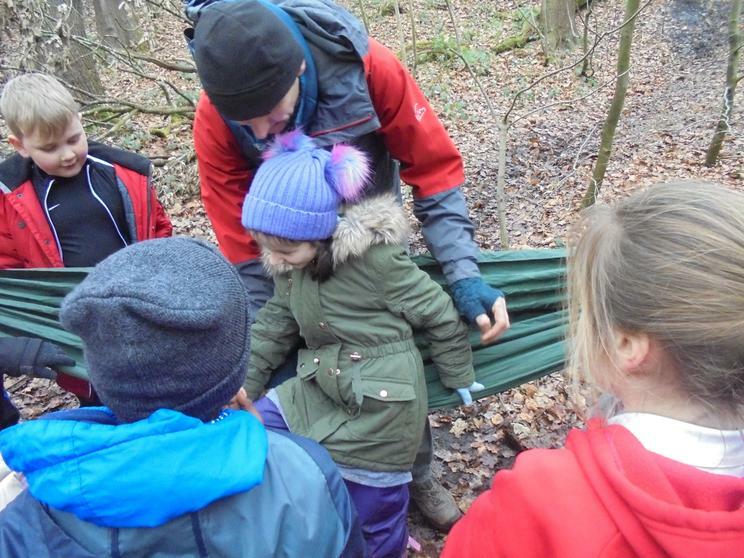 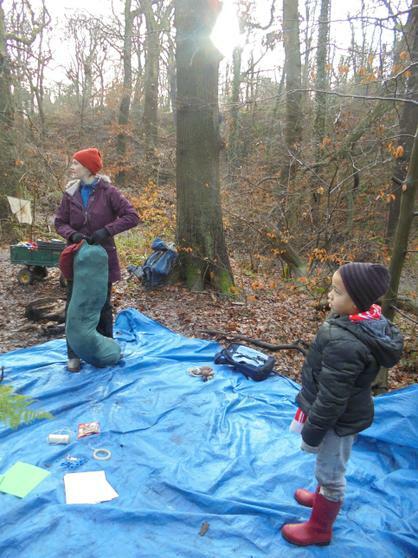 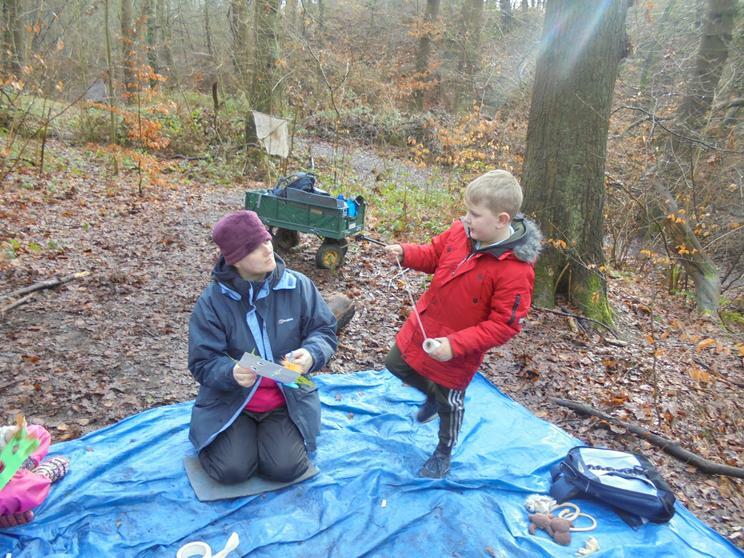 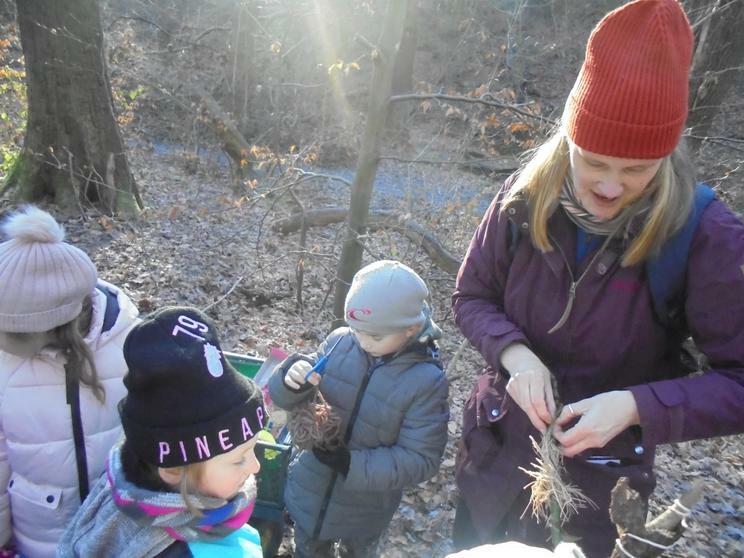 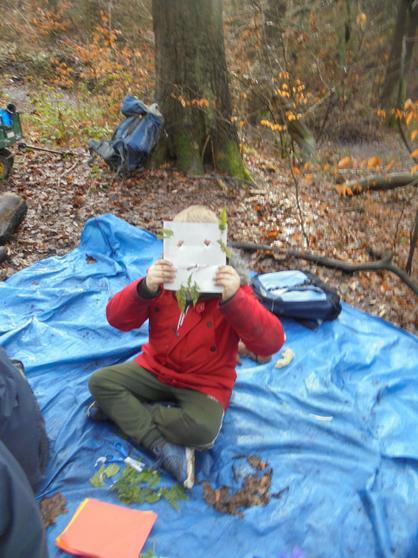 We got to our site and I showed the children how to put up a hammock and Mrs. Tofield made some Forest School medals. 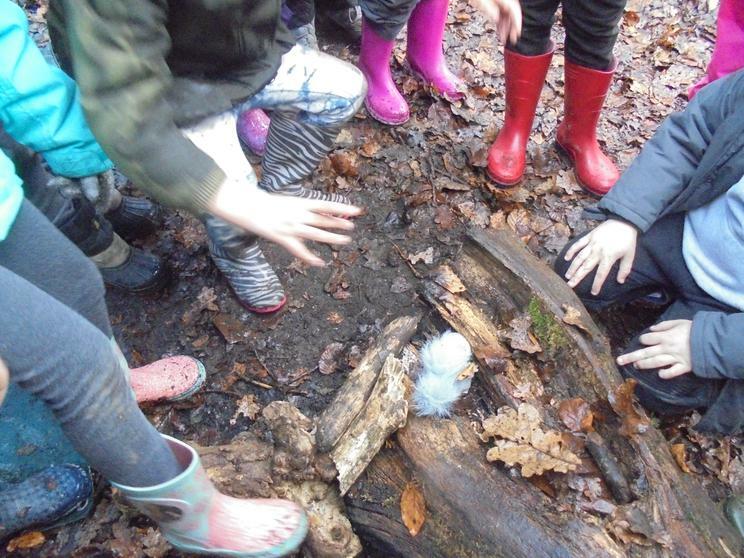 Some children wanted to make a fire again so I set up an area where we could do that. 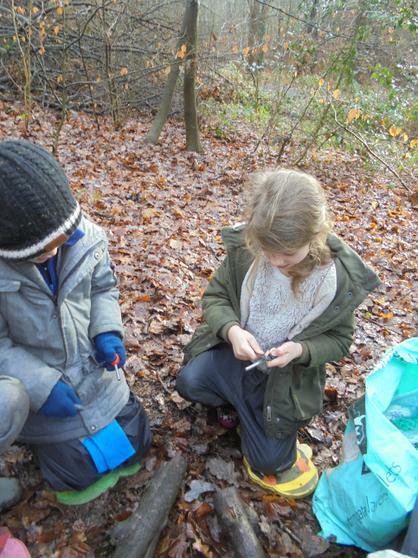 The fire starters are very difficult to use but if you keep on practicing they do get easier. 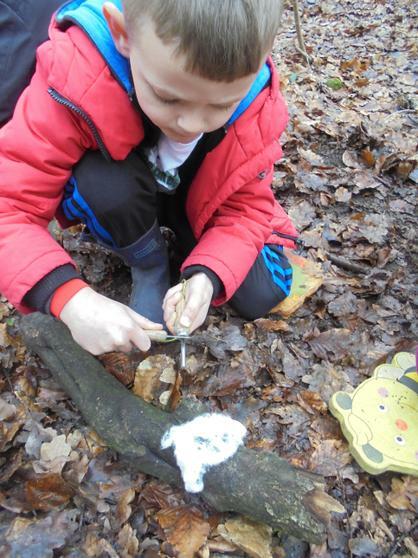 Layton is very close to setting a fire, he is making some super huge sparks. 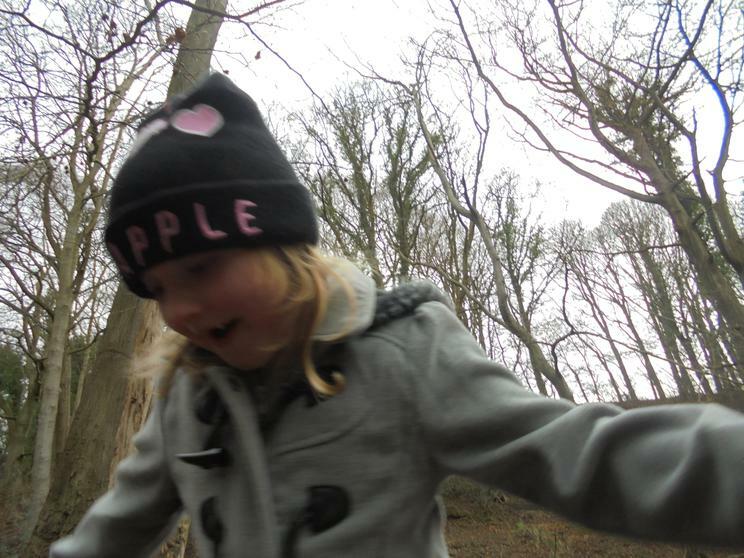 While I was packing up the children went to play and Layton D. took some photos of people. 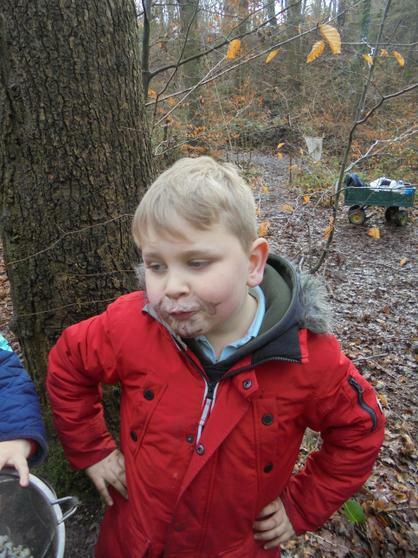 Can you tell which pictures are his? 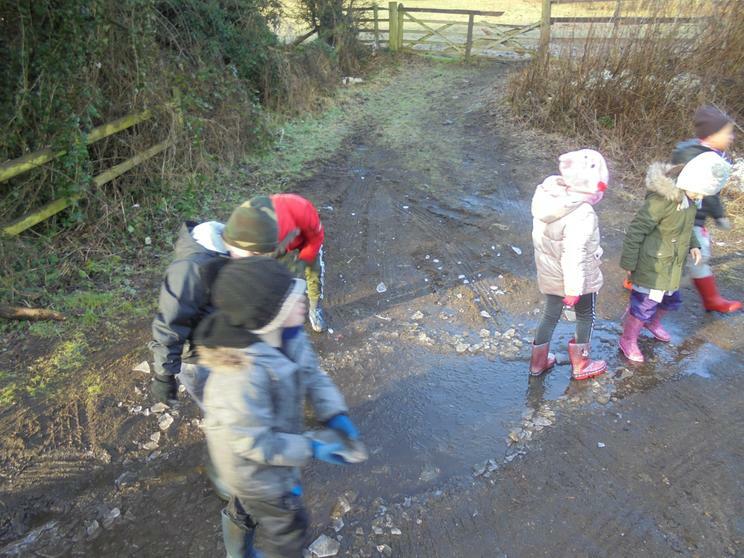 Although it was still icy the weather felt as though it was warmer. 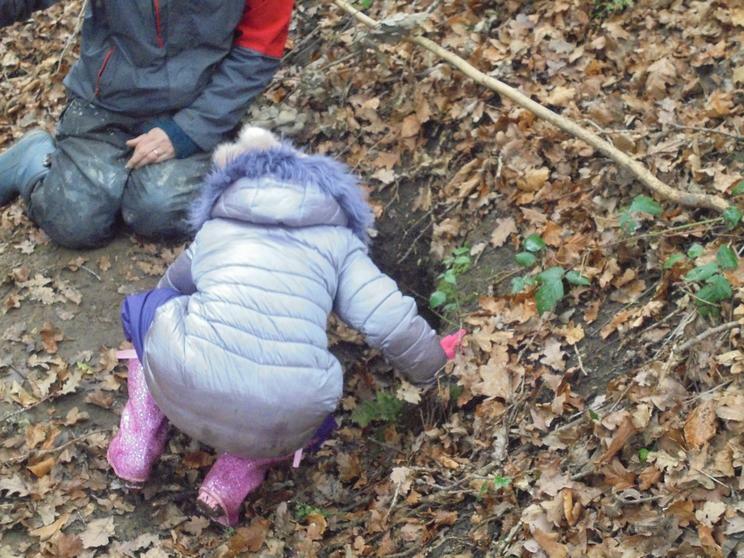 On our walk into the dene we spotted the beginnings of spring with the shoots of snowdrops poking through the soil. 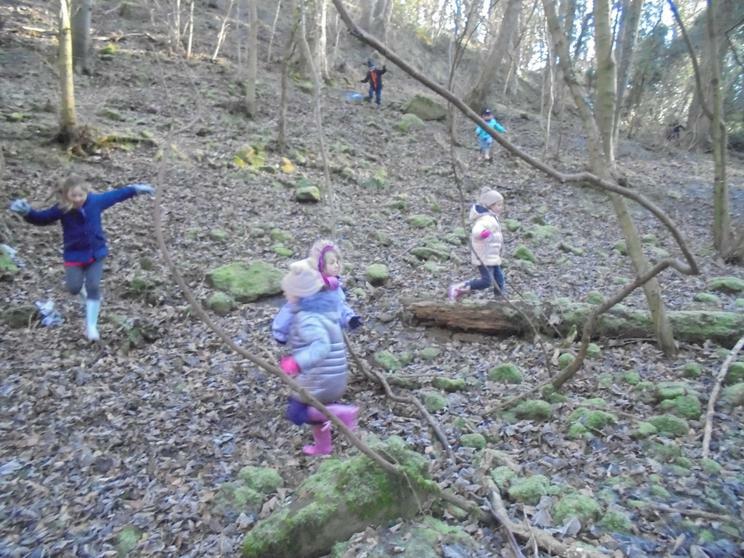 I love being outside and watching for the turn in the seasons. 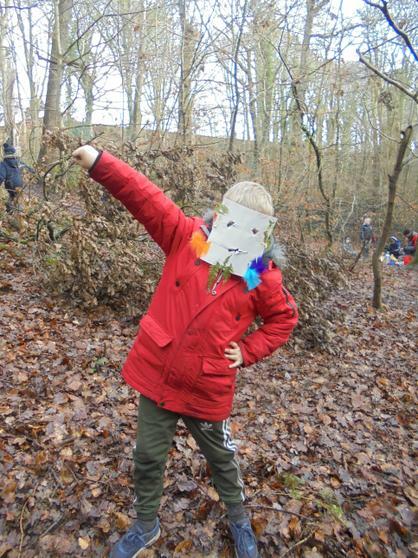 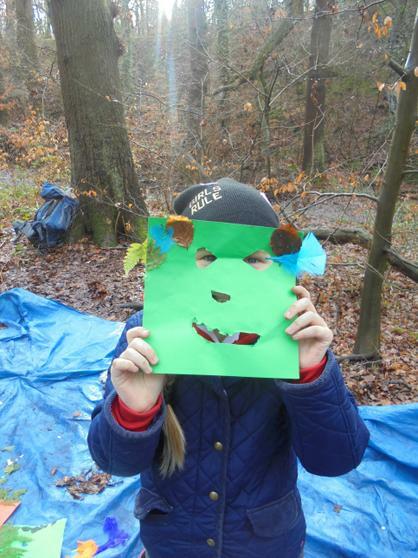 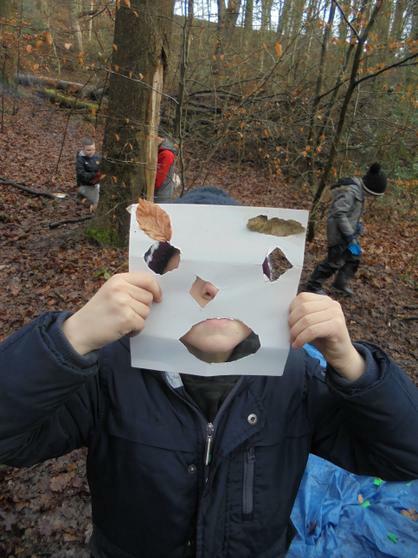 To celebrate the new growth and the children had the chance to make some forest masks, they look great, I hope they all get finished by next week. 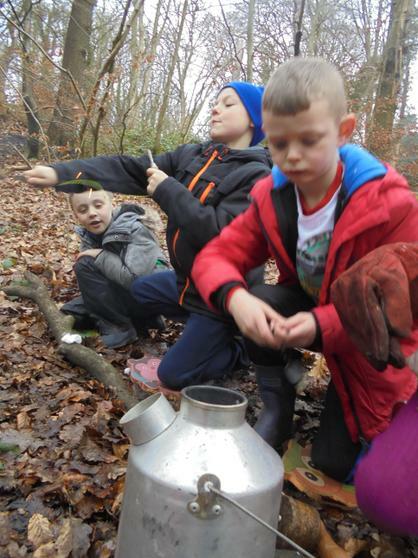 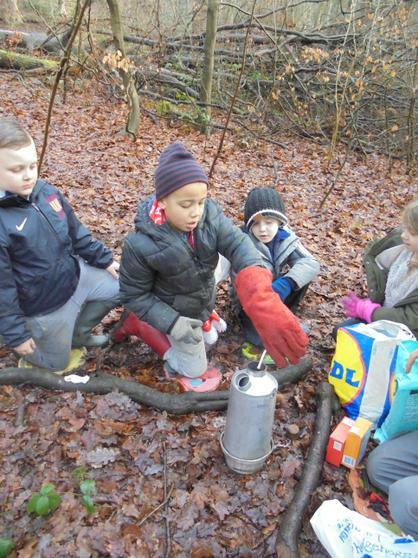 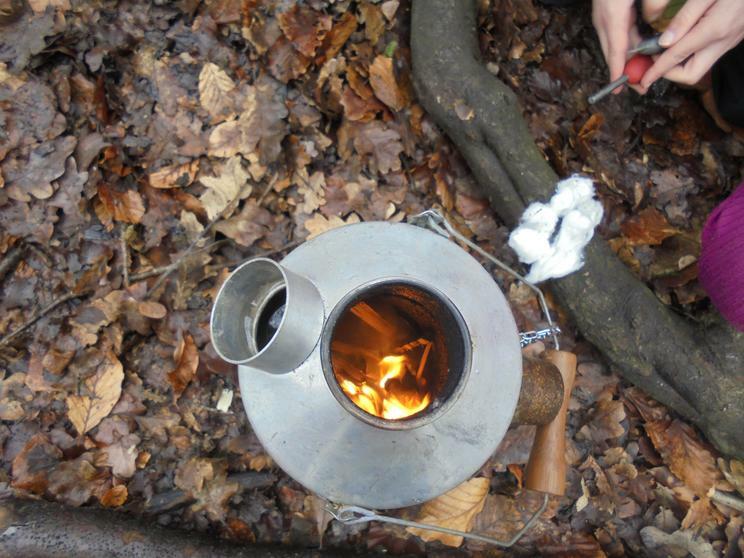 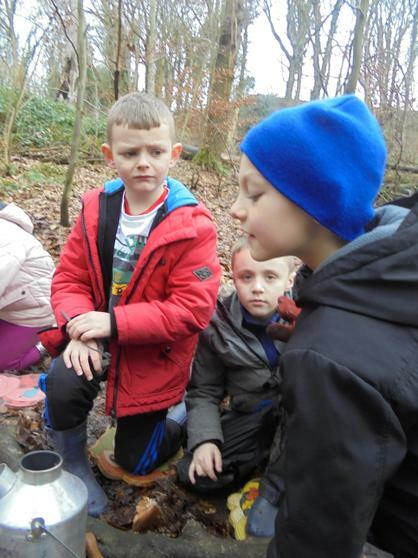 The children asked if they could have a fire this week so we took a kelly kettle into the dene. 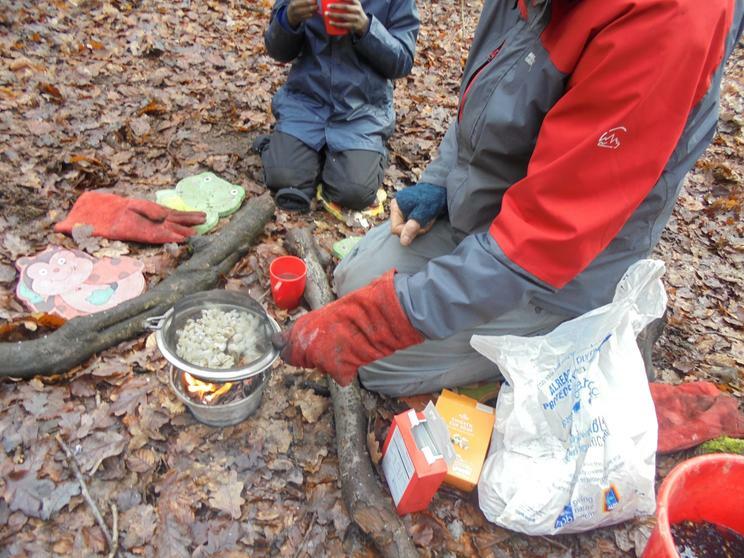 We made a small fire, boiled some water to make soup and cooked some pop corn. 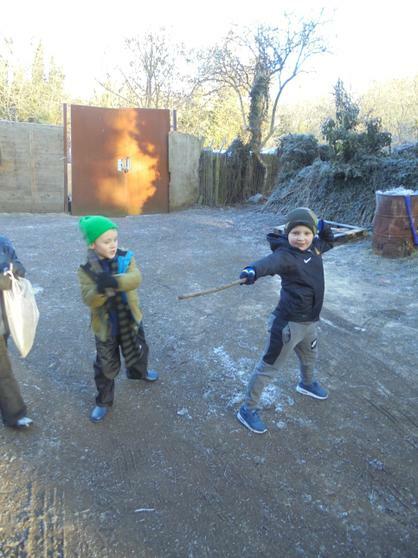 I managed to set fire to the first lot, but the second lot was perfect. 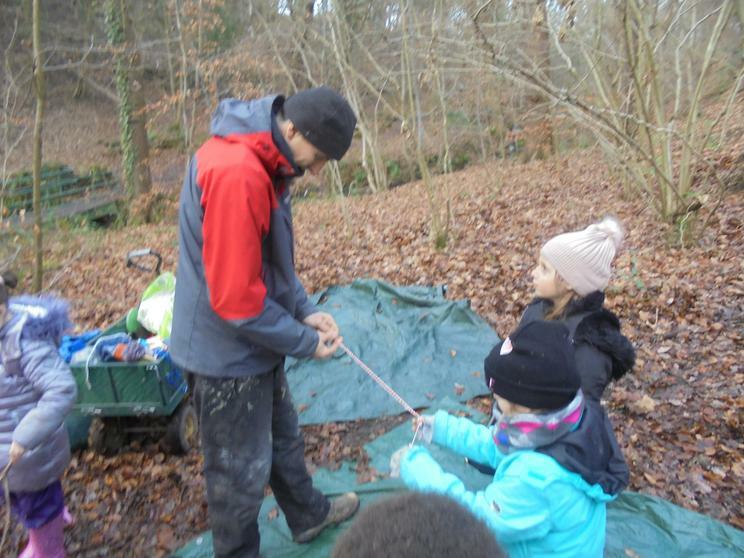 The children had a go at using the fire steels and feeding the fire. 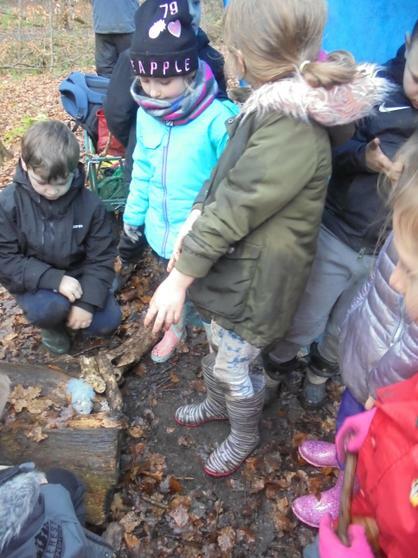 Fire steels are very hard to use! 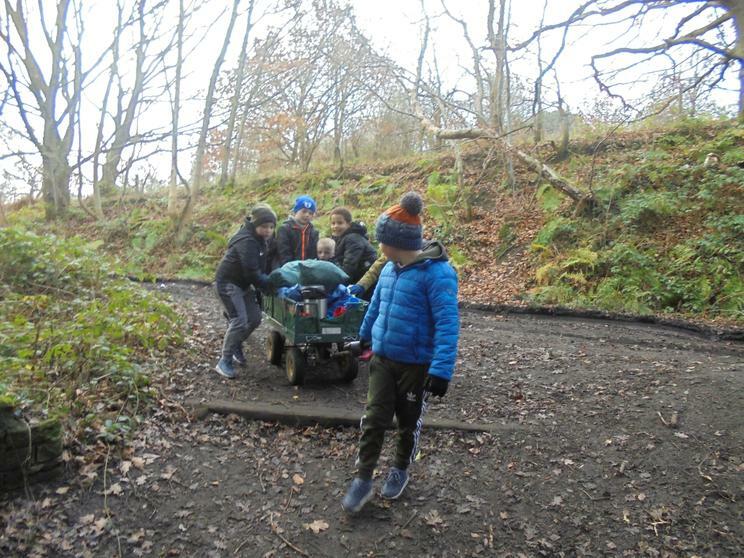 The trolley got a puncture on the way back to school. 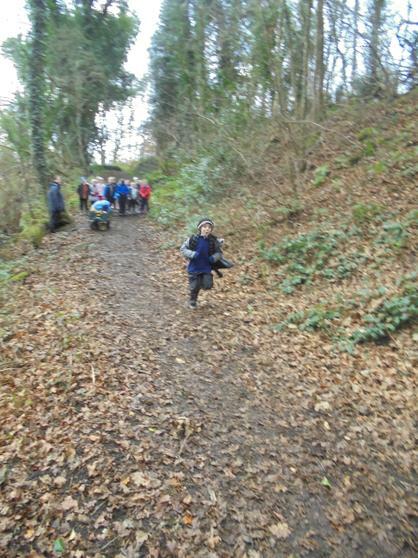 It was very hard to push back along the track. 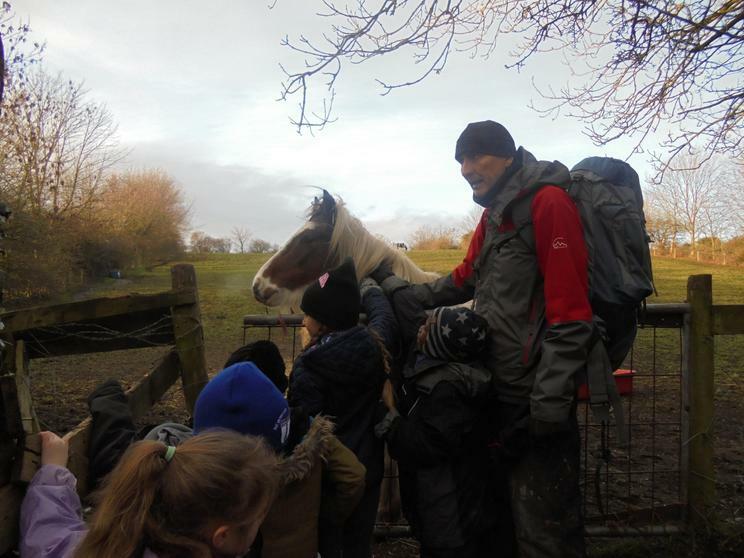 I hope the replacement is here before next week. 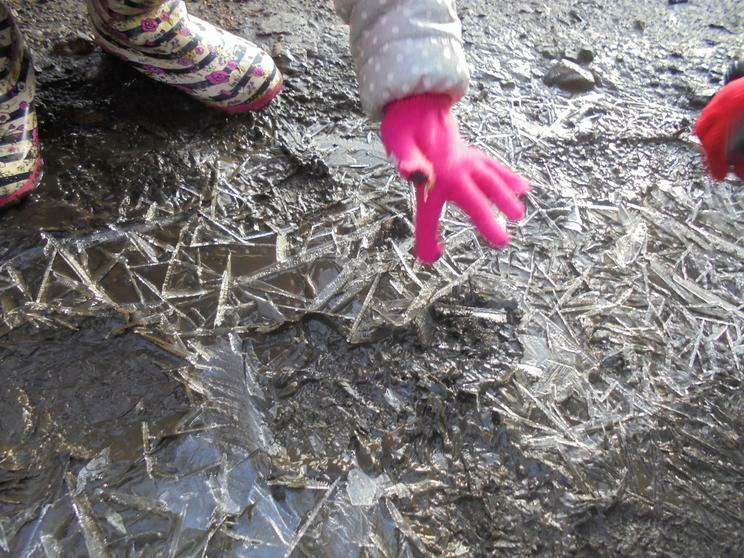 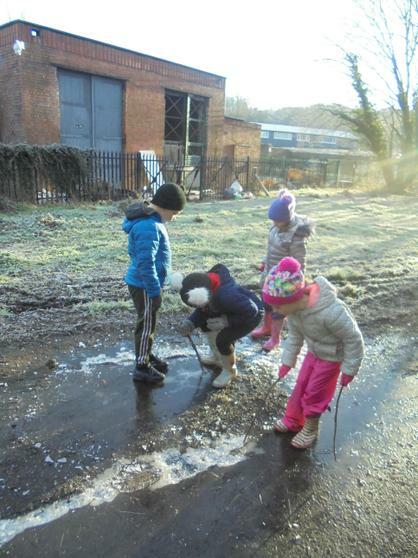 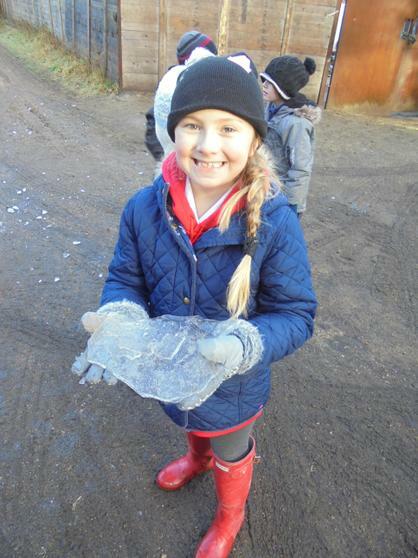 Another very chilly start to the day, there was lots of ice for us to play with. 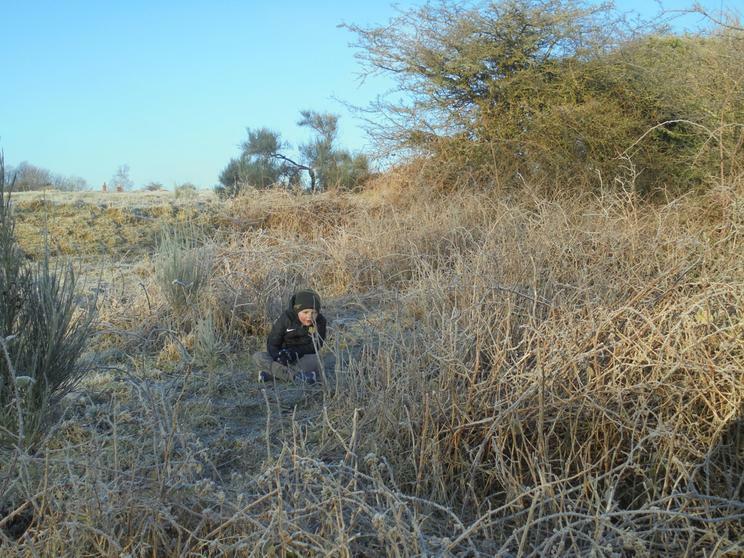 Sadly we found a victim of the cold, a small Wagtail frozen solid. 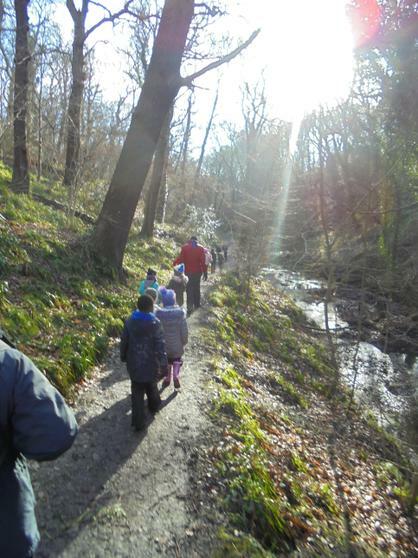 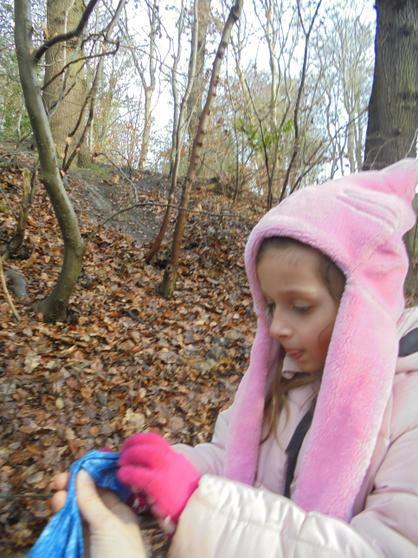 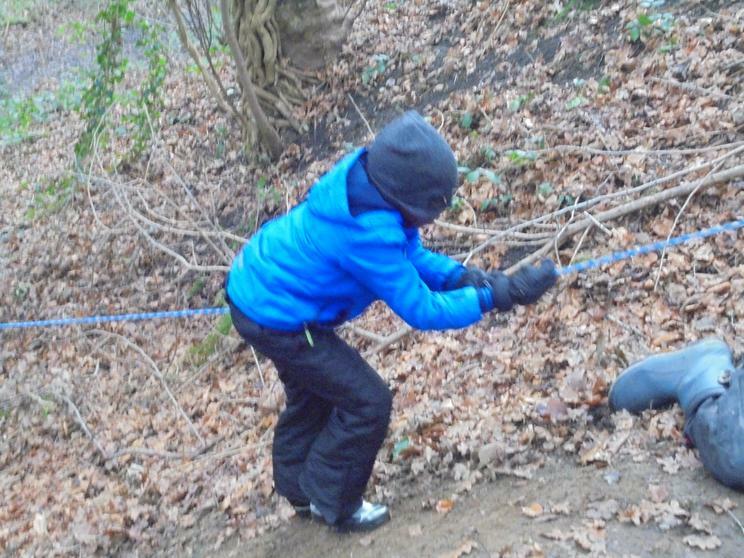 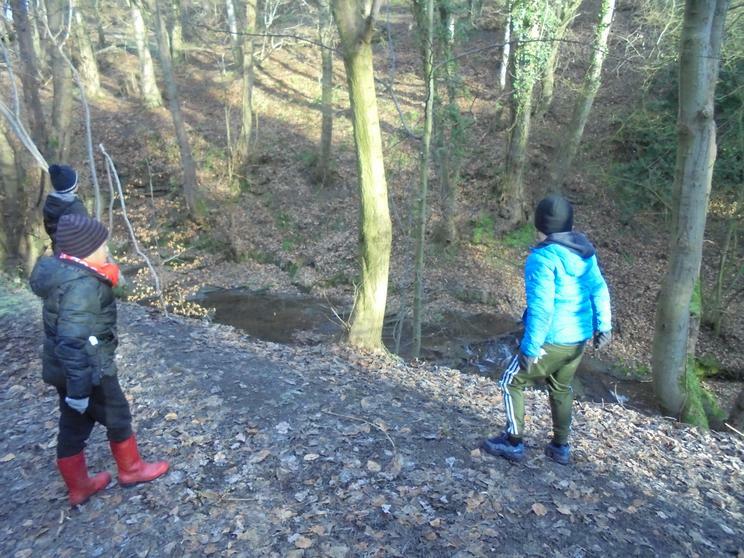 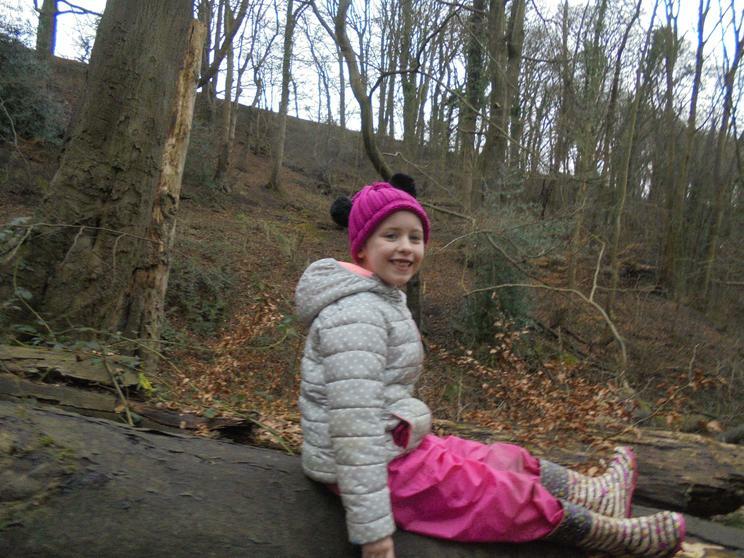 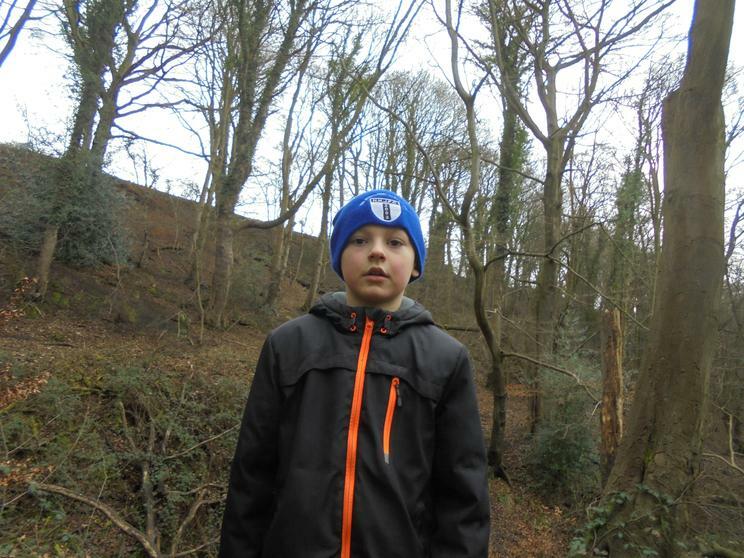 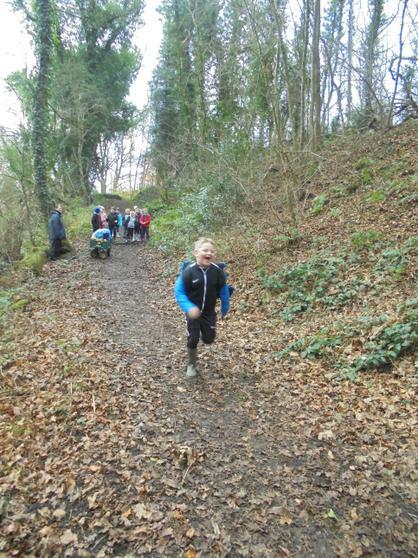 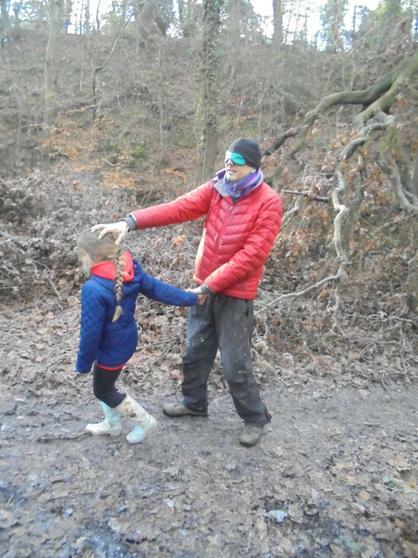 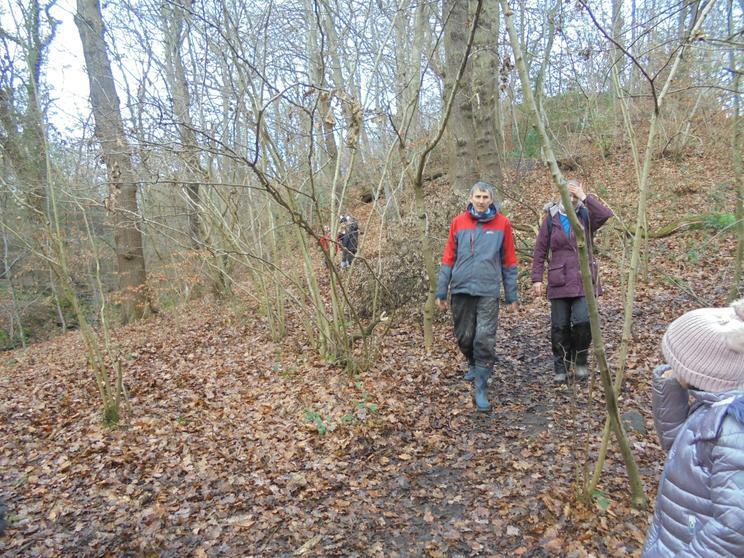 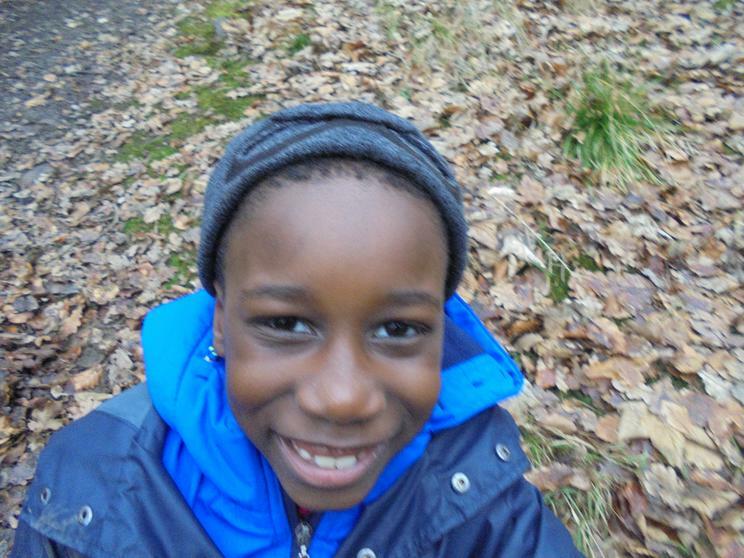 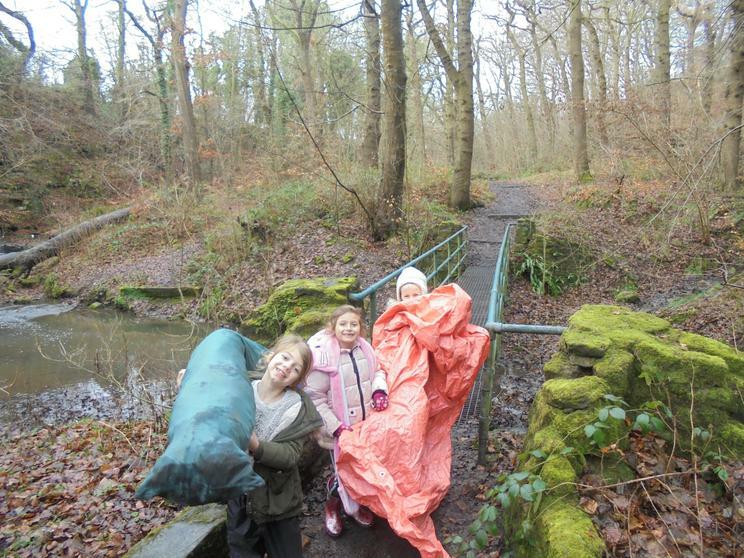 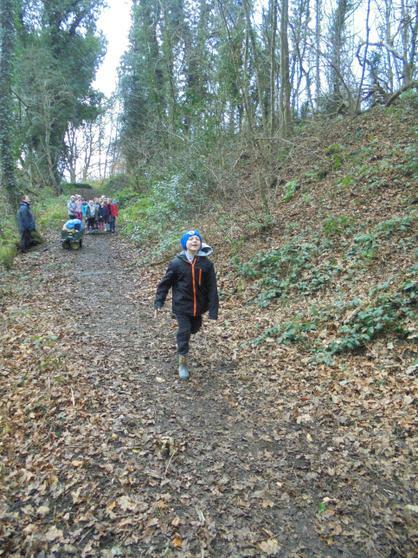 This week we walked straight down to the dene as I thought it best to keep moving in order to keep the cold out. 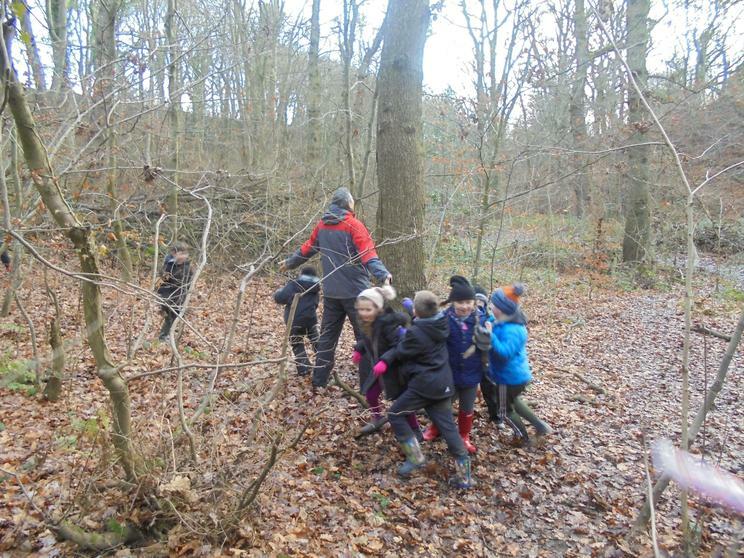 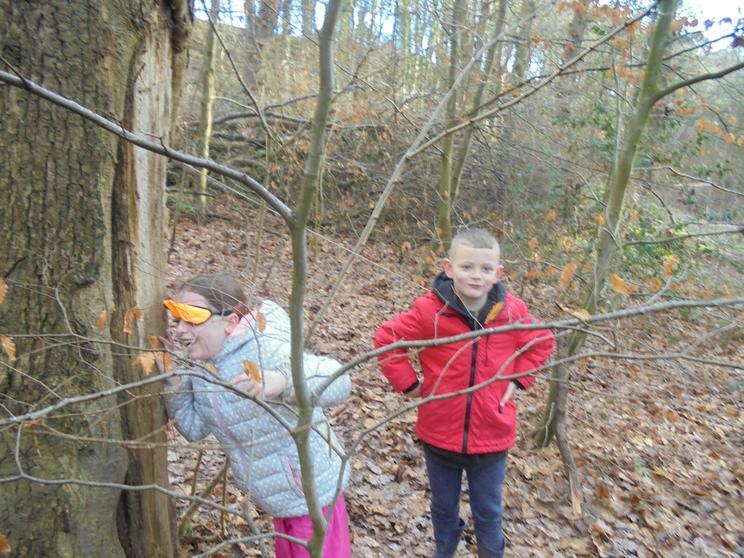 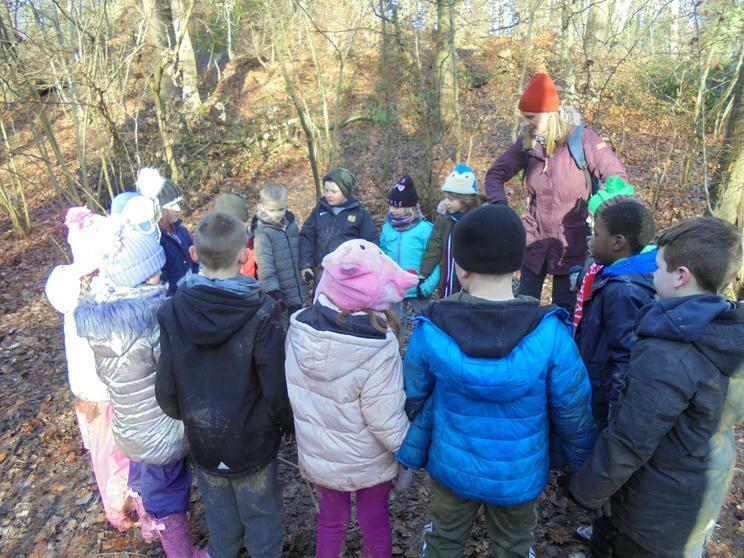 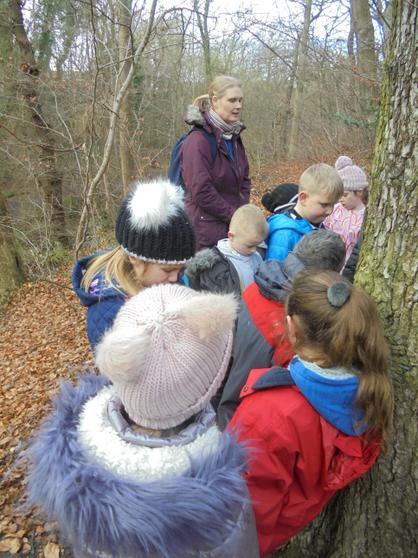 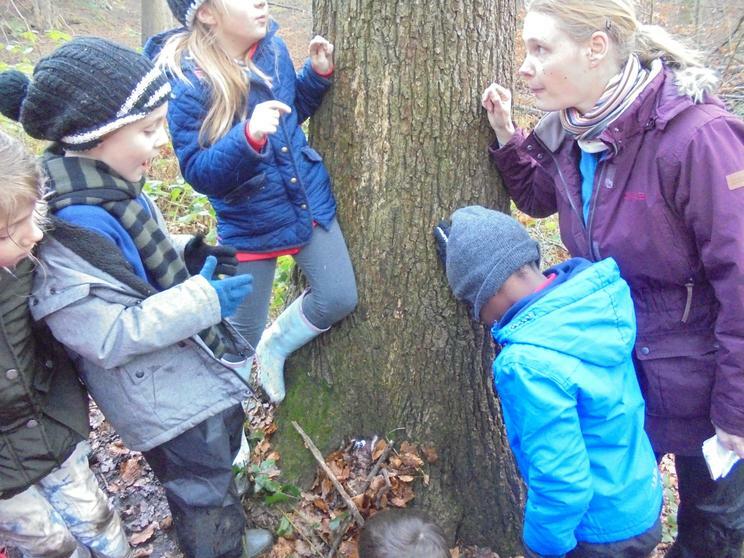 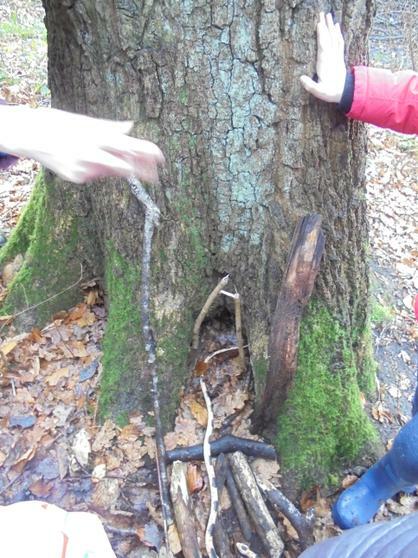 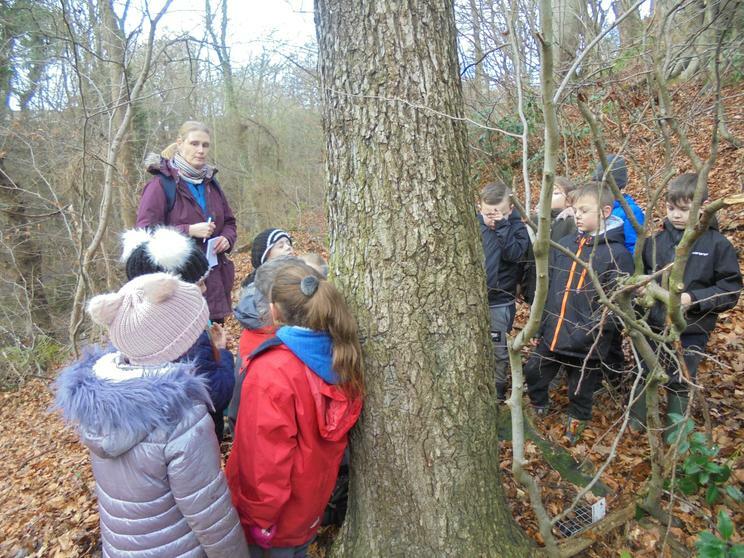 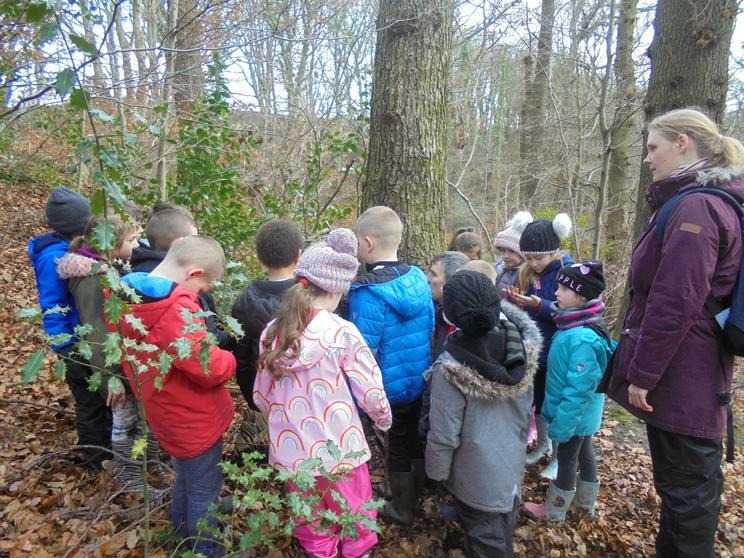 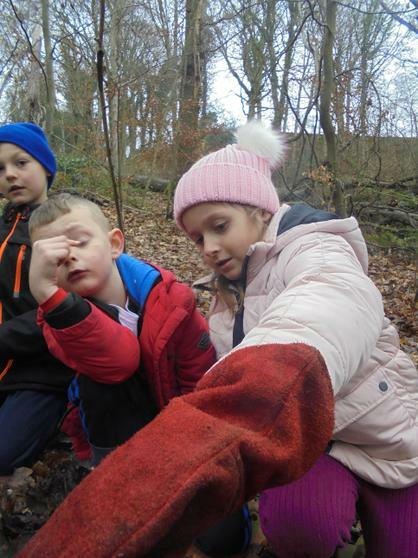 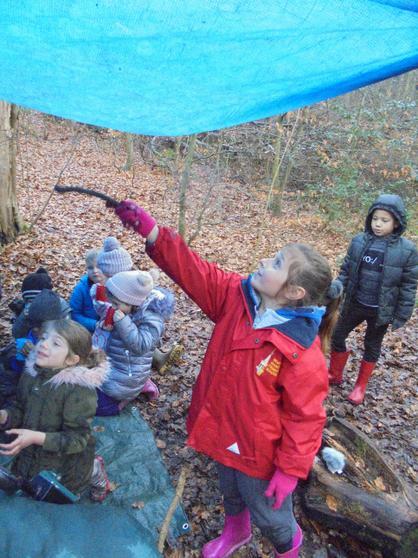 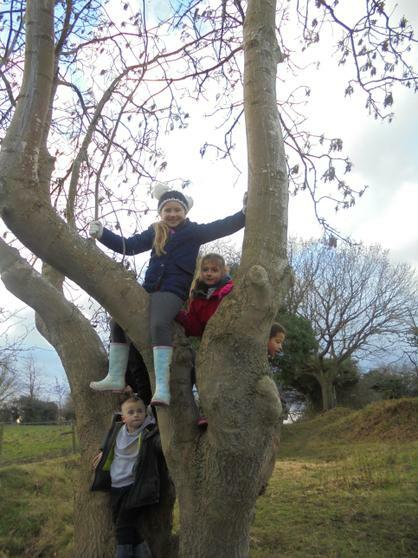 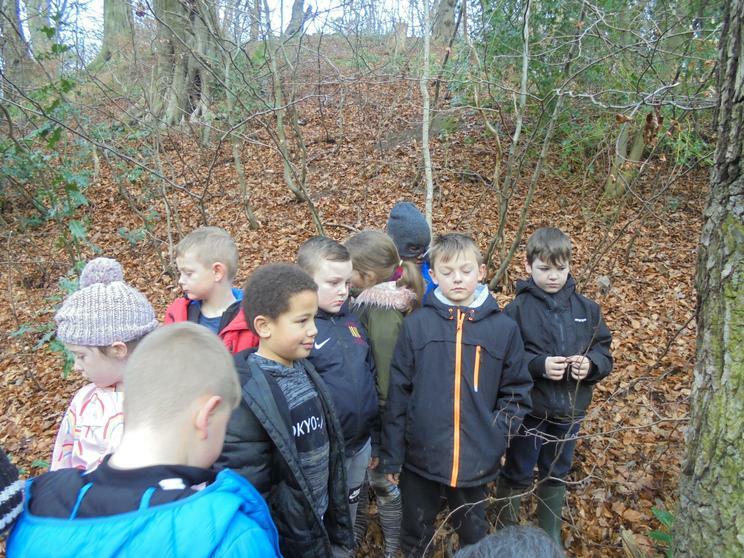 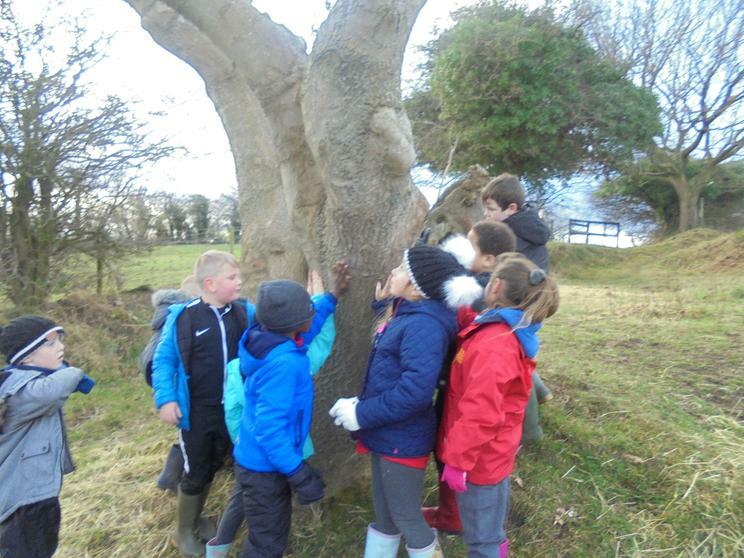 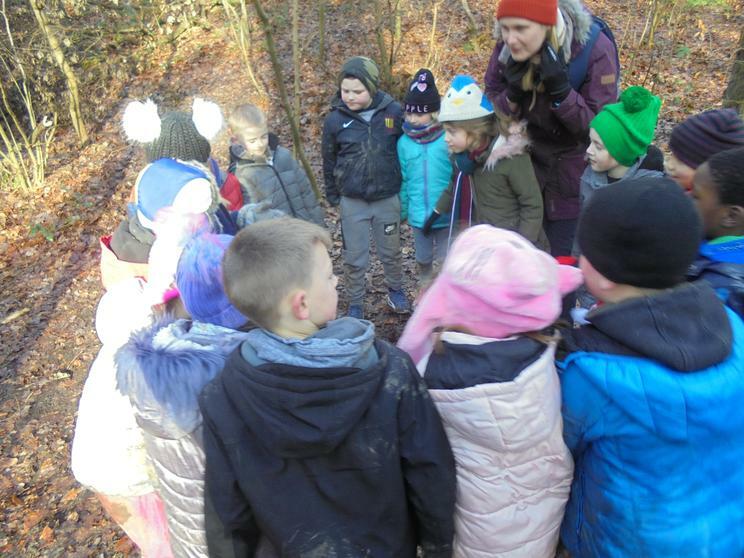 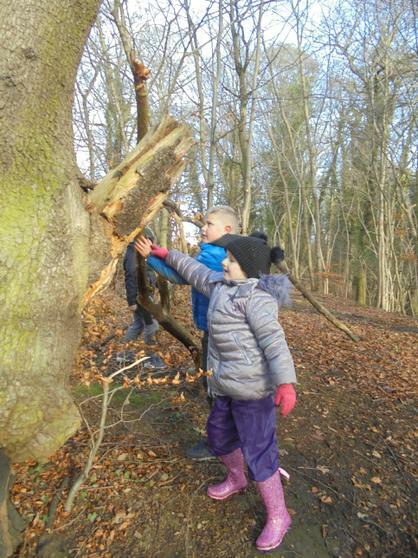 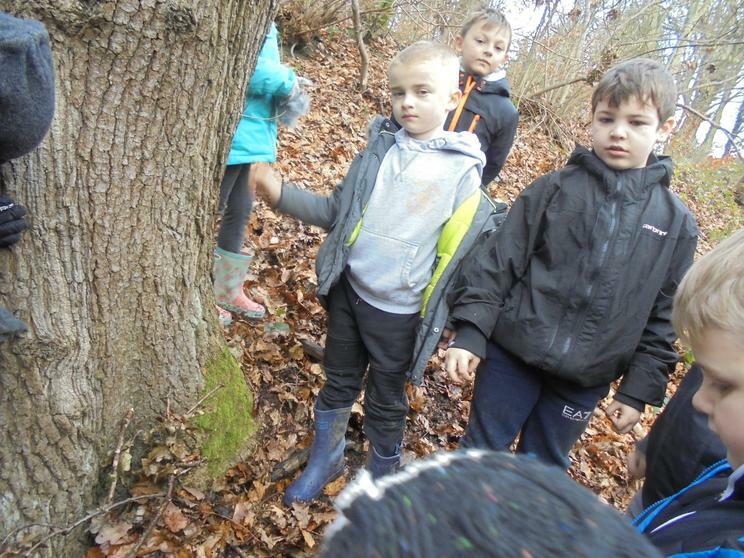 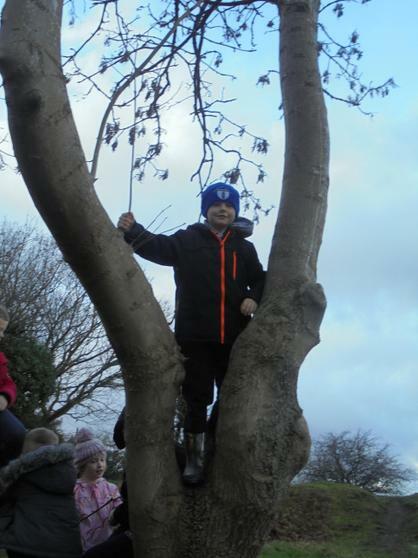 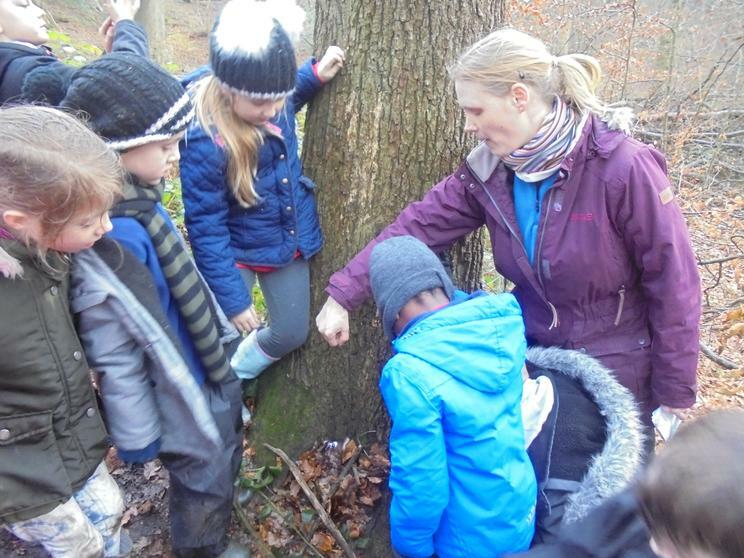 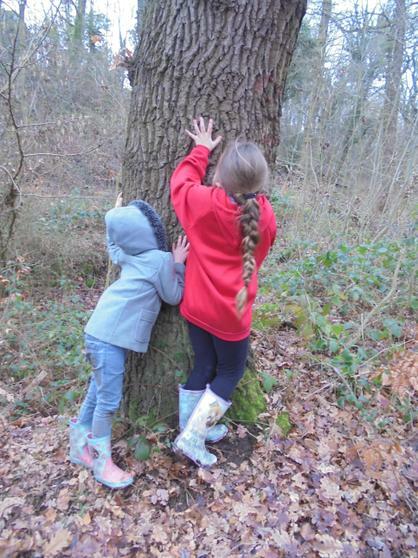 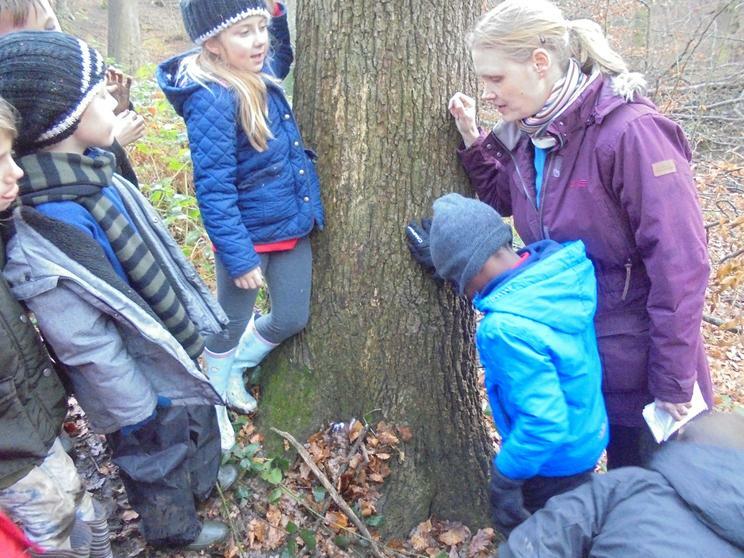 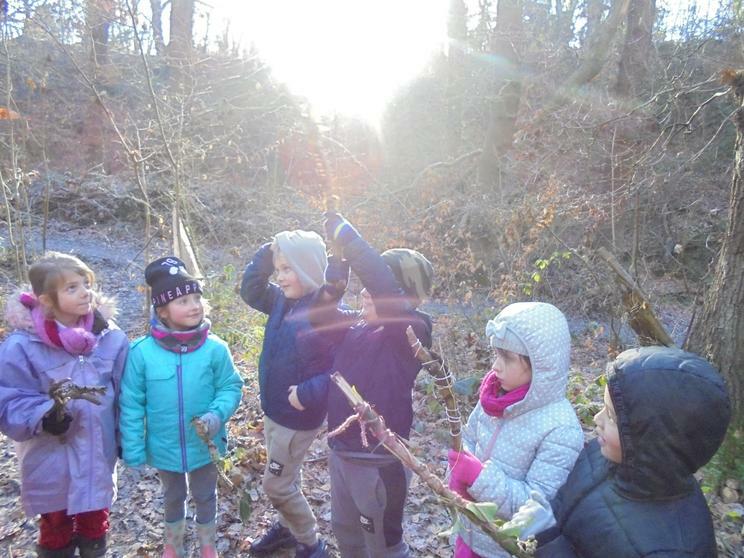 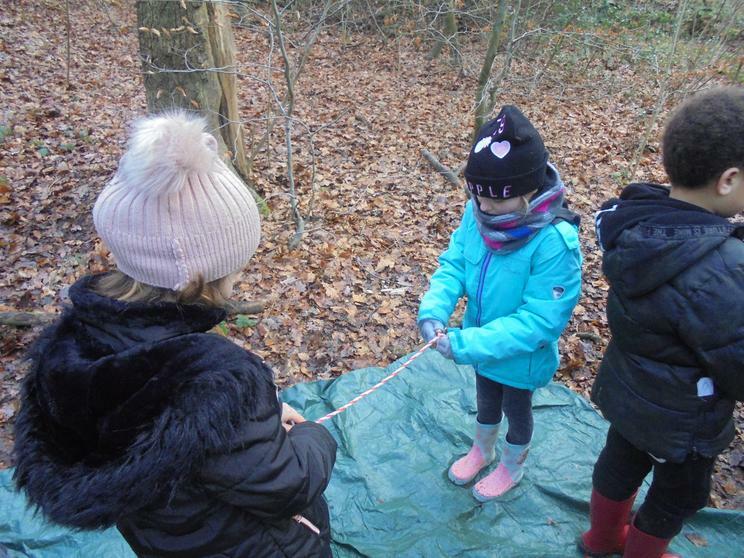 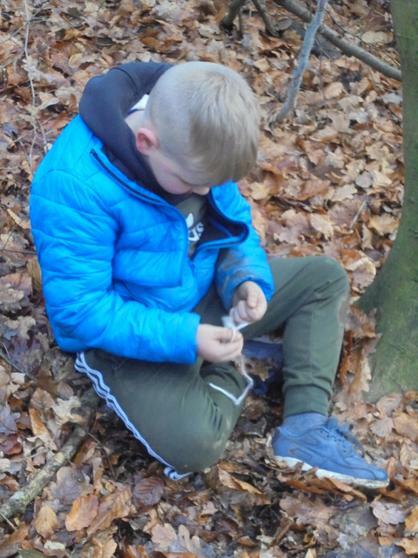 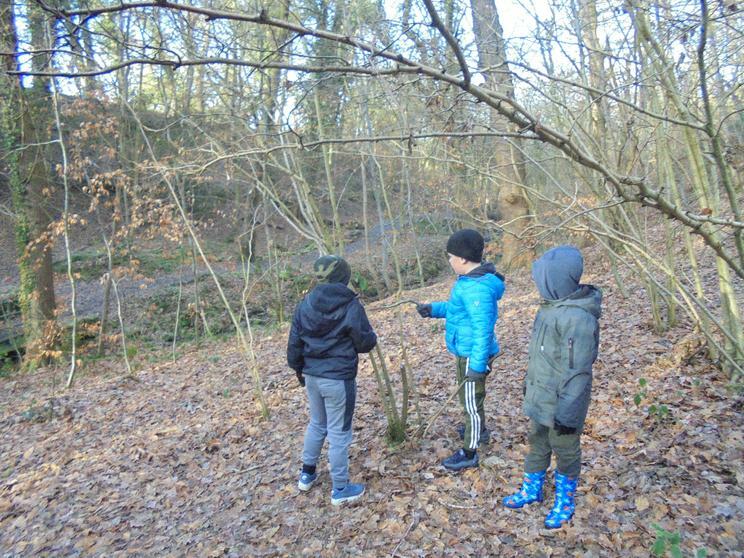 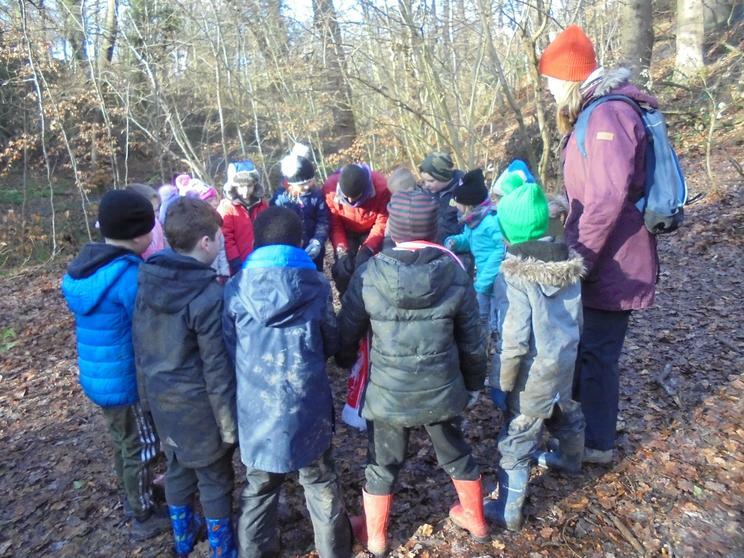 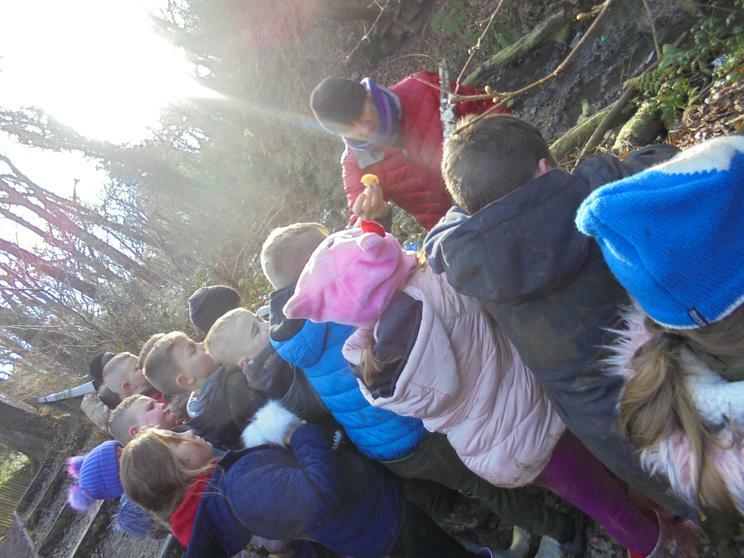 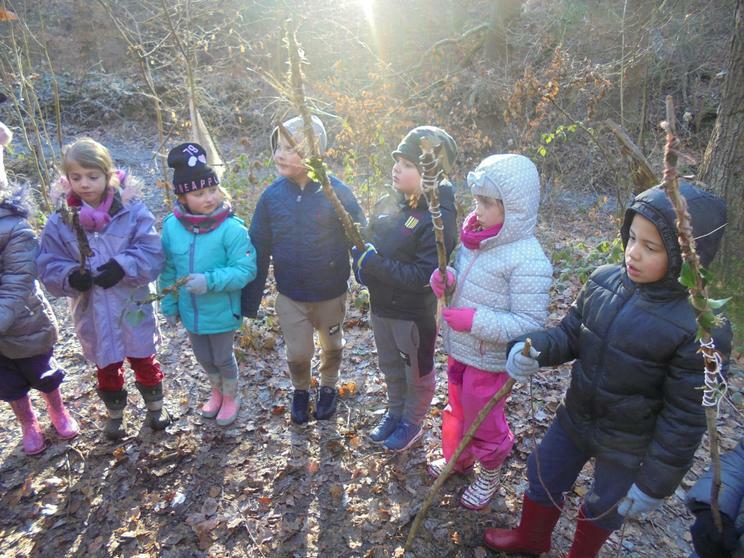 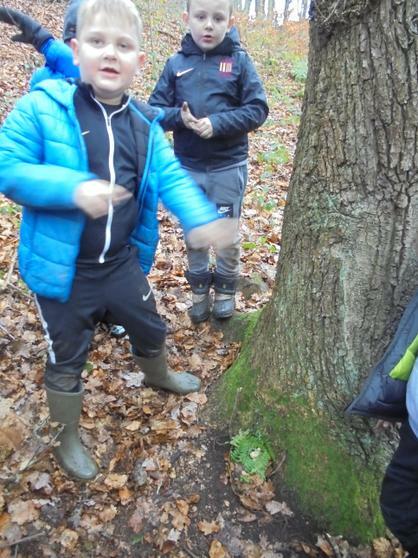 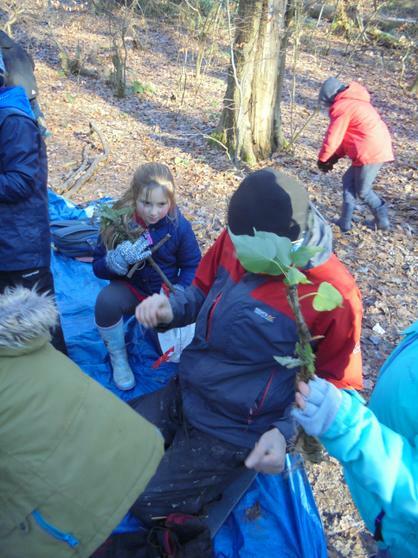 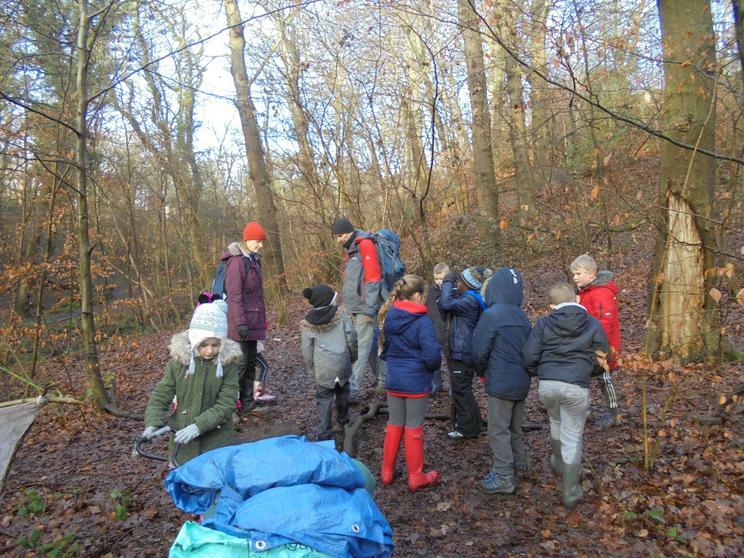 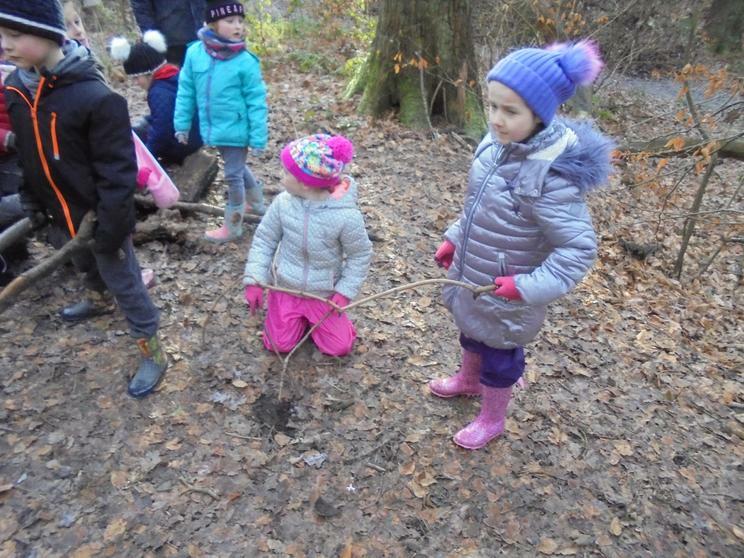 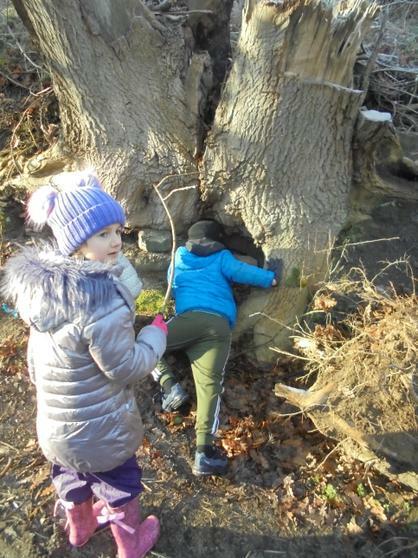 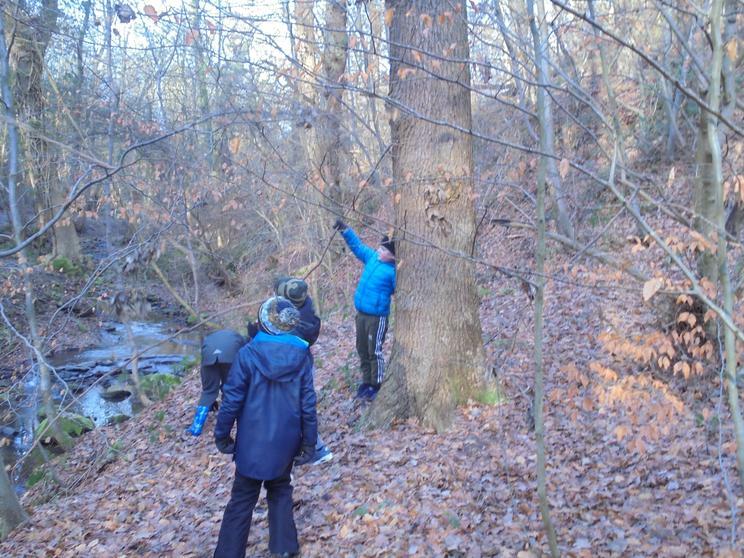 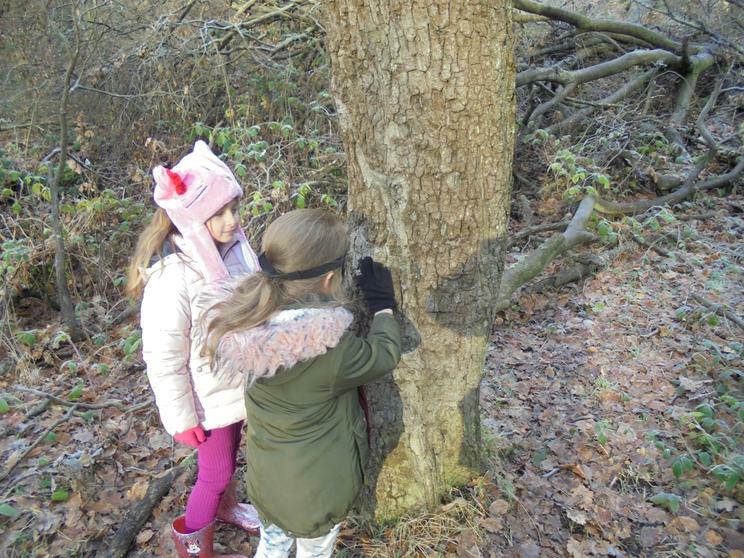 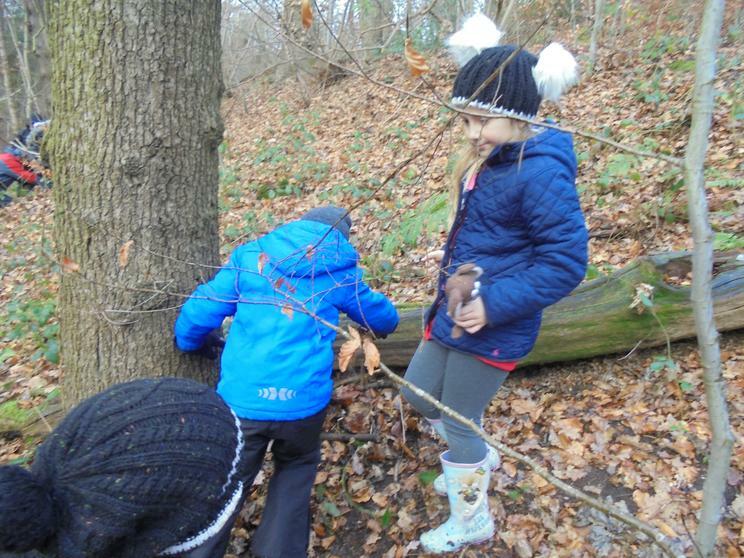 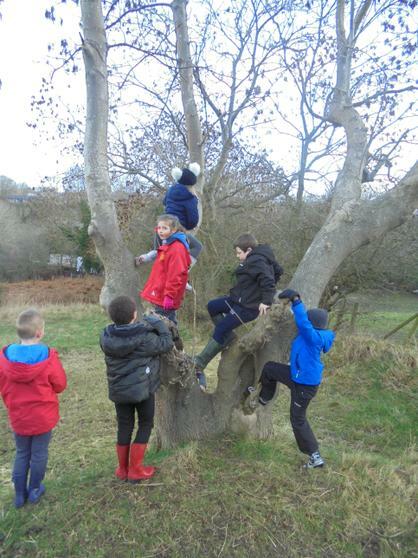 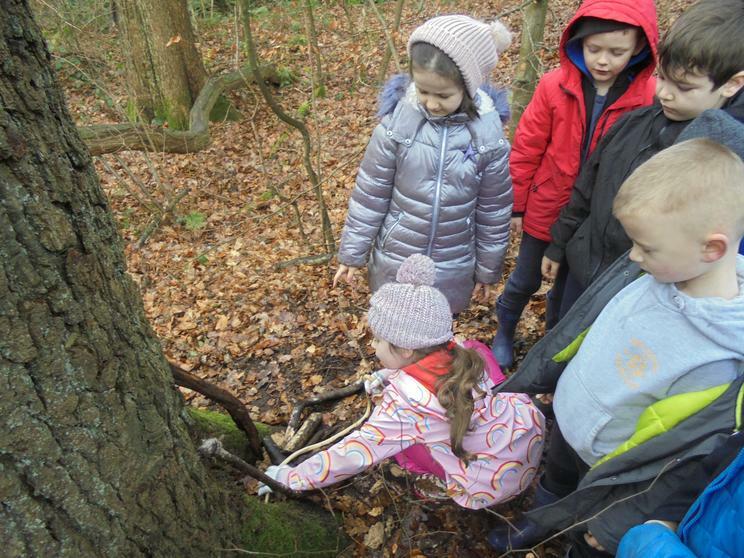 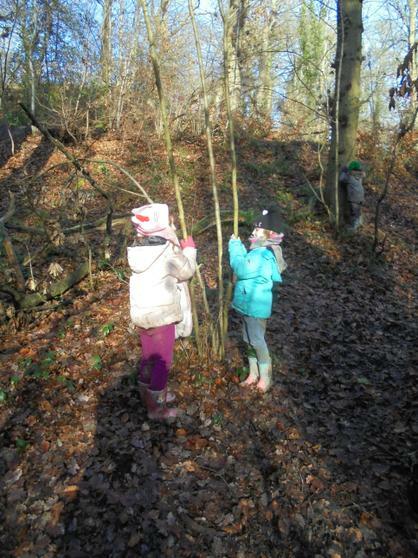 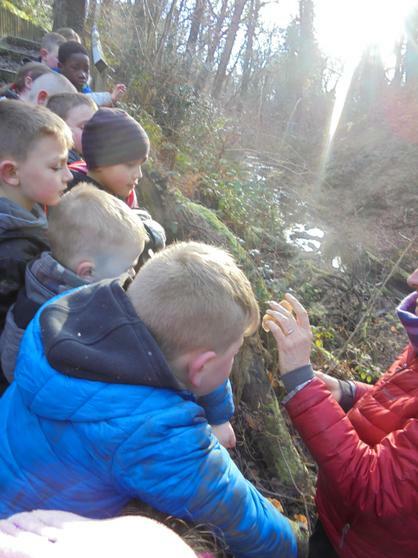 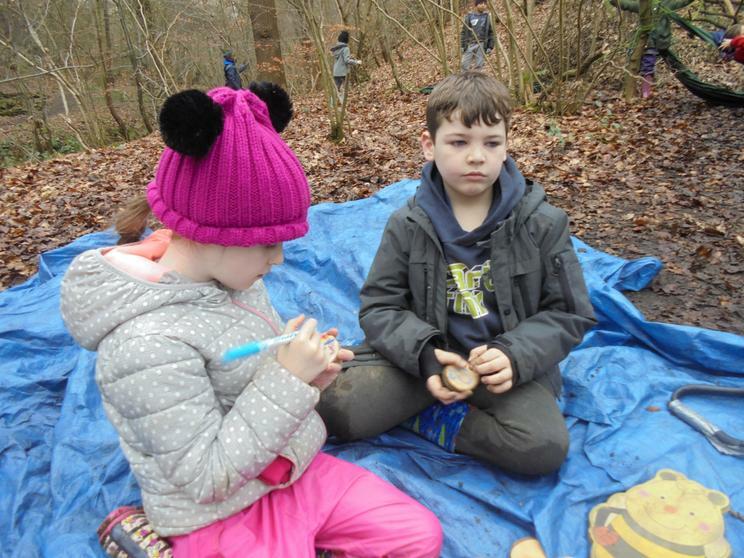 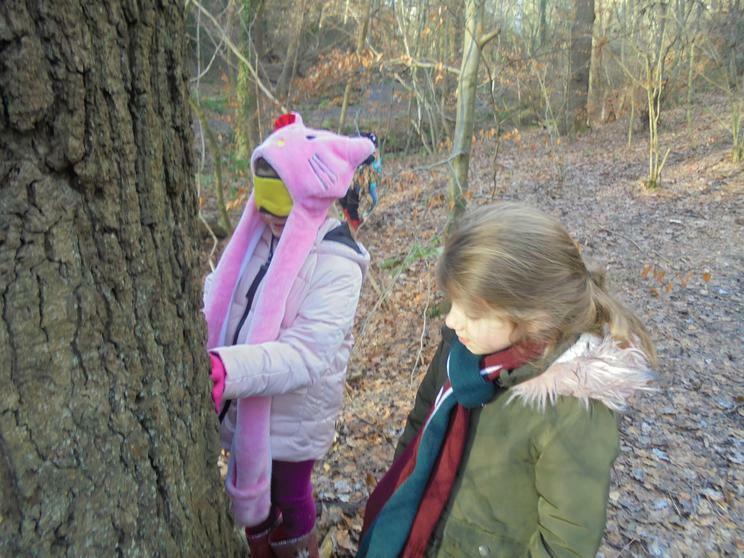 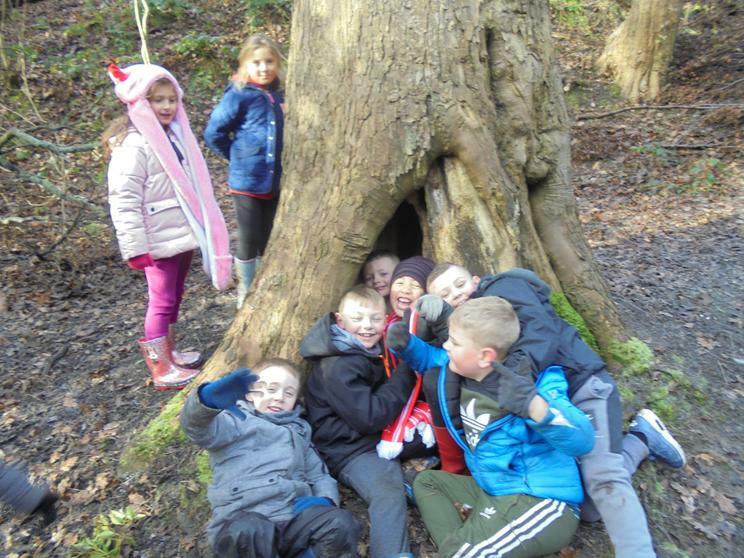 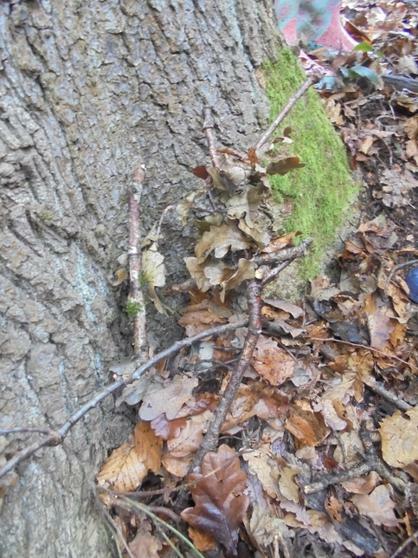 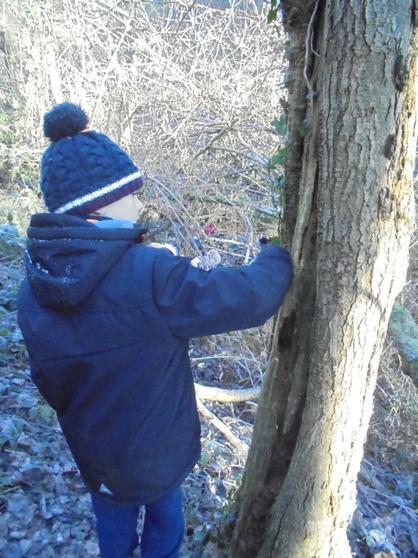 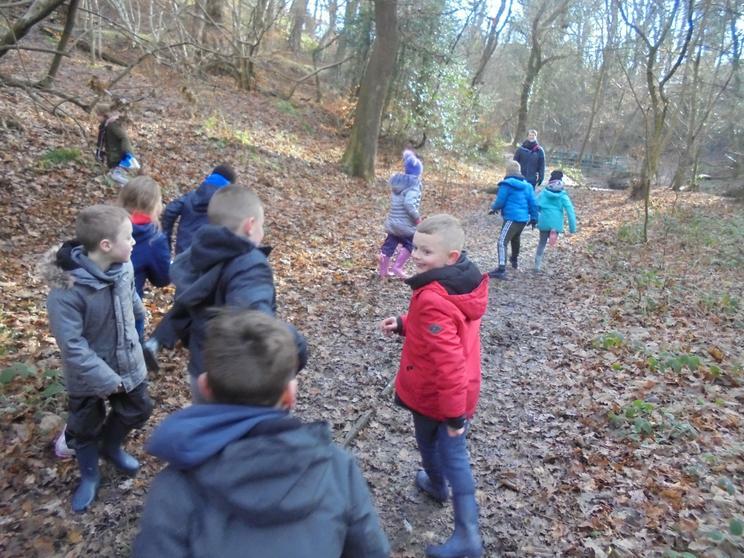 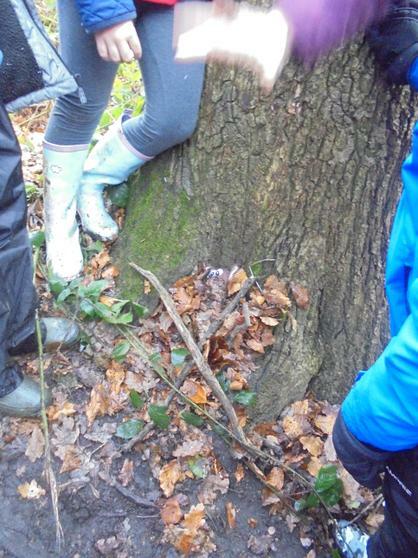 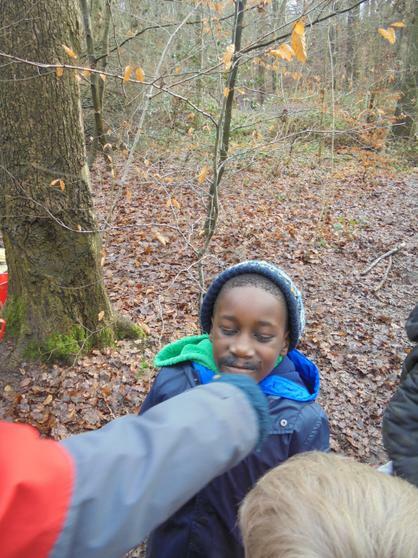 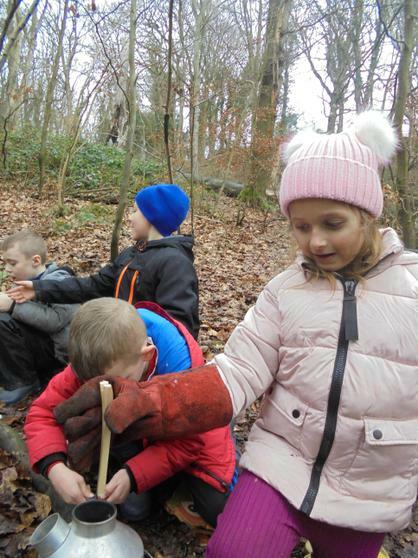 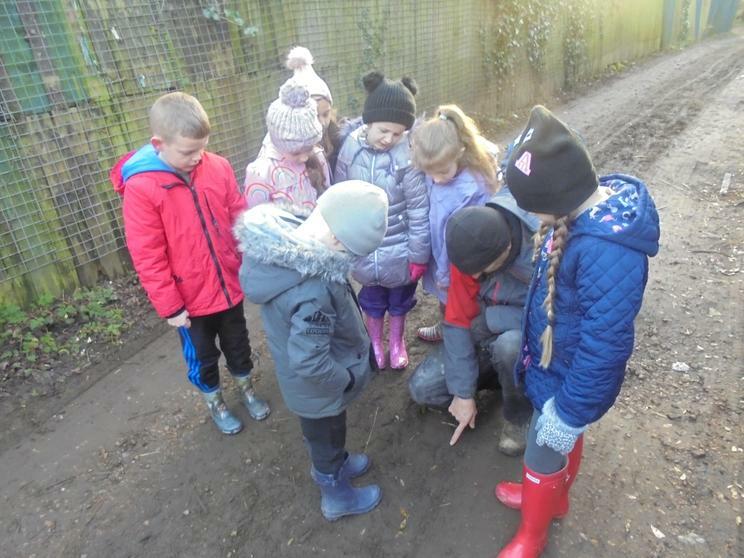 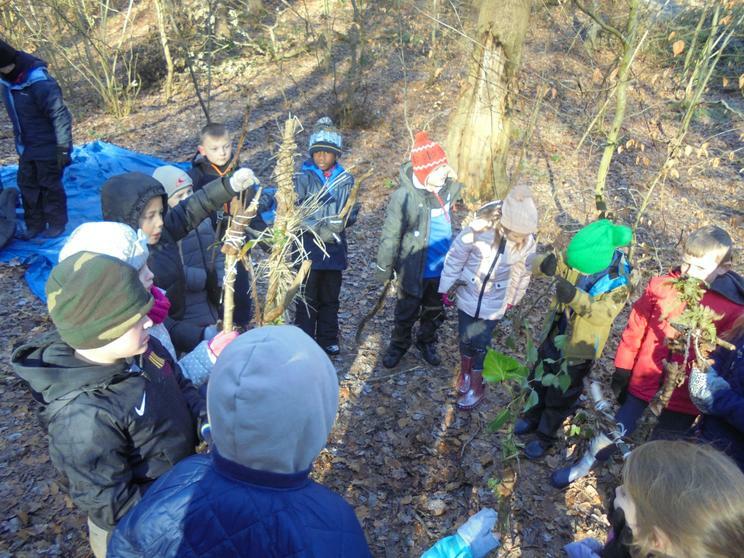 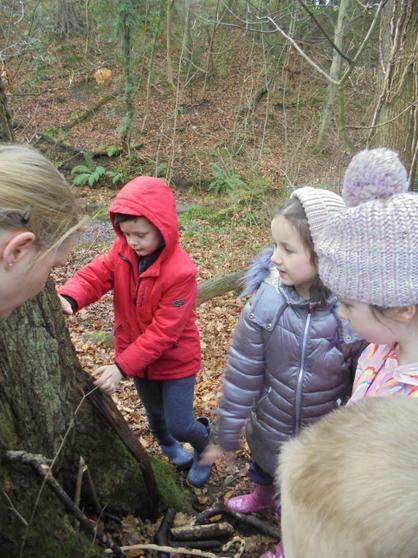 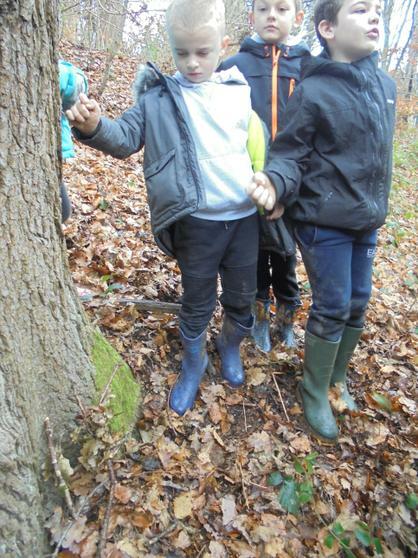 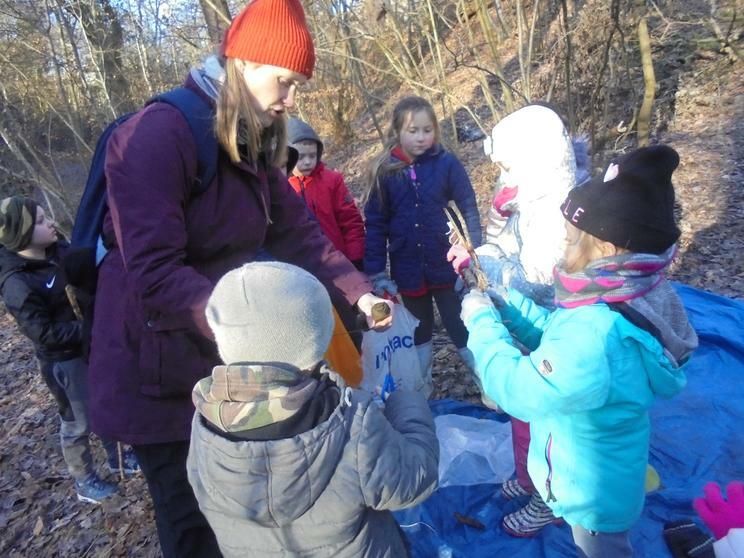 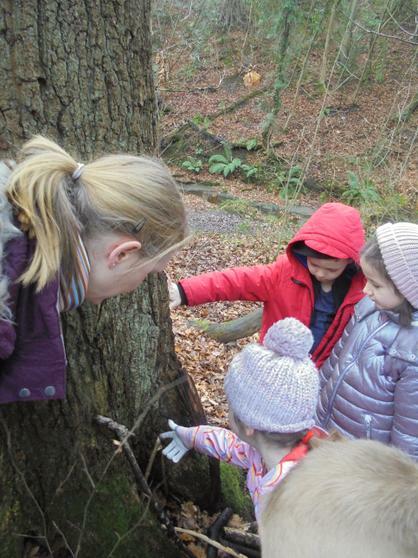 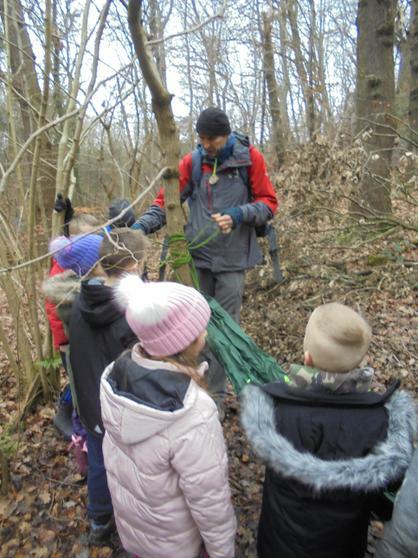 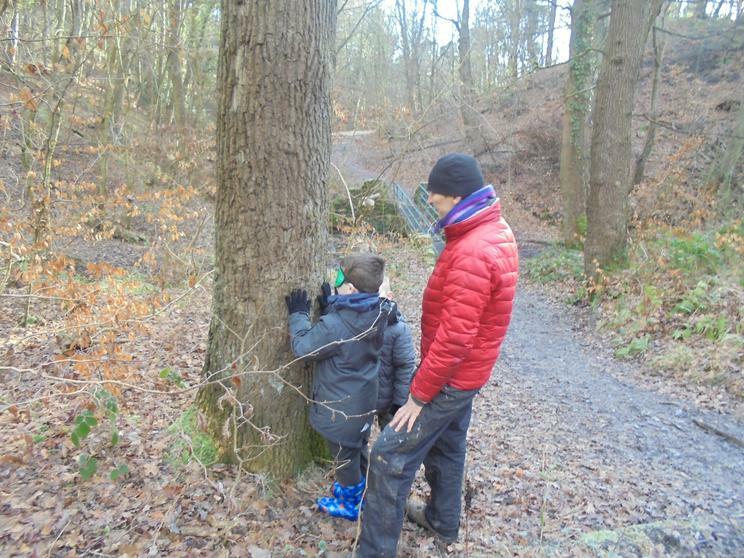 We spent some time finding different trees, the children could see how crinkled the bark of the oaks are, compared to how smooth the bark of the beech trees are. 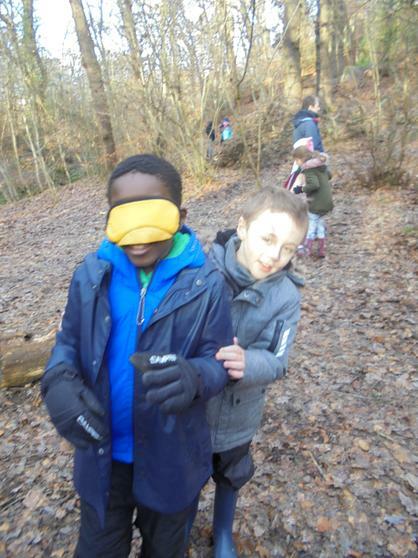 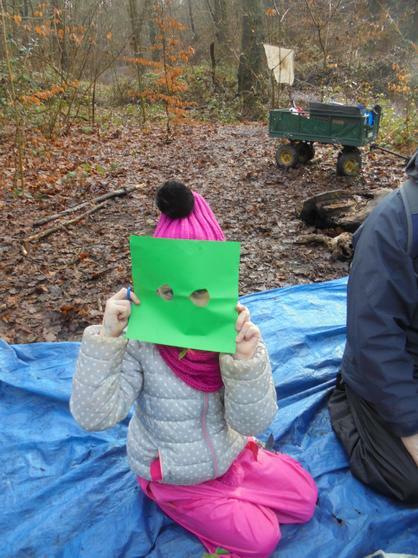 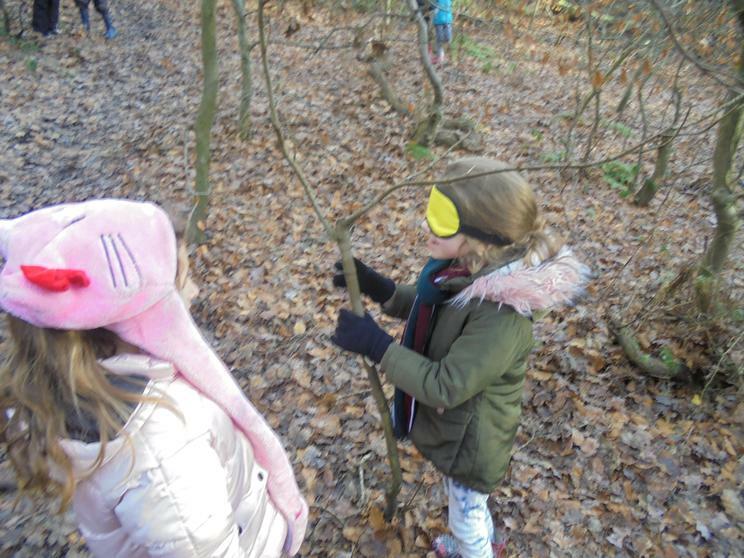 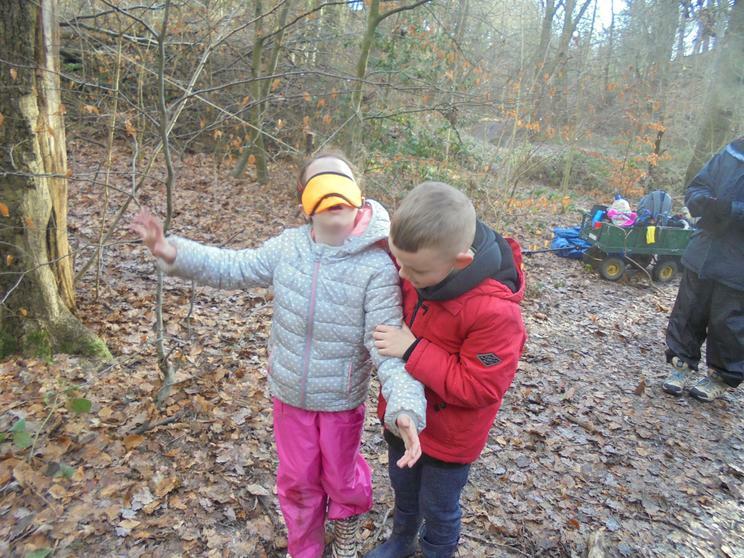 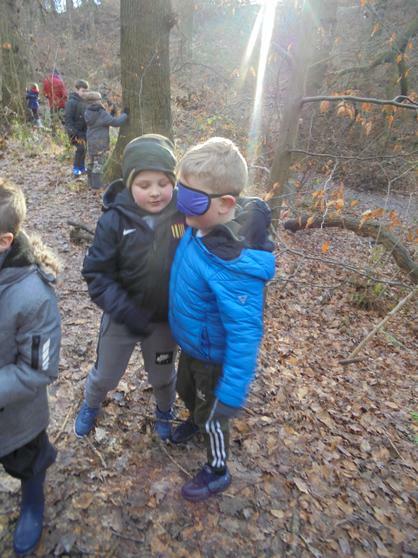 We then used blindfolds to see just how good we could get at telling different trees apart. 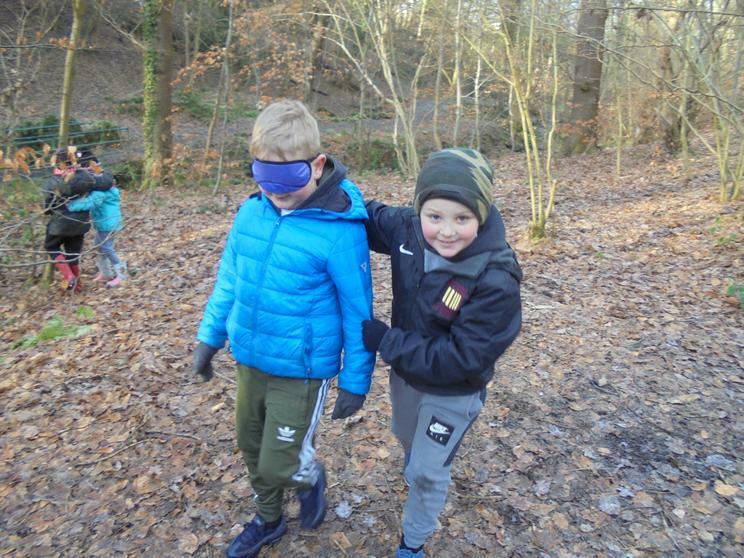 It took a lot of trust to be blindfolded in the woods. 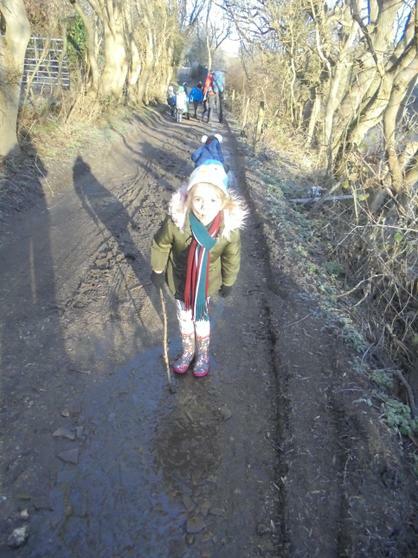 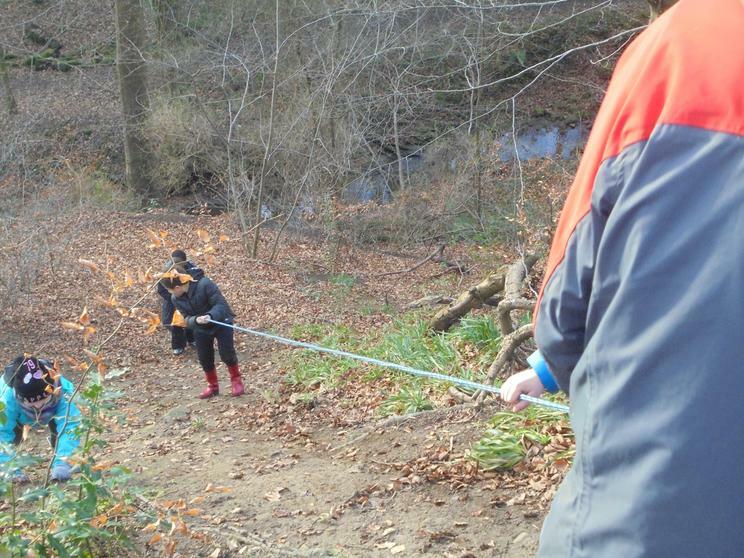 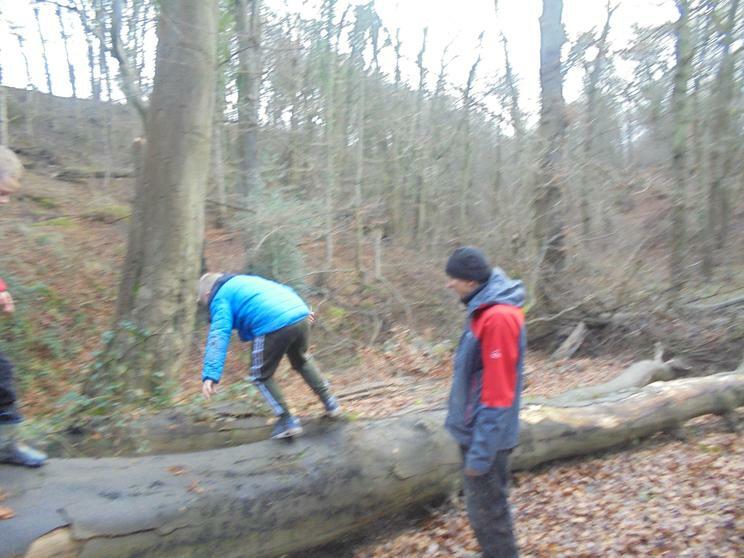 My partner was Jasmine, she was very good at leading me around the wood. 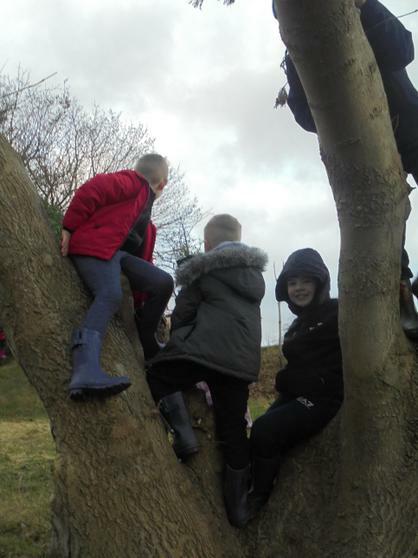 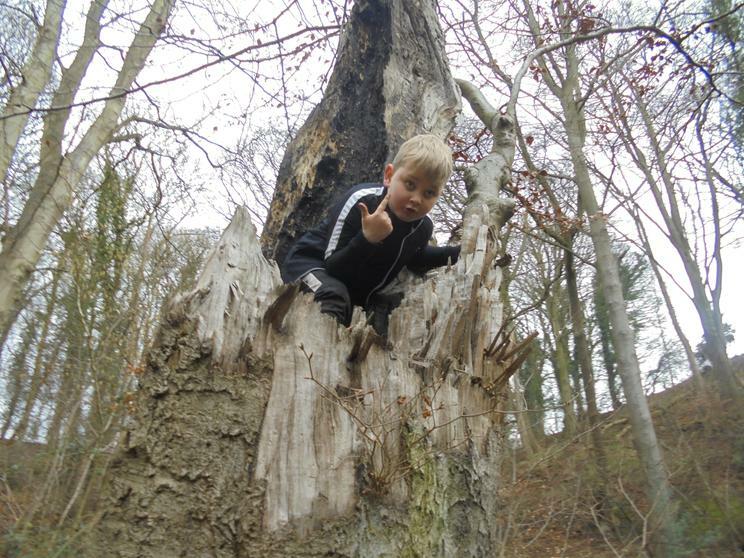 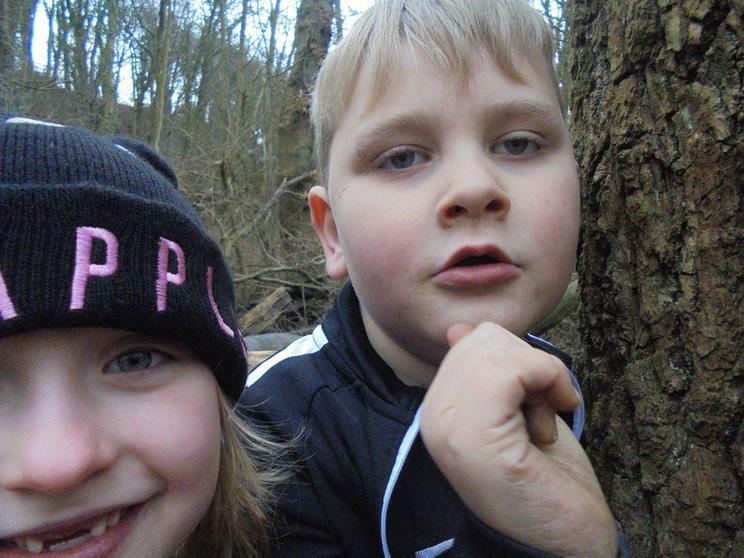 After our hot chocolate we went to find some fairy trees and the scary sounding 'Devil's Seat'. 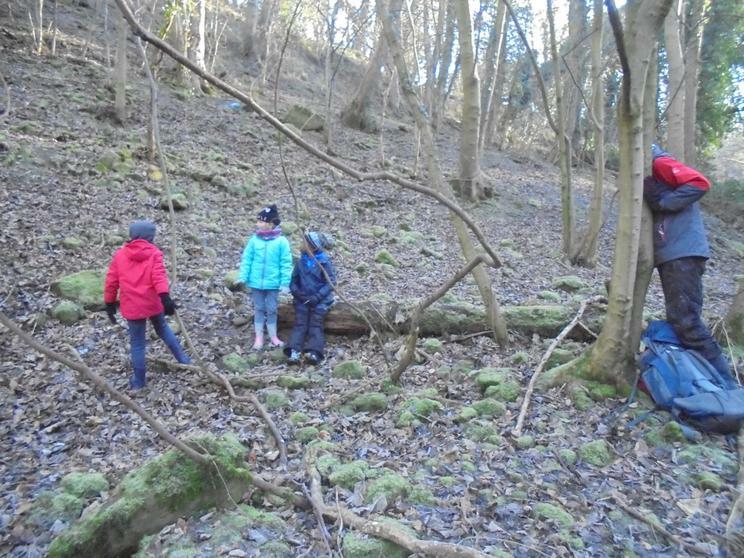 It was a nice walk where we could play some games and explore more of the dene. 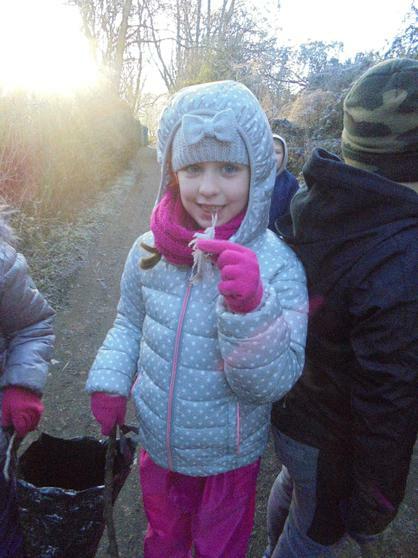 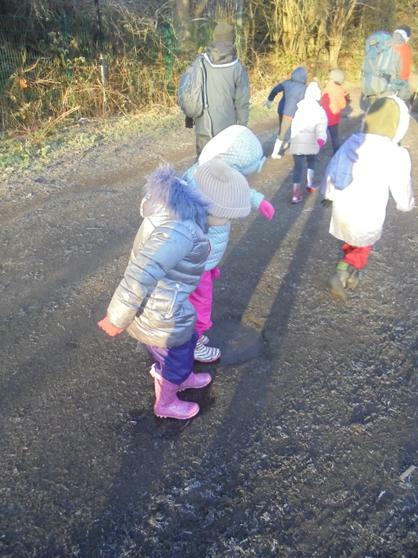 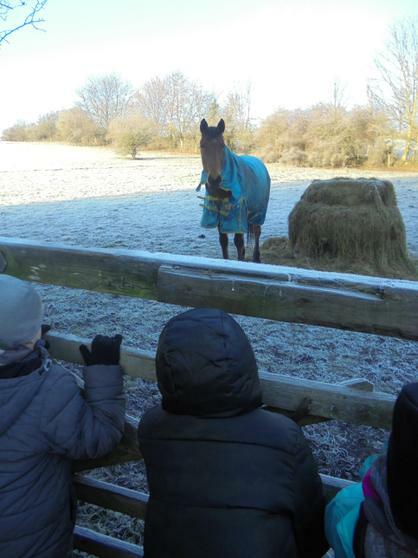 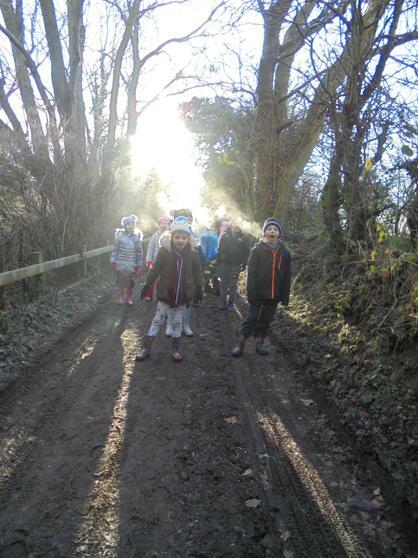 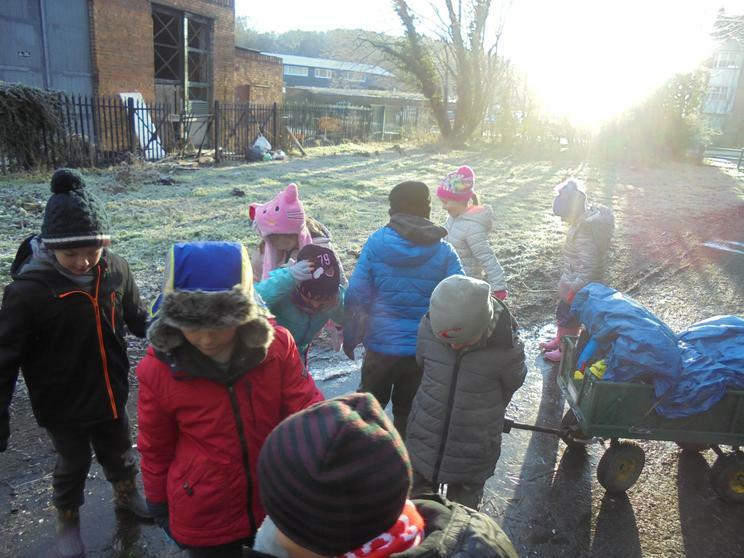 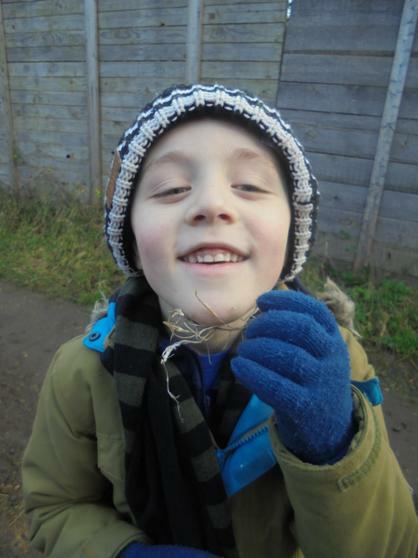 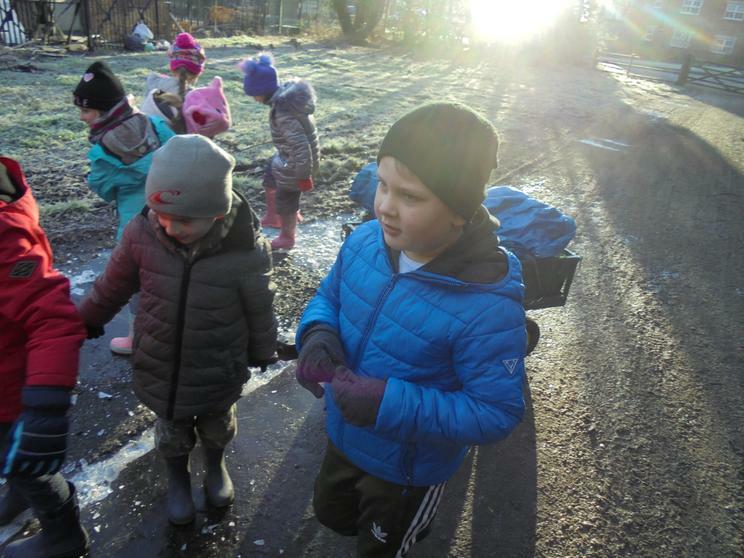 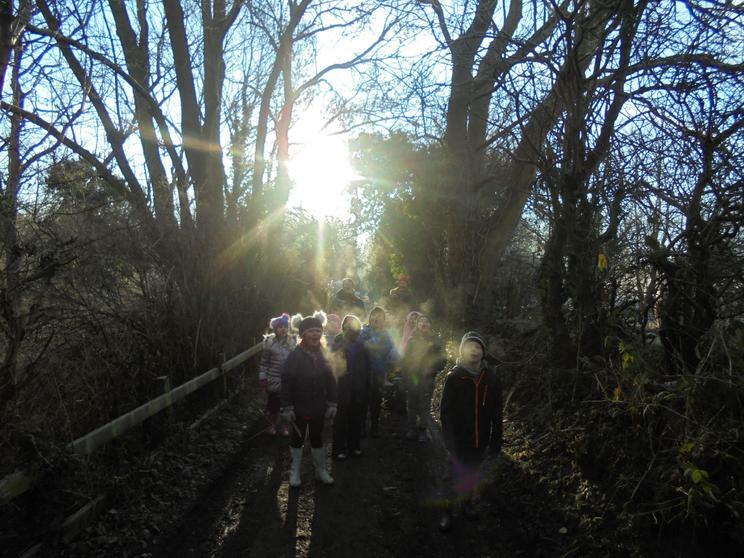 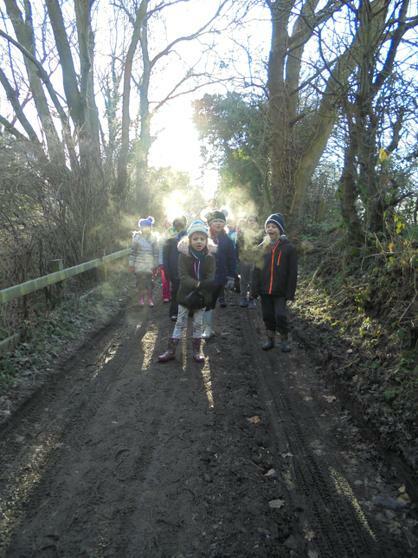 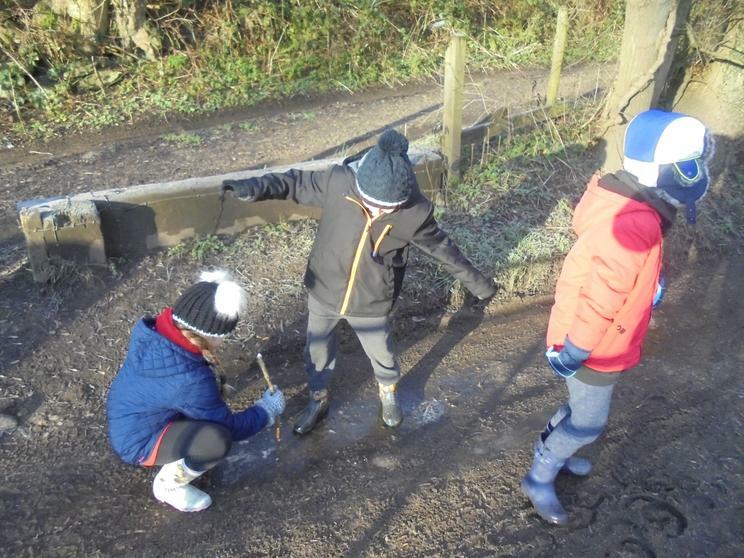 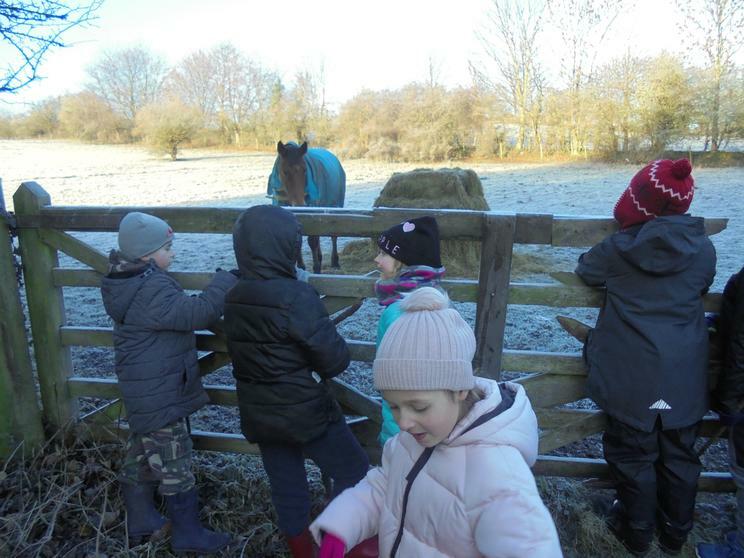 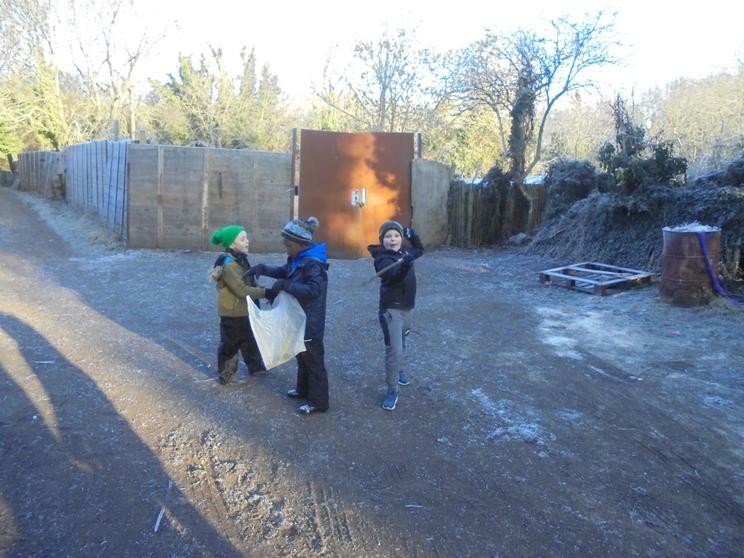 A bright and sunny day today but Jack Frost was out biting everyone's fingers and toes, luckily we were all dressed up in lots of layers, gloves, scarf and hat so we only really felt the cold when it was time to come back to school. 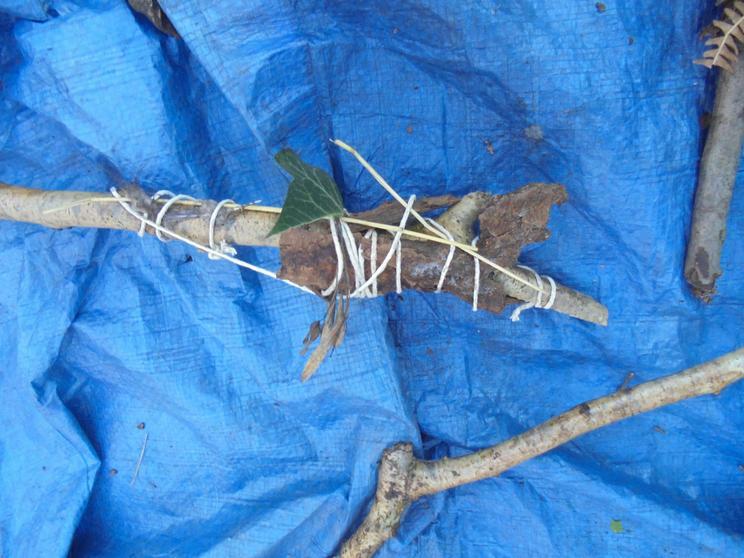 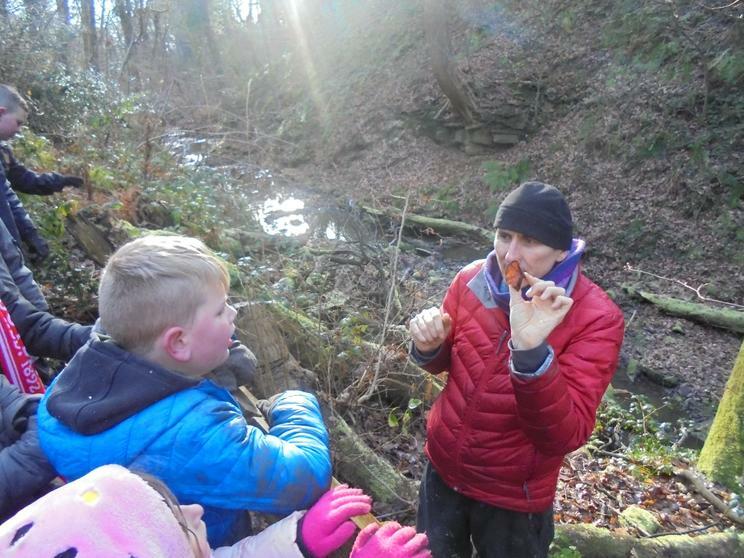 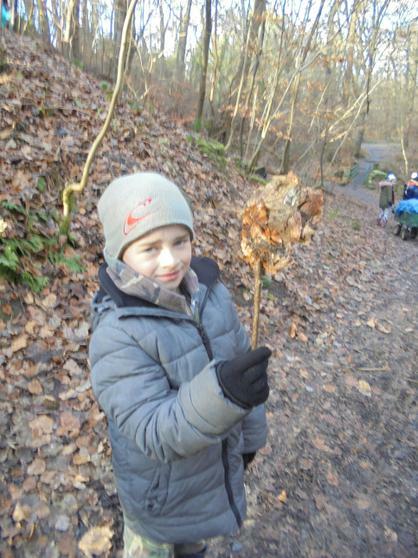 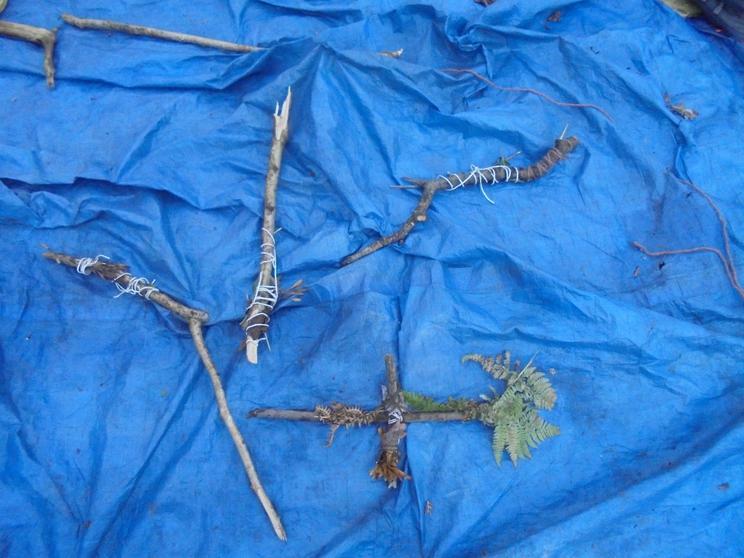 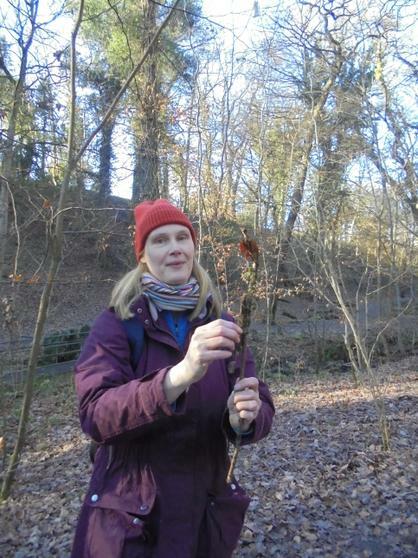 Mrs. Grainger had a fantastic idea to make some journey sticks of all the things we passed on the way down to the Dene. 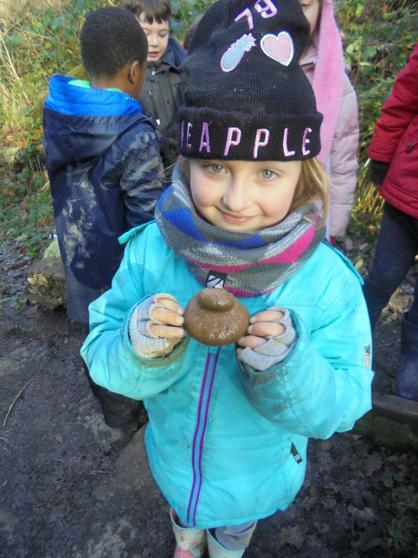 We collected all kinds of interesting objects. 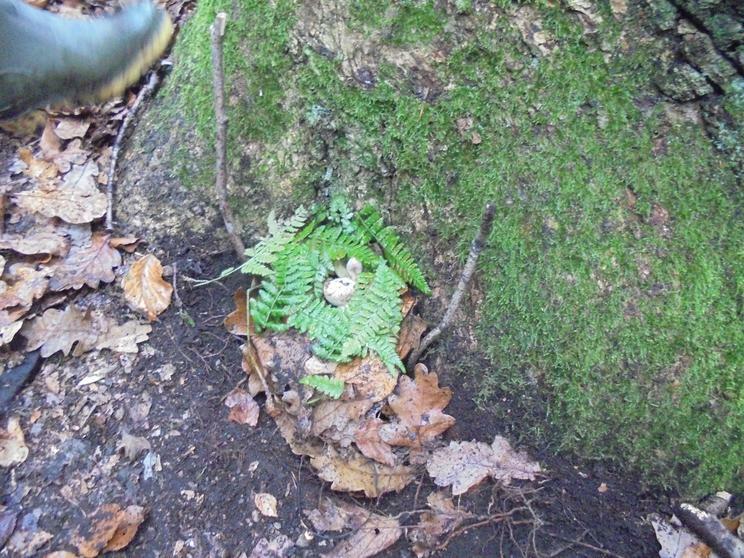 We decided that the ivy berries looked a lot like frogs eyeballs! 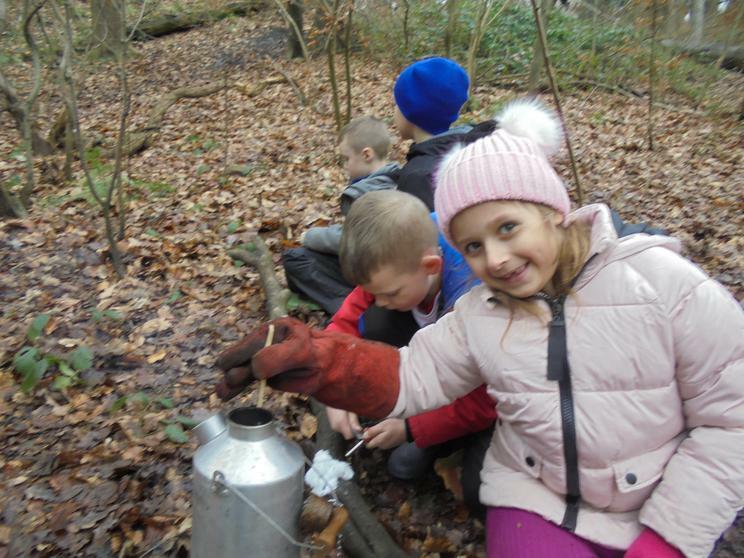 I wonder if we could make some potions with them. 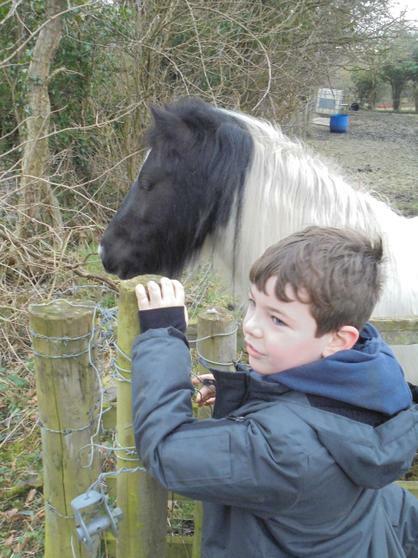 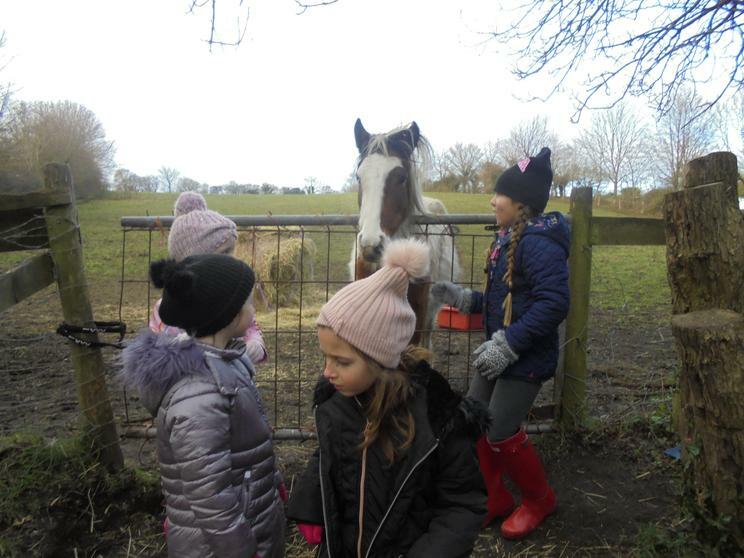 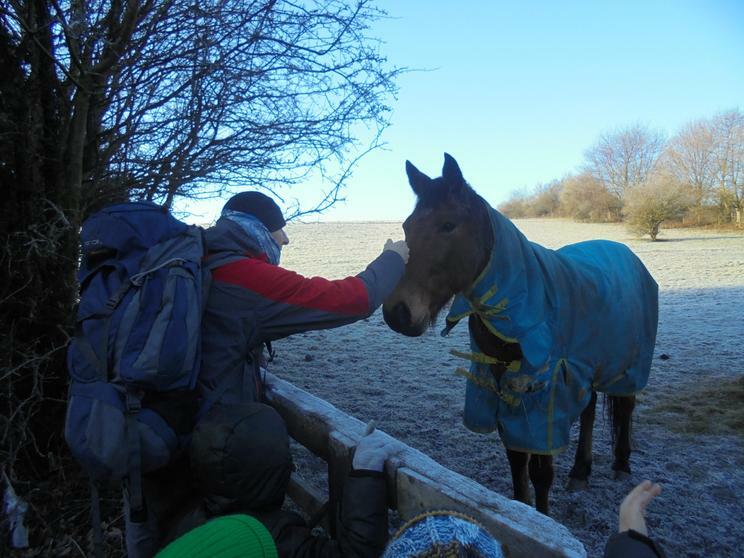 We met some very friendly horses then had a quick game of Wolfie Julia. 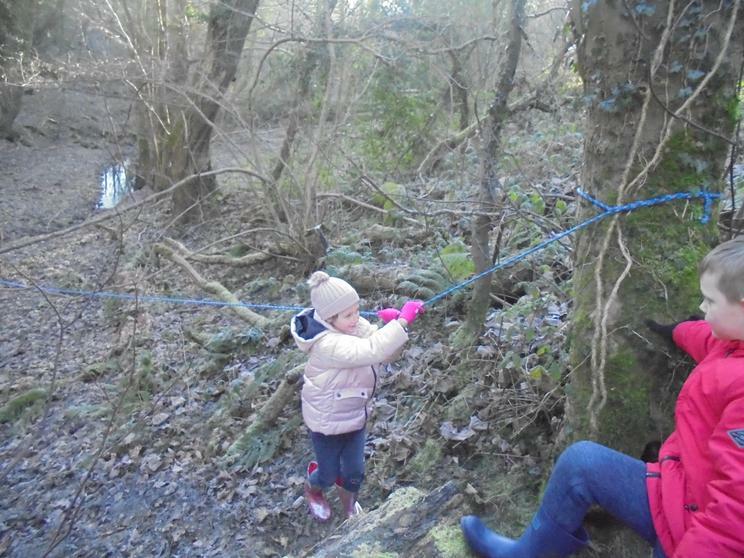 For a while I have looked for other areas to have our base so we went on a rope adventure to explore. 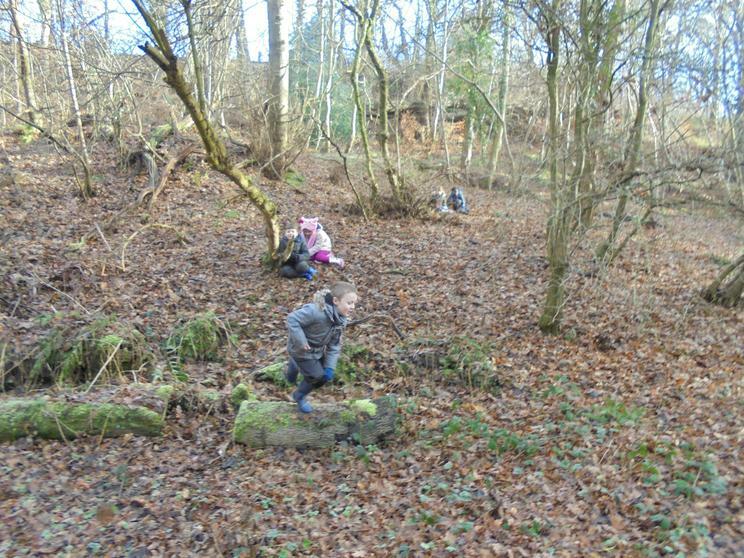 From a distance it looked great with lots of hiding places to play games but when we got there the area was full of slippy, trippy rocks. 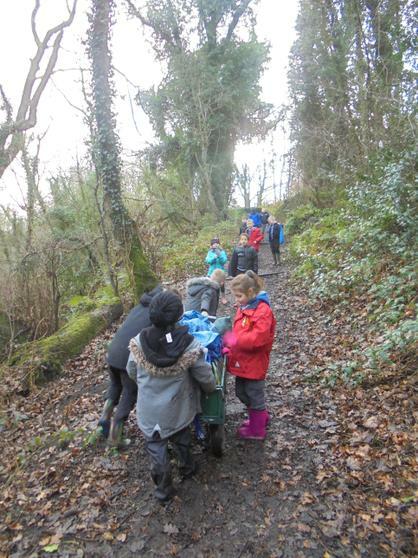 We carried on to our usual spot. 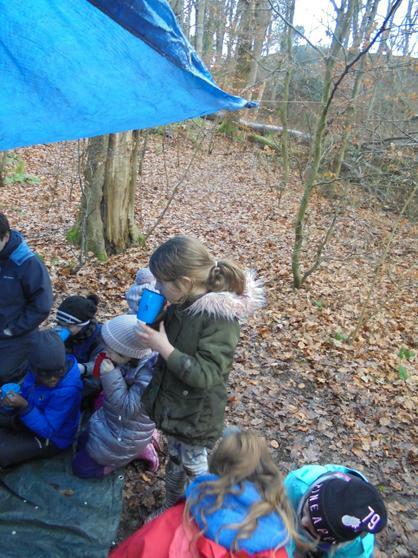 We absolutely had to have our hot chocolate then and there. 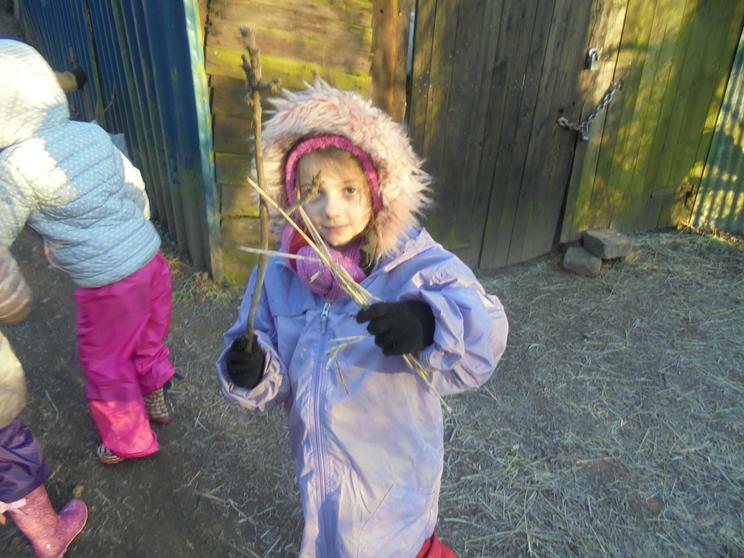 We then spent some time making our travel sticks. 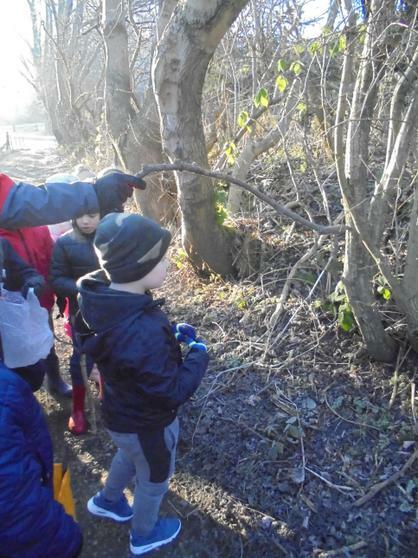 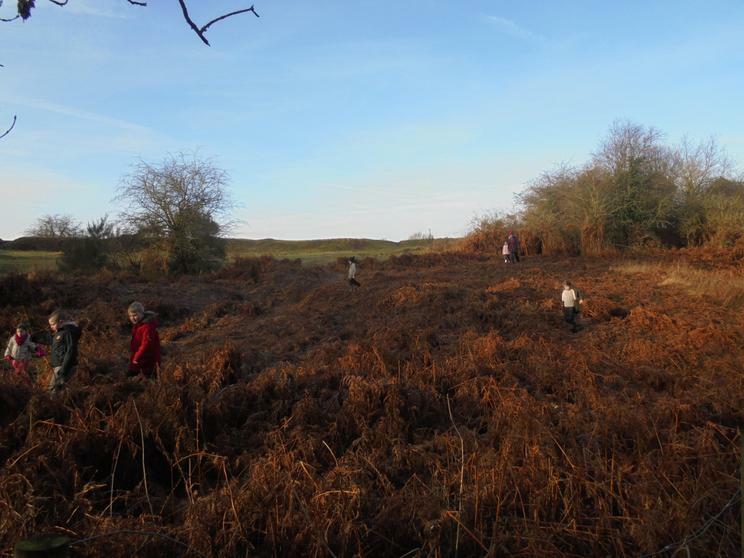 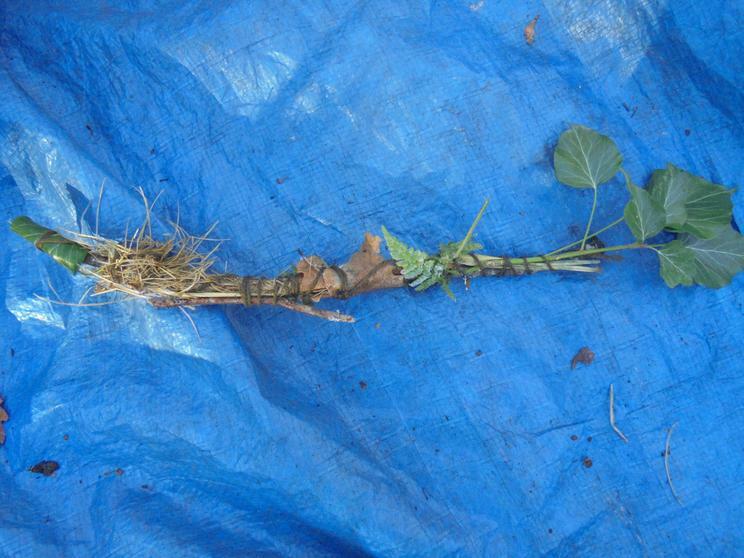 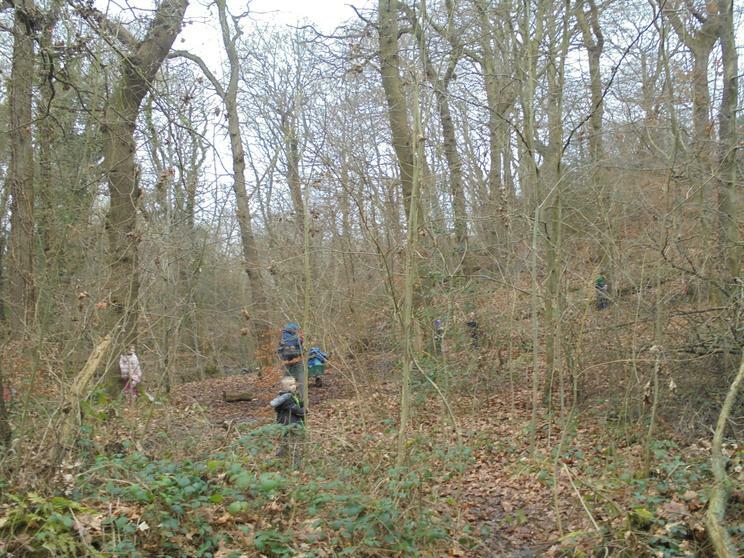 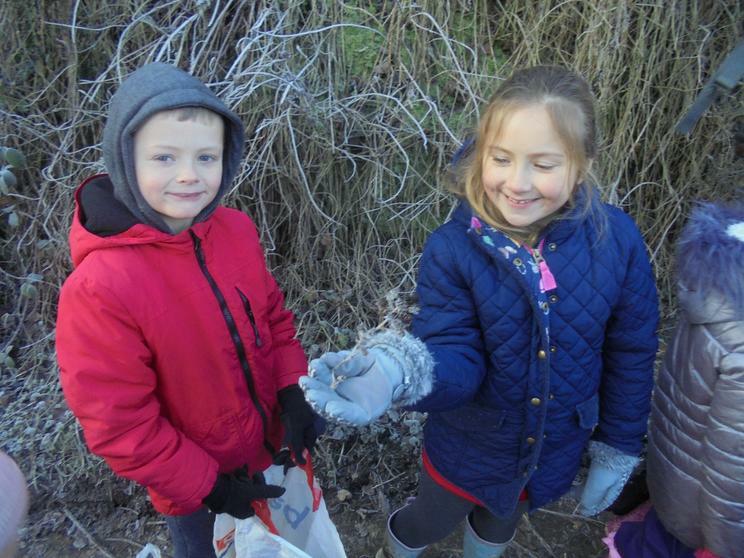 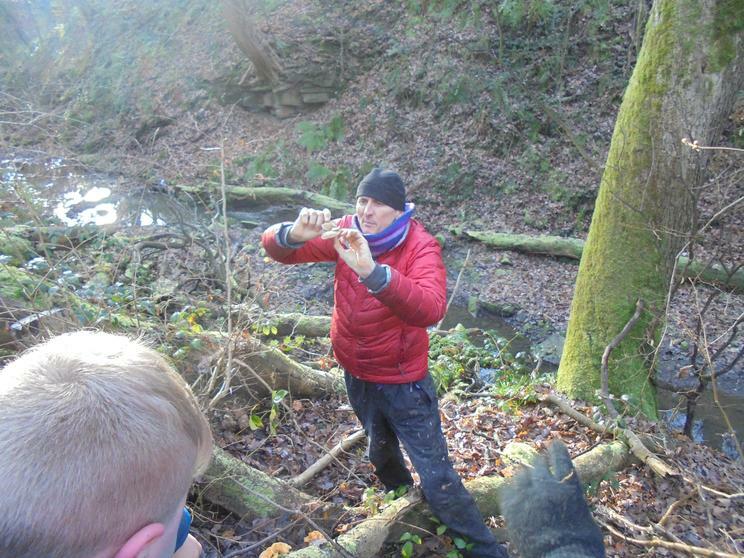 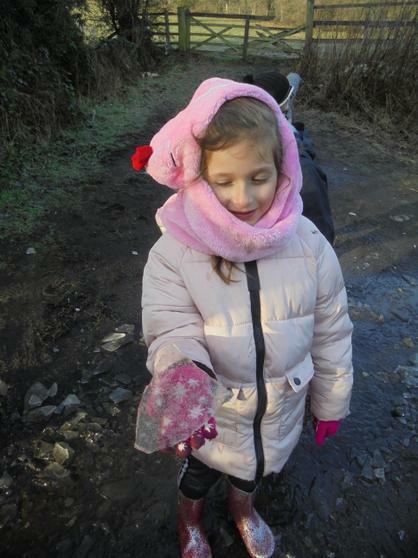 We cast a spell to make the Dene better. 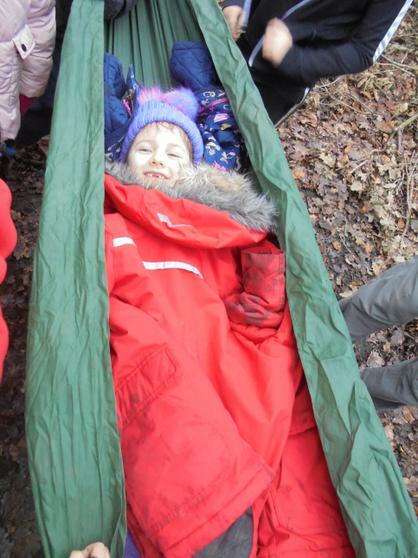 I wanted warmer feet. 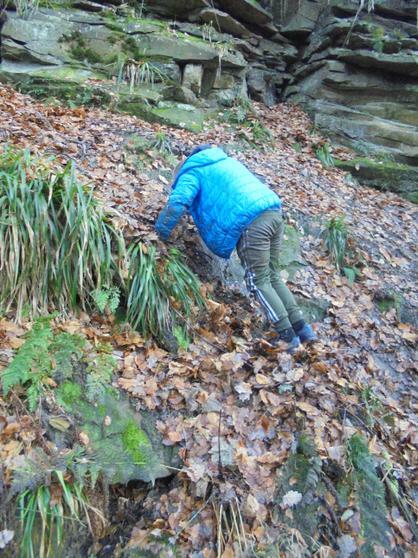 That seemed like a good time to come back - so we did. 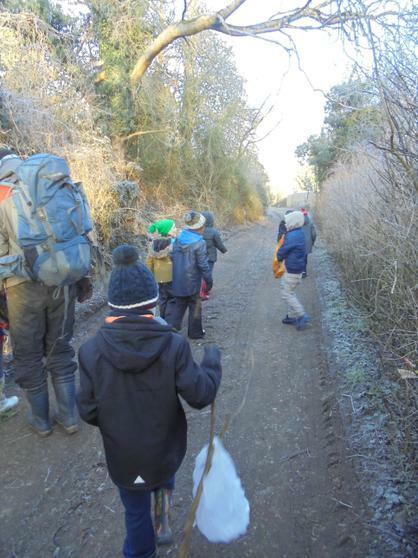 I thought we would be early but in fact we were nearly late! 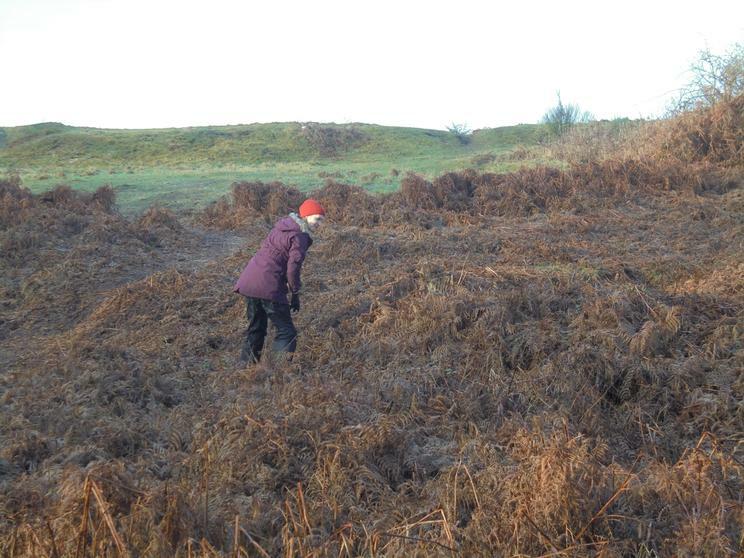 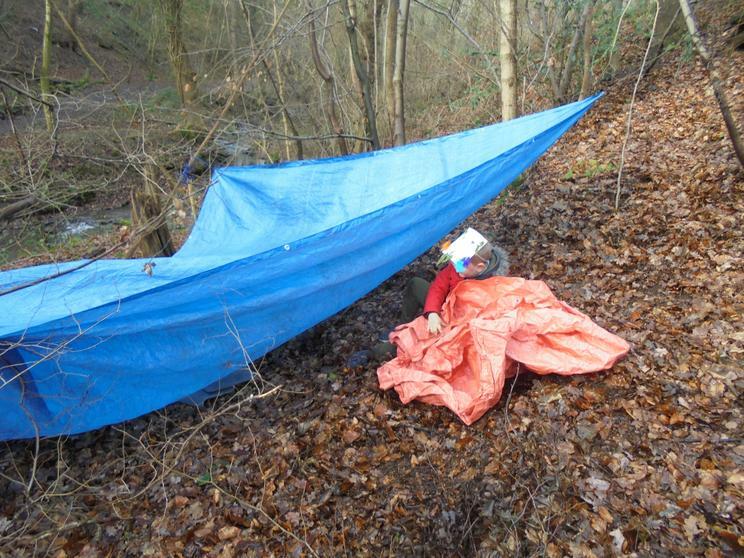 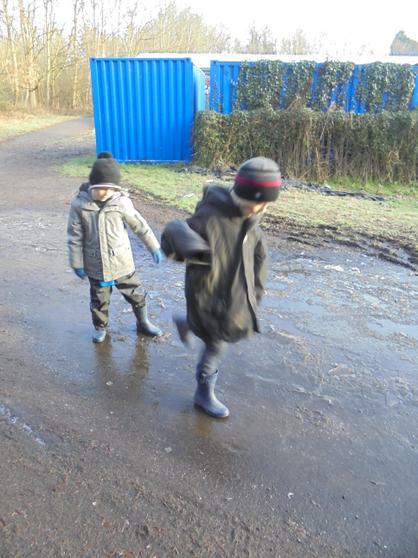 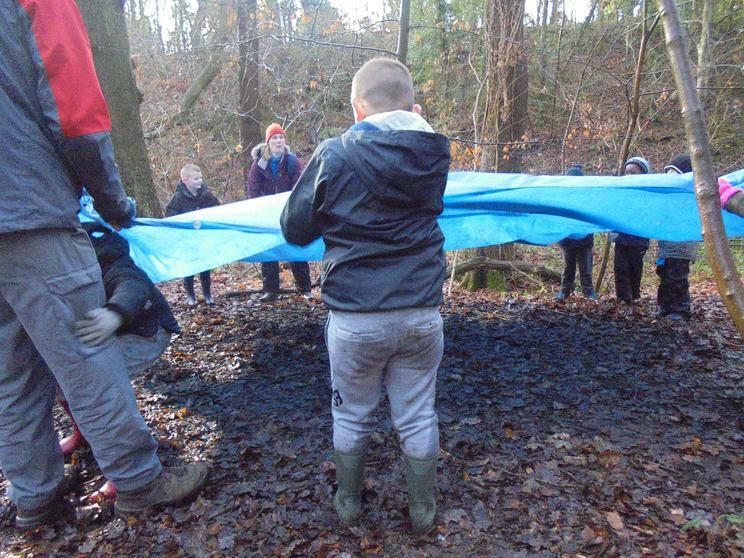 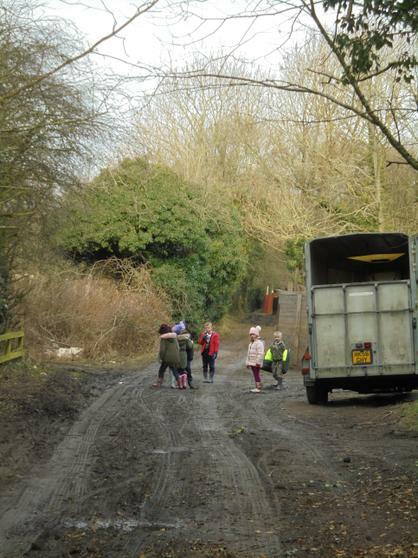 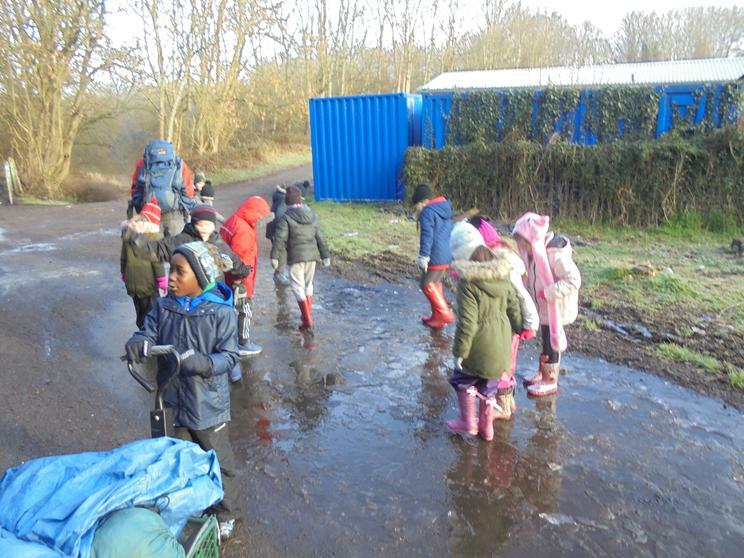 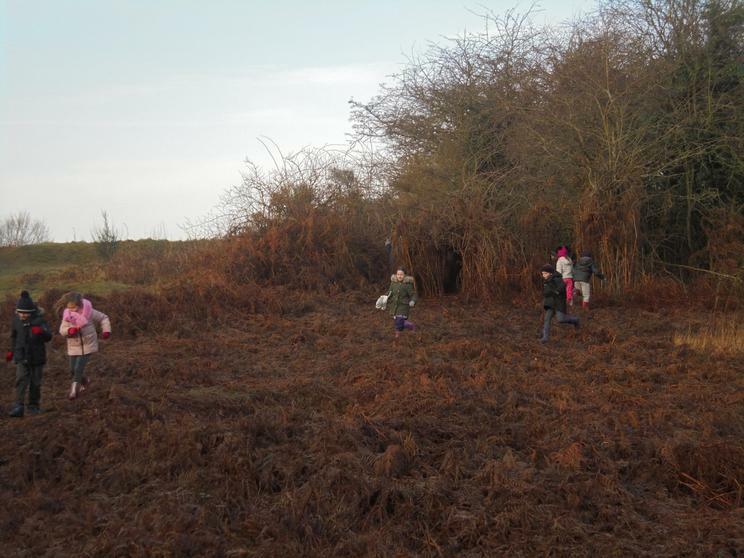 You might think that because of the rain we had this morning that Forest School might have been a bit of a wash out. 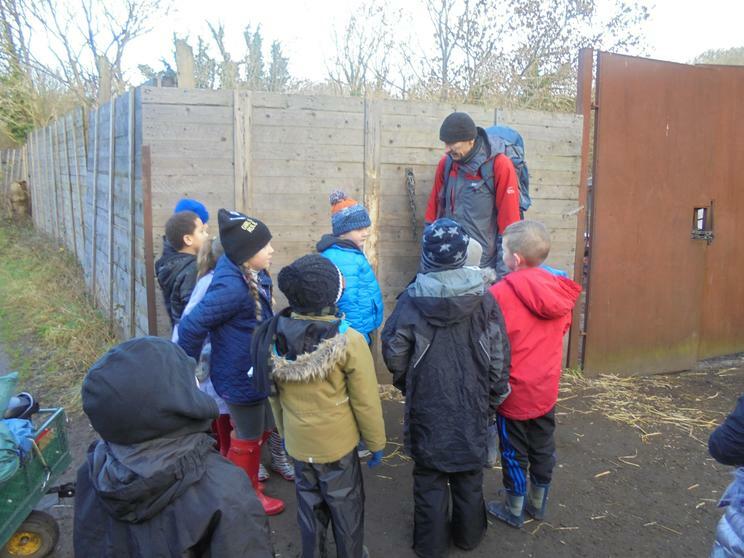 I think for the most part we all had a fantastic time and fitted so much in! 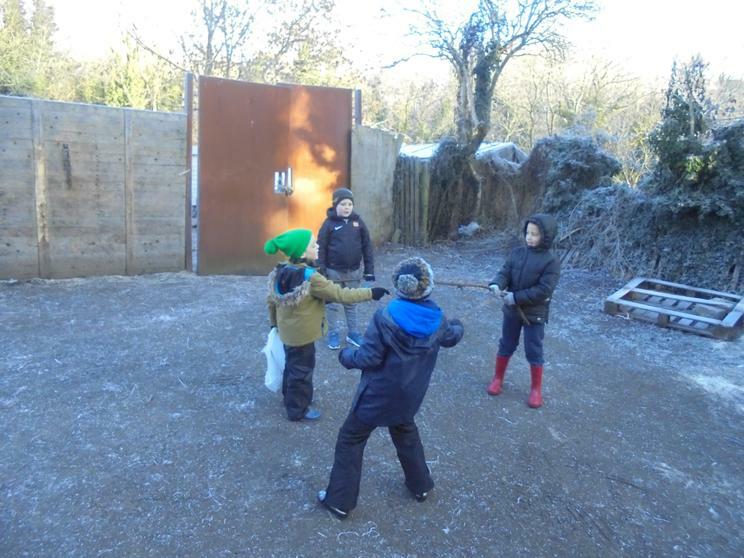 The children have made up this game called 'Wolfie Julia' so we played that for a bit. 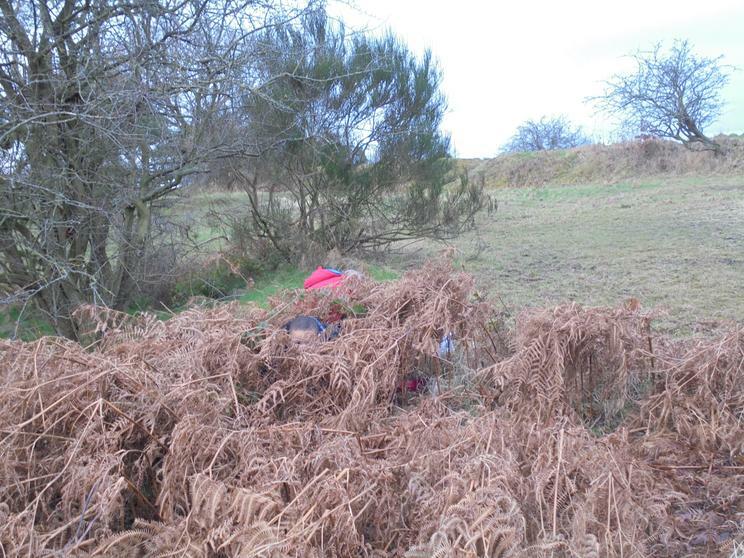 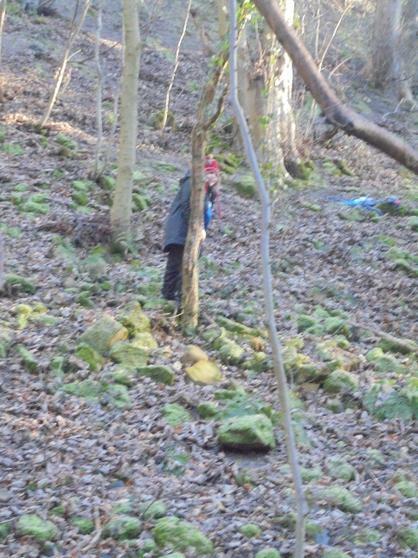 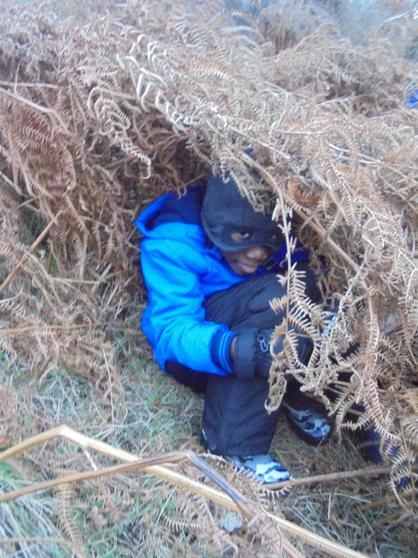 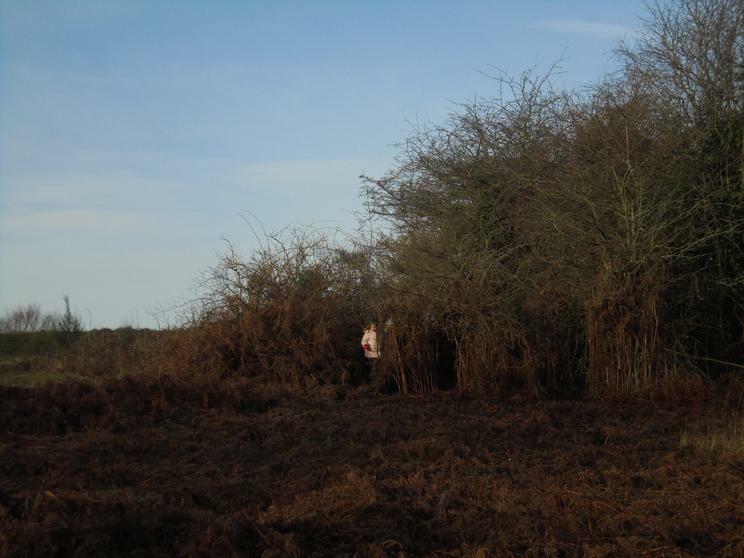 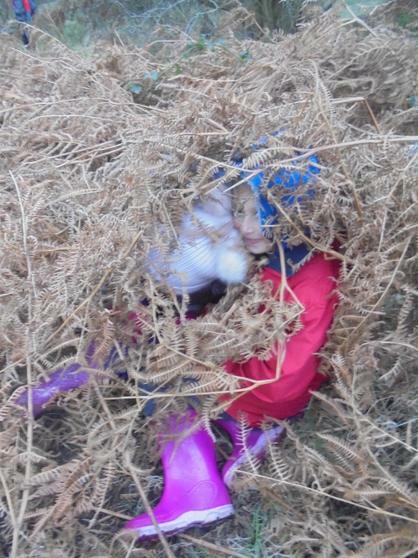 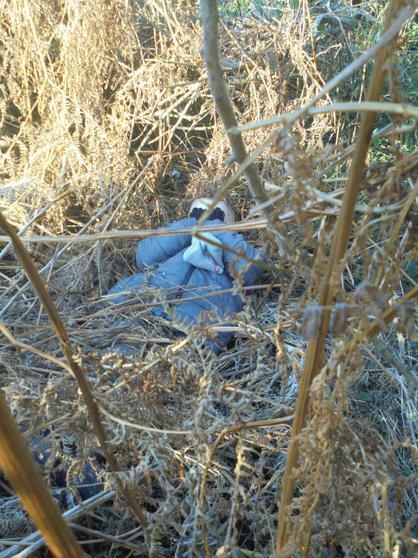 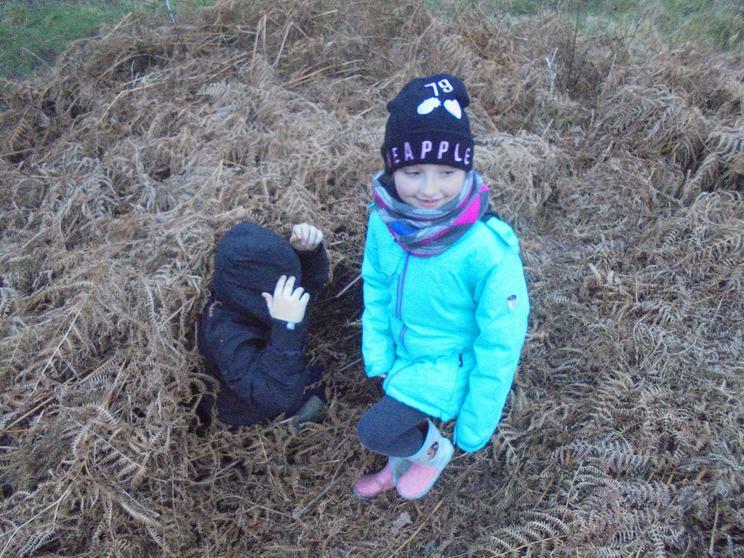 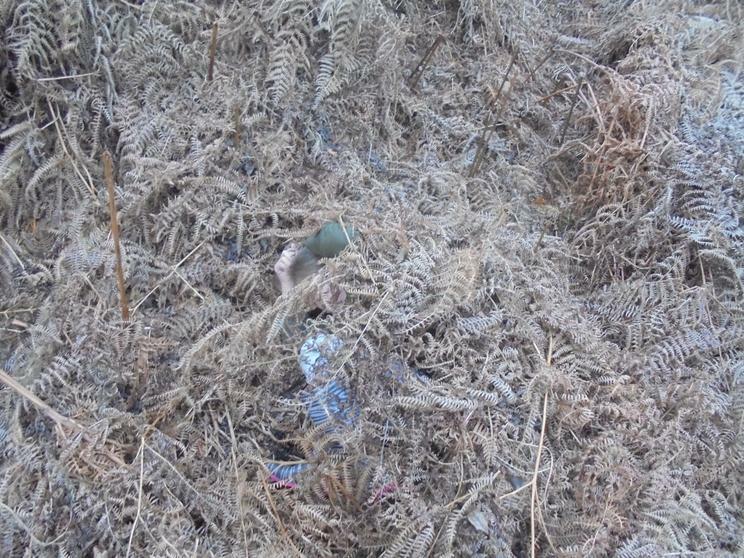 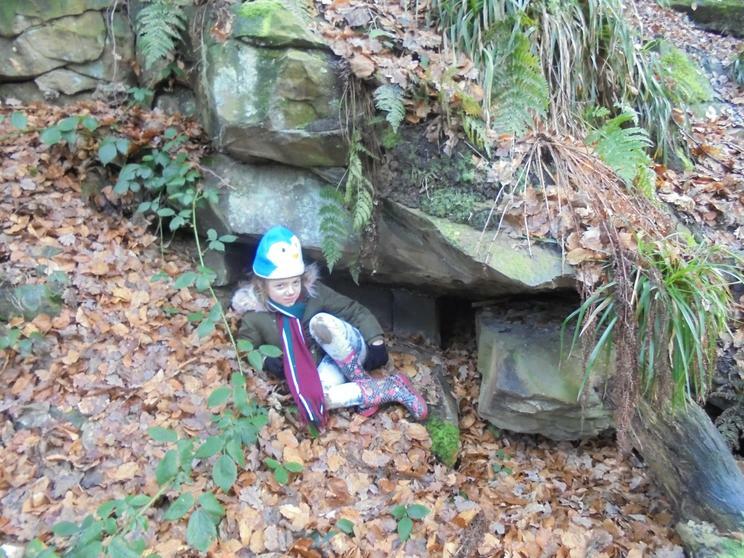 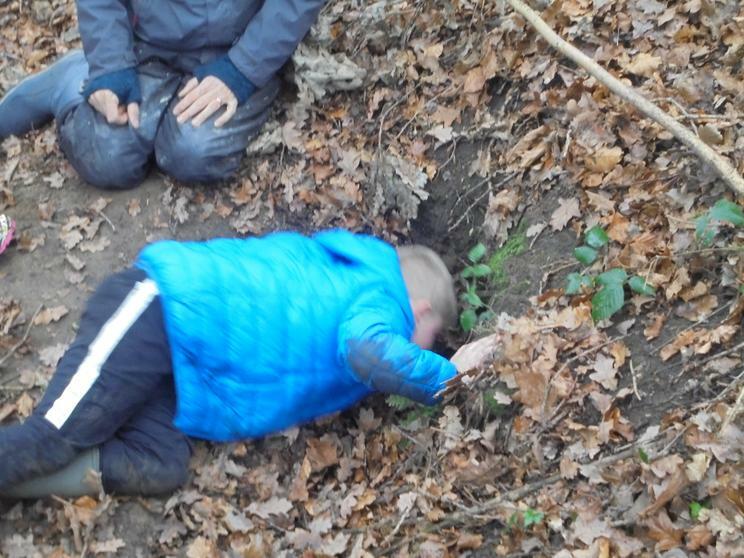 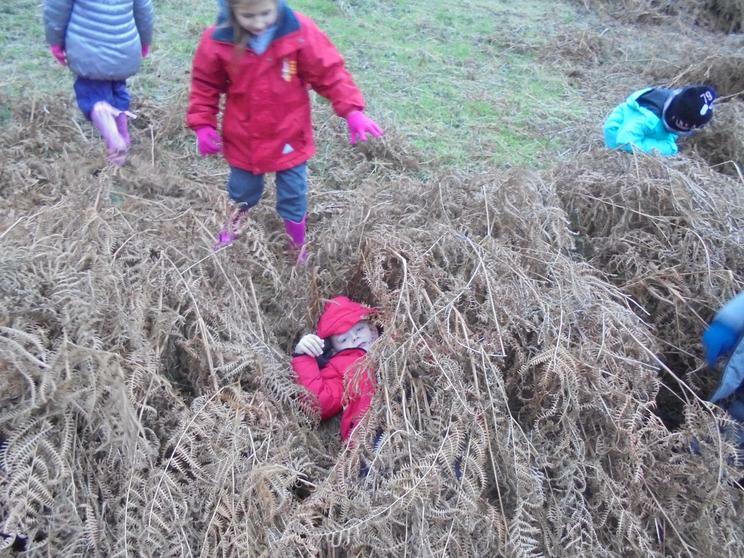 There were some fantastic hiding places i am very surprised that the wolf caught everyone. 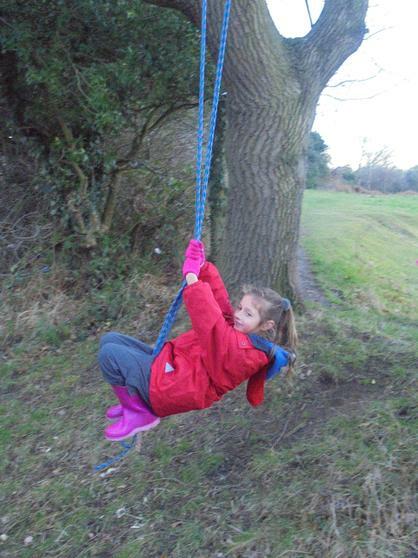 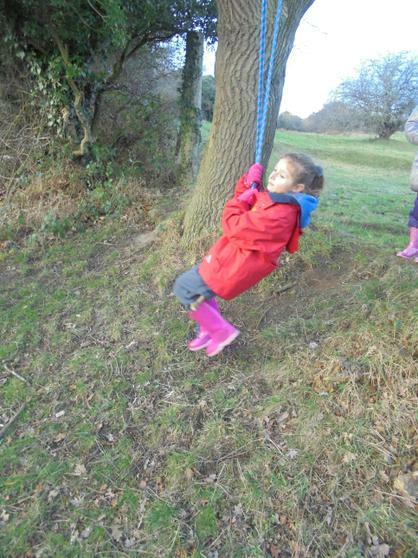 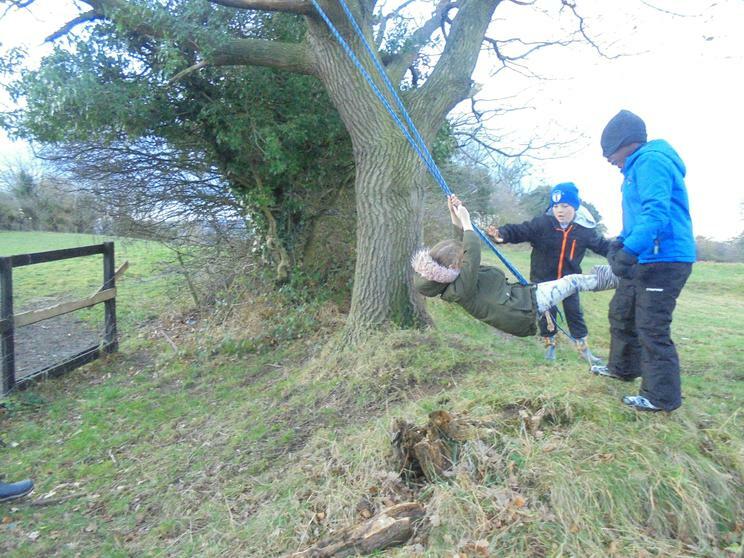 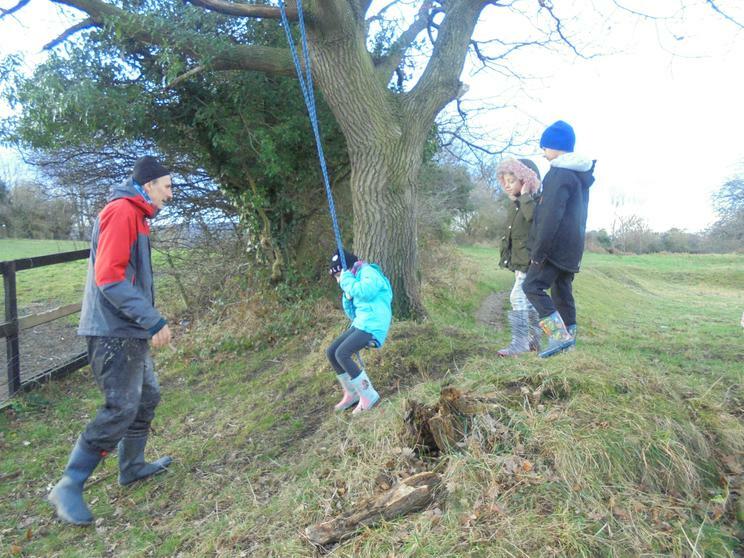 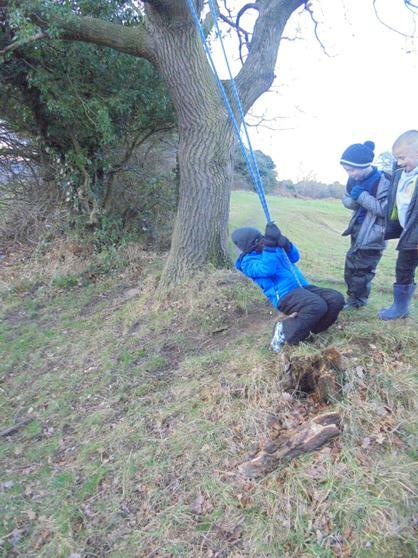 We went to the climbing tree and made a swing. 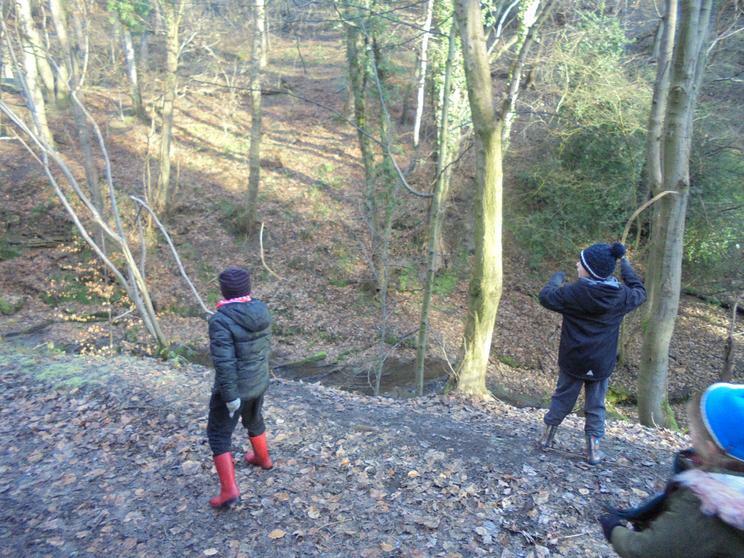 Then we went into the dene. 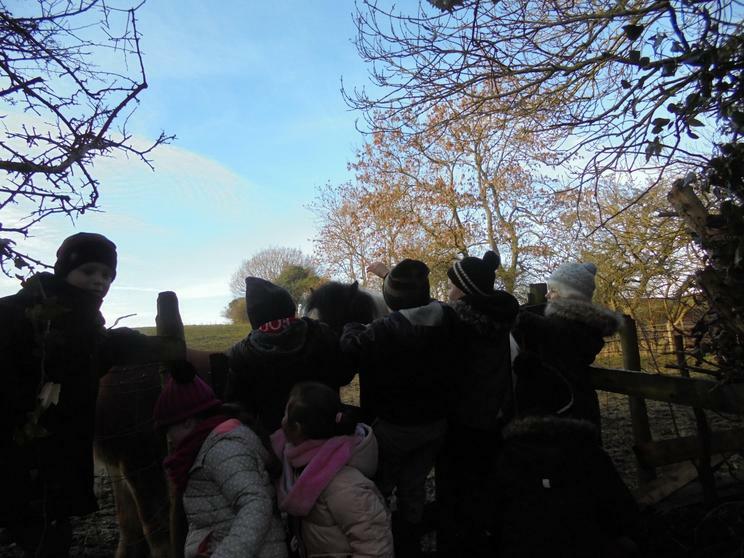 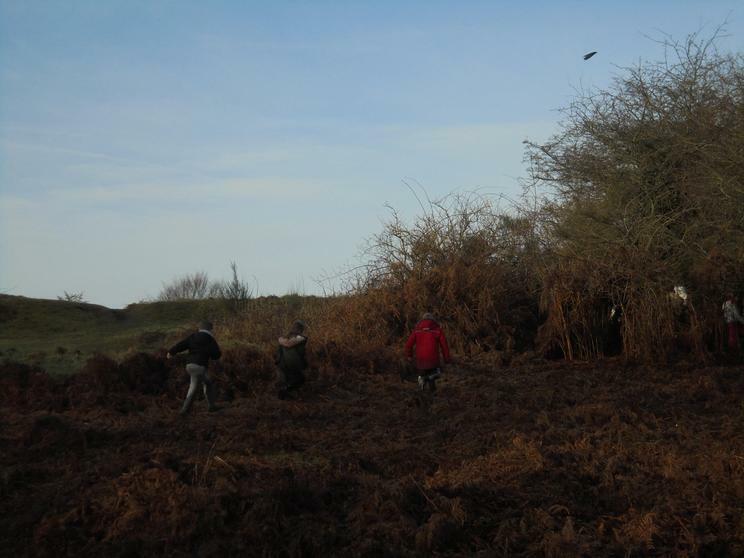 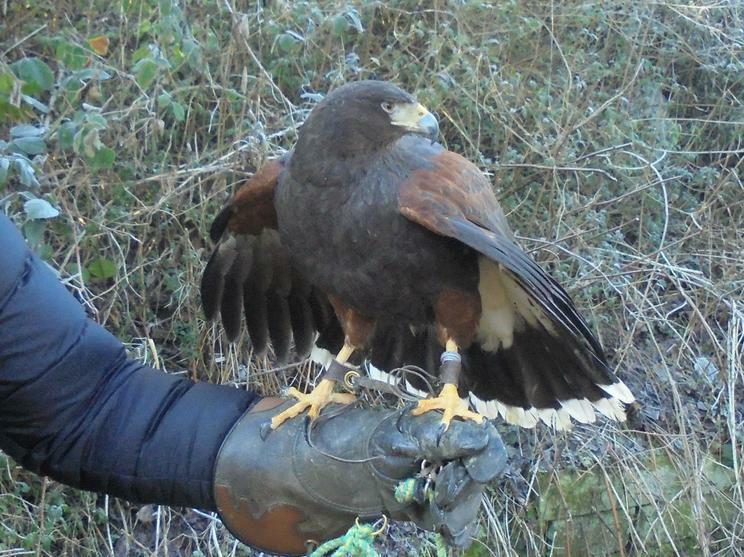 I saw a buzzard and we explored around the badger set. 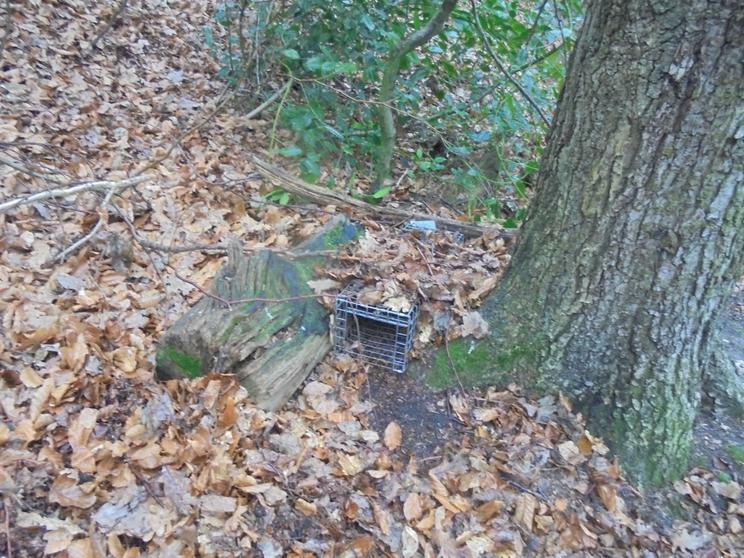 I think the badgers have left, maybe foxes live there now. 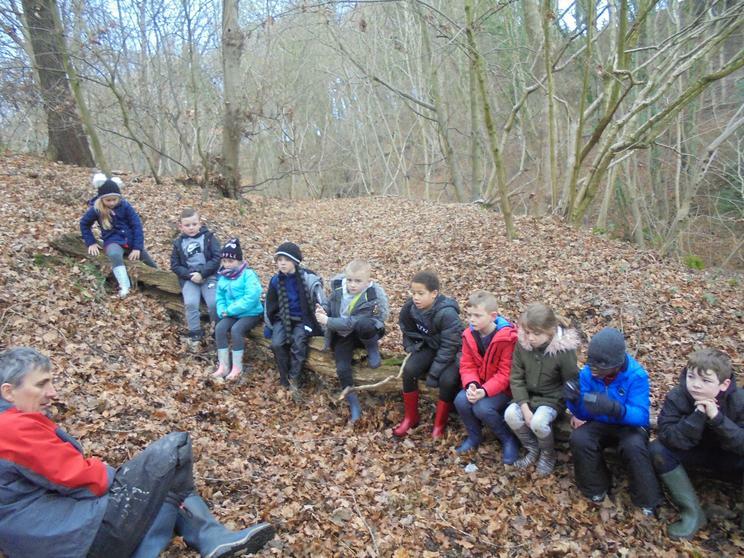 When we arrived at our camp we set up a shelter and had a story. 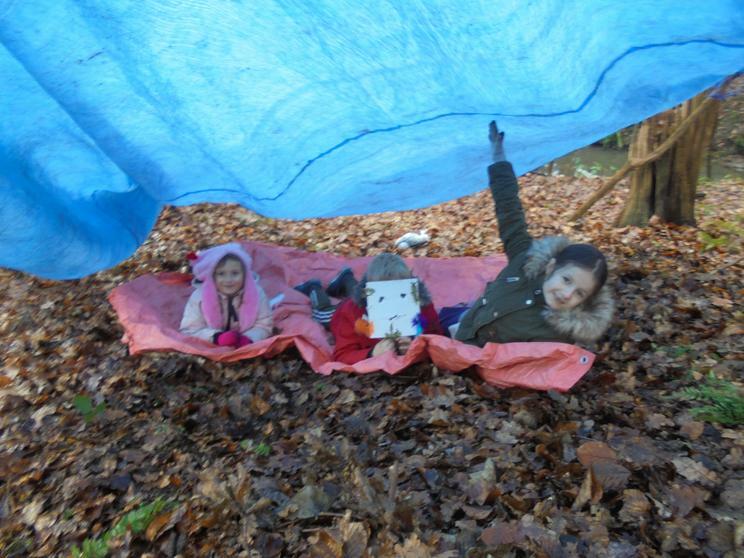 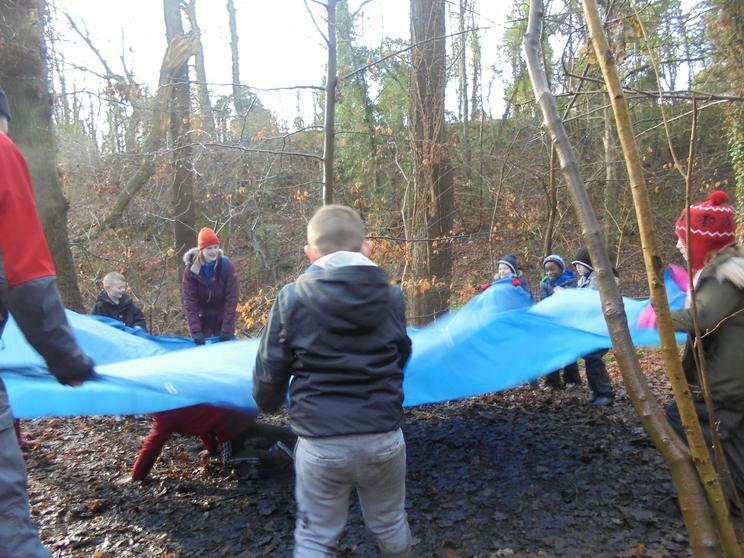 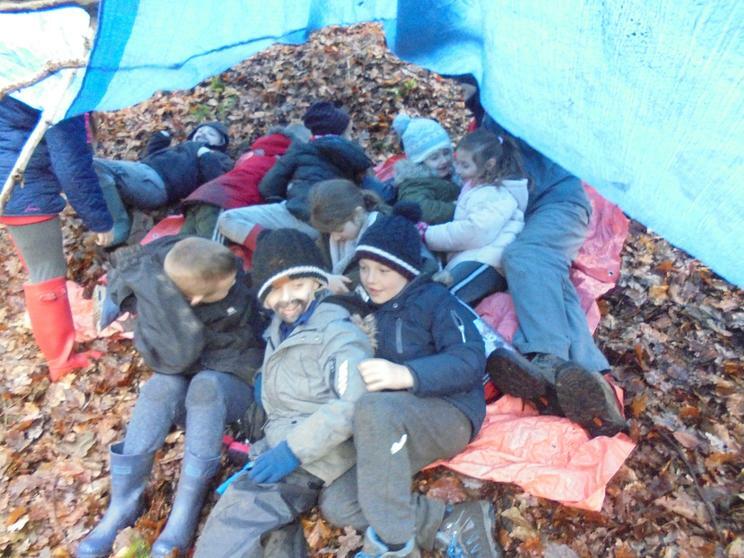 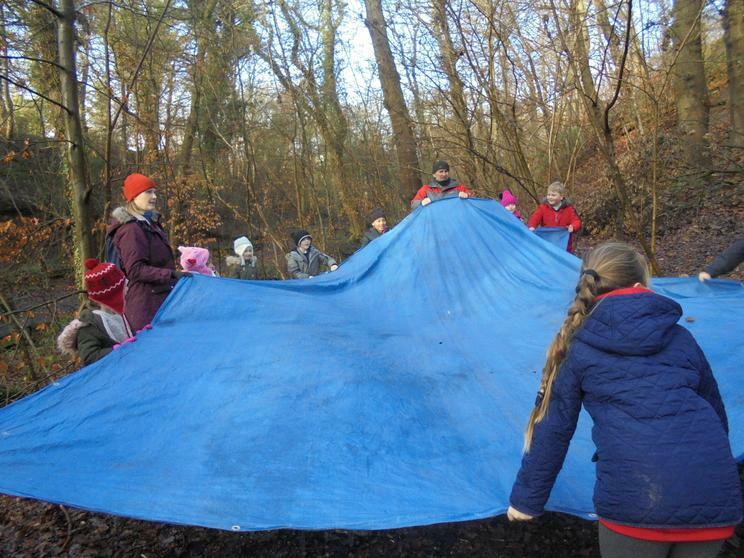 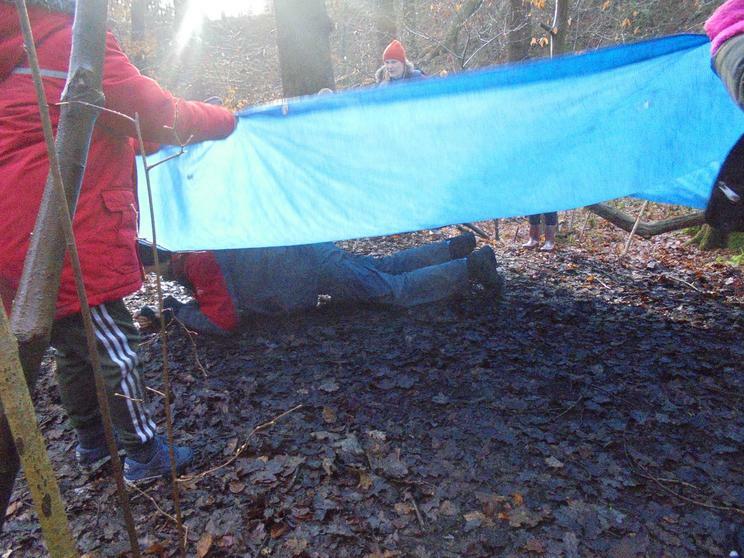 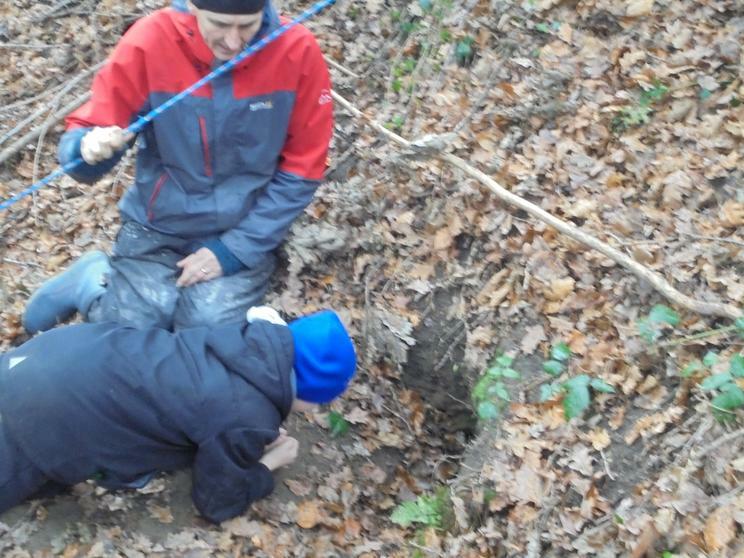 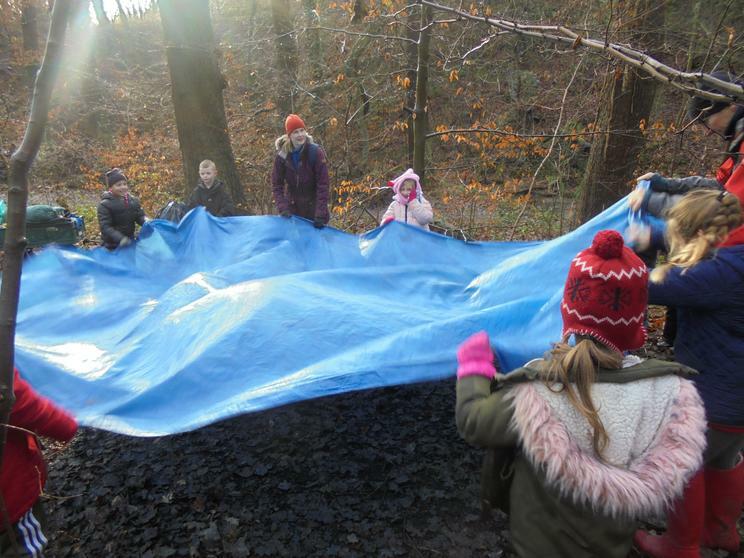 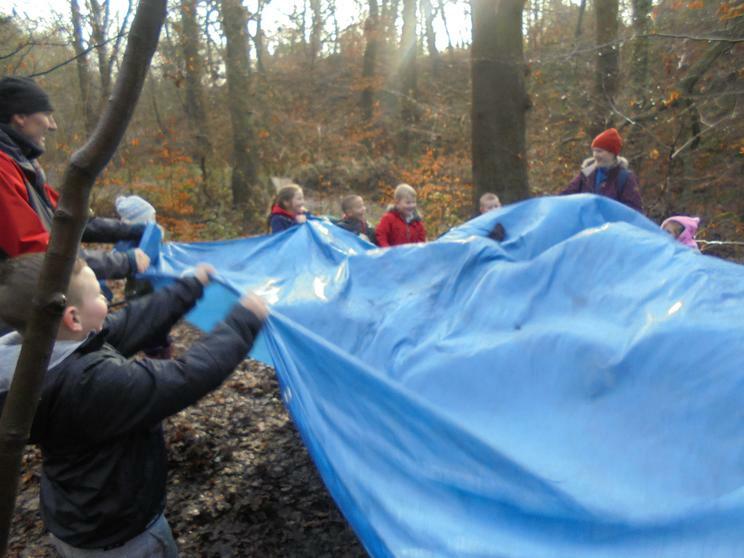 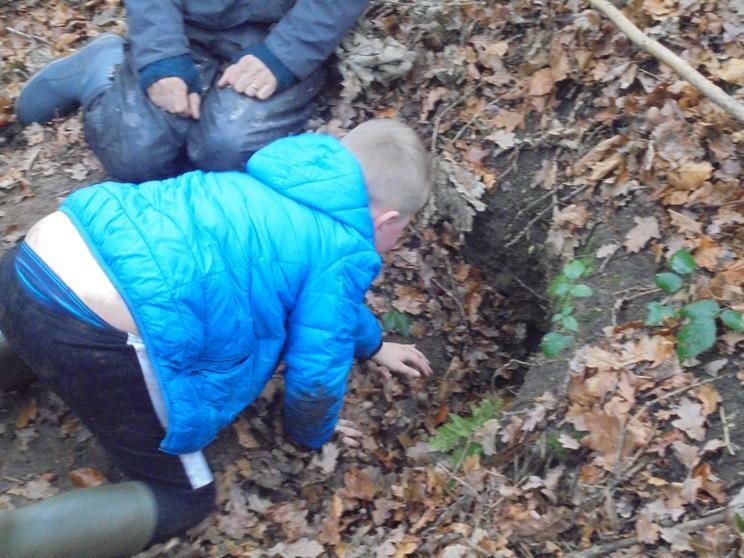 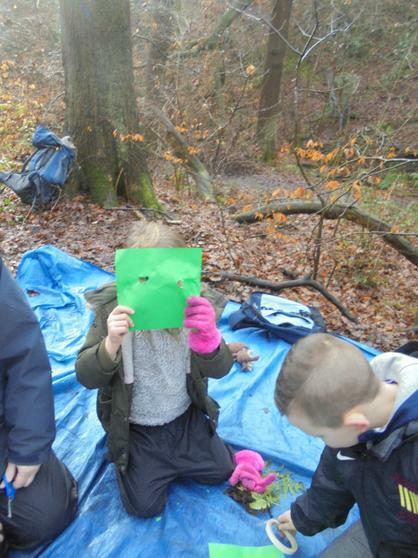 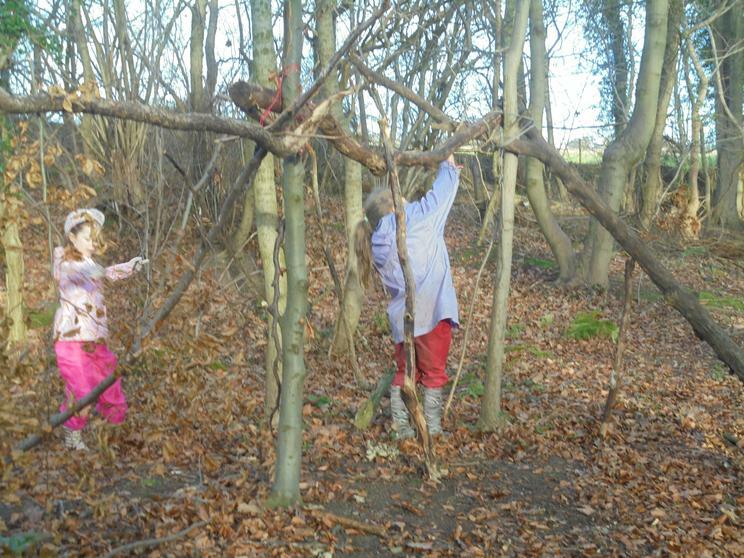 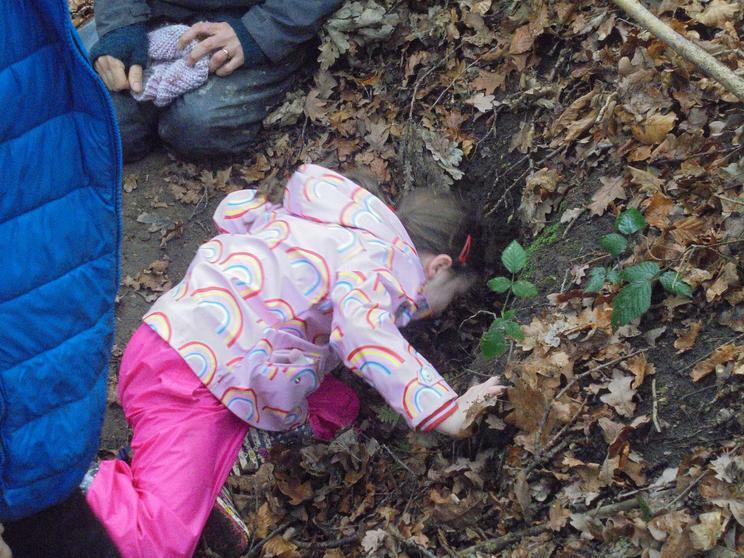 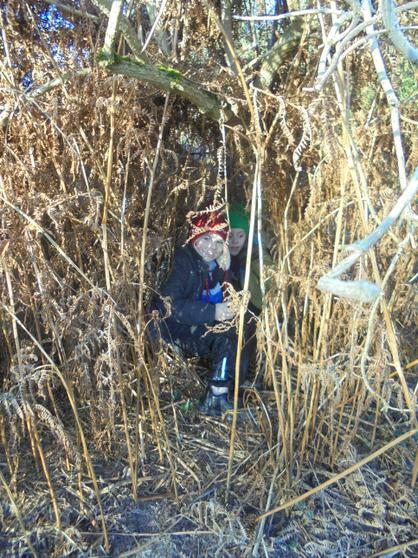 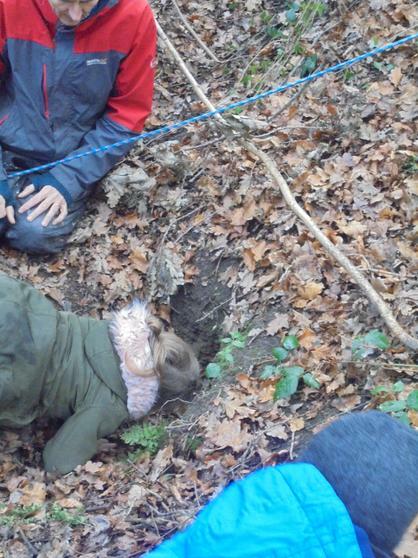 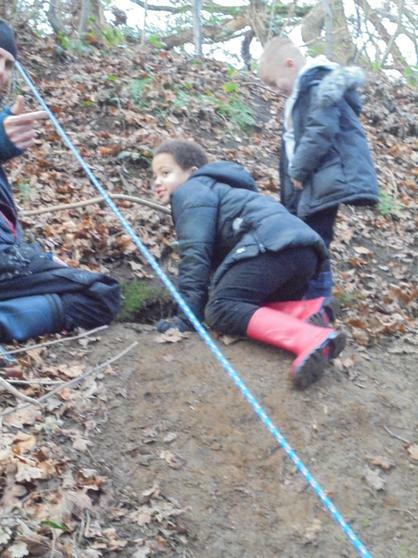 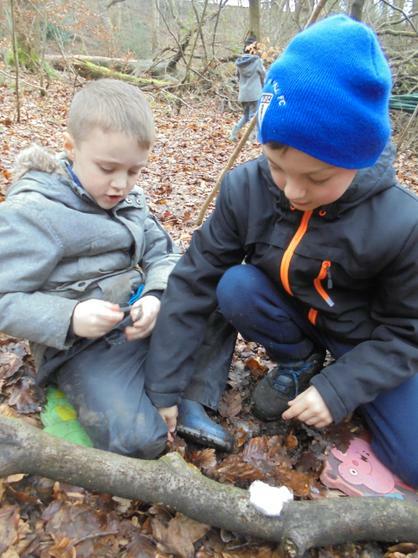 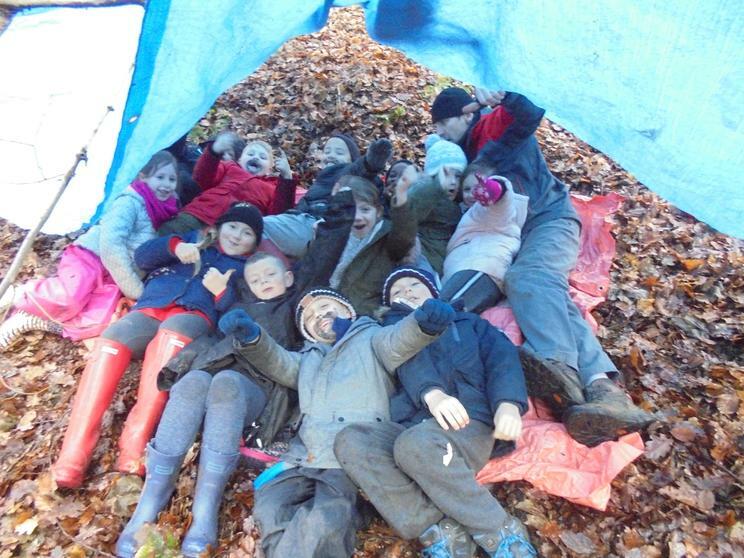 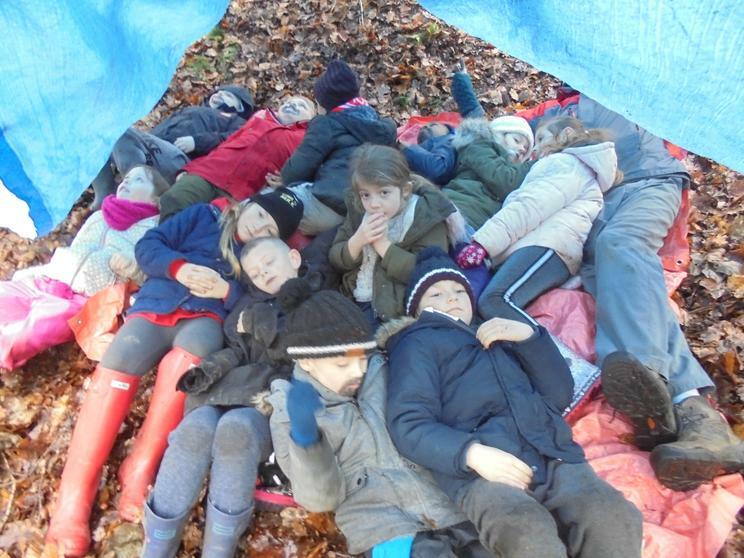 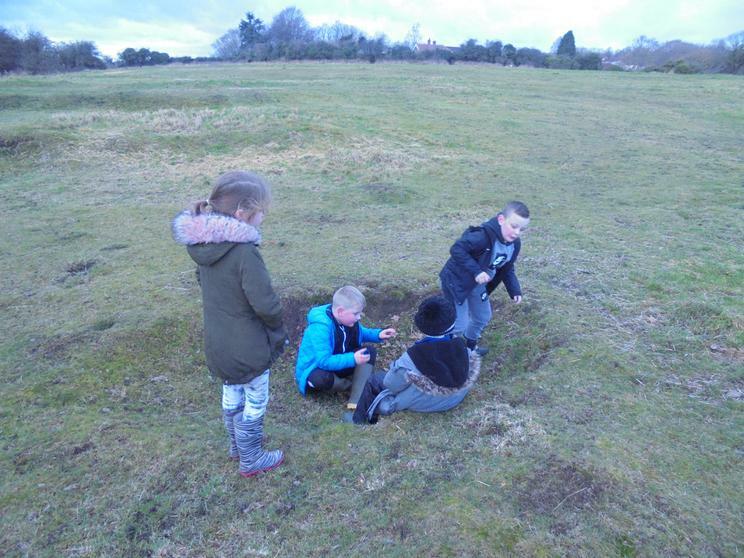 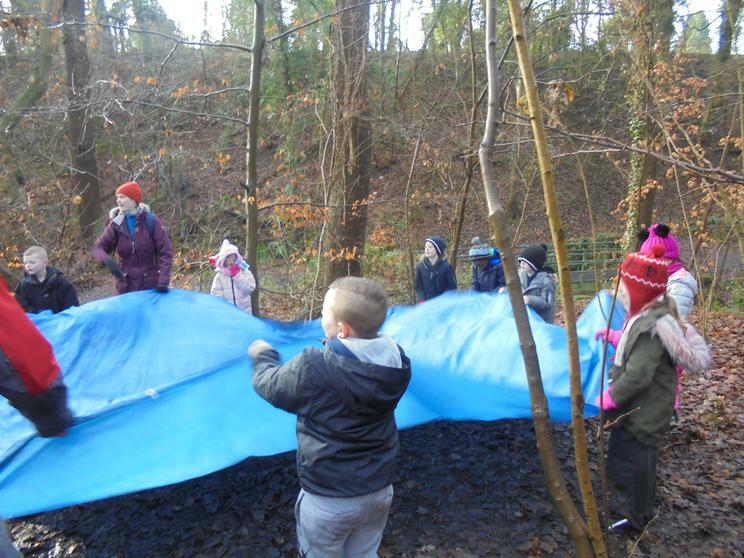 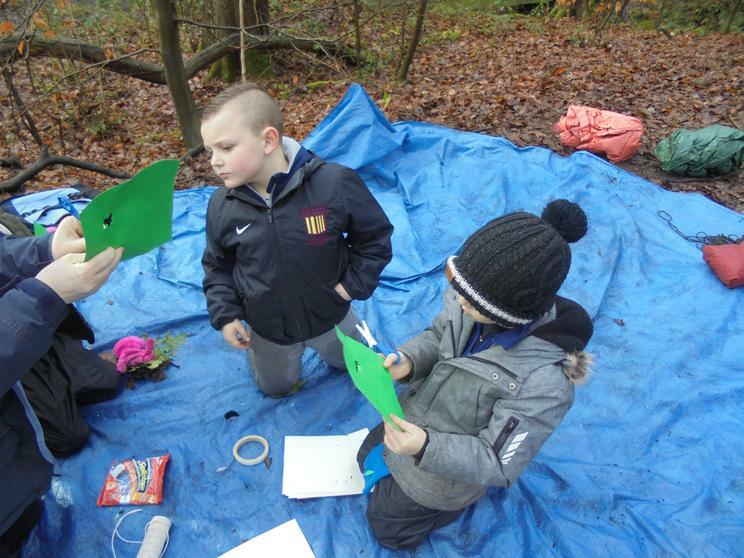 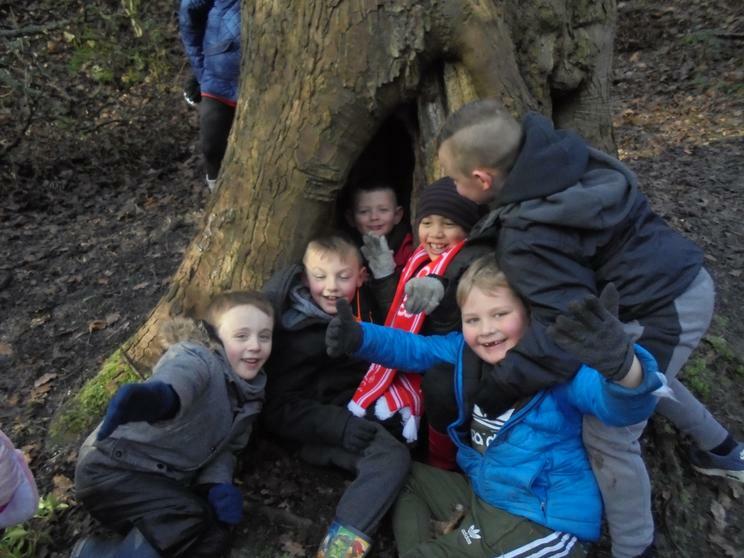 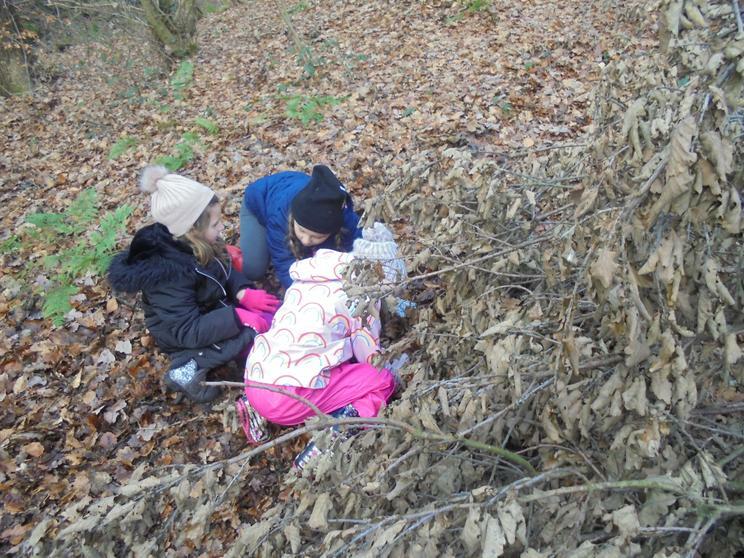 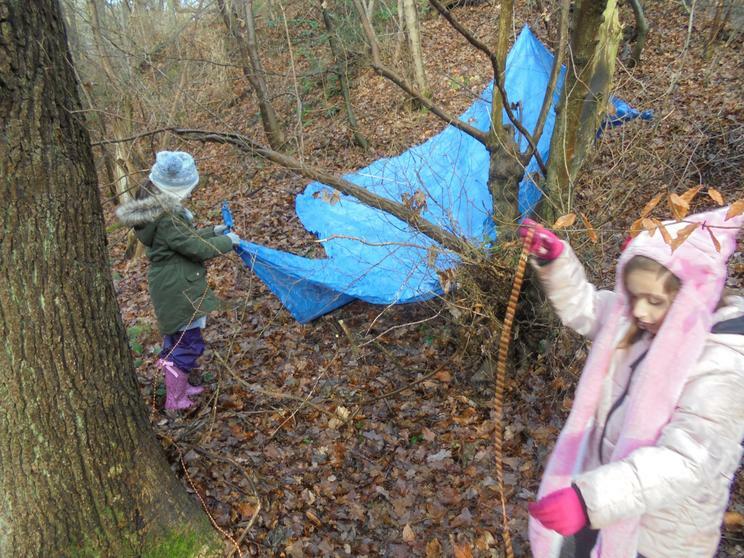 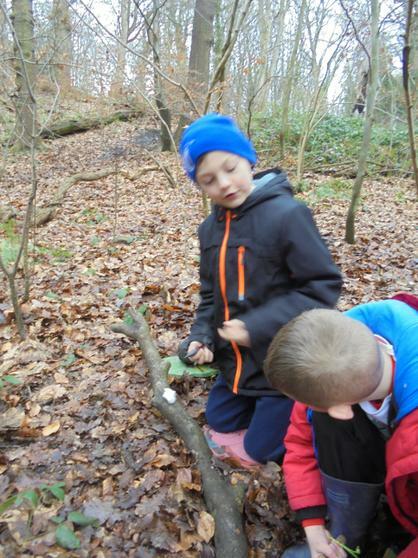 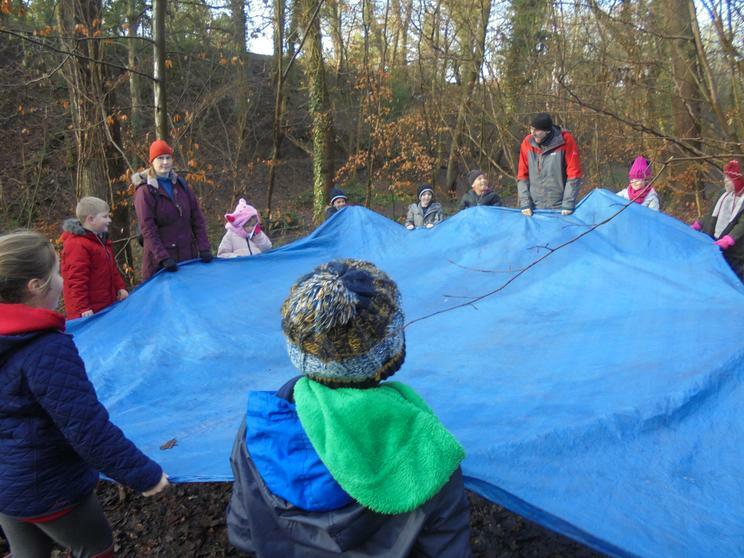 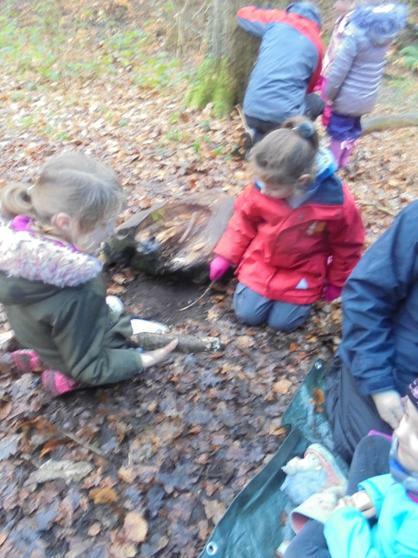 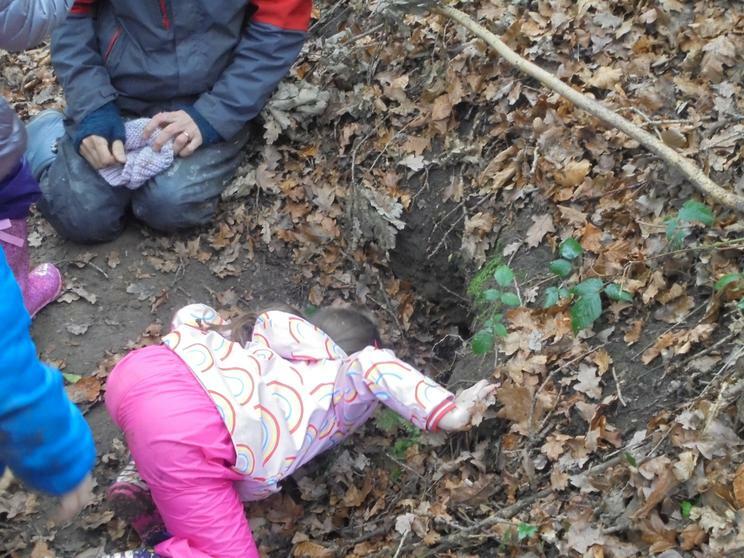 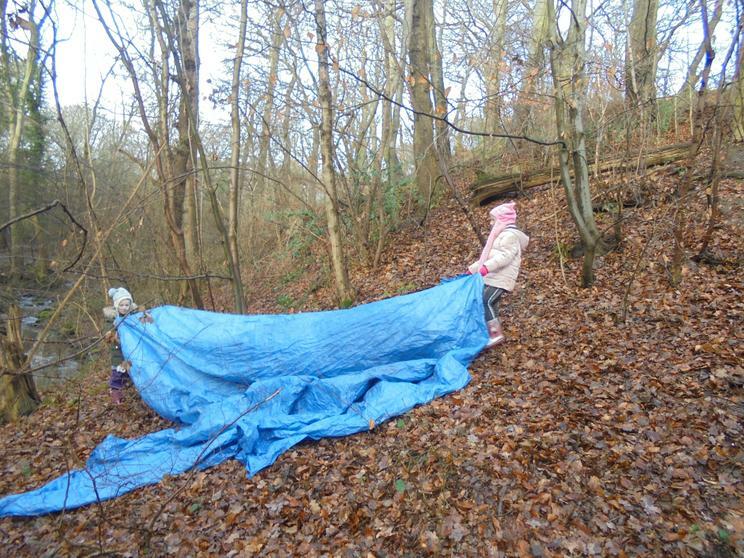 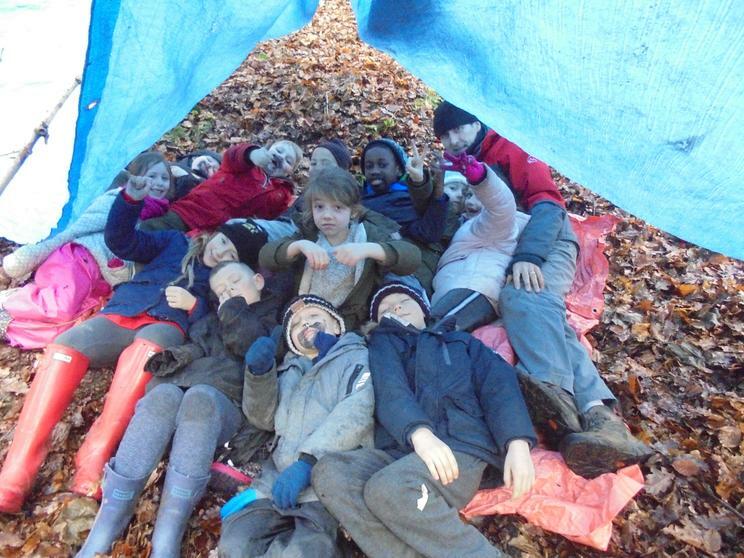 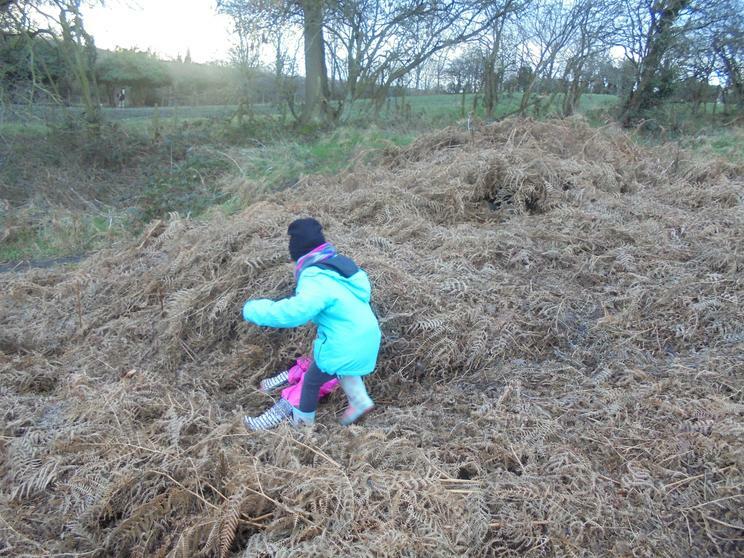 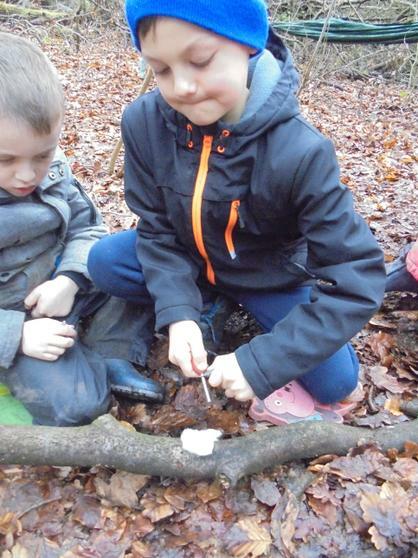 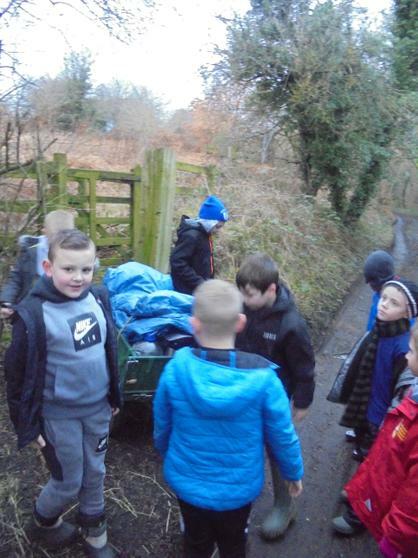 We then made dens for the different animals that you could find in the dene. 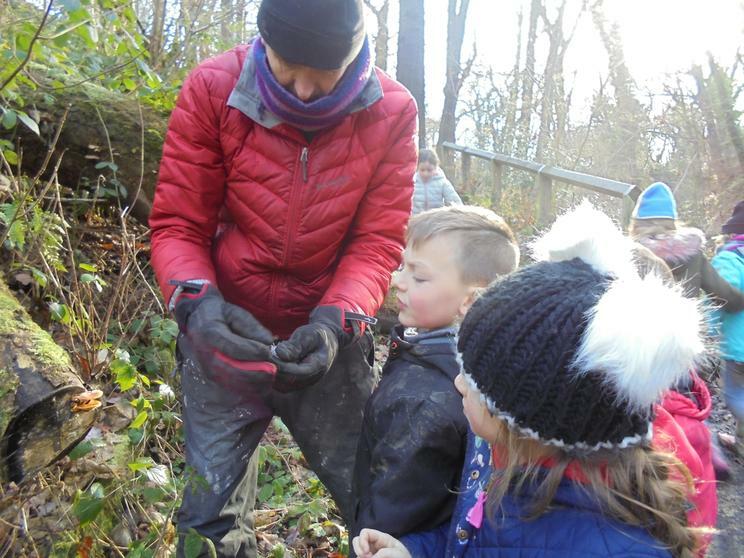 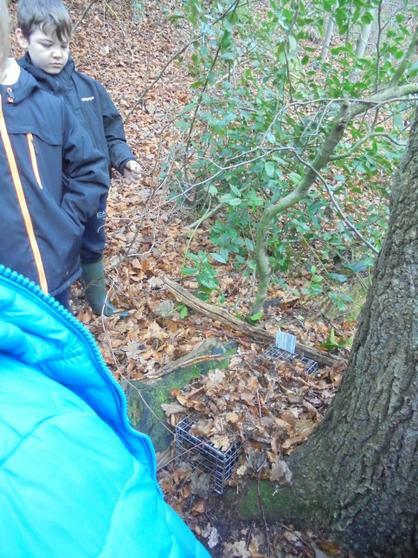 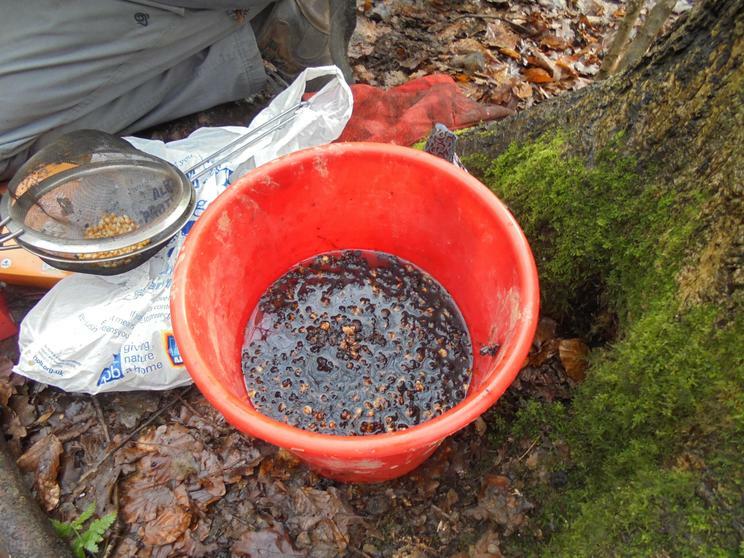 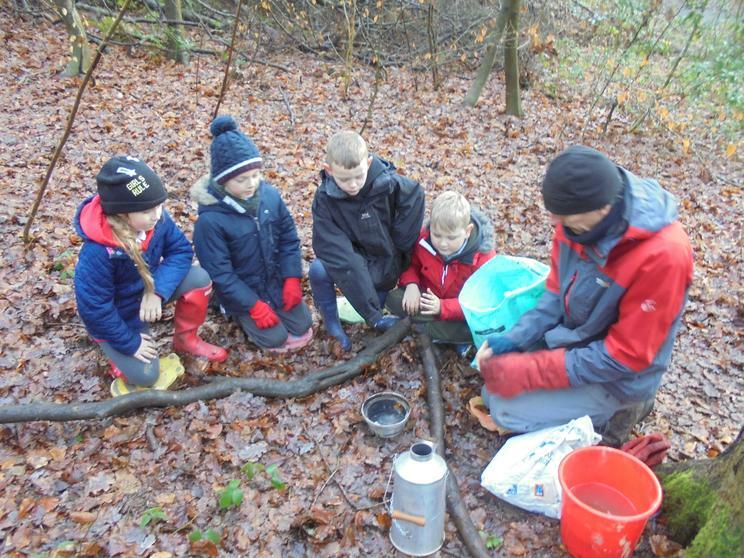 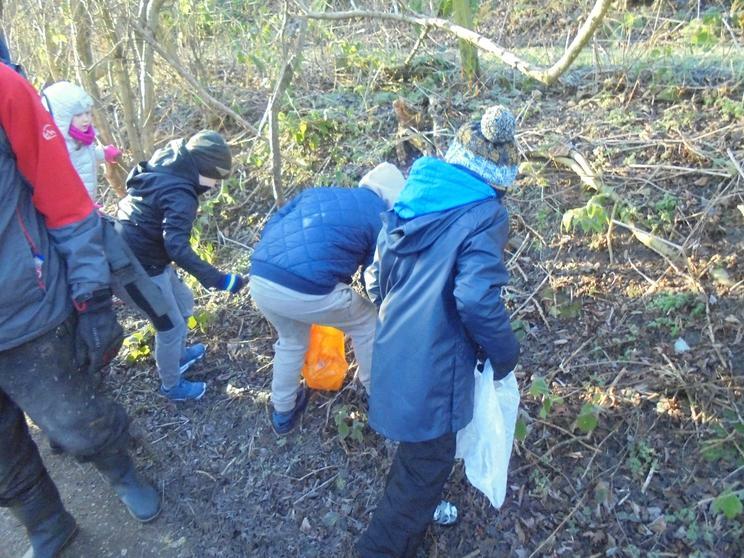 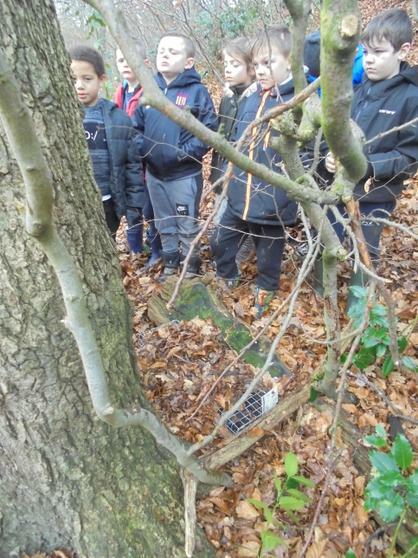 After a hot drink we explored and found a squirrel trap that will help to see if there are any red squirrels left in Newburn. 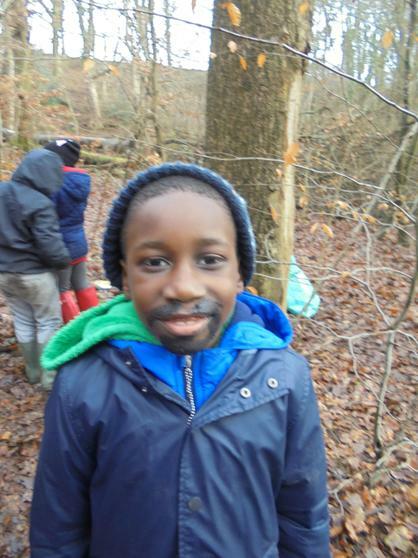 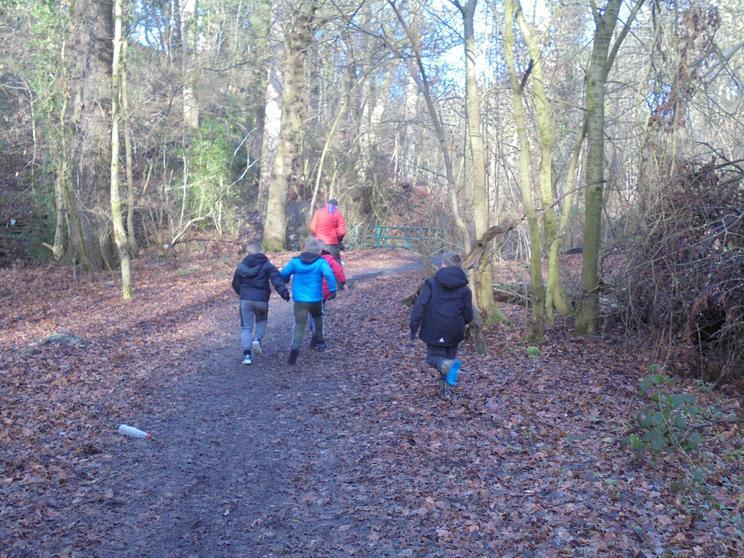 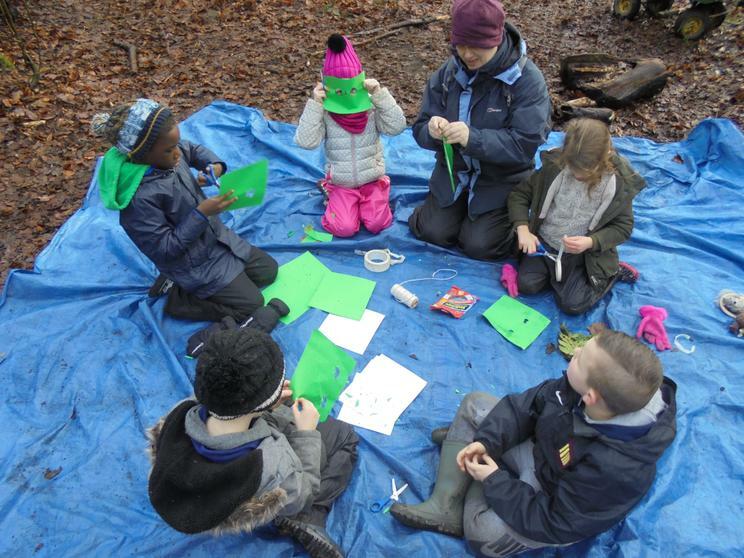 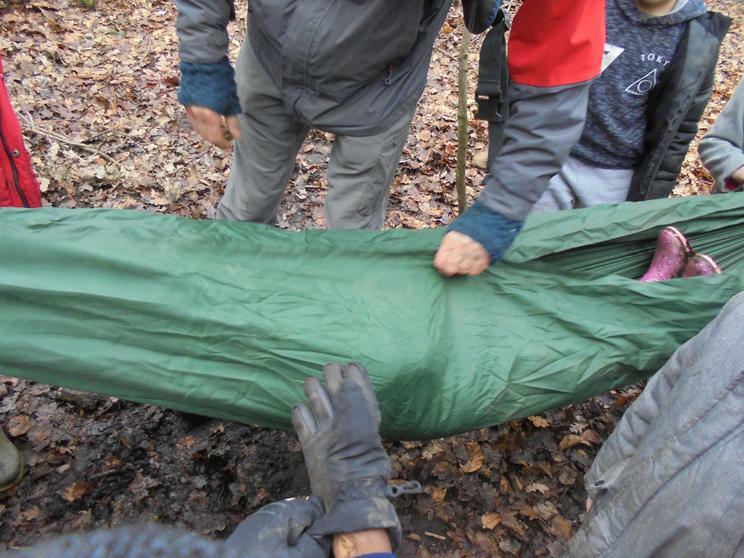 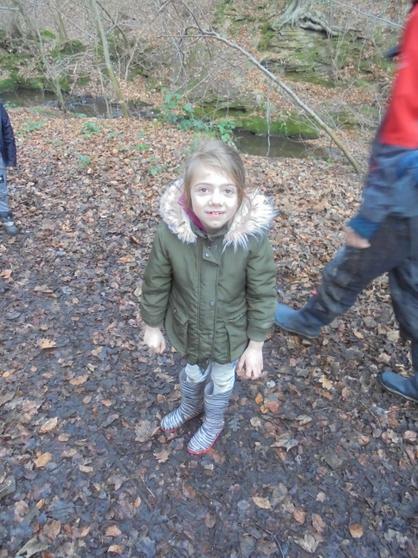 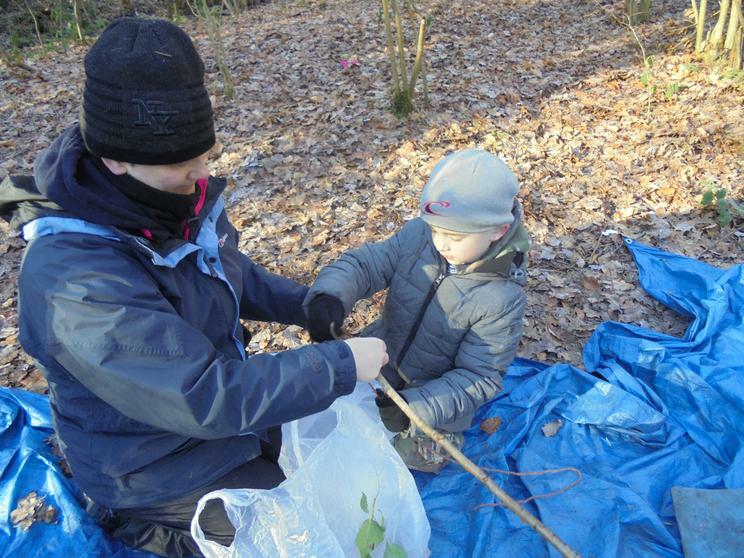 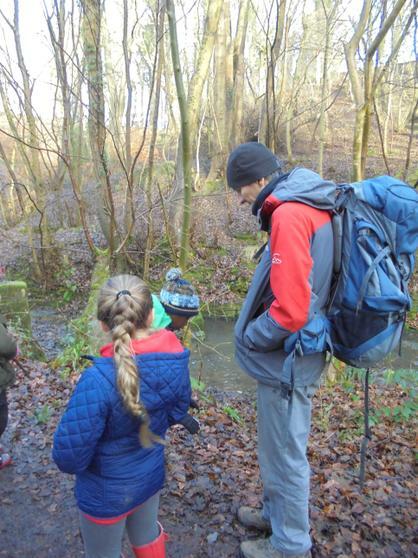 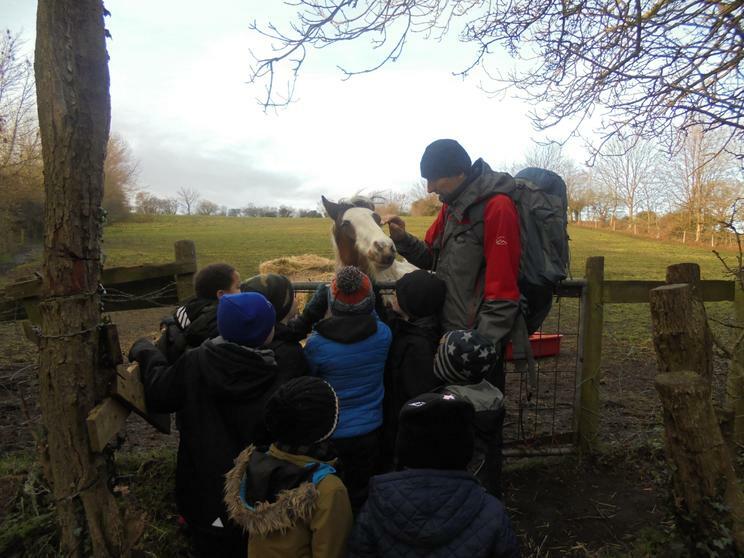 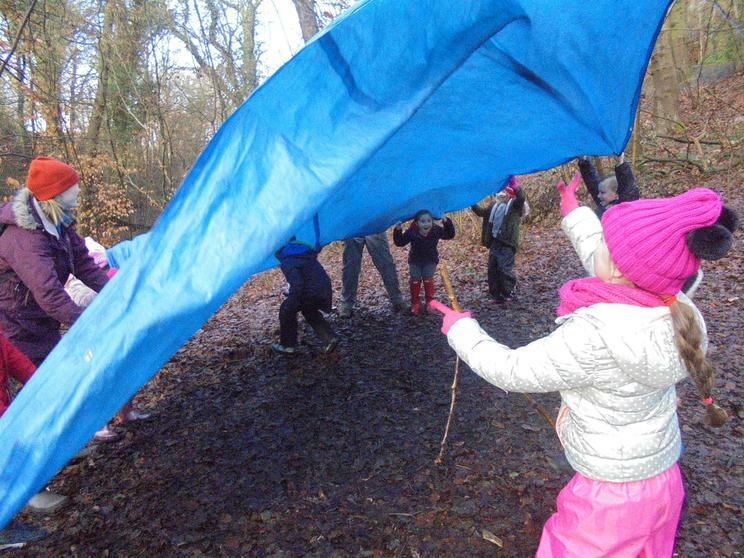 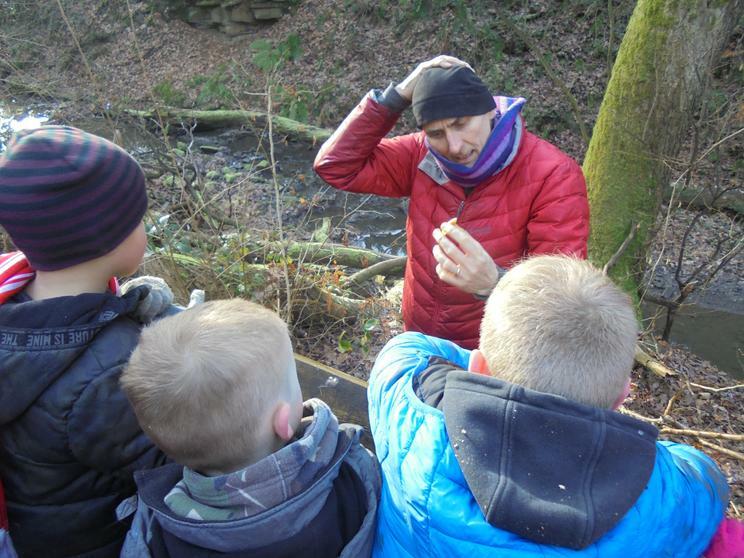 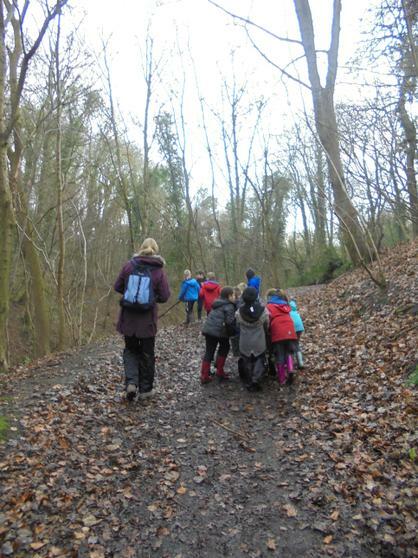 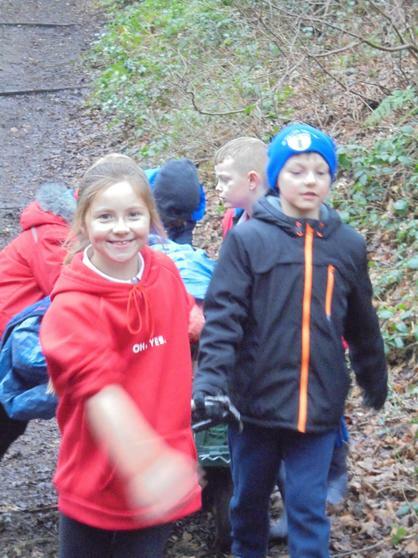 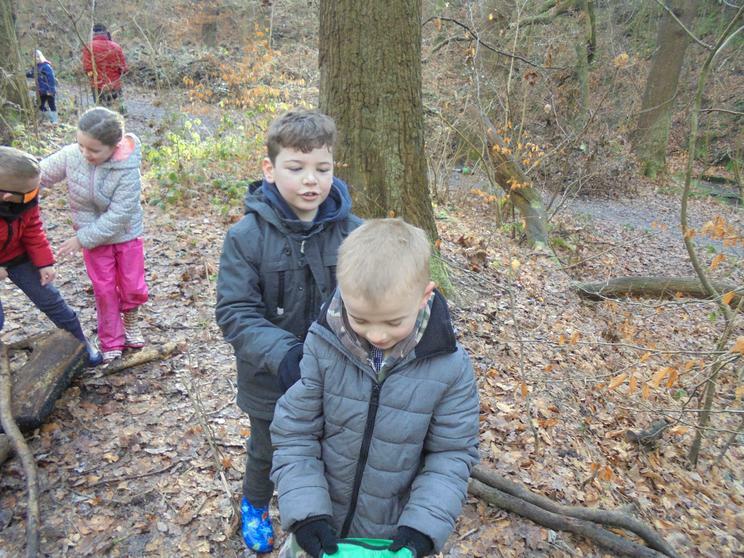 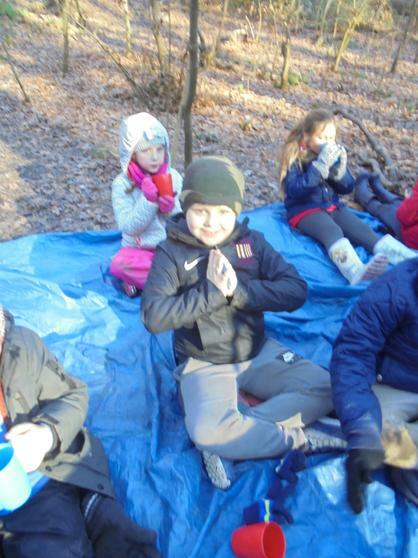 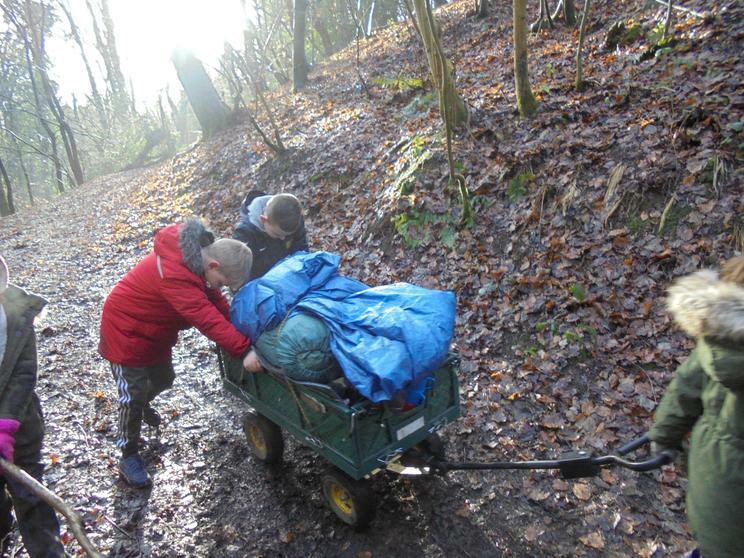 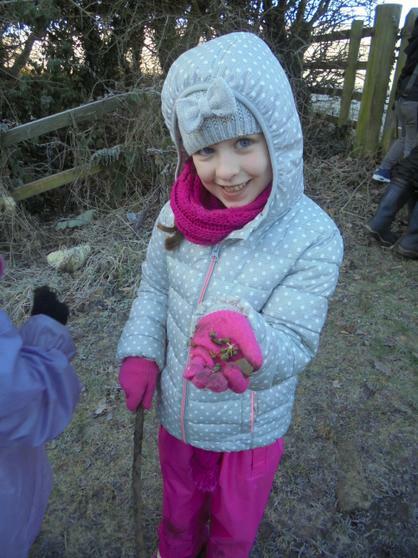 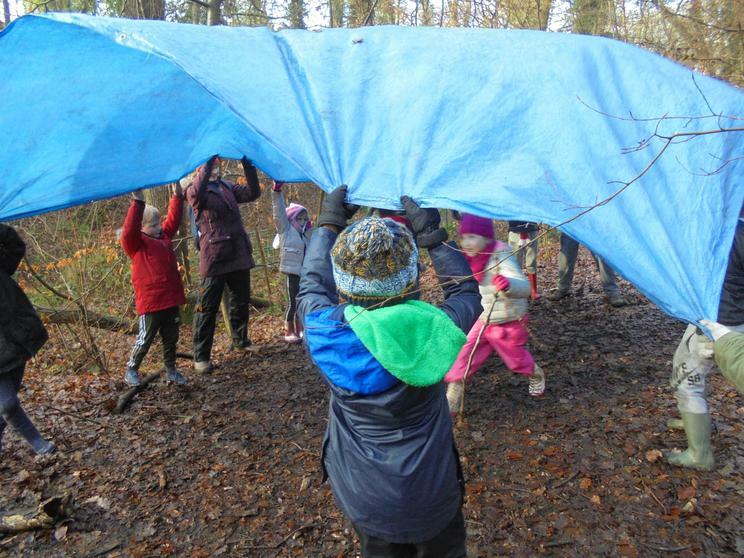 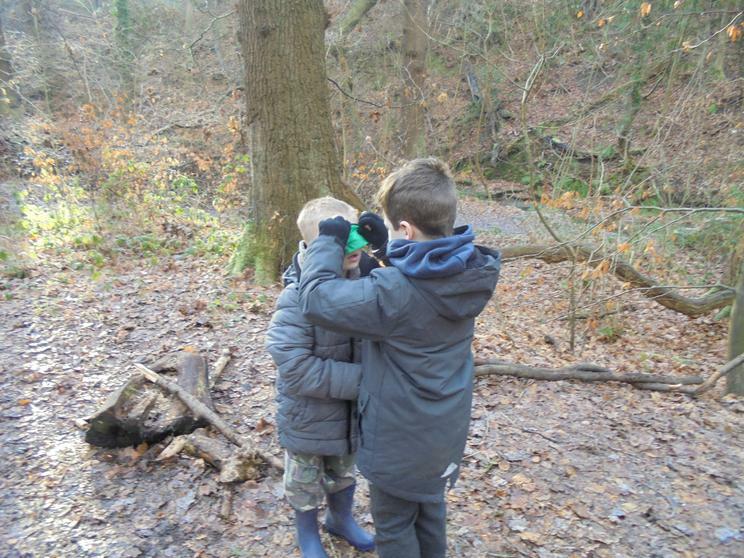 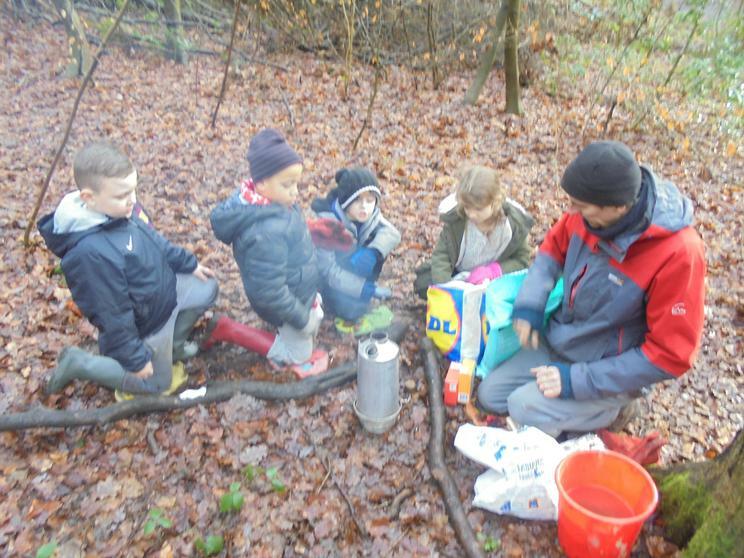 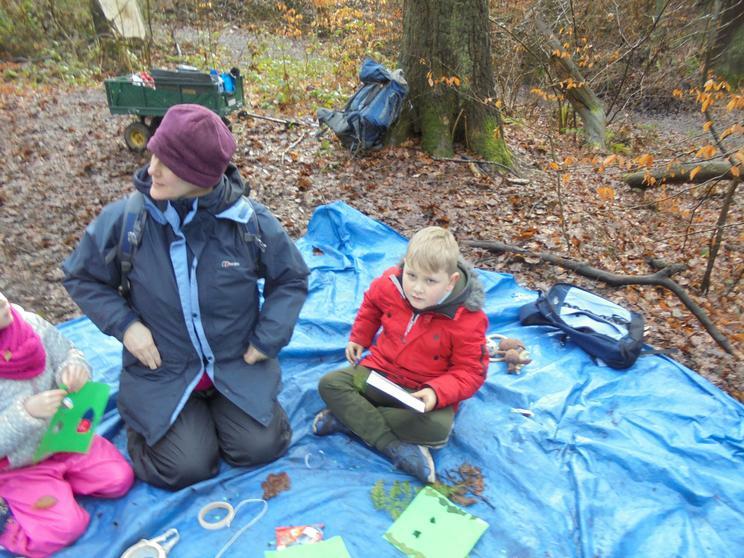 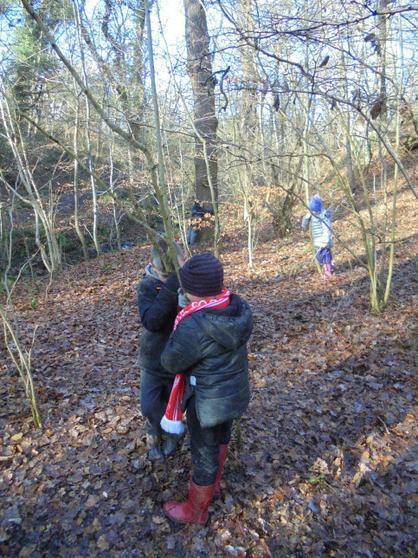 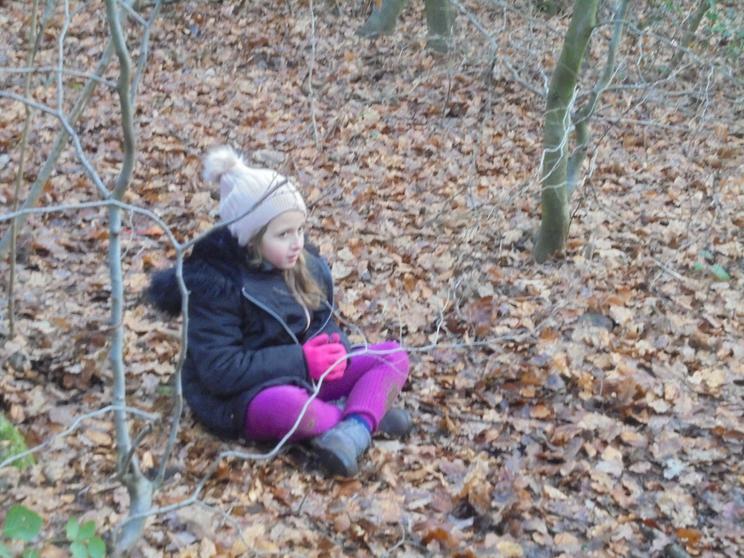 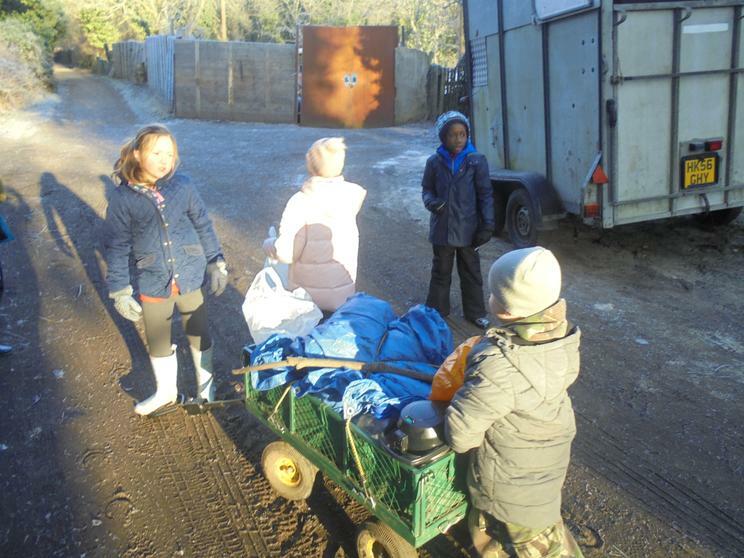 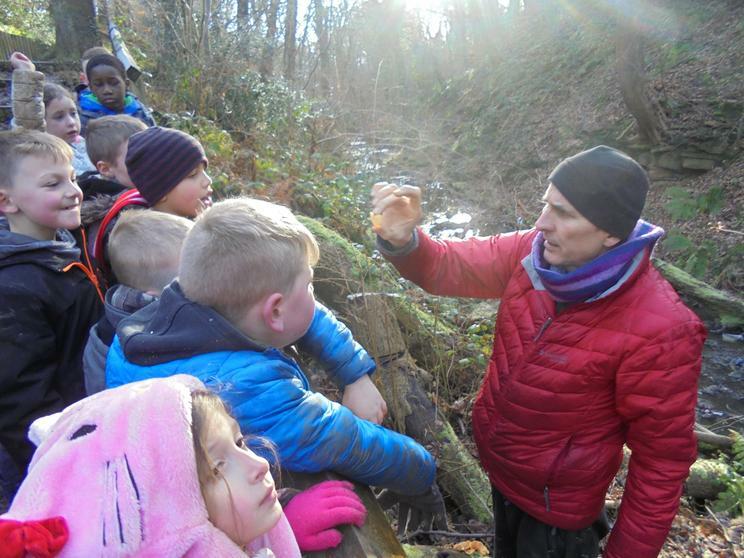 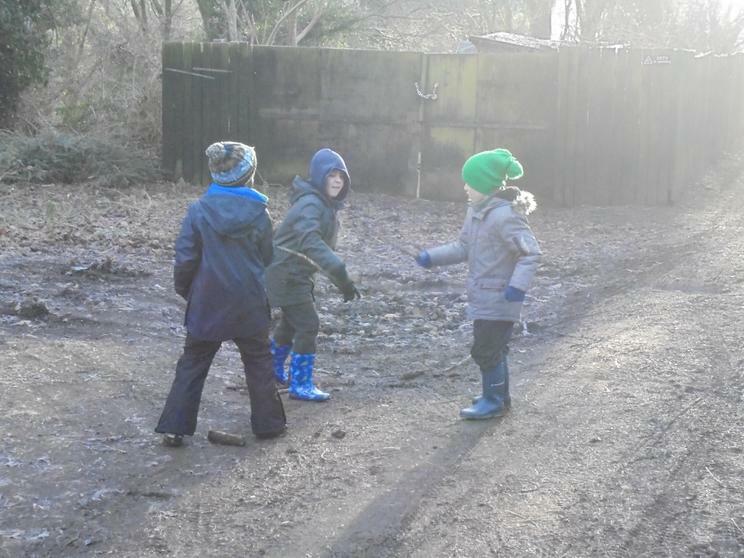 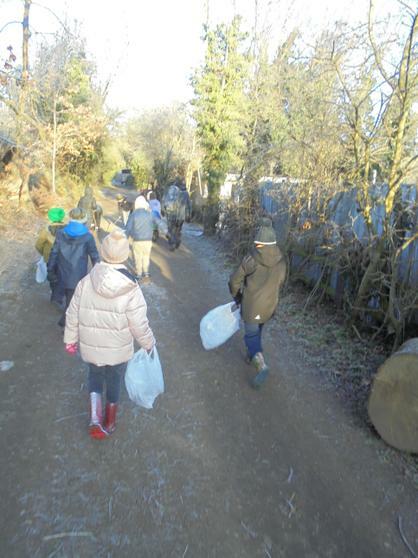 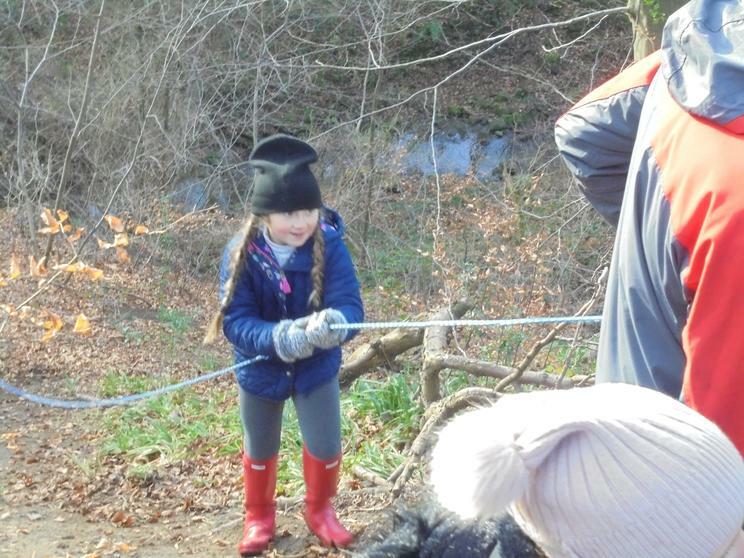 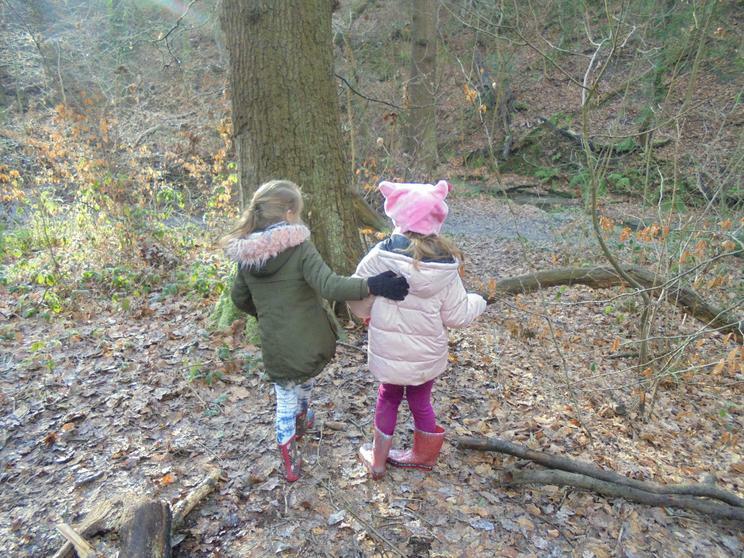 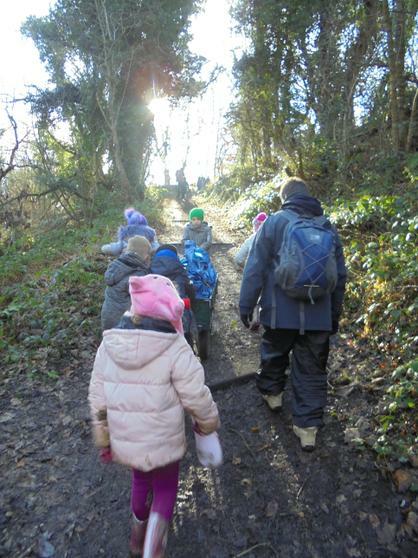 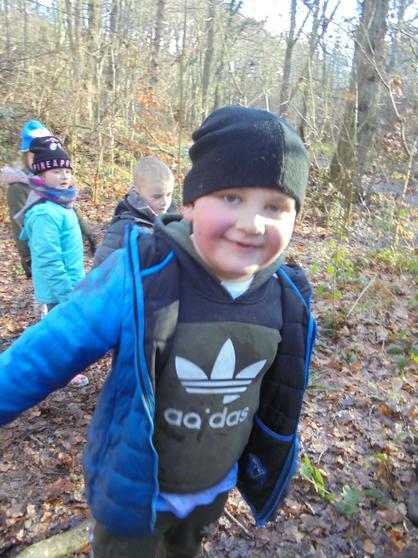 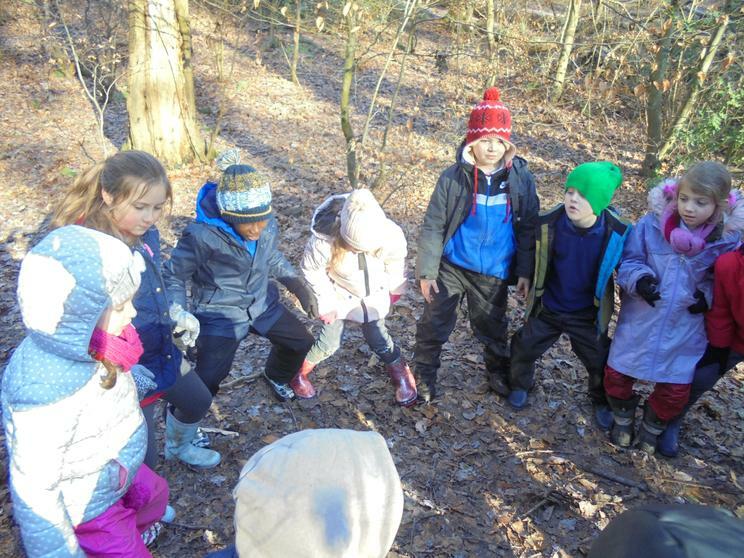 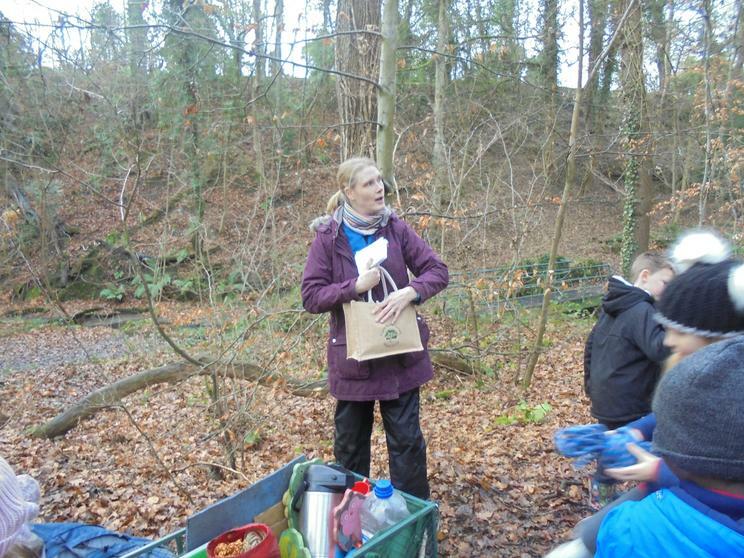 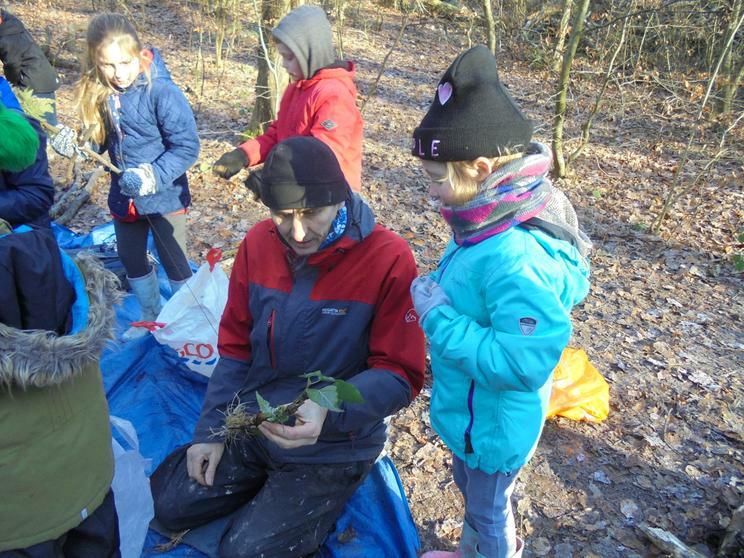 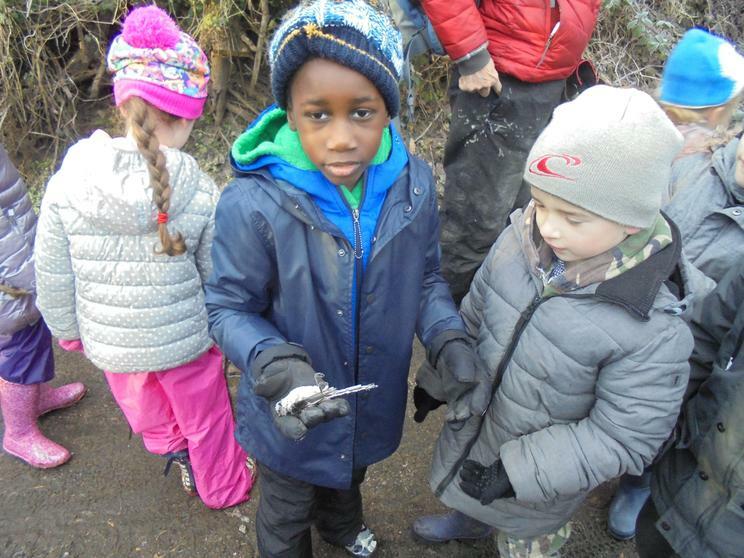 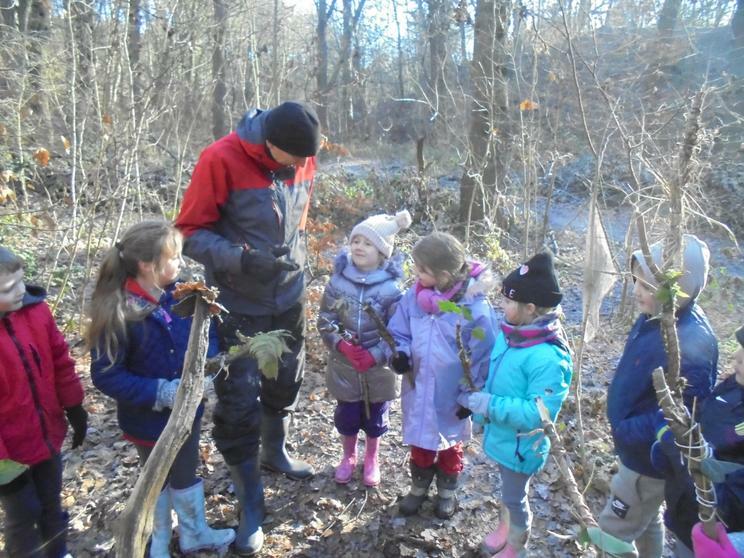 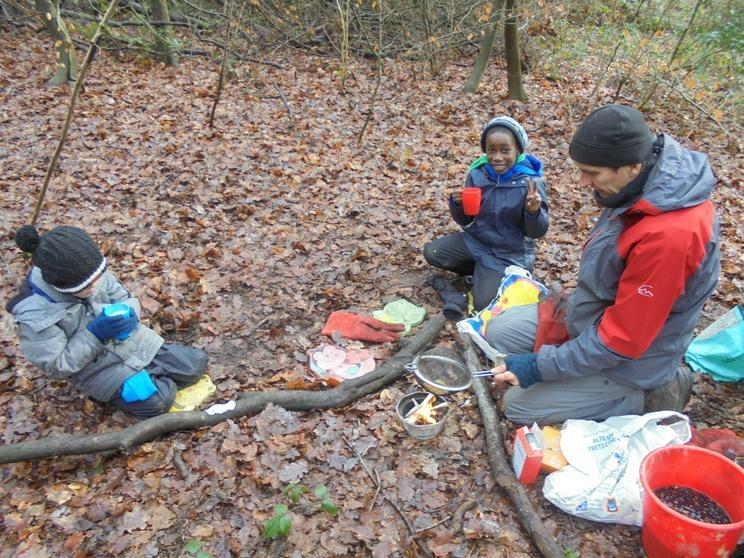 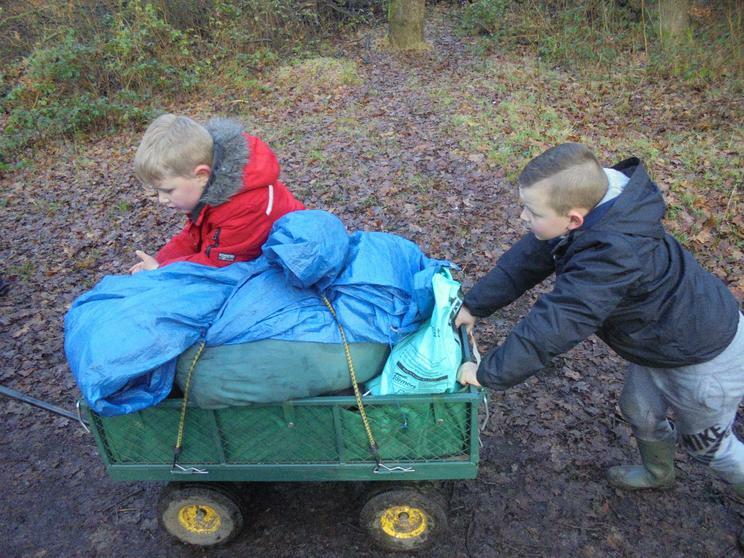 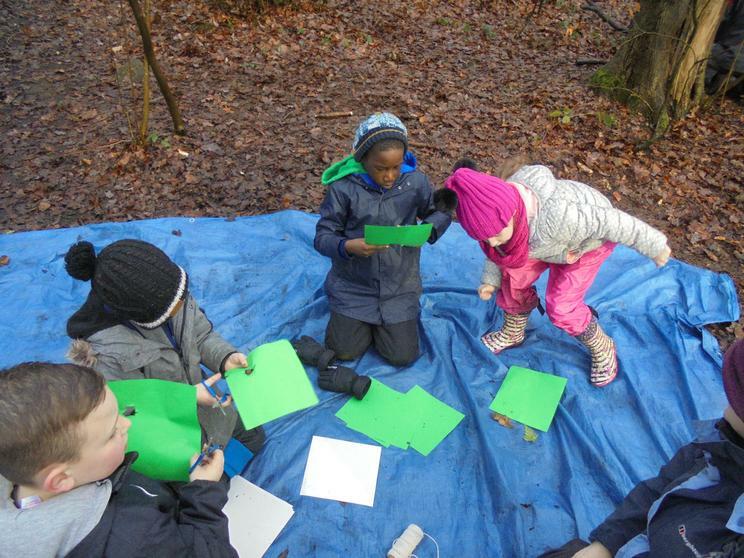 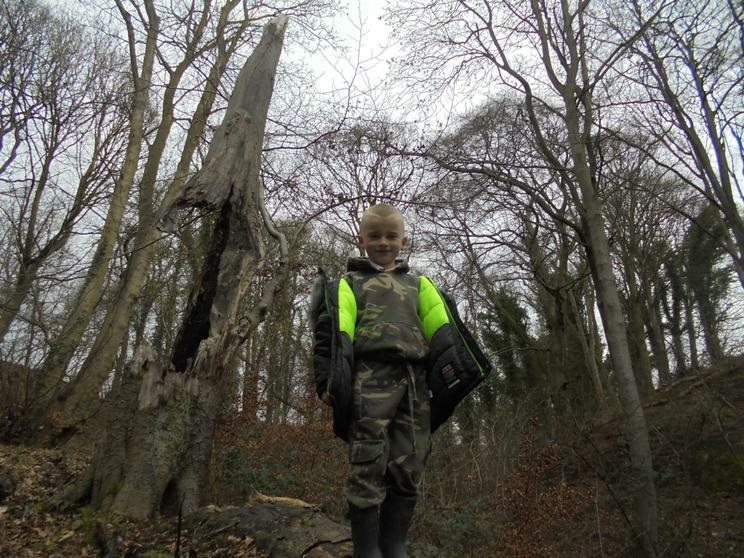 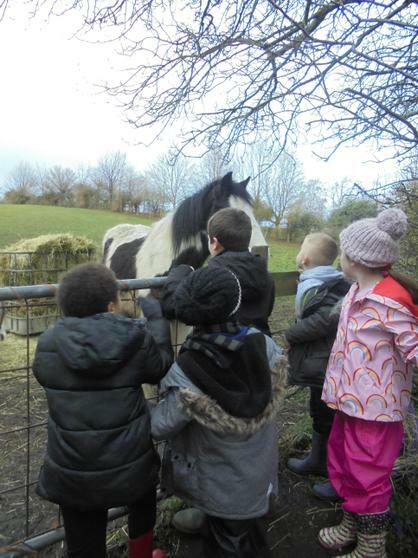 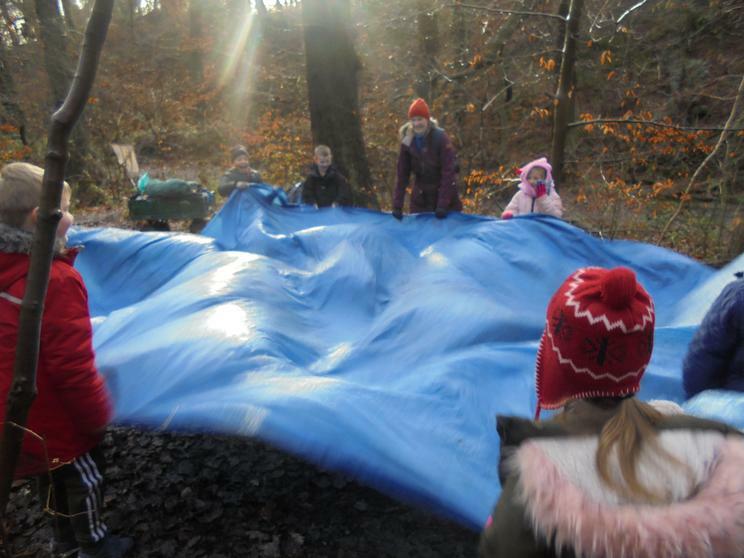 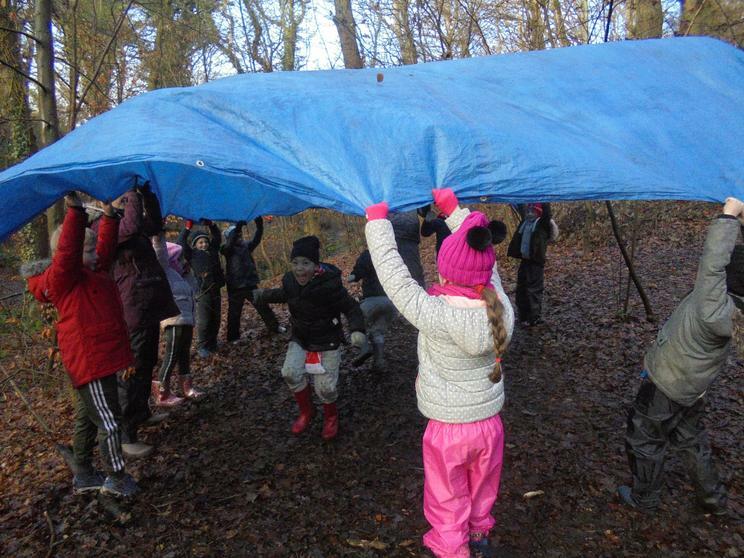 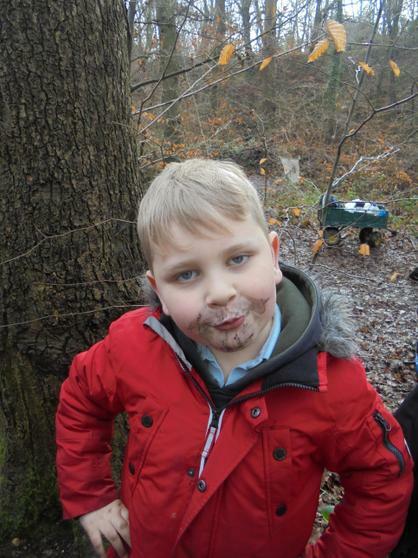 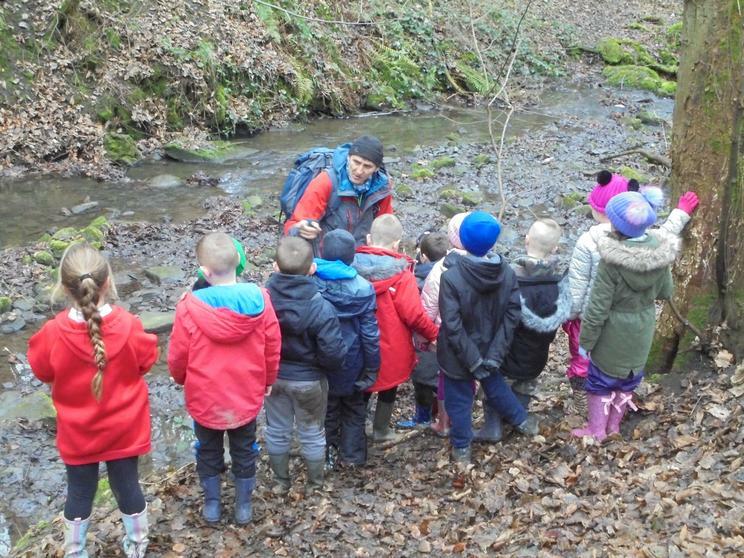 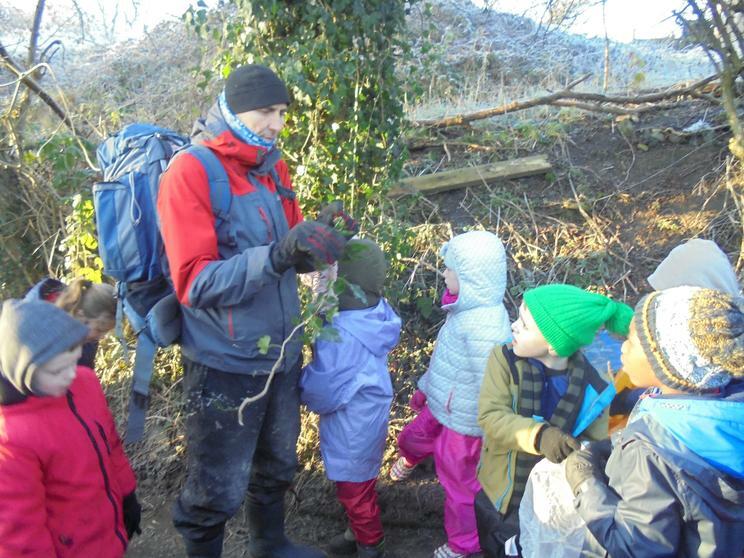 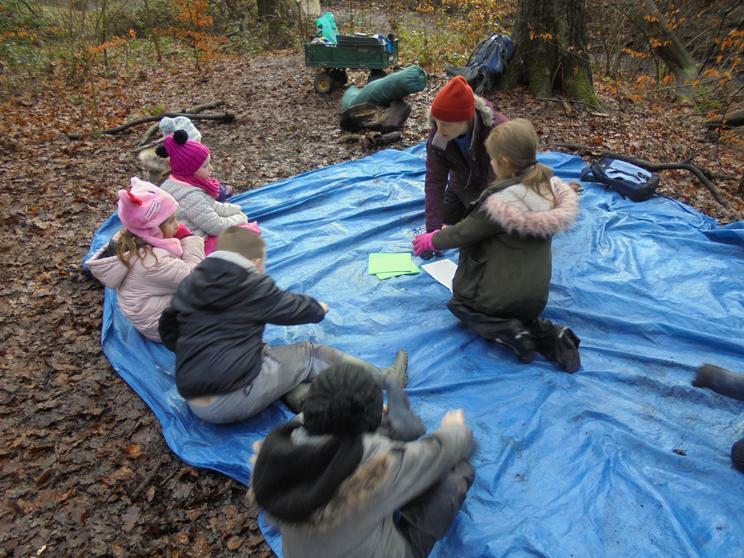 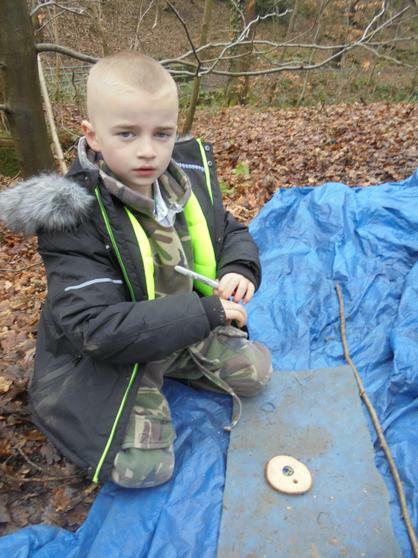 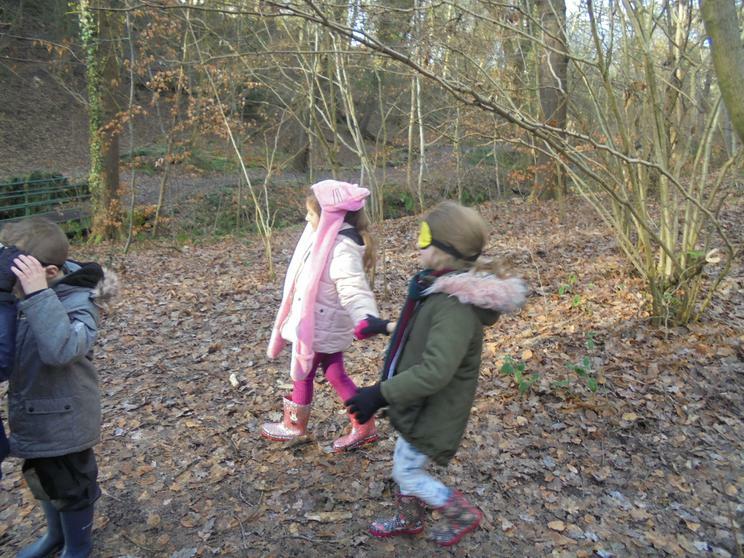 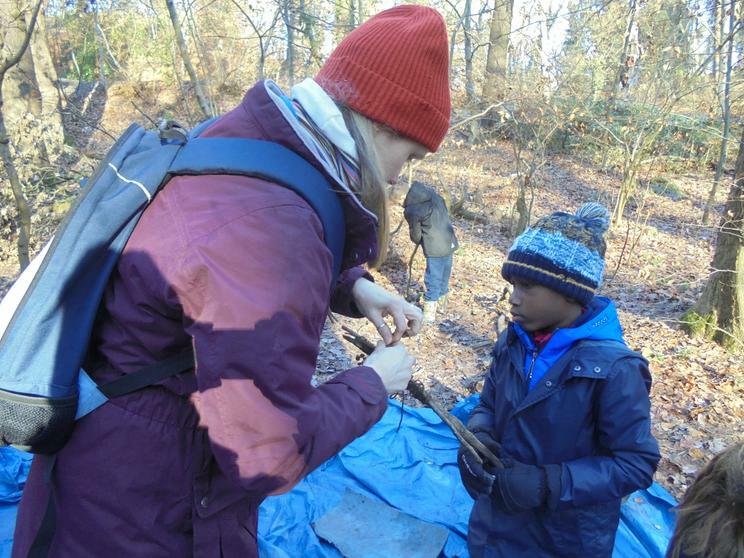 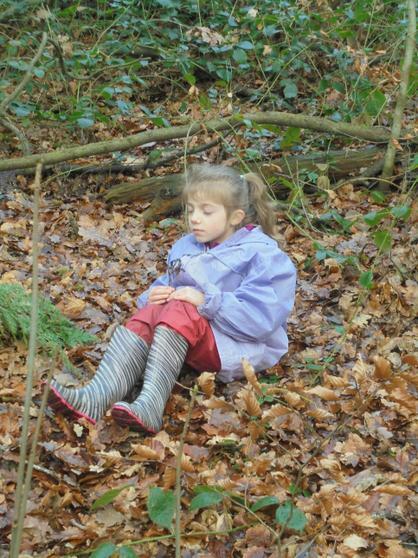 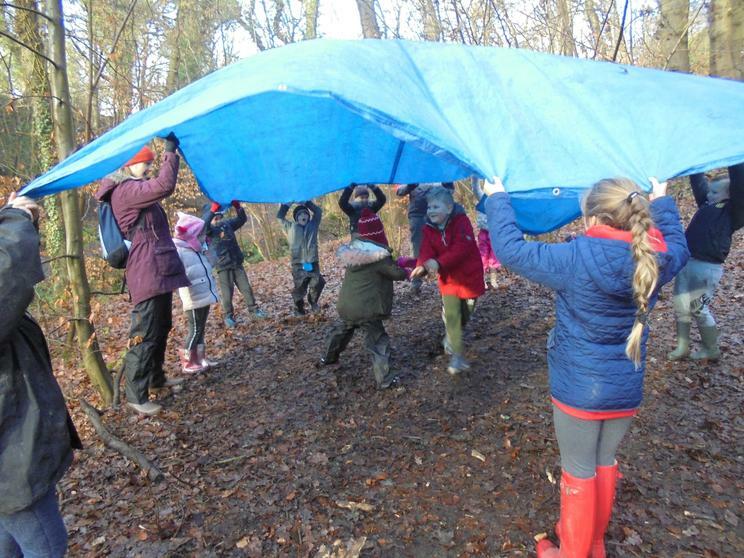 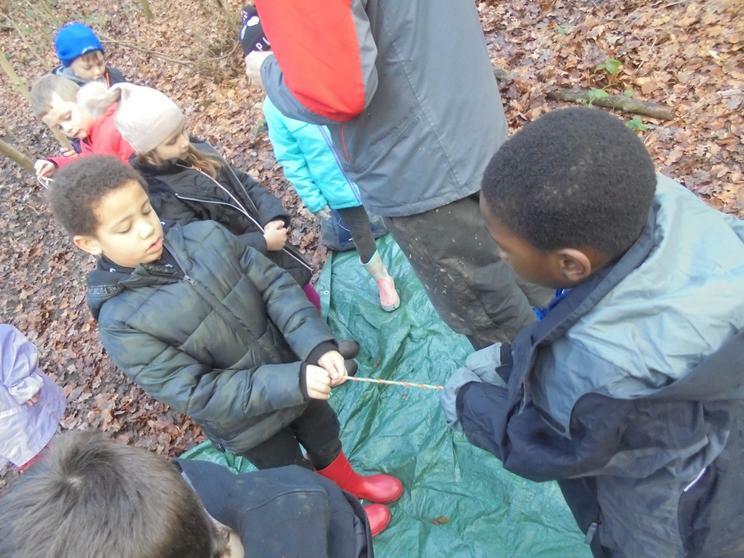 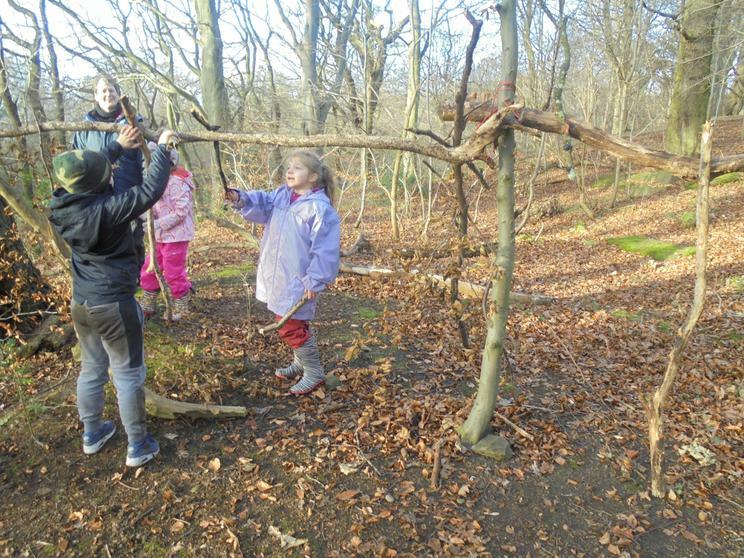 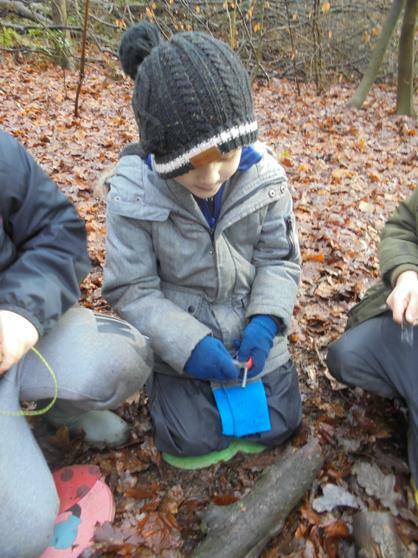 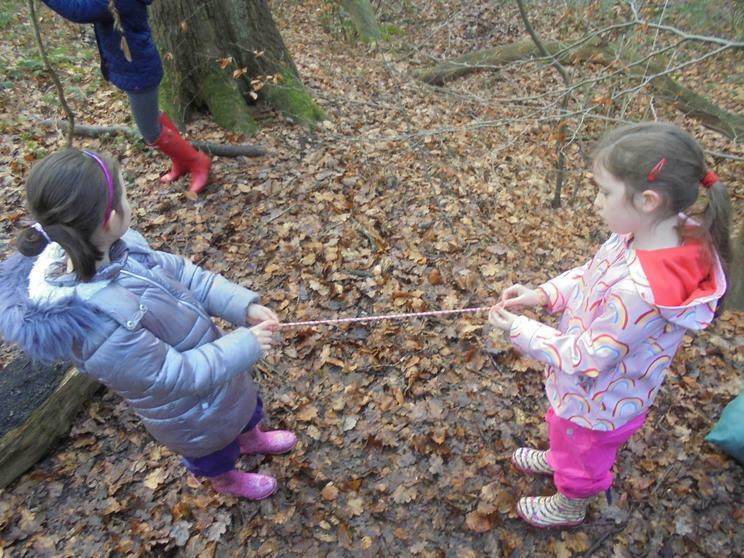 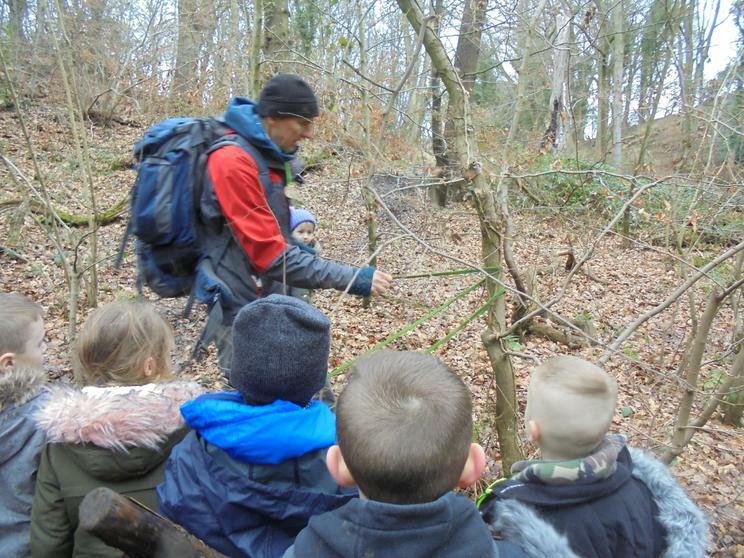 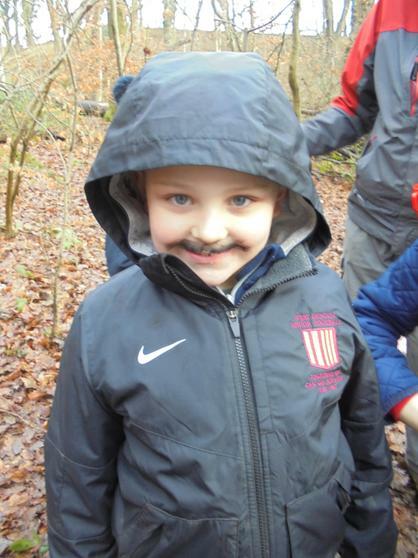 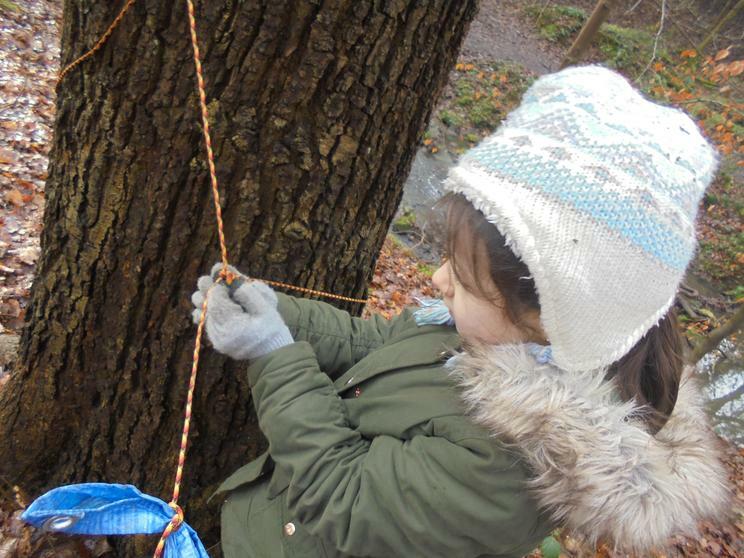 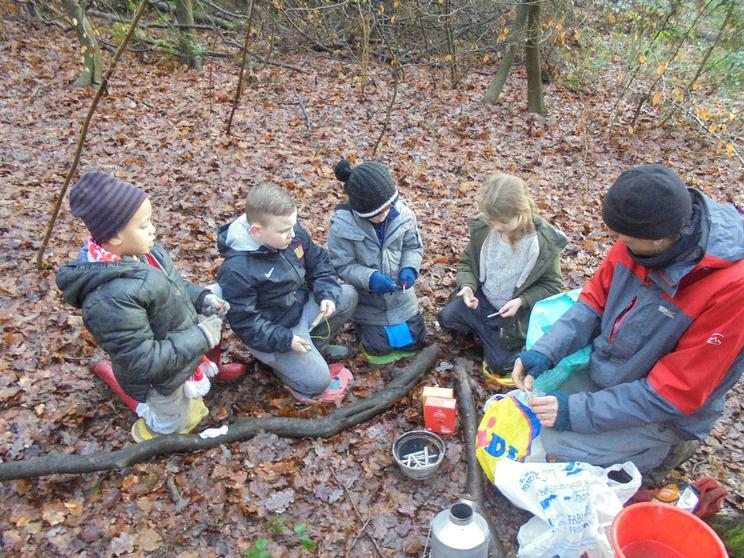 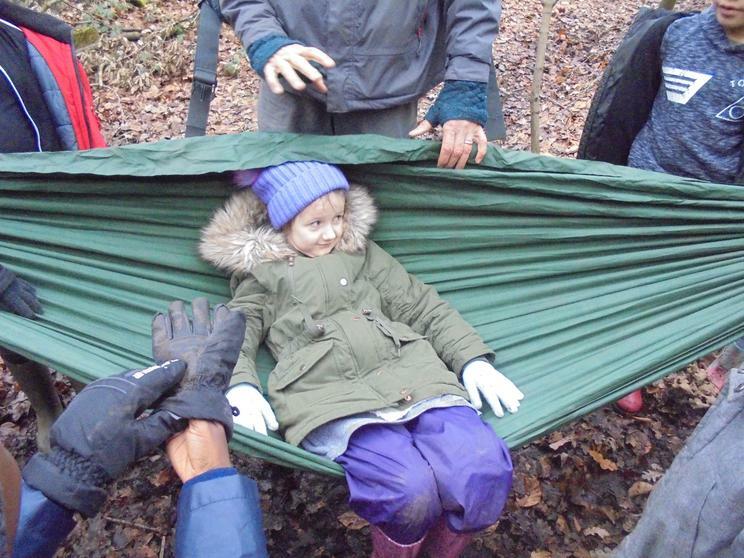 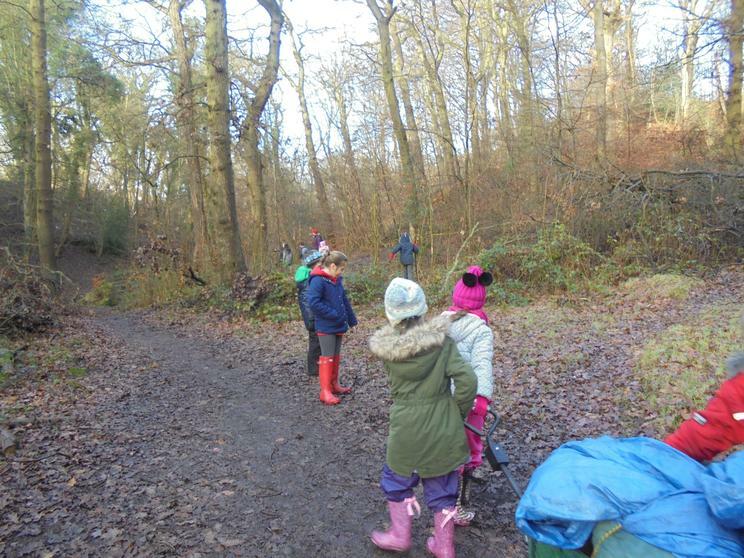 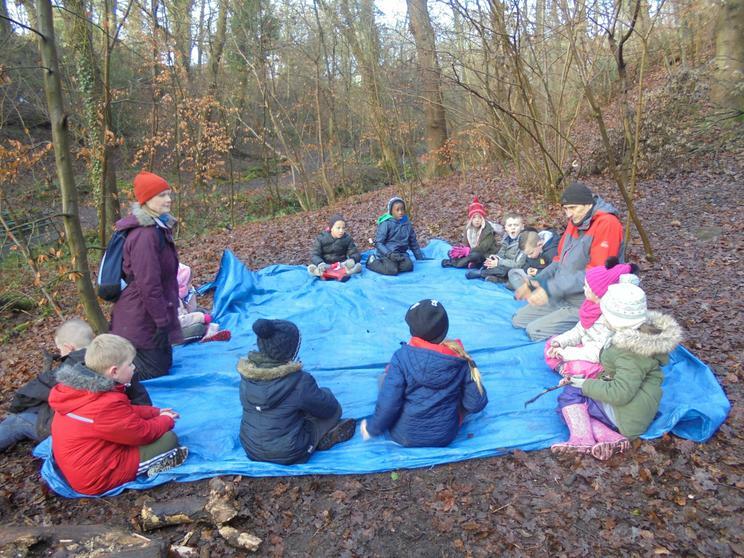 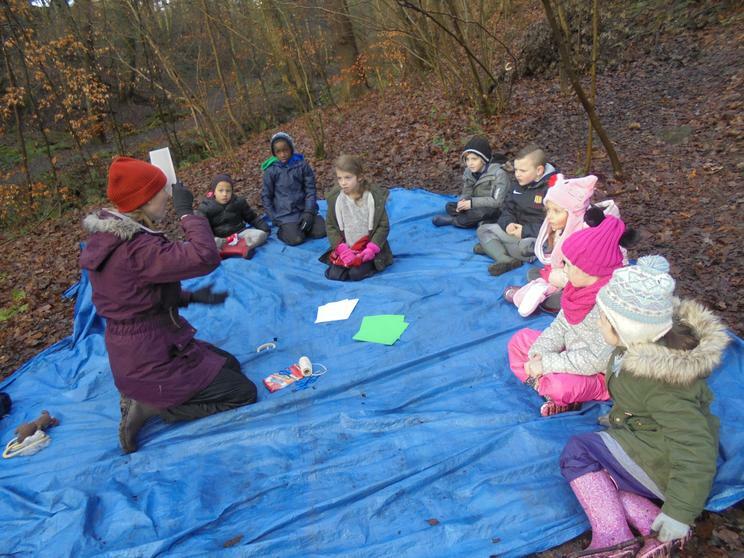 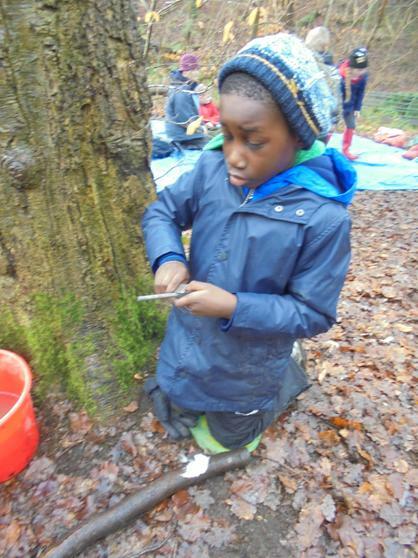 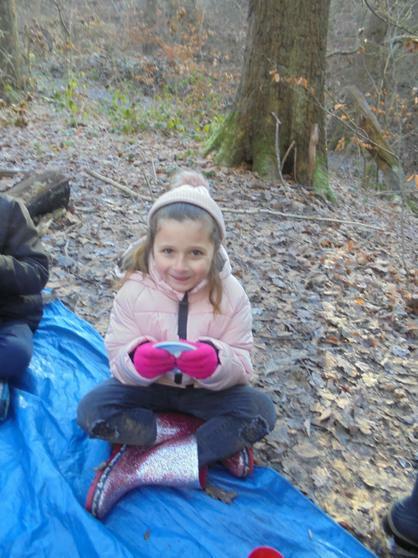 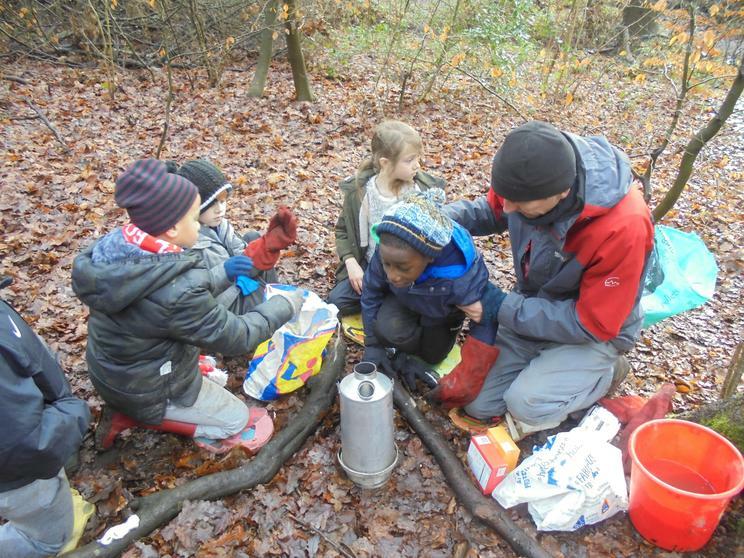 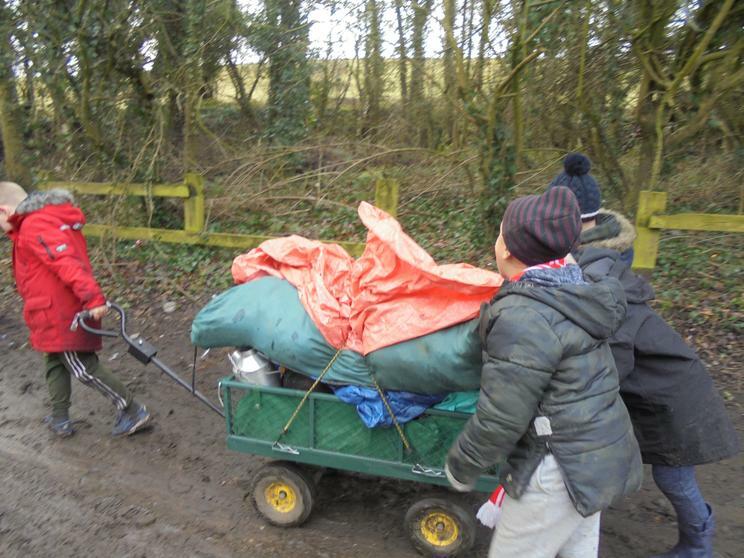 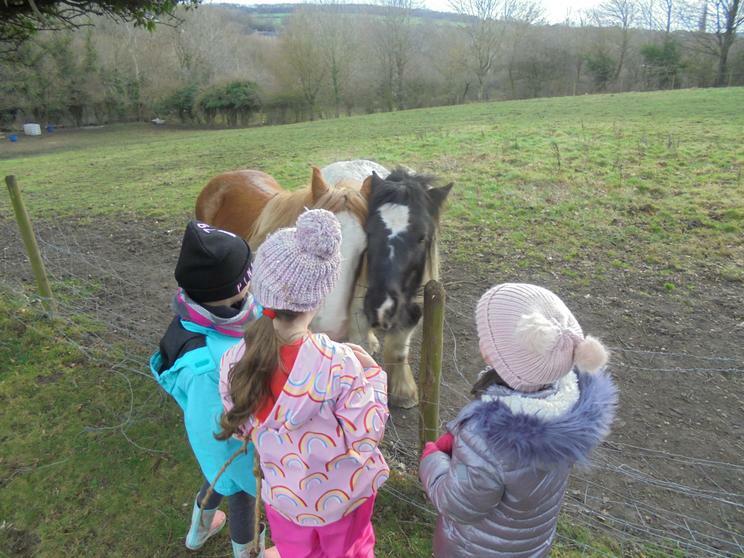 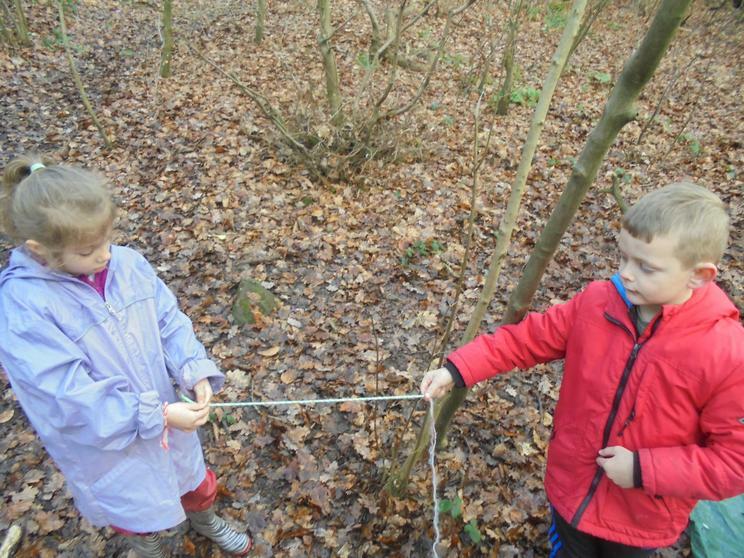 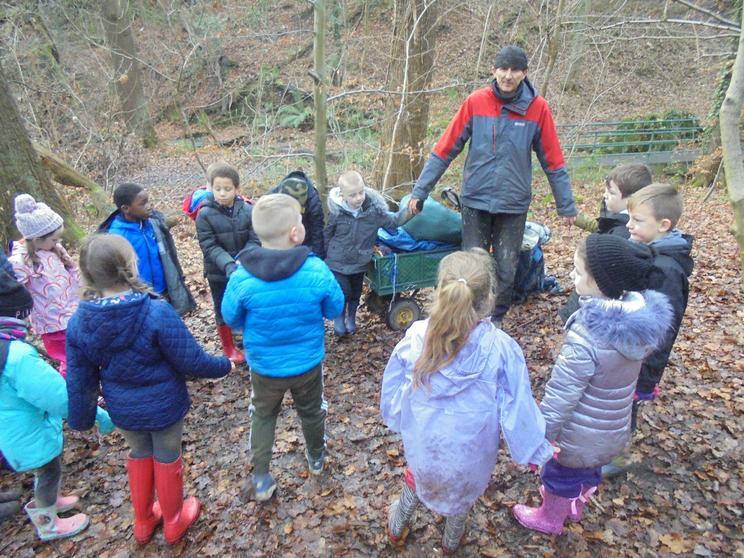 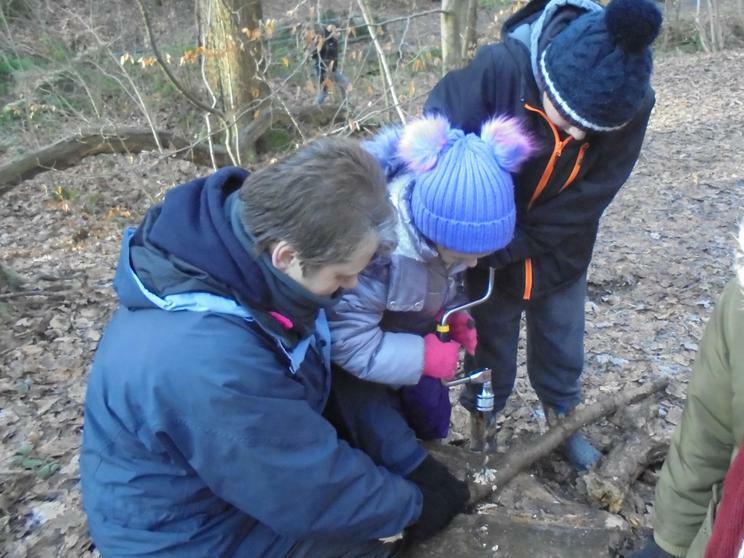 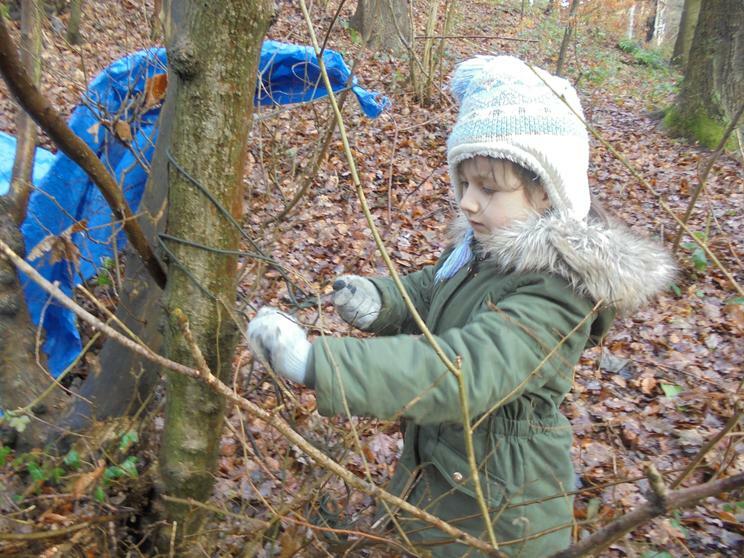 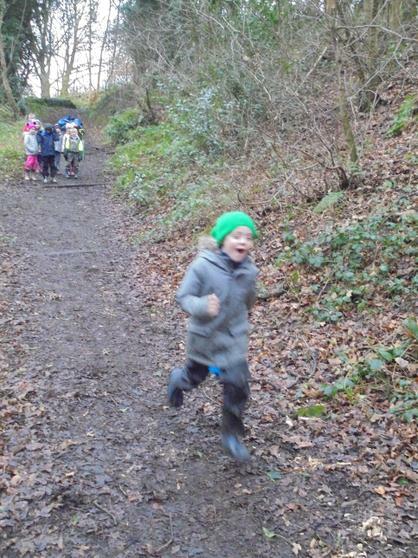 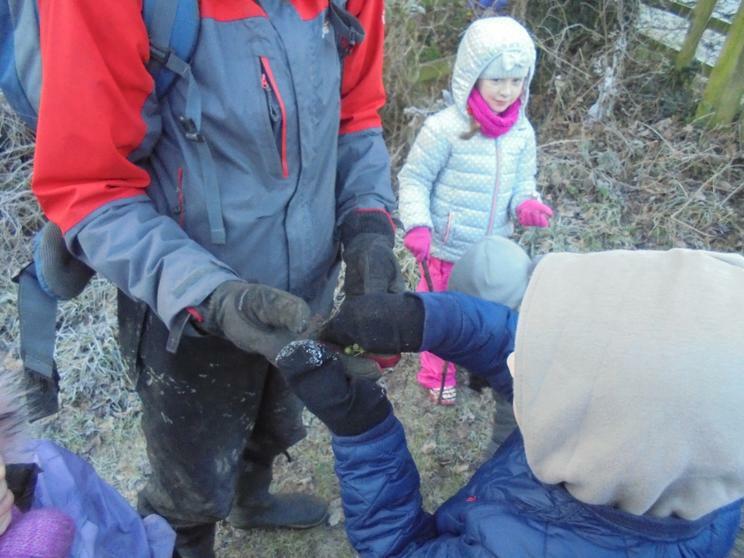 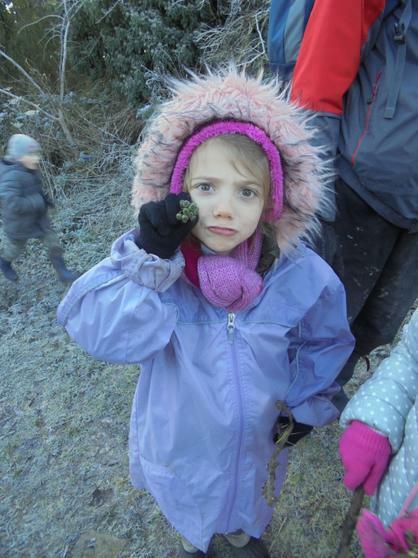 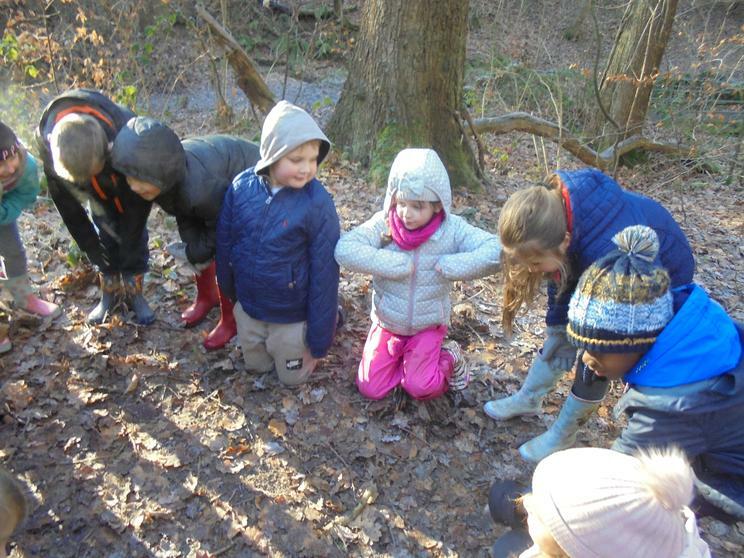 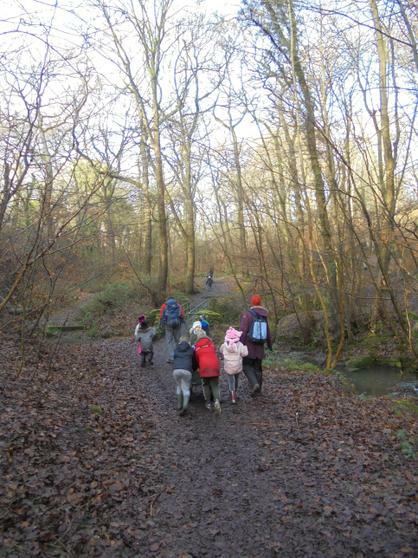 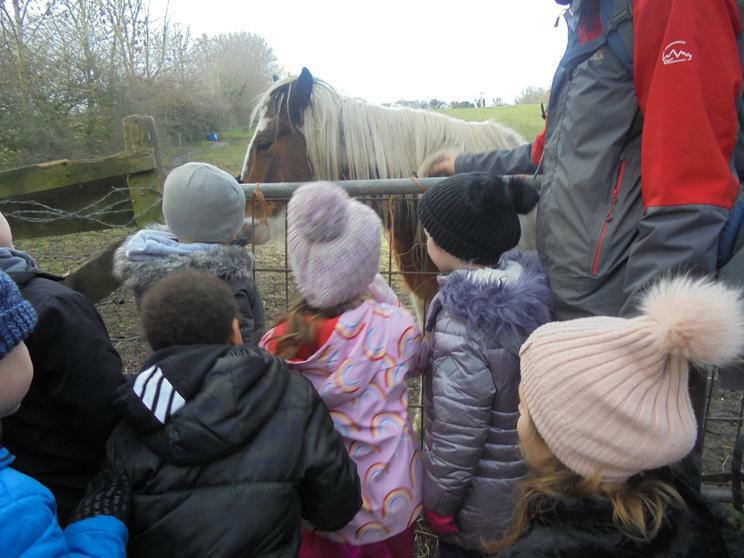 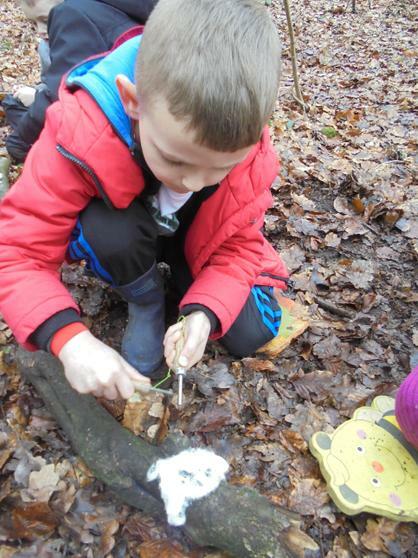 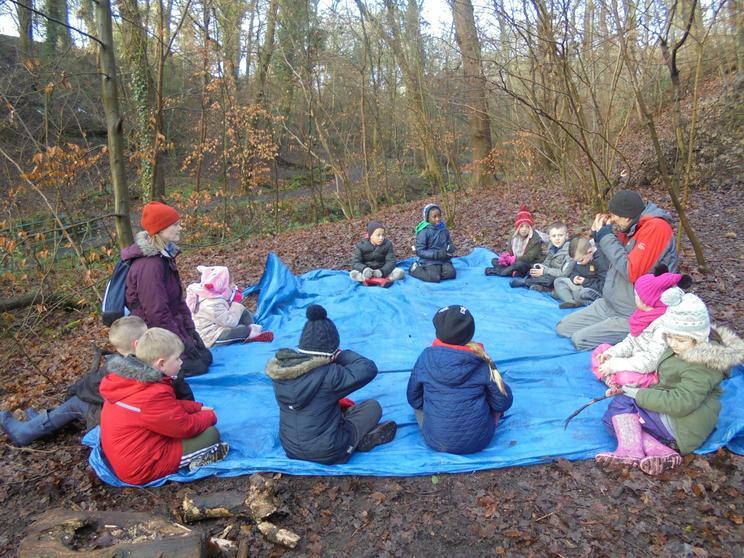 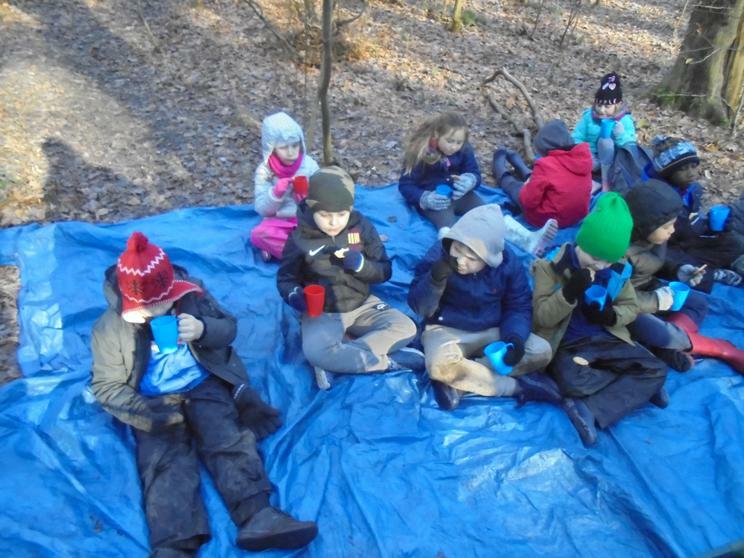 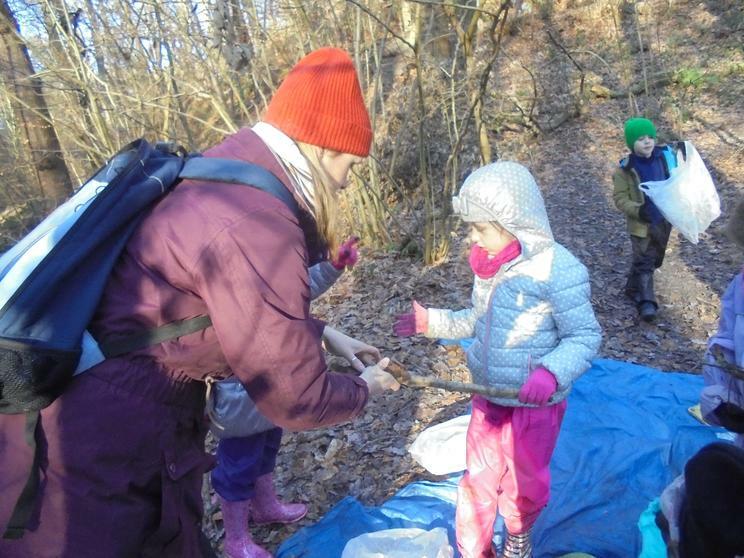 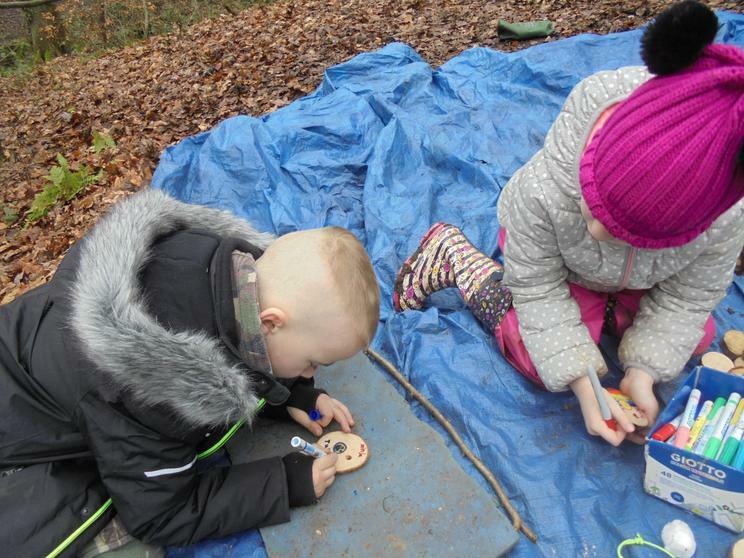 It was the first time out to Forest School for the children and they all managed very well. 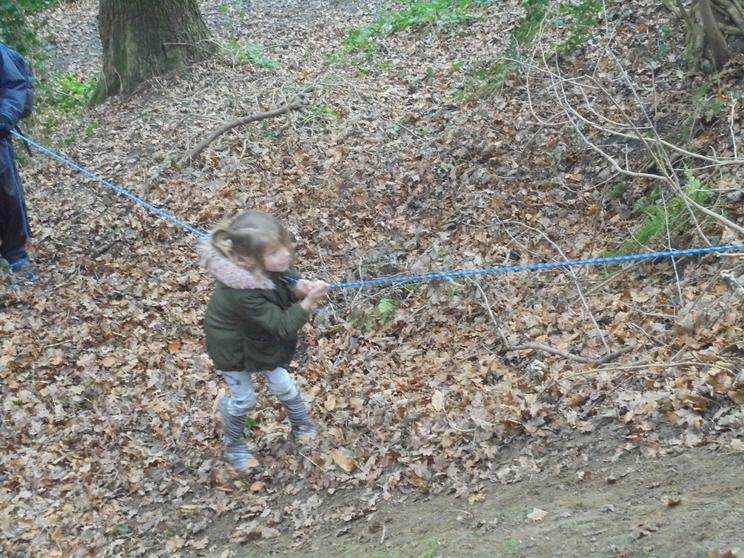 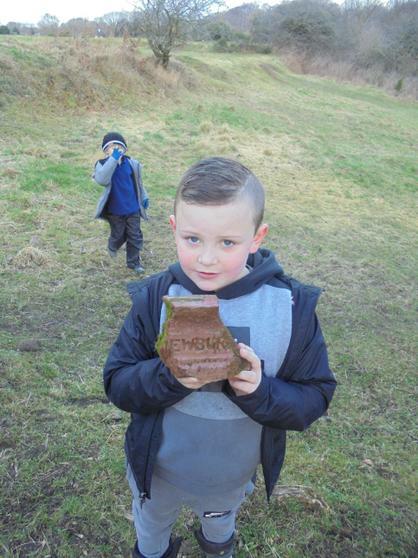 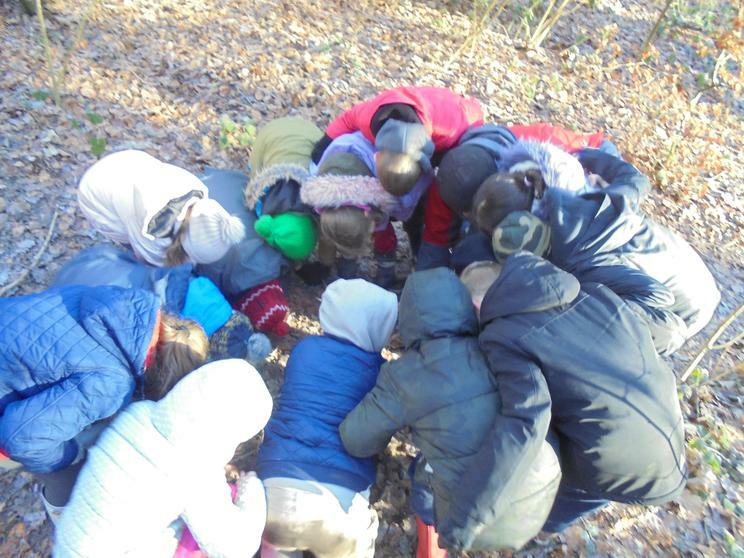 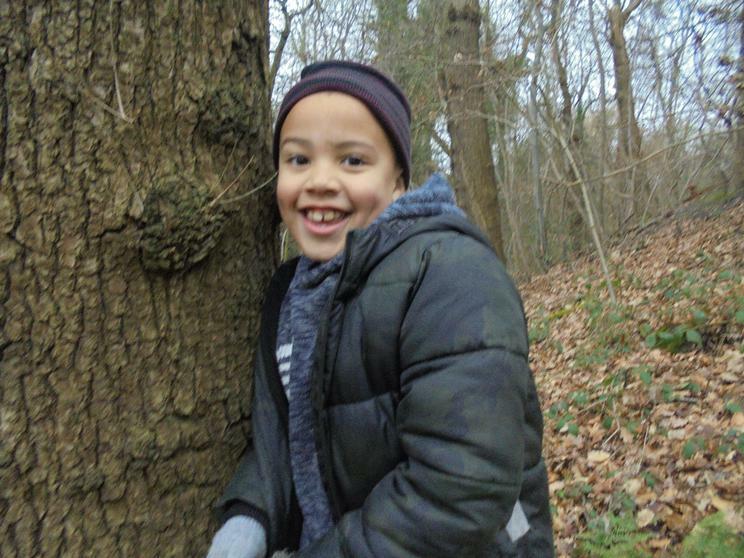 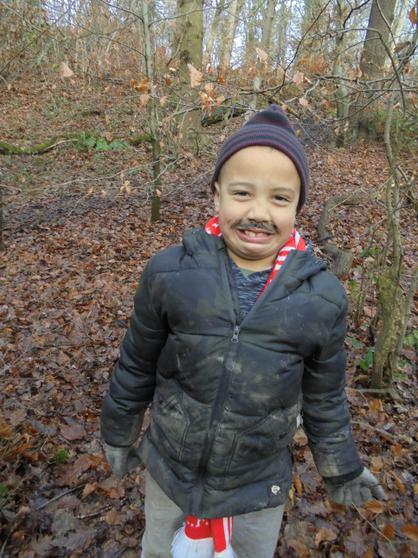 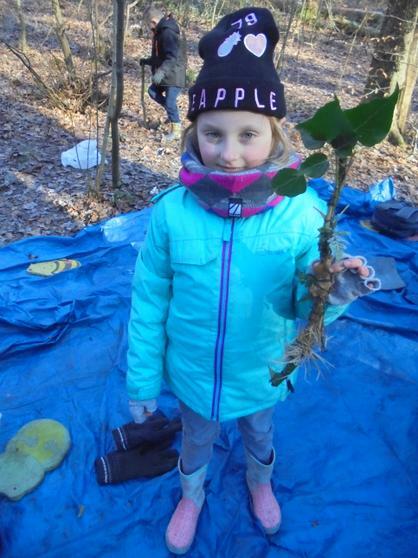 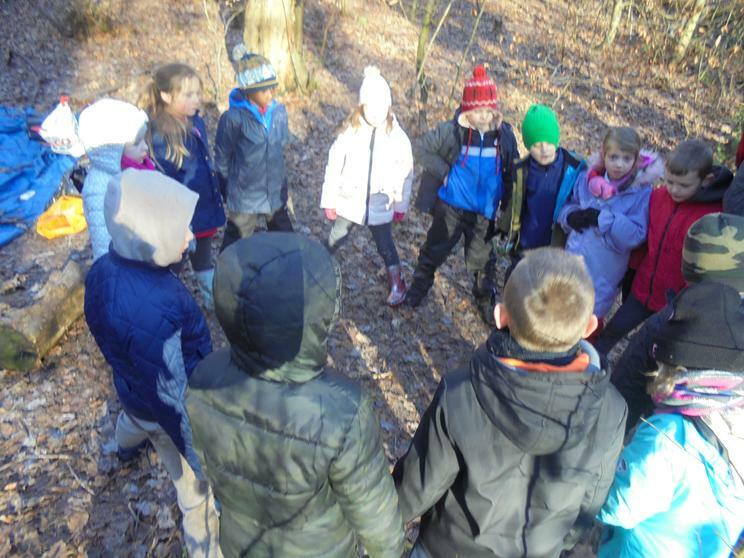 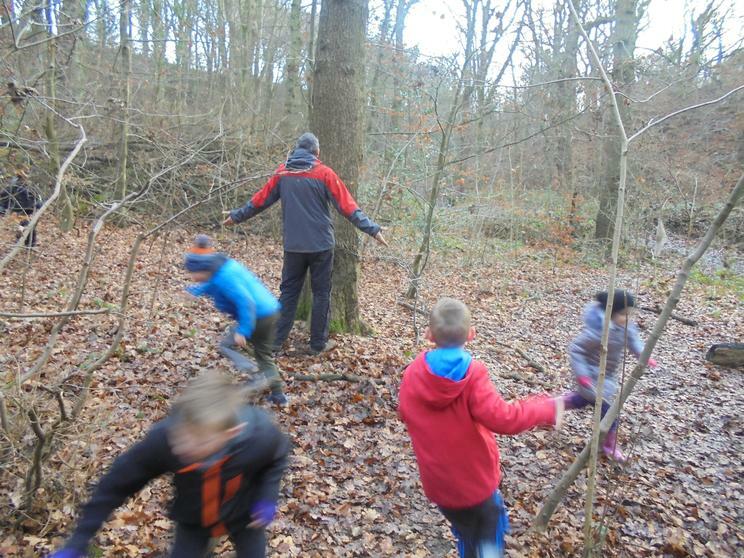 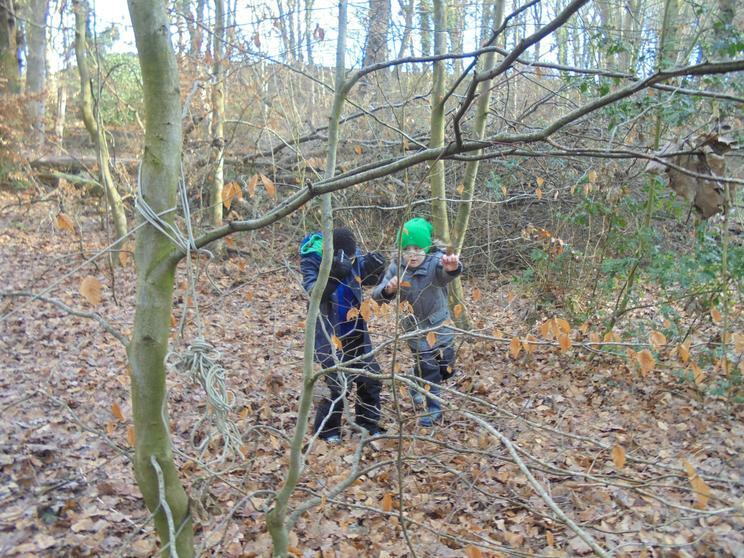 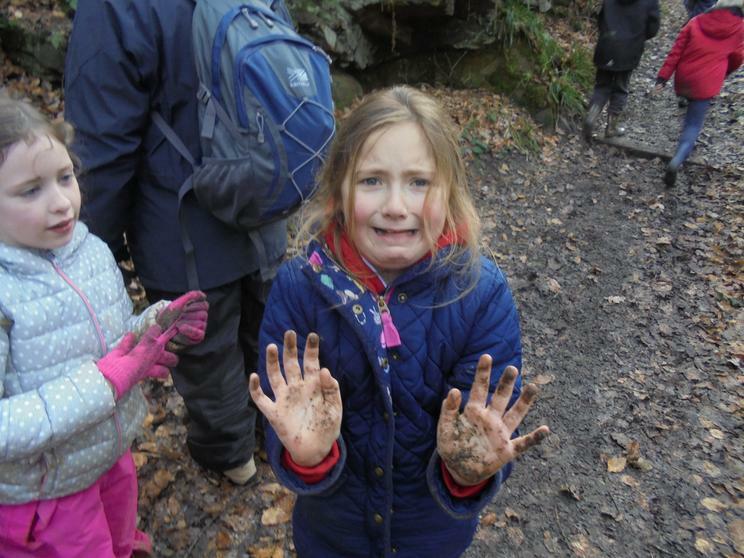 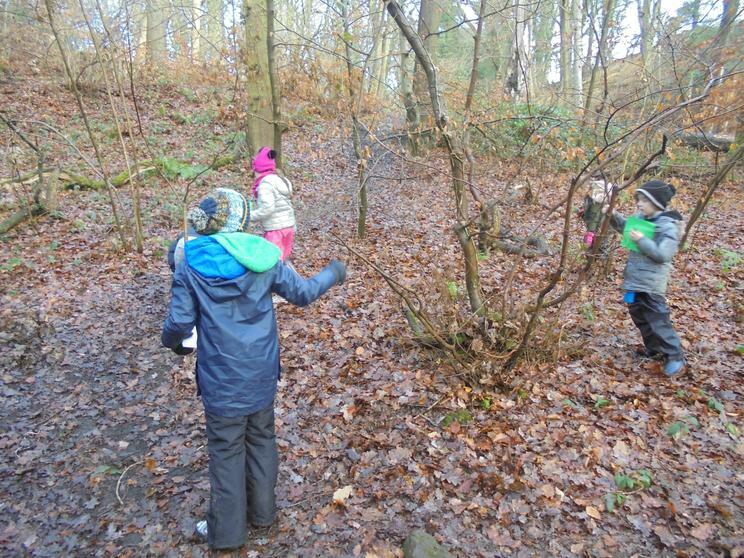 This week it was a chance for the children to get to know the site, explore and understand how to behave in the Forest. 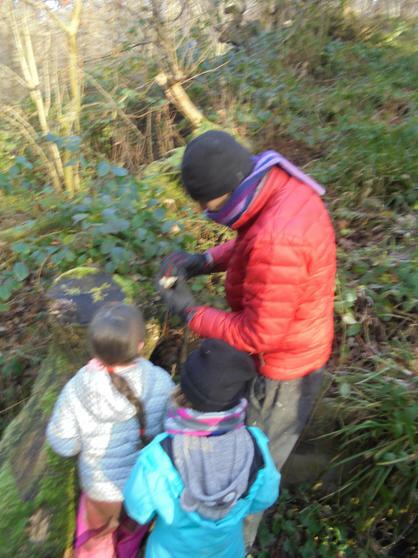 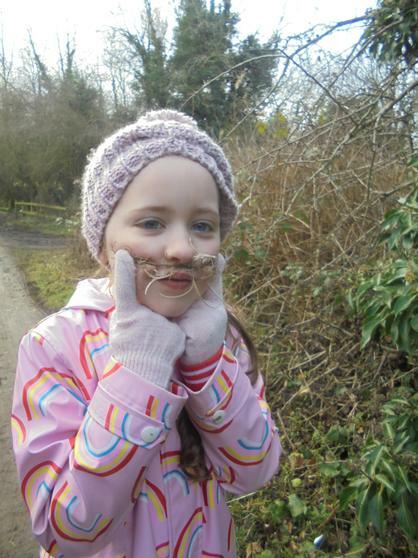 On the path along we found the last bits of ‘old man’s beard’ (Clematis vitalba ) so had to try some out! 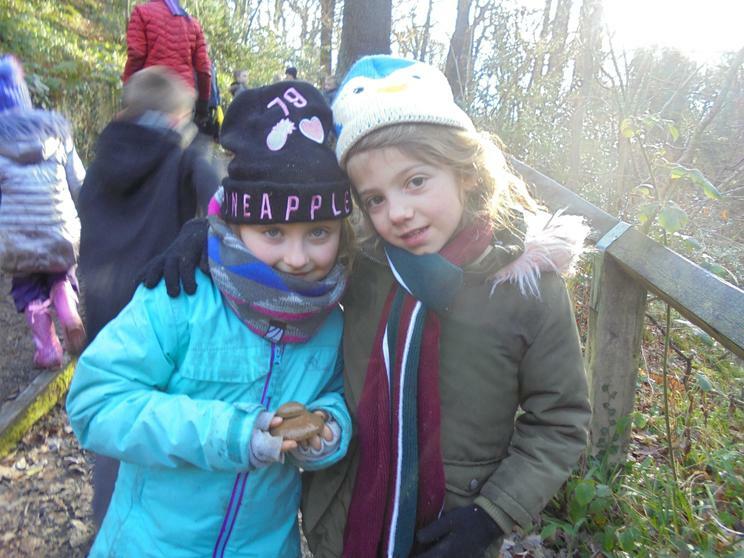 When we arrived at the site we made some bracelets these were to help to remember the 3 rules that we have at Forest School: Look after ourselves. 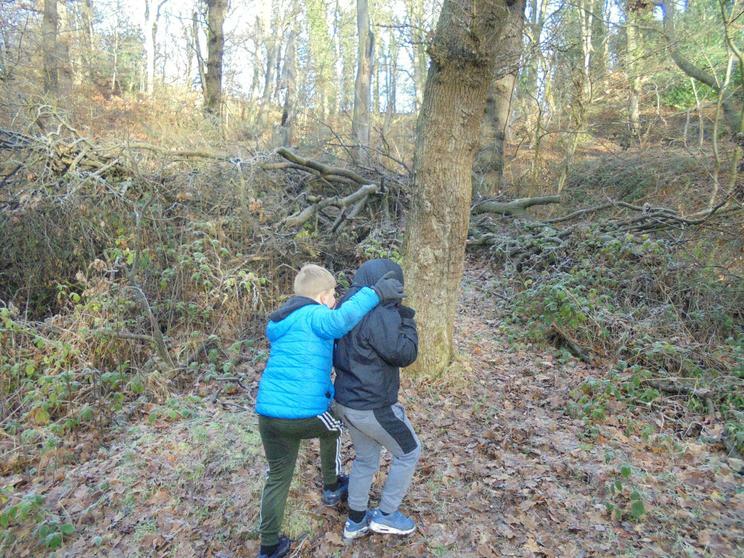 Look after each other. 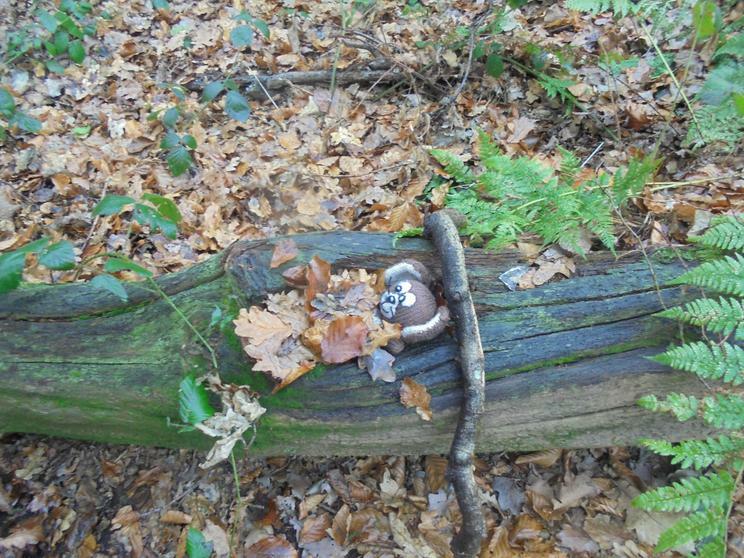 Look after the forest. 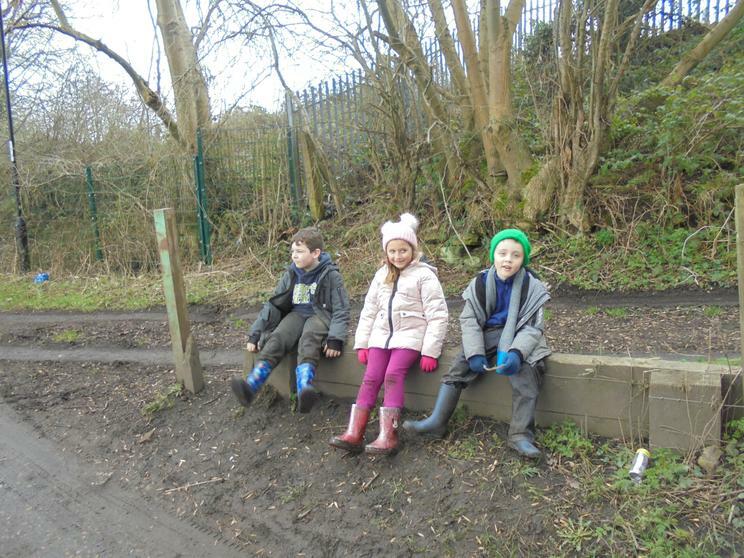 We discussed what this might mean and how it might affect the way that we behave. 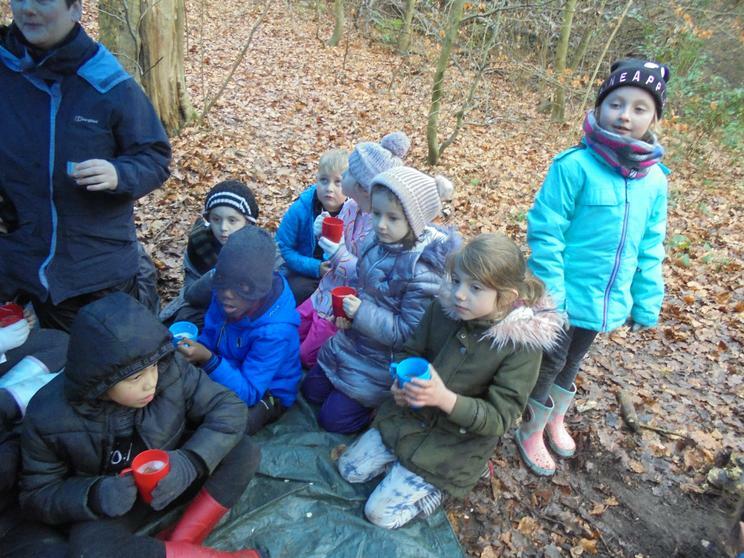 A lovely hot chocolate was needed to help warm us up a bit and after that we went off to explore a bit. 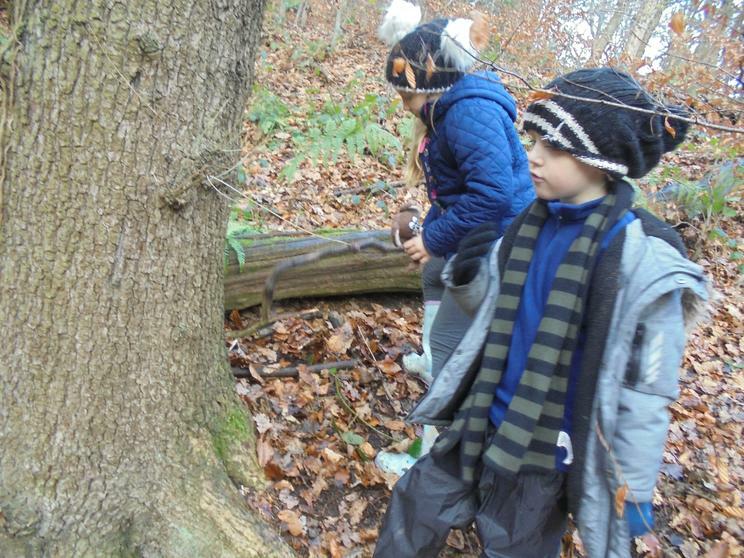 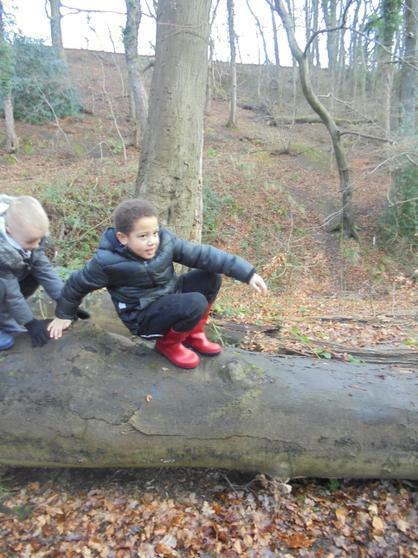 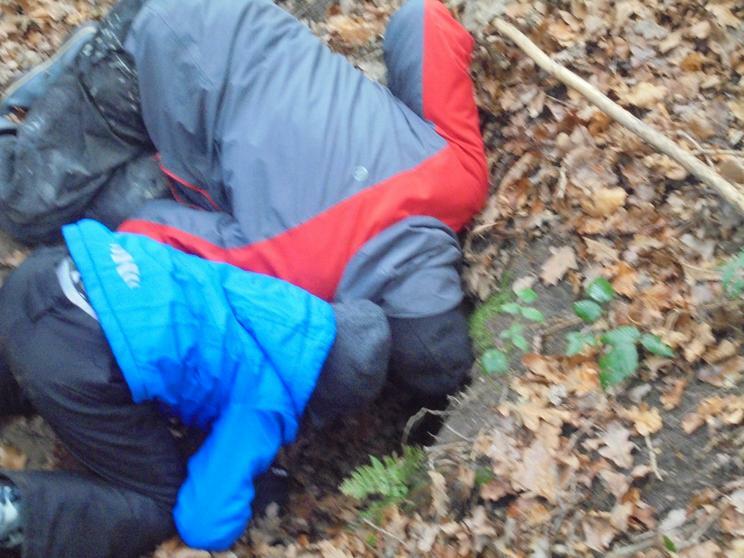 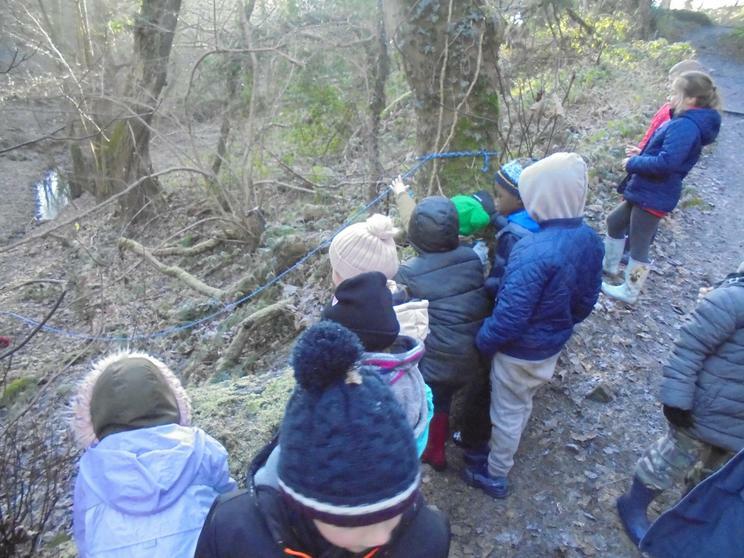 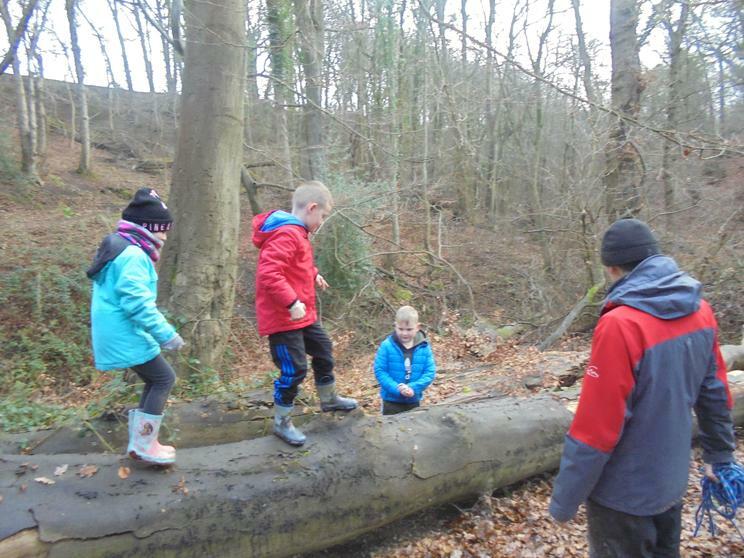 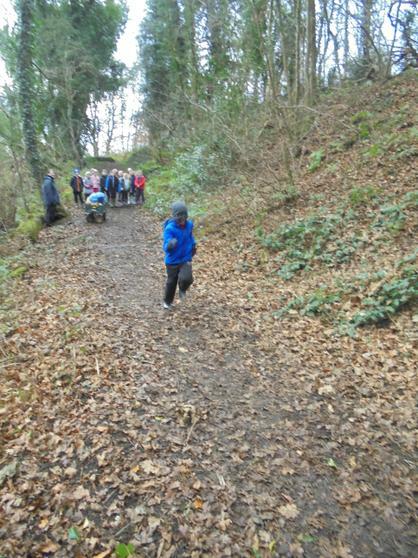 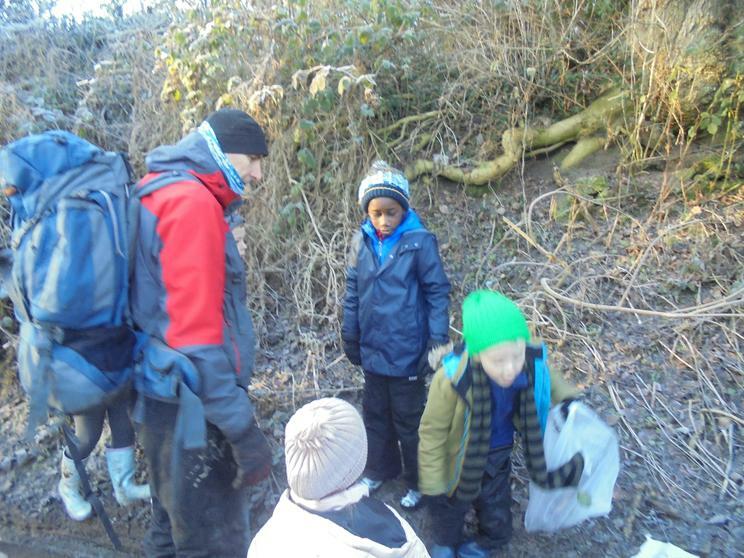 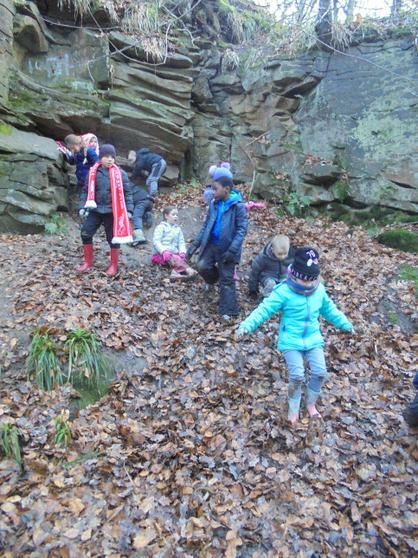 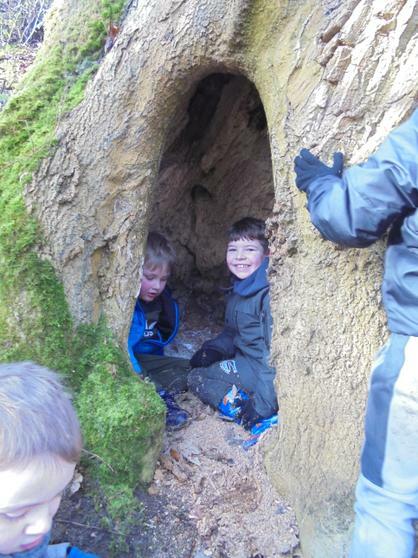 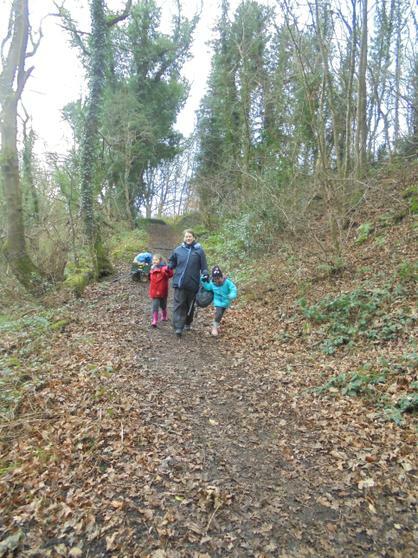 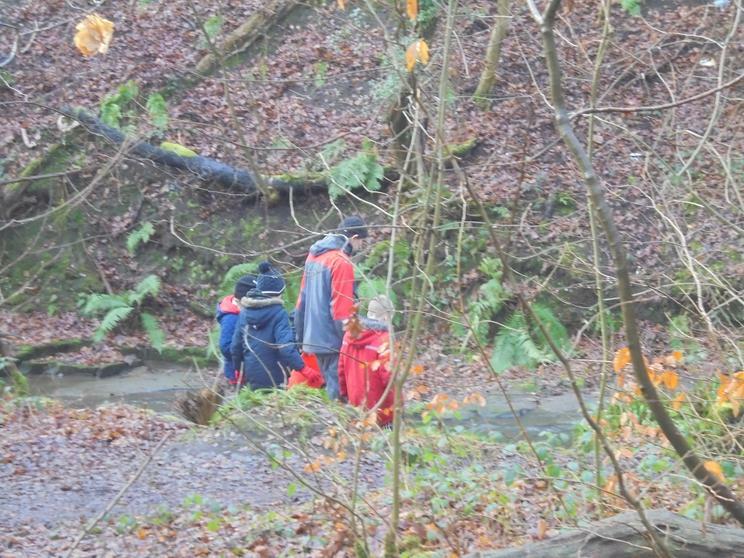 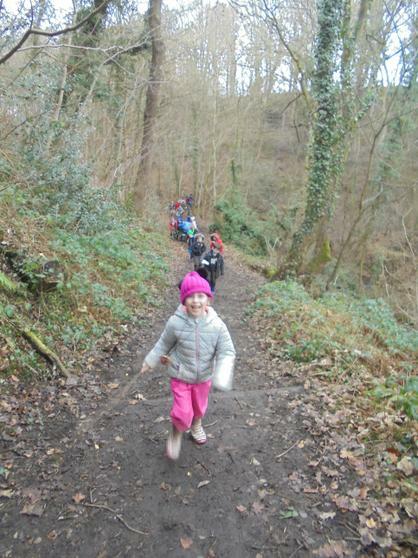 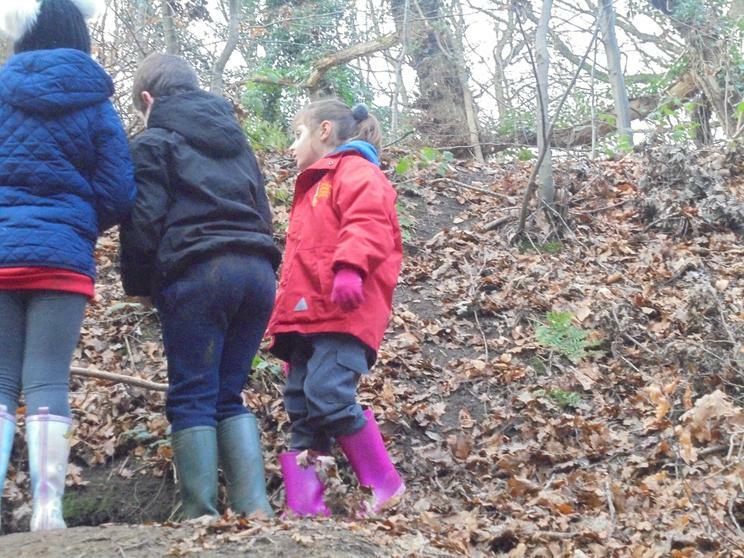 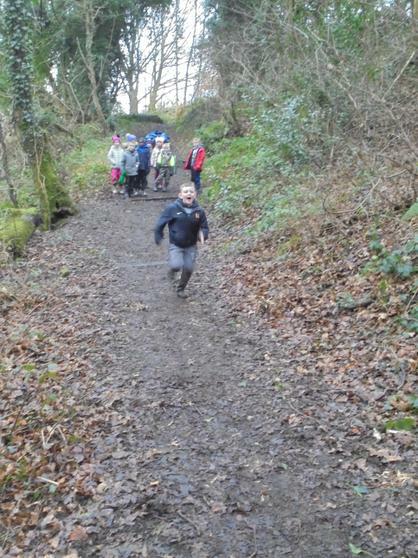 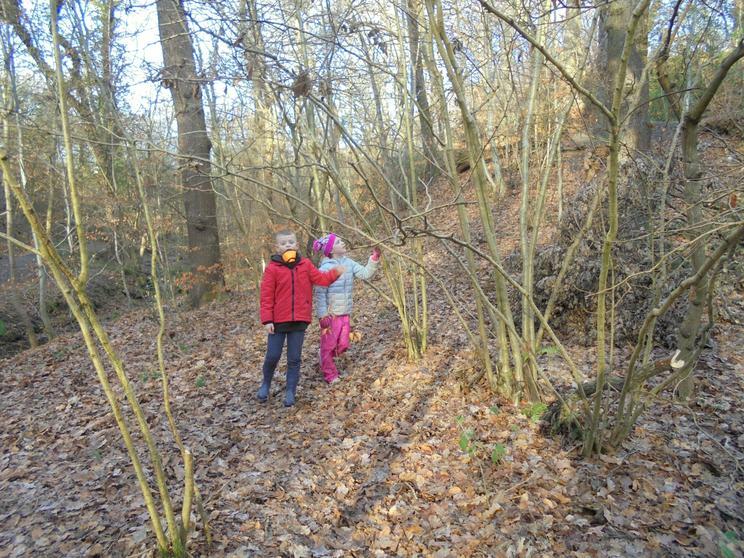 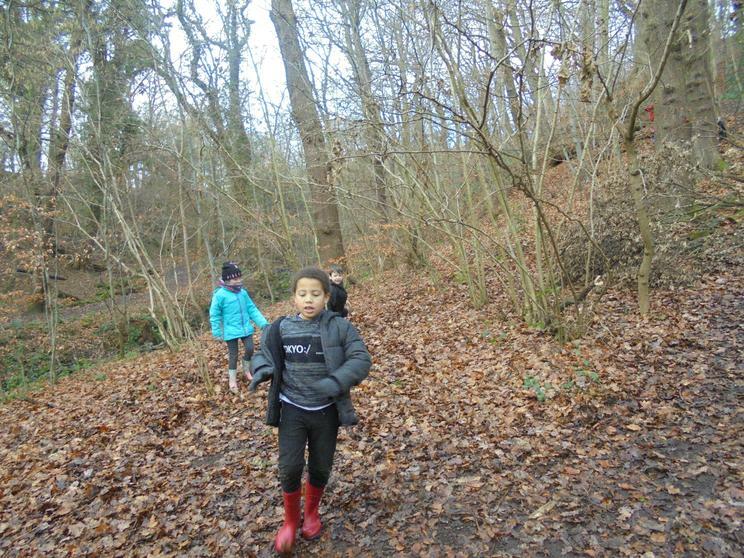 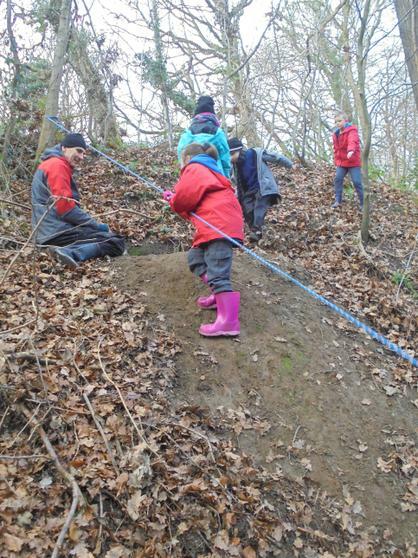 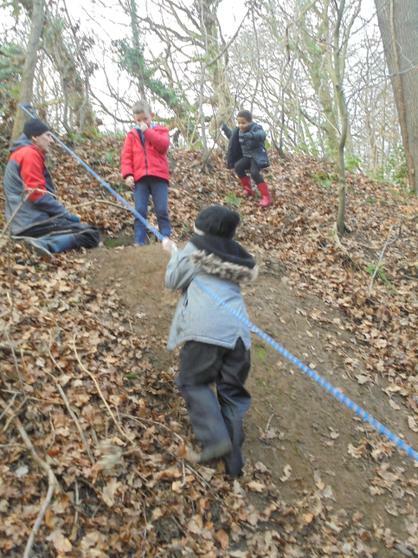 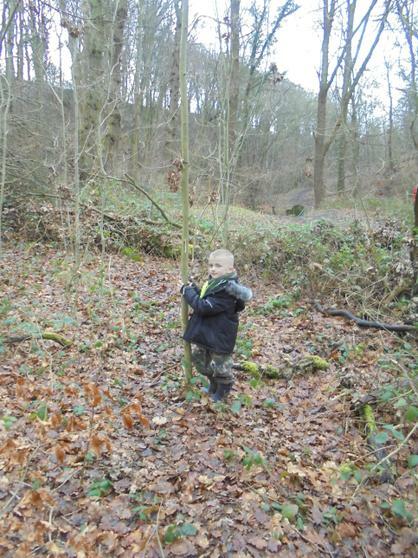 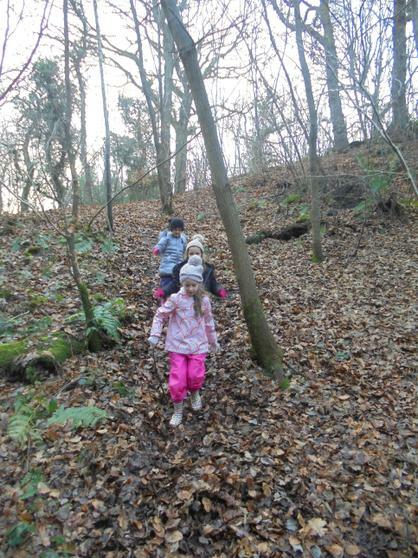 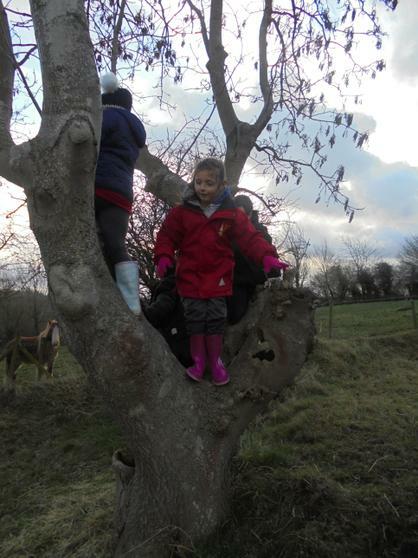 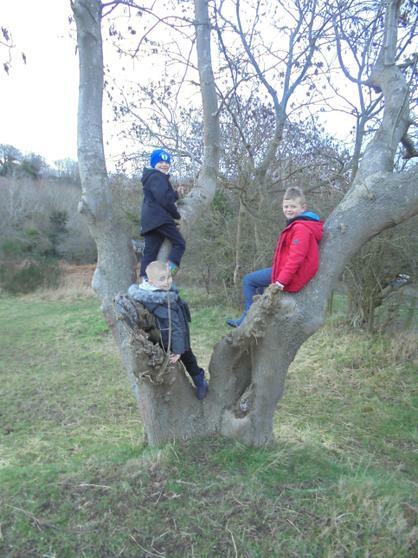 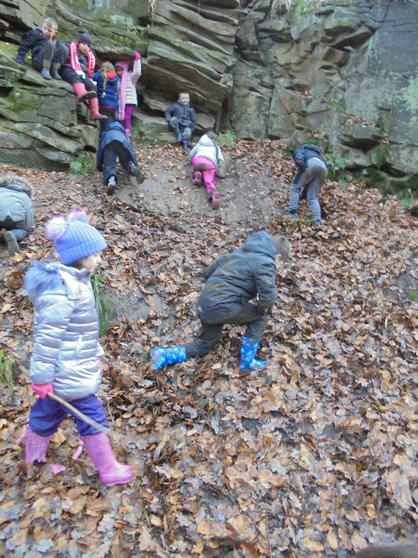 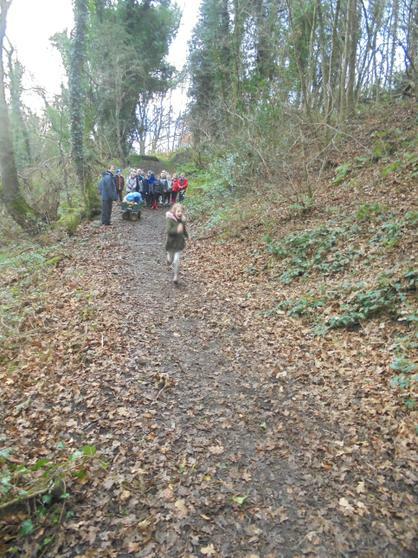 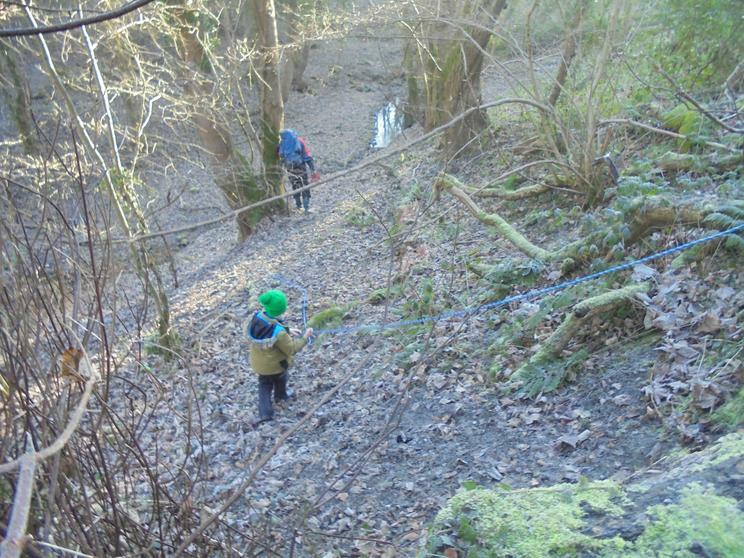 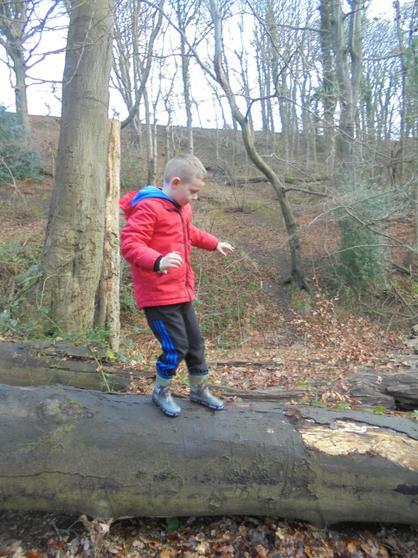 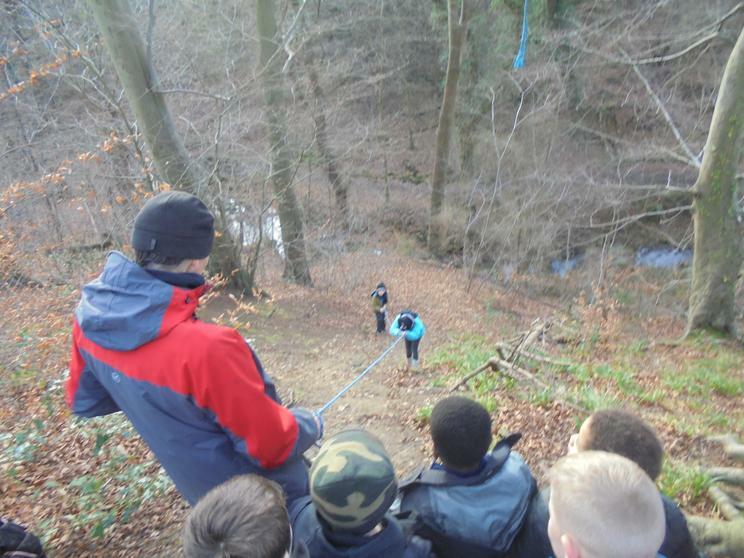 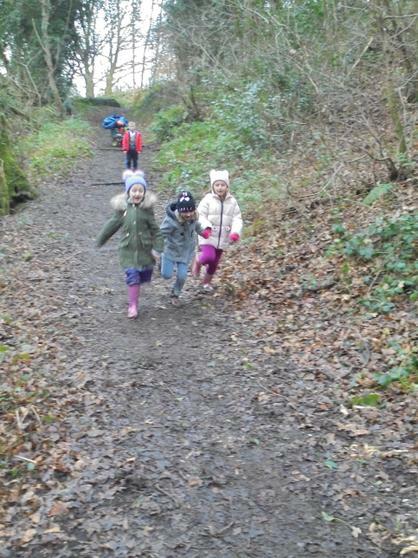 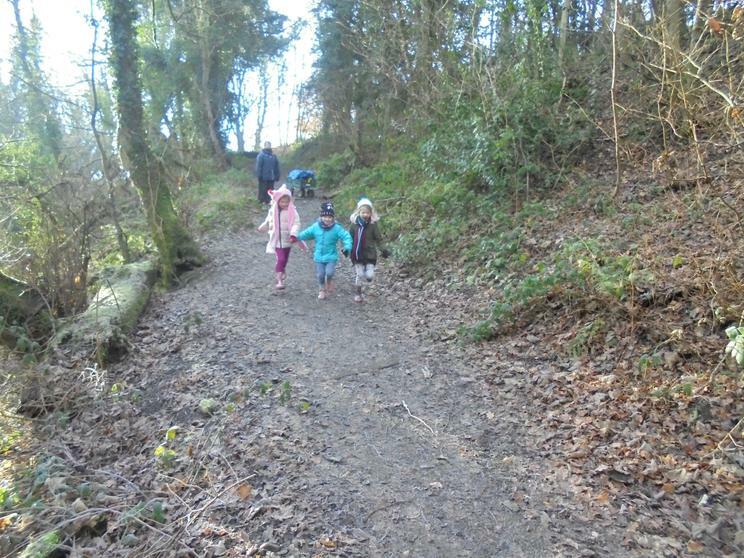 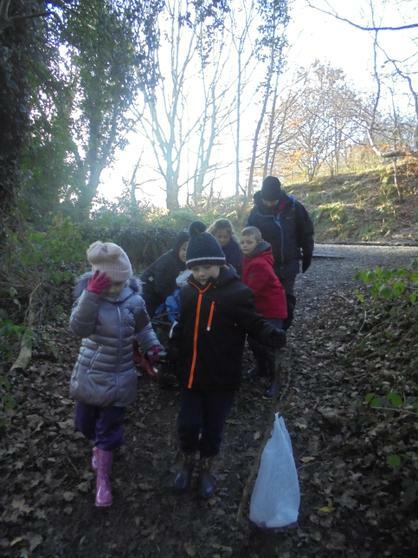 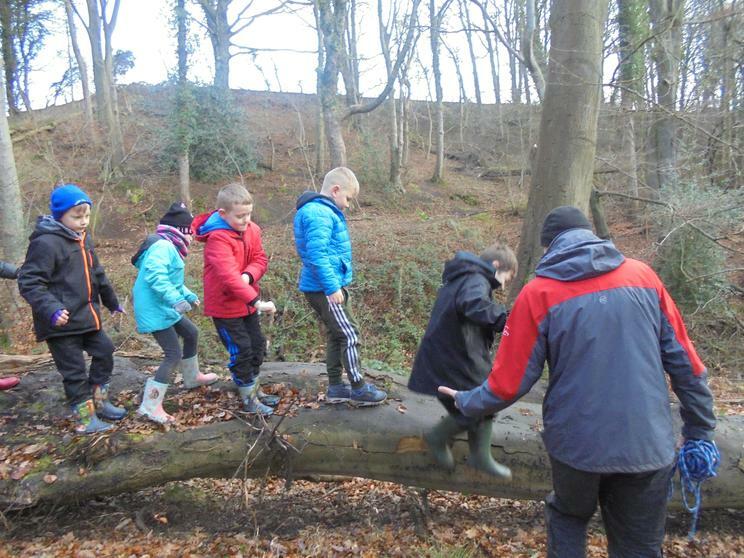 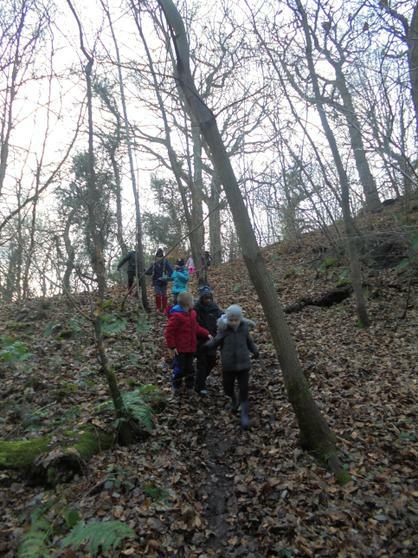 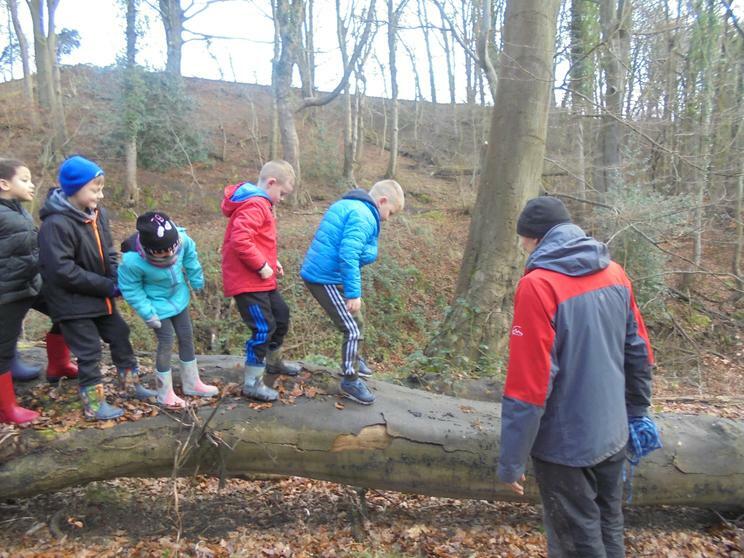 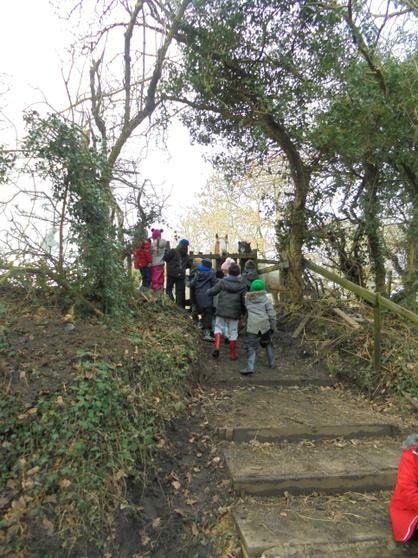 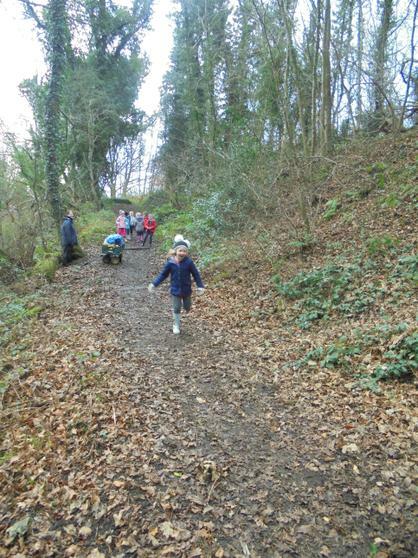 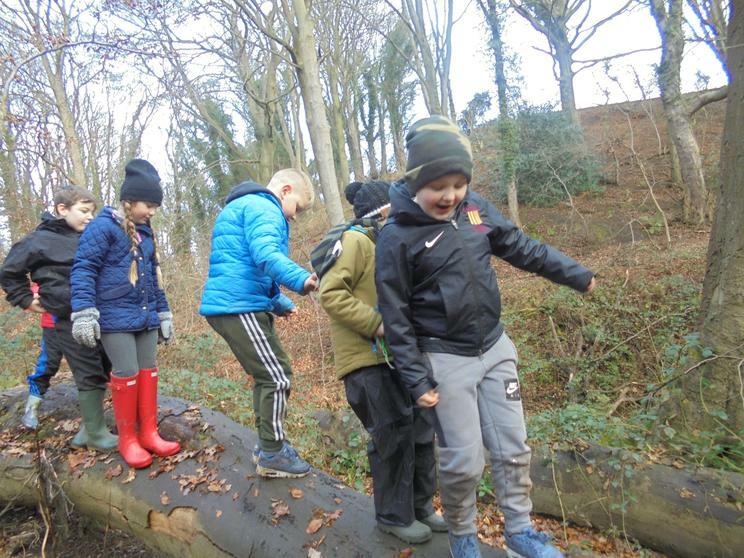 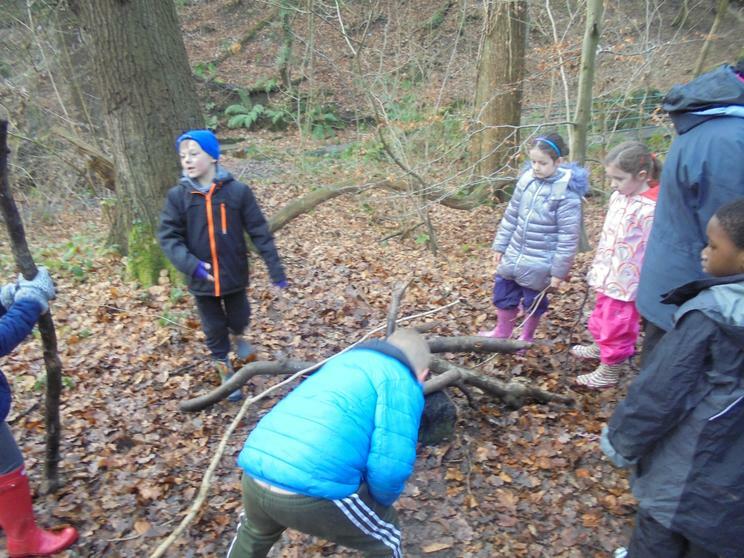 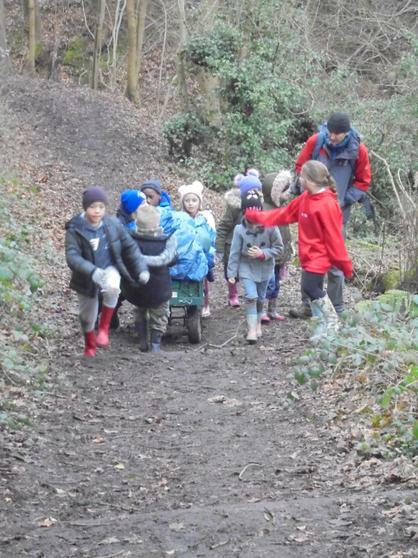 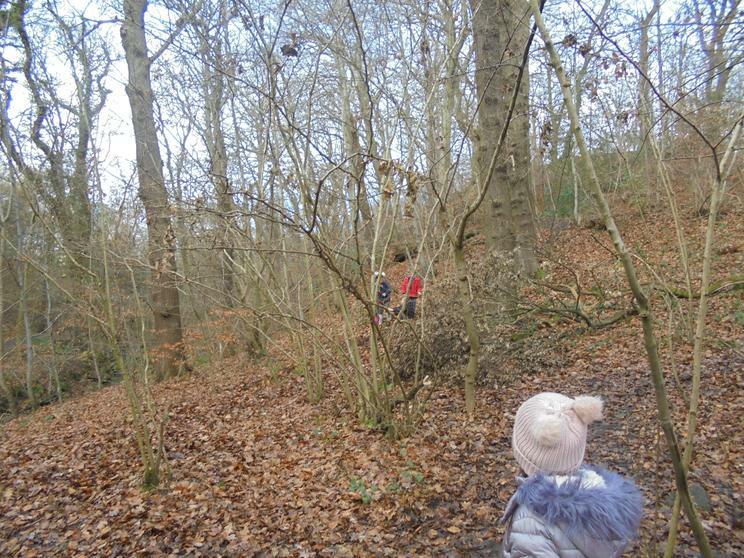 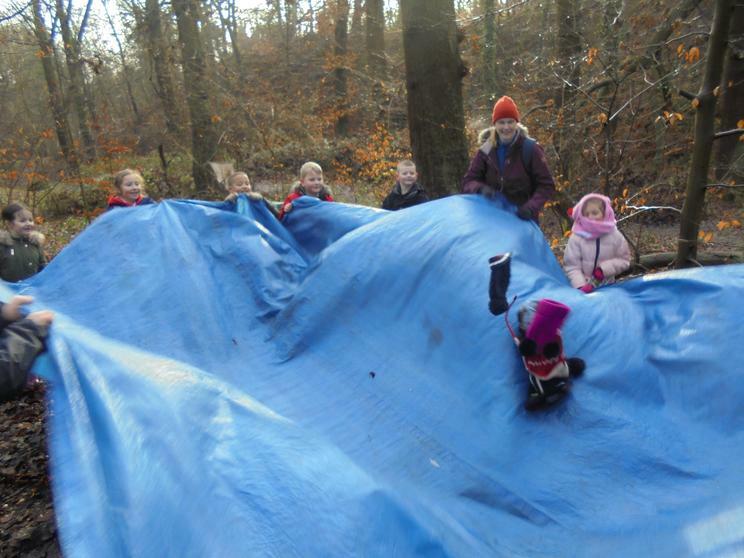 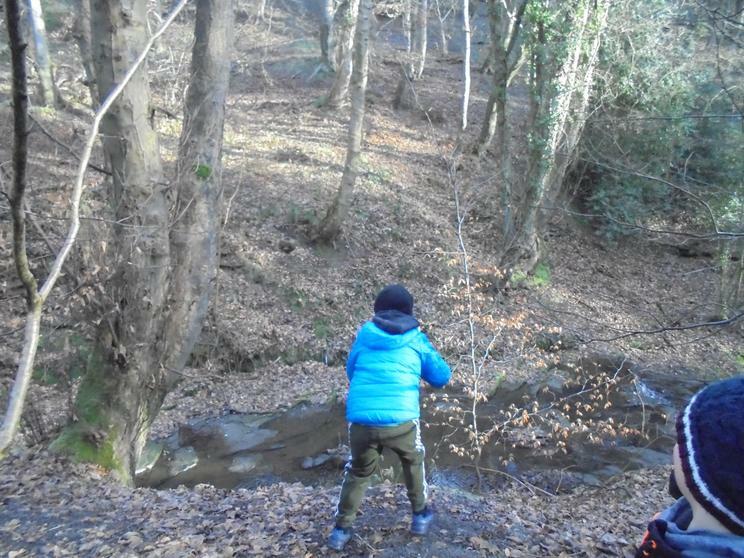 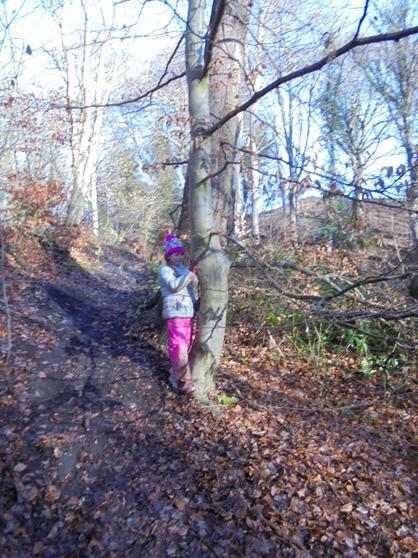 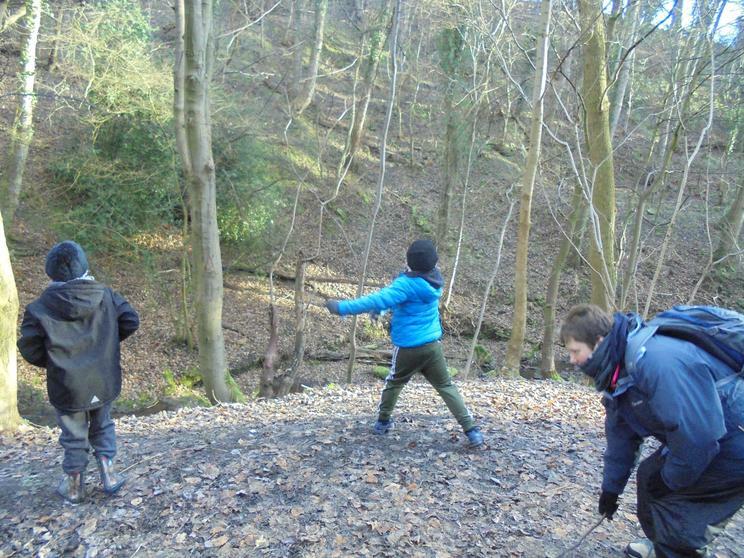 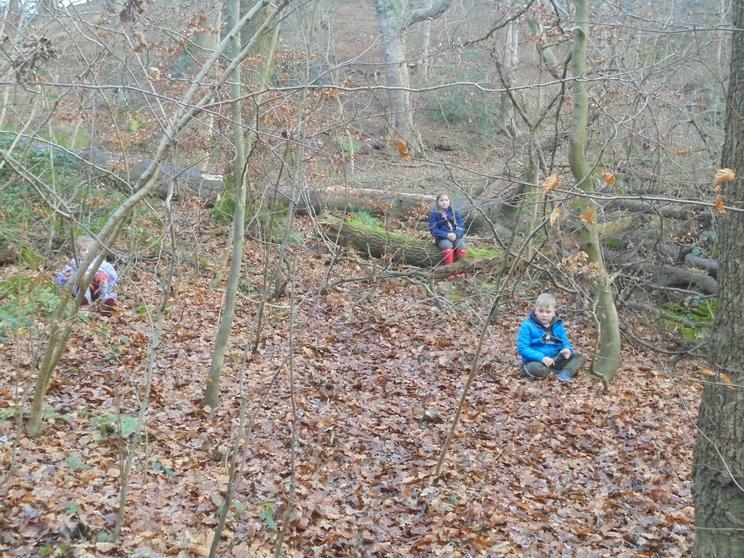 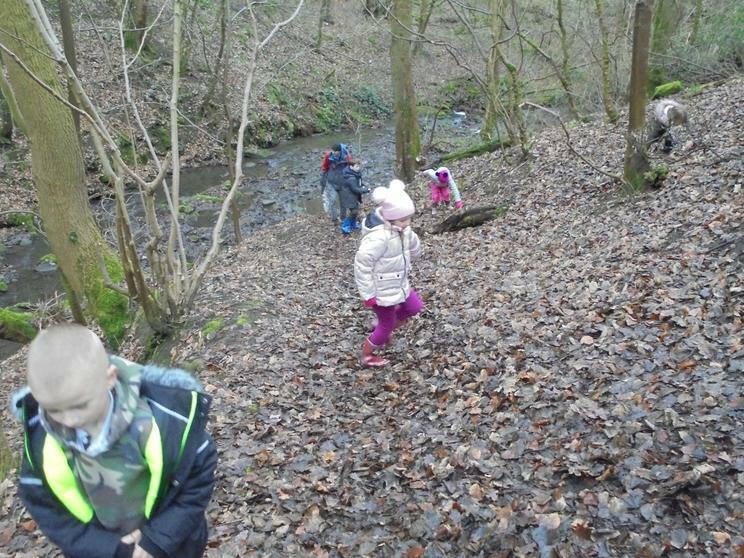 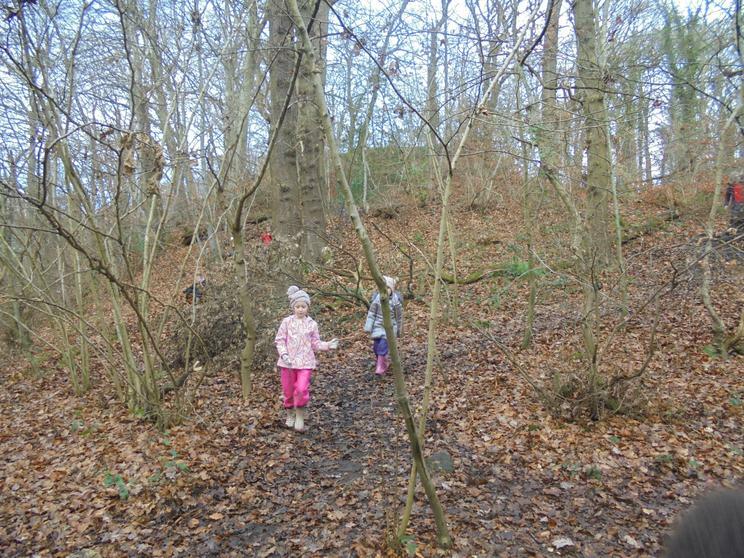 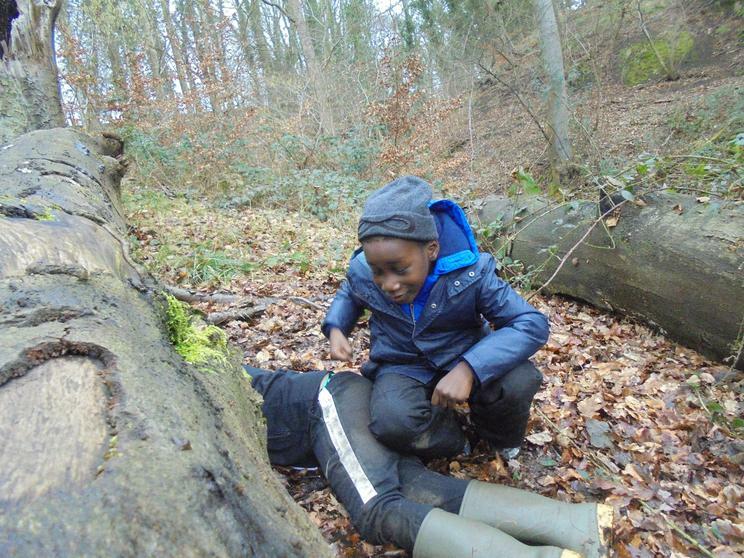 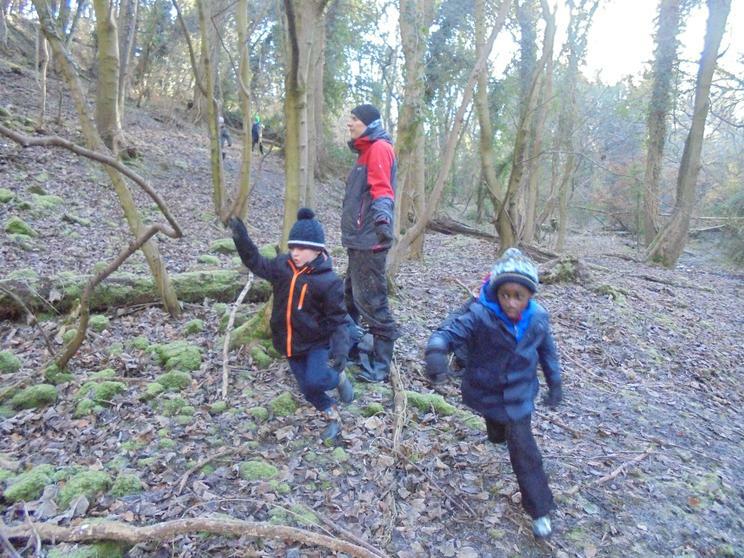 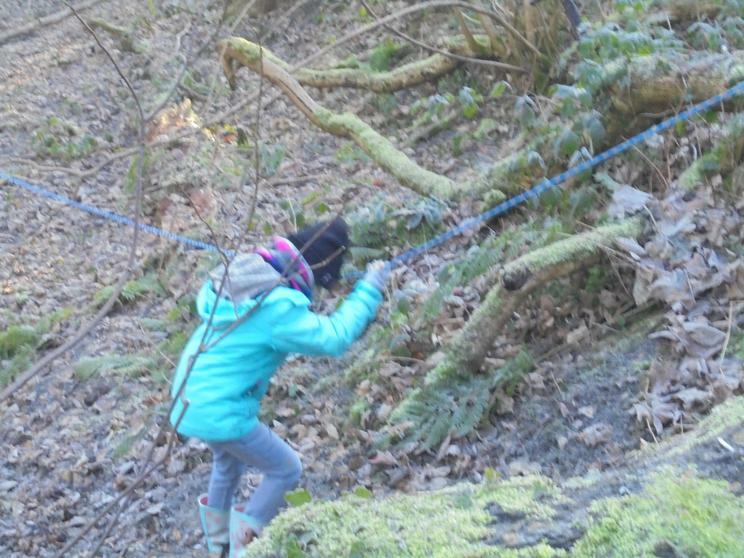 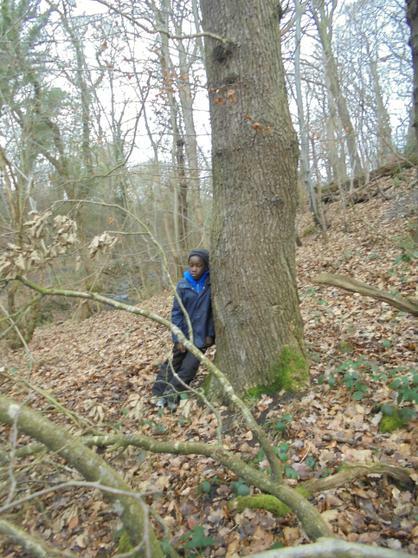 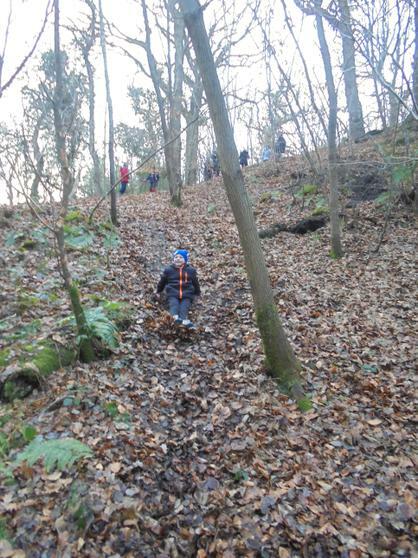 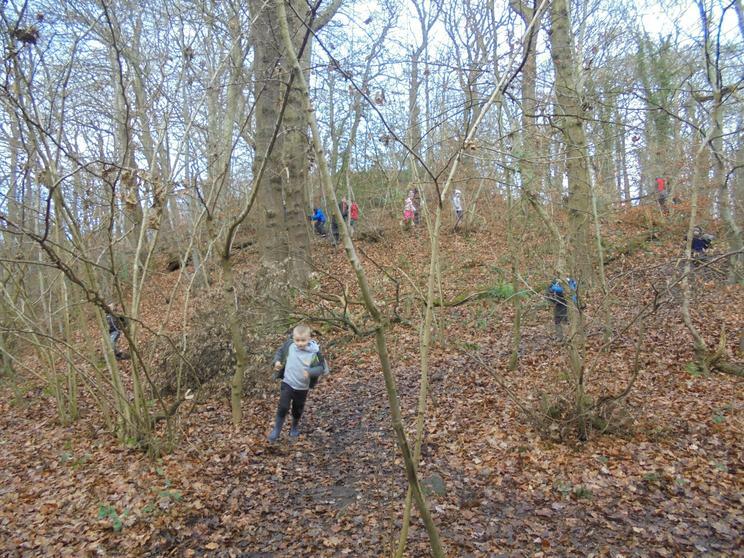 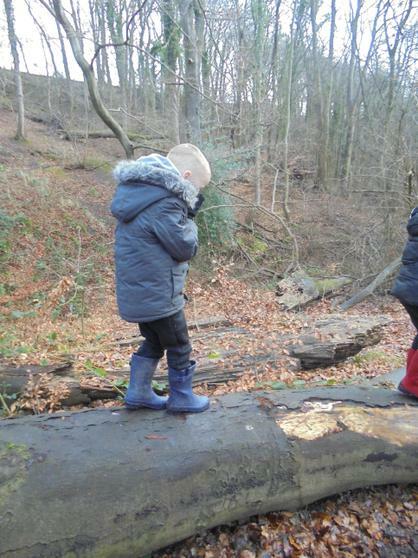 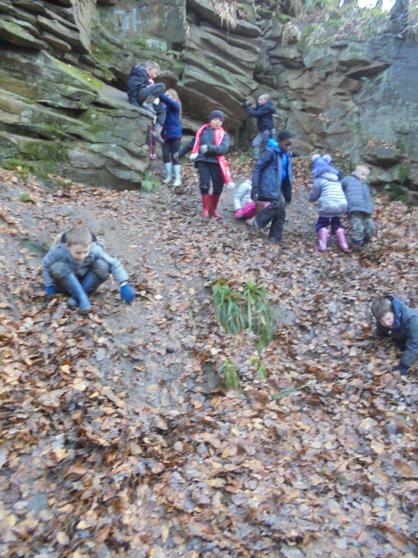 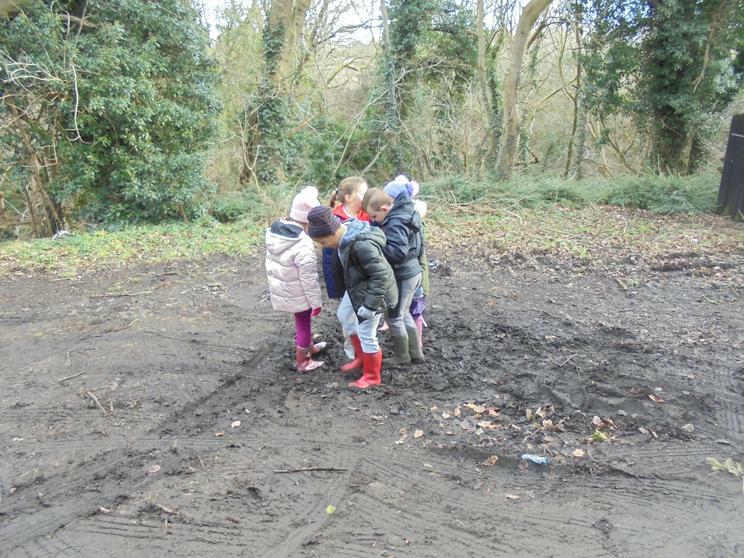 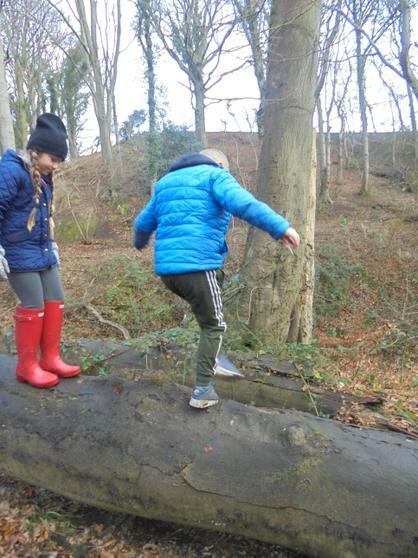 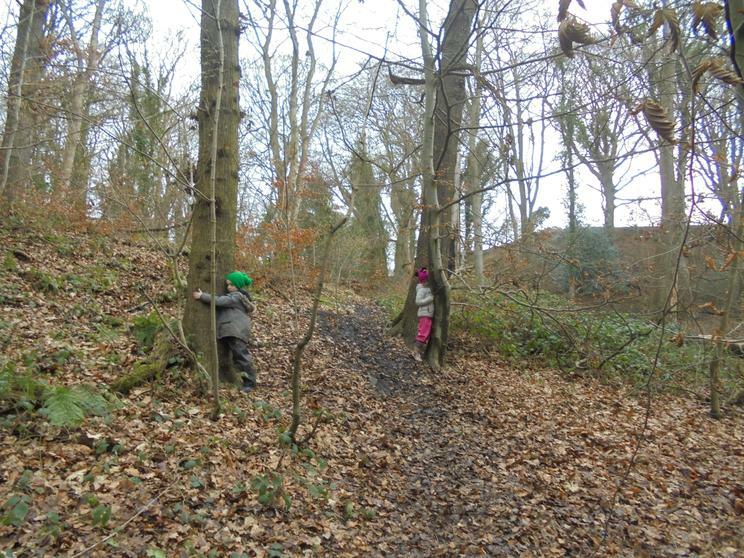 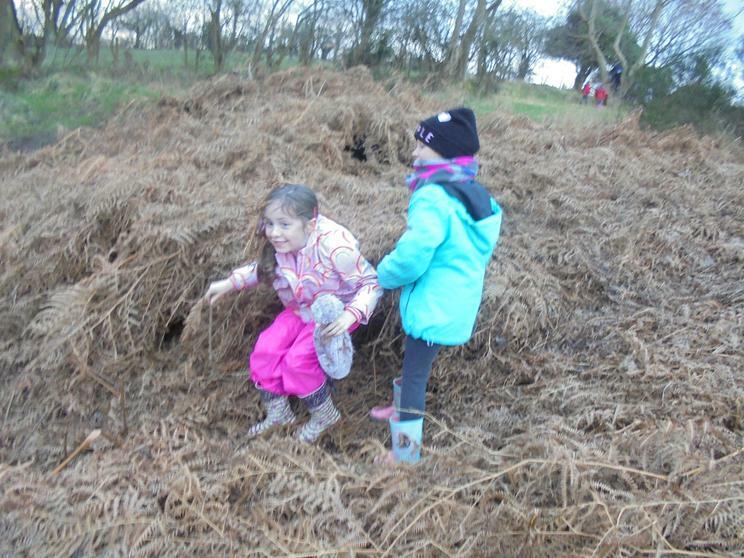 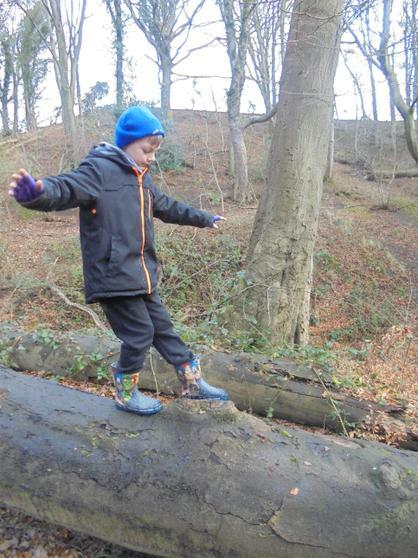 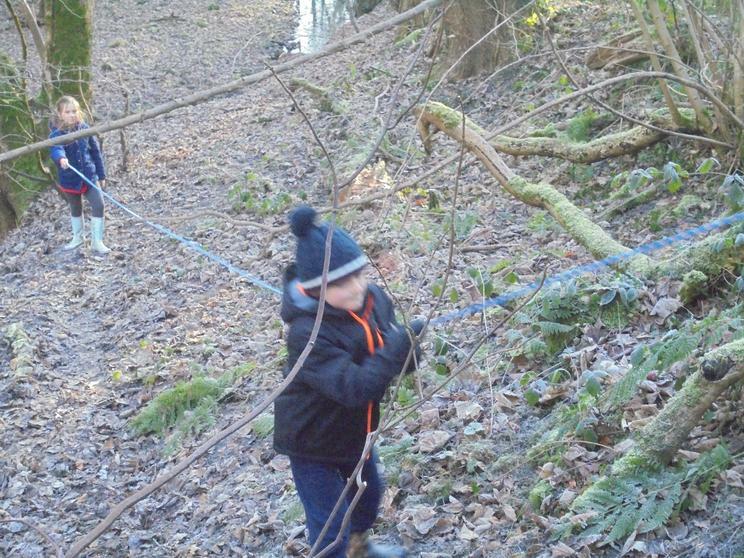 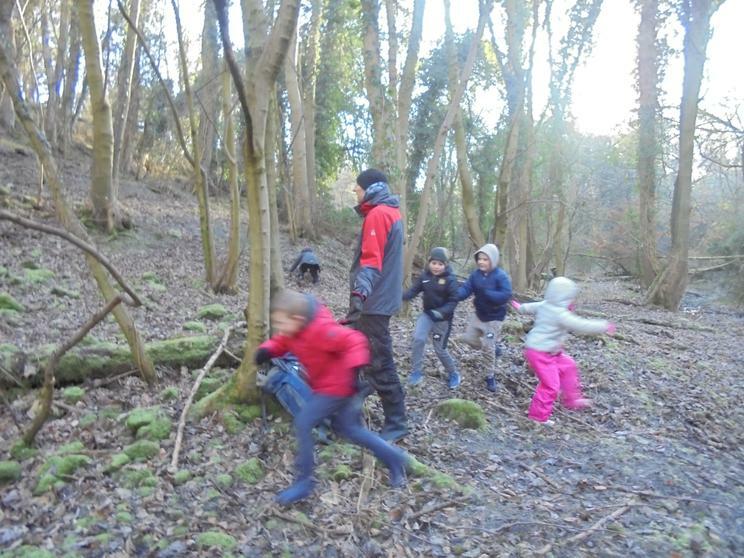 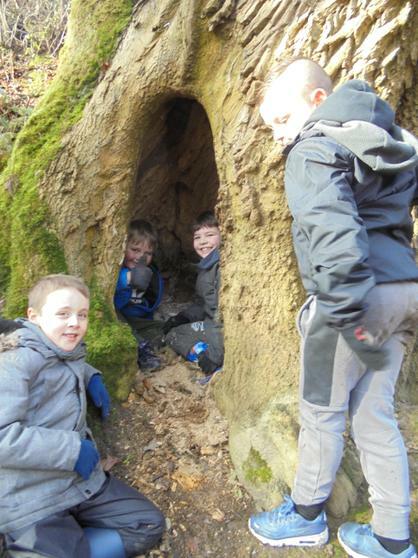 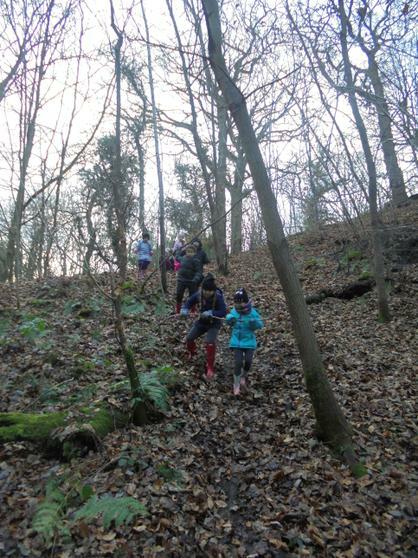 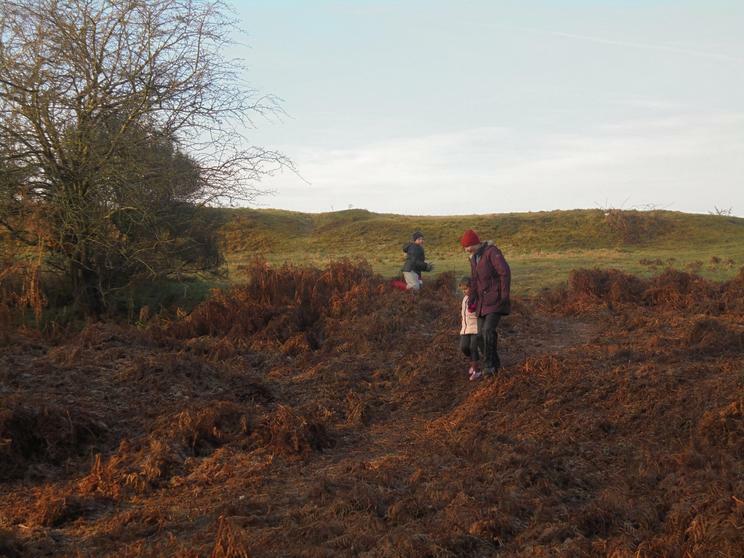 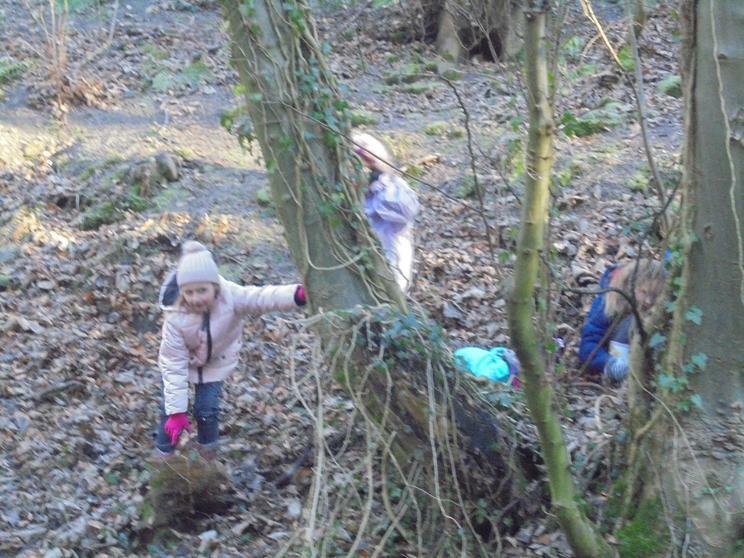 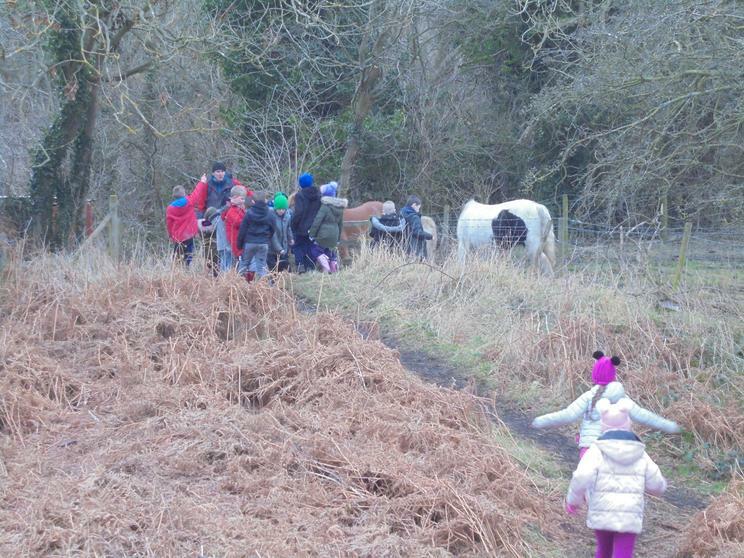 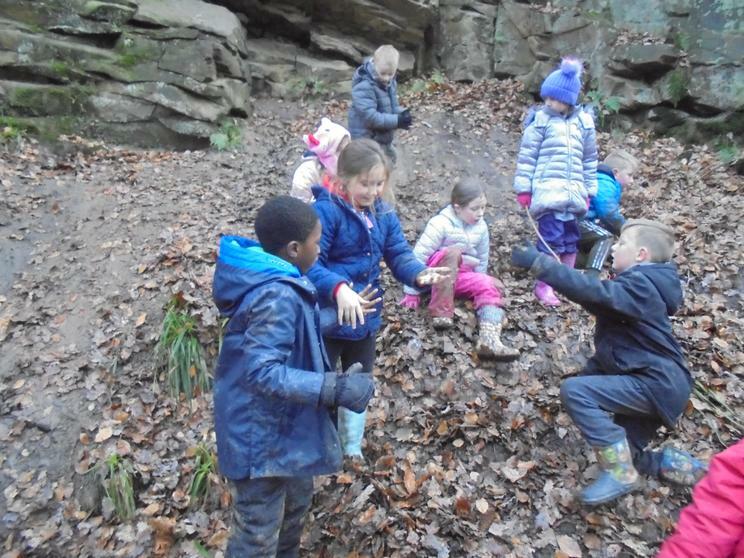 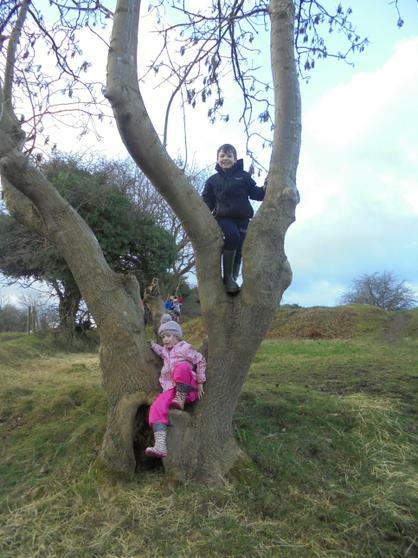 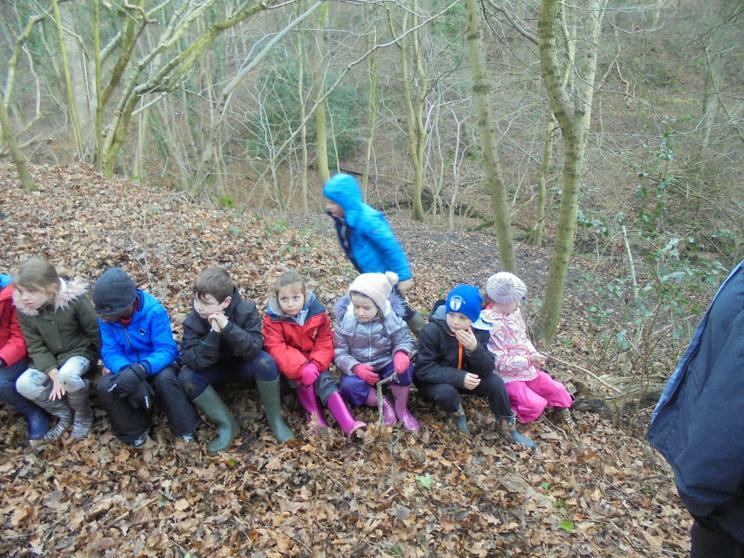 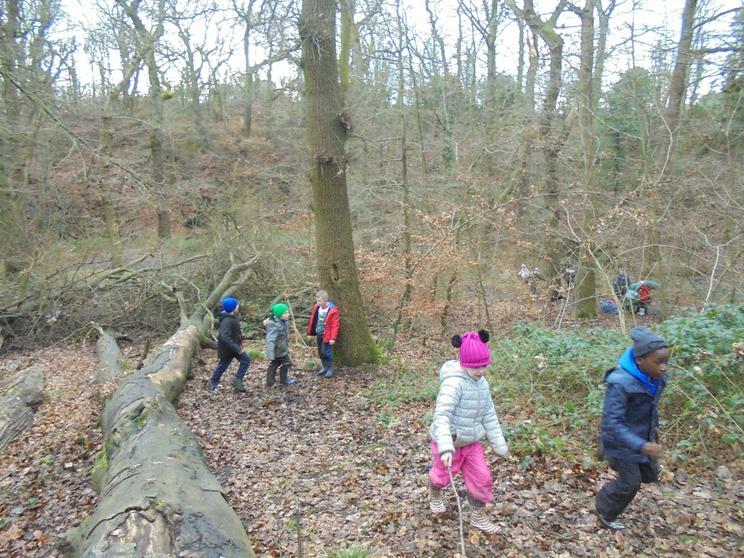 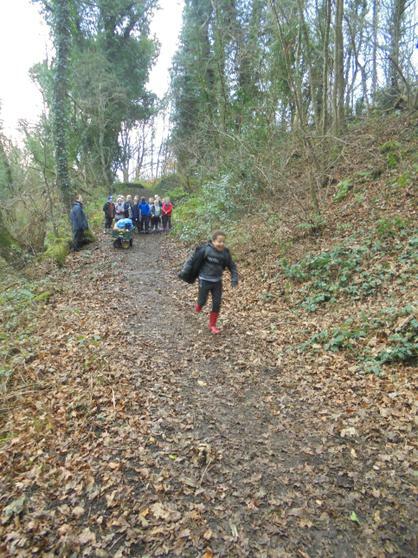 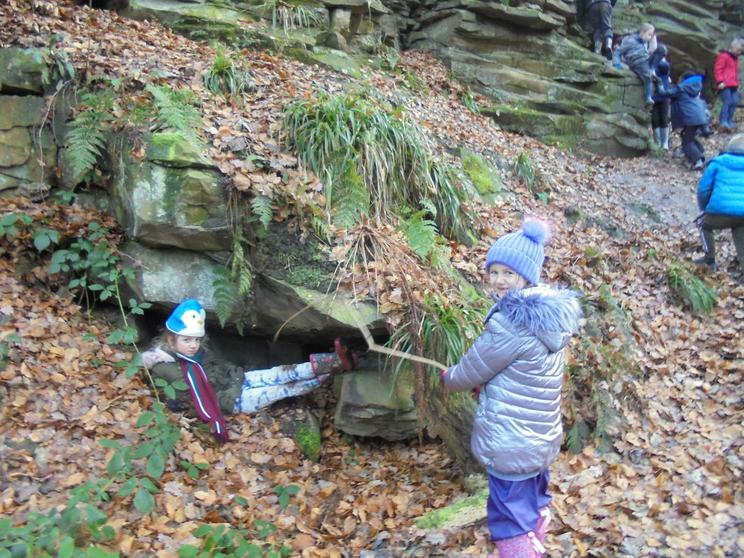 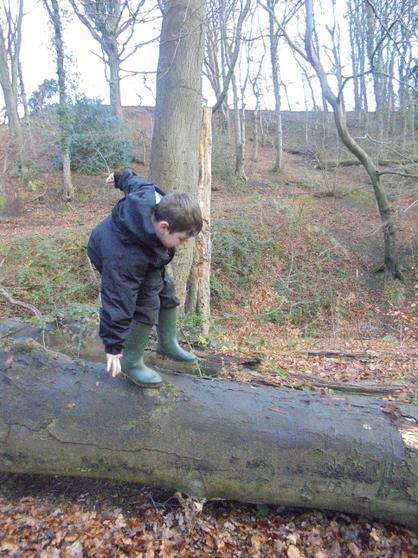 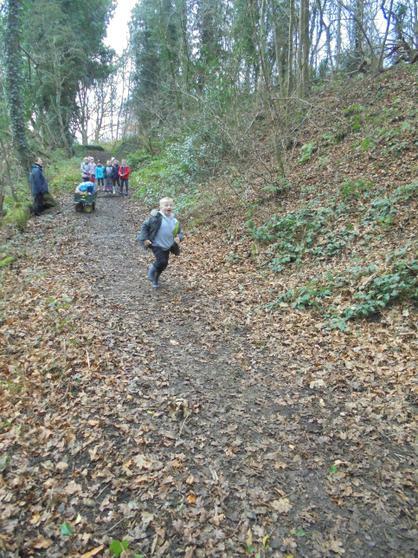 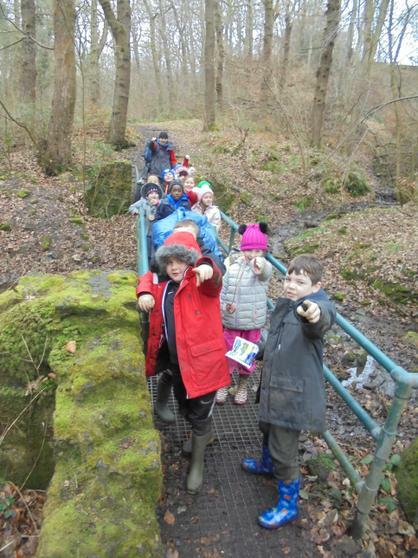 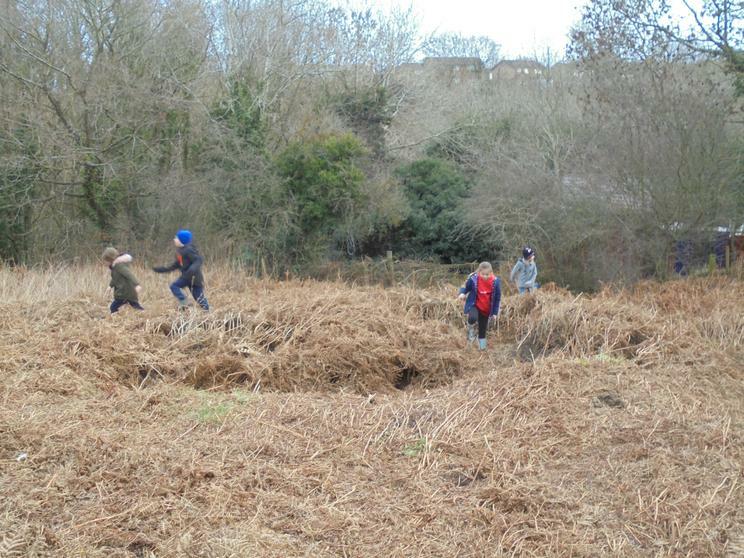 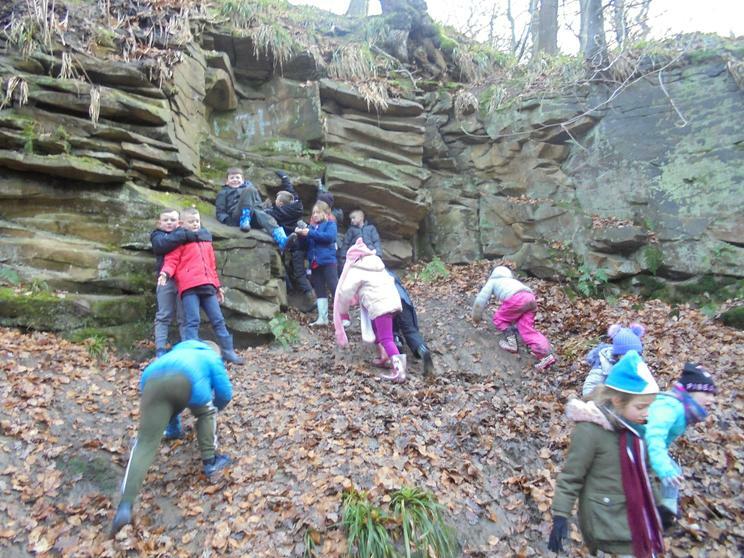 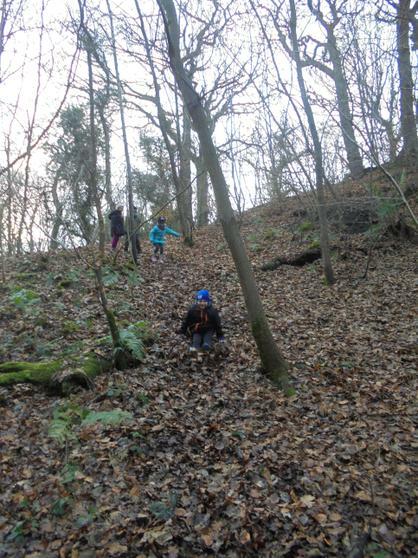 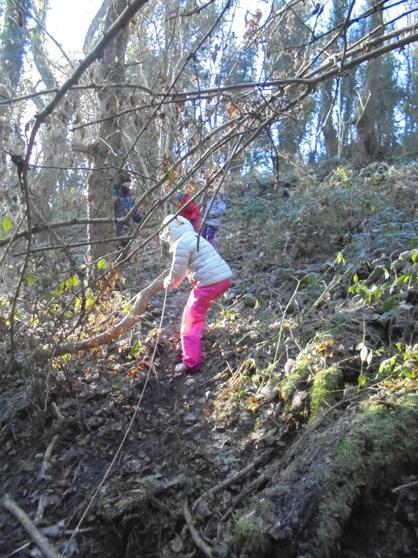 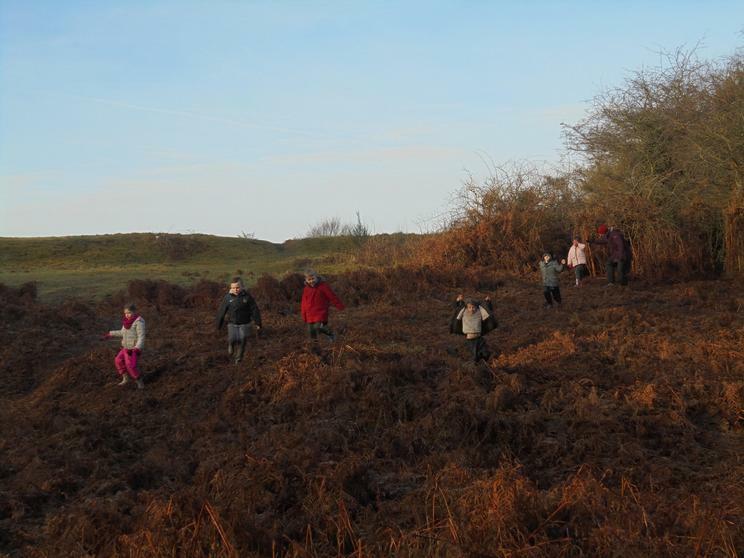 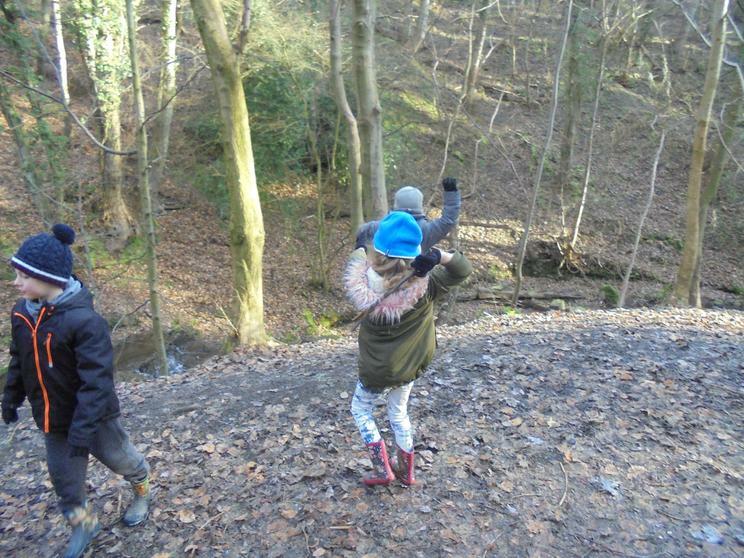 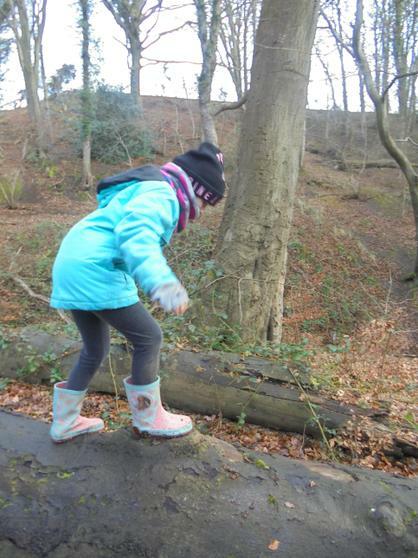 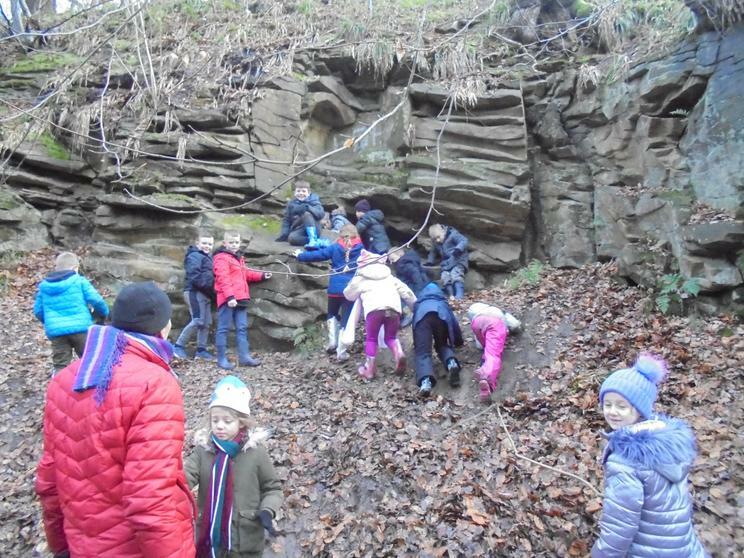 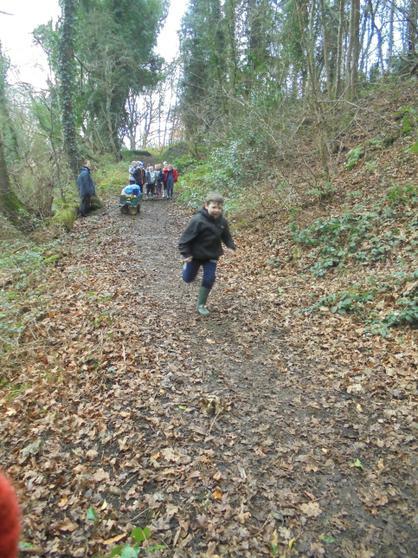 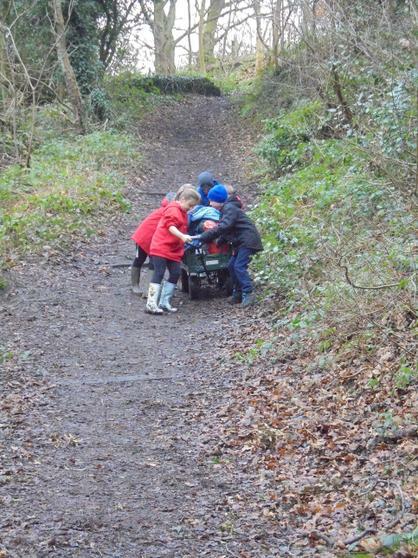 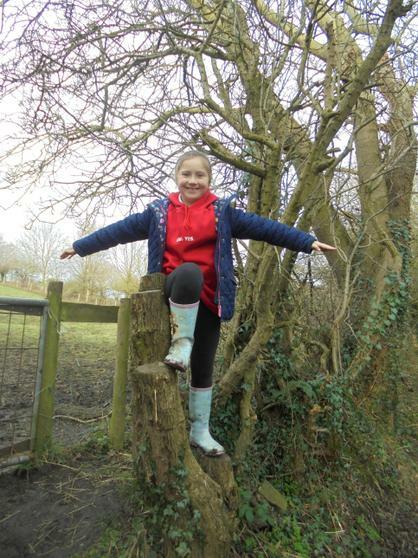 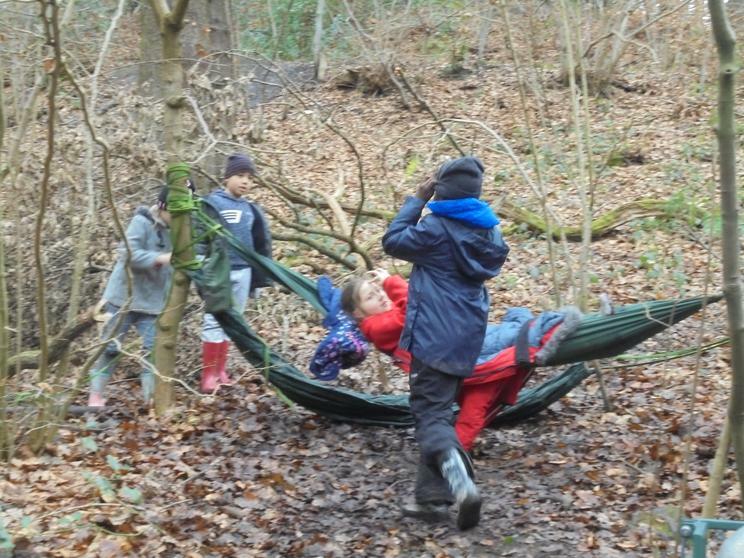 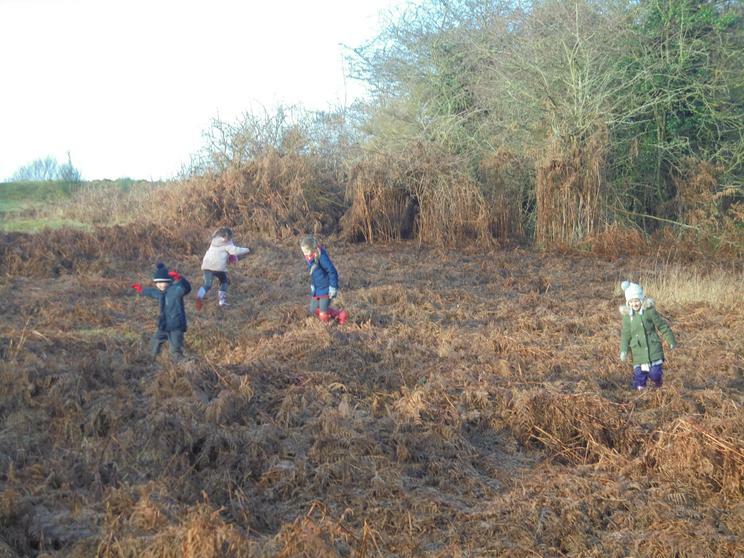 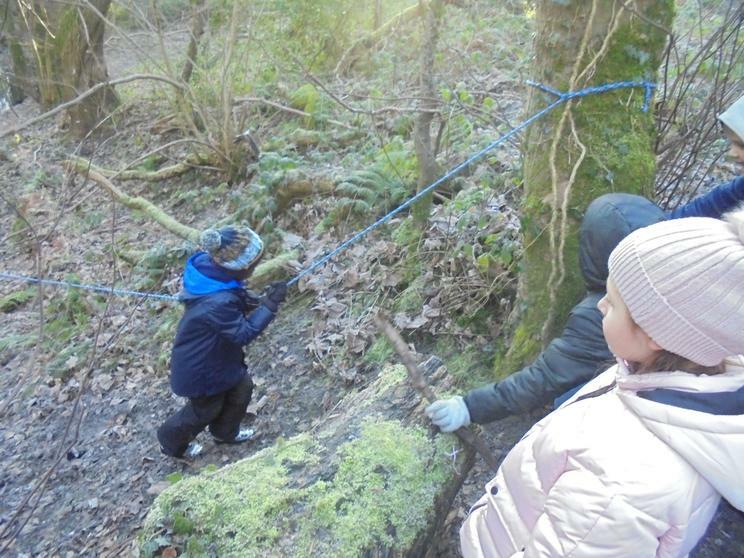 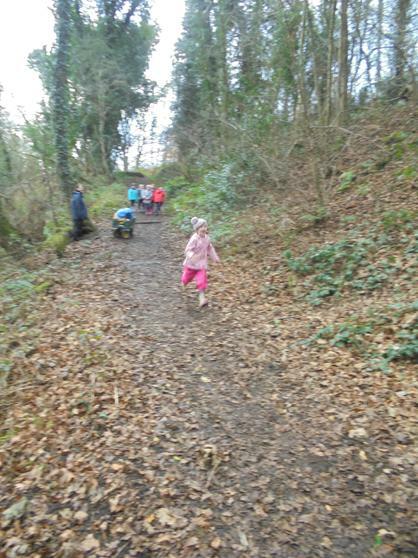 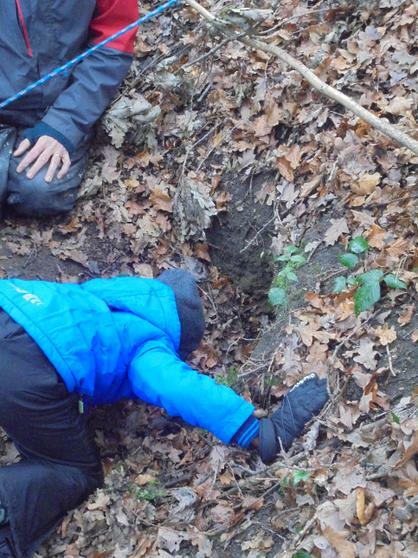 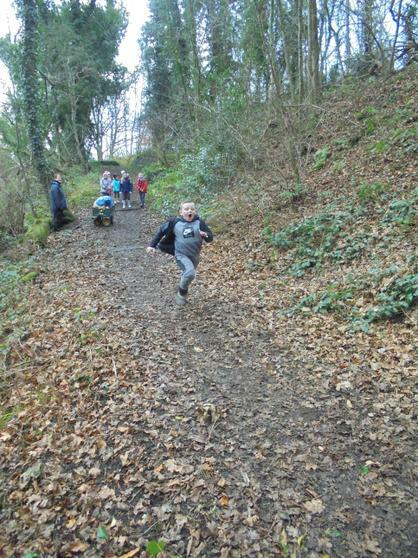 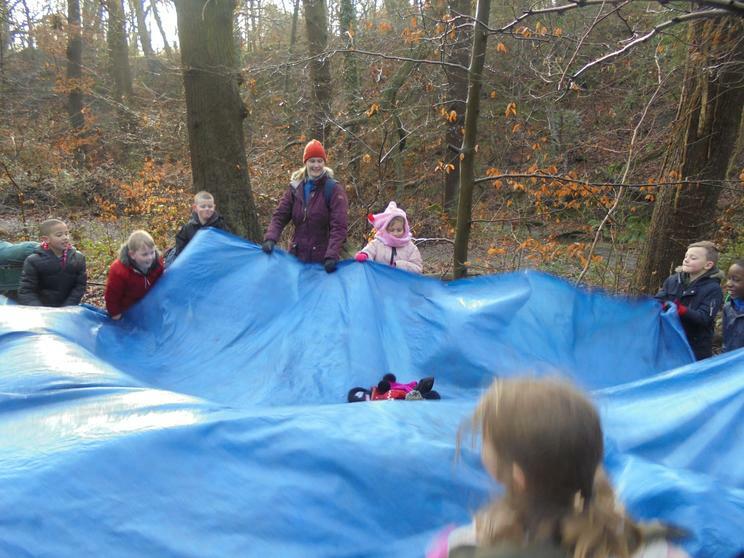 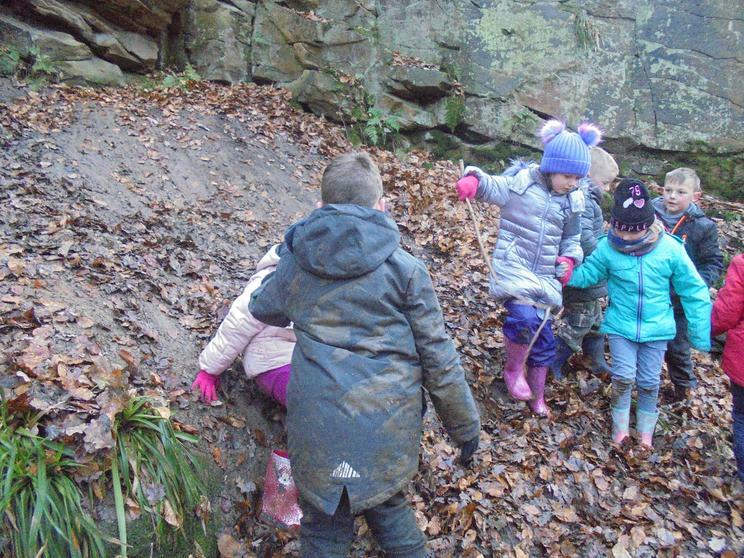 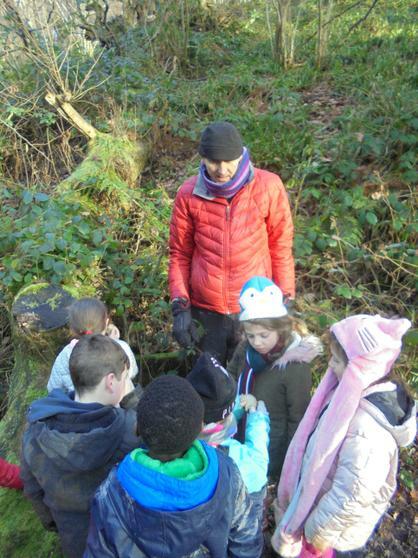 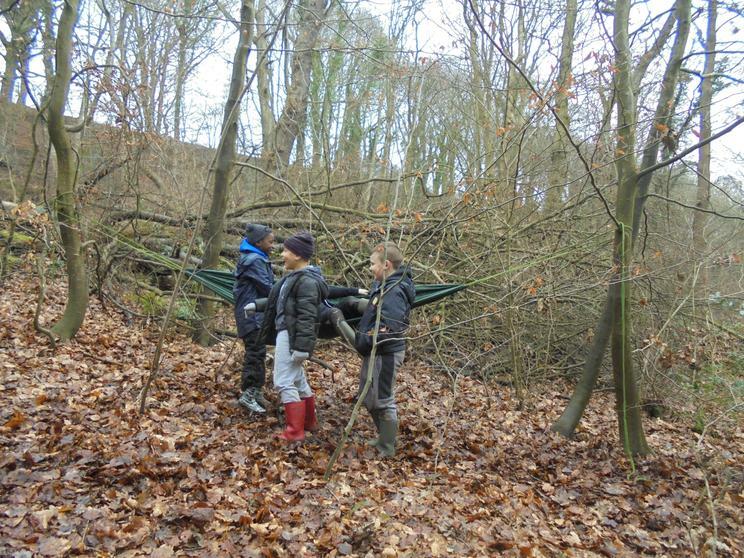 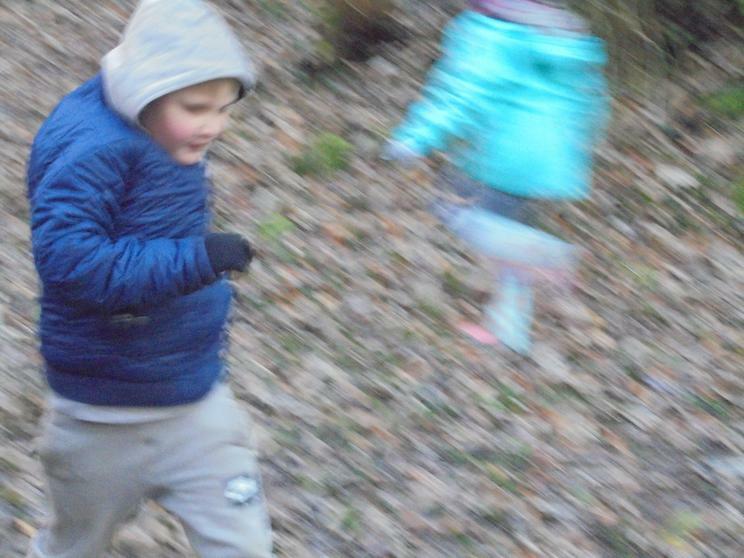 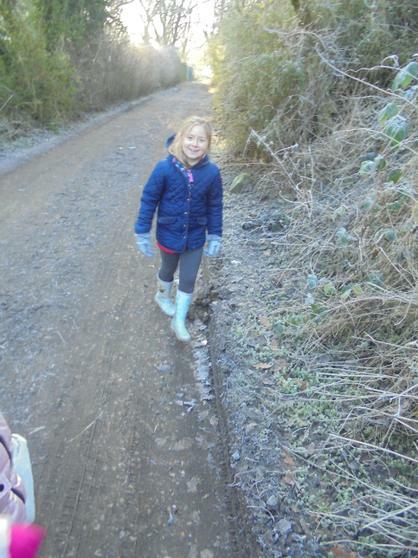 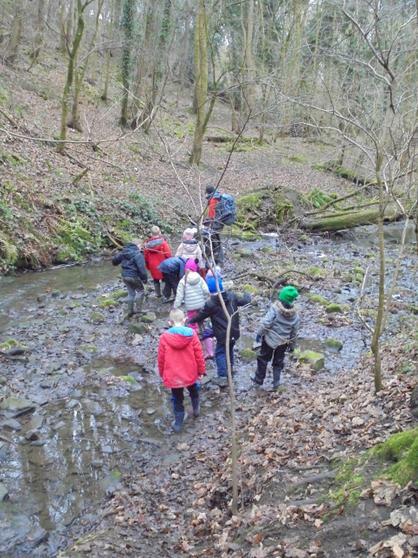 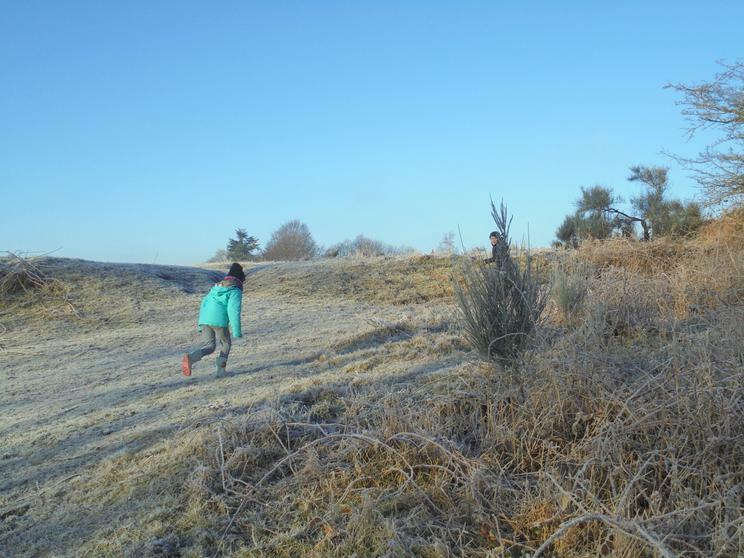 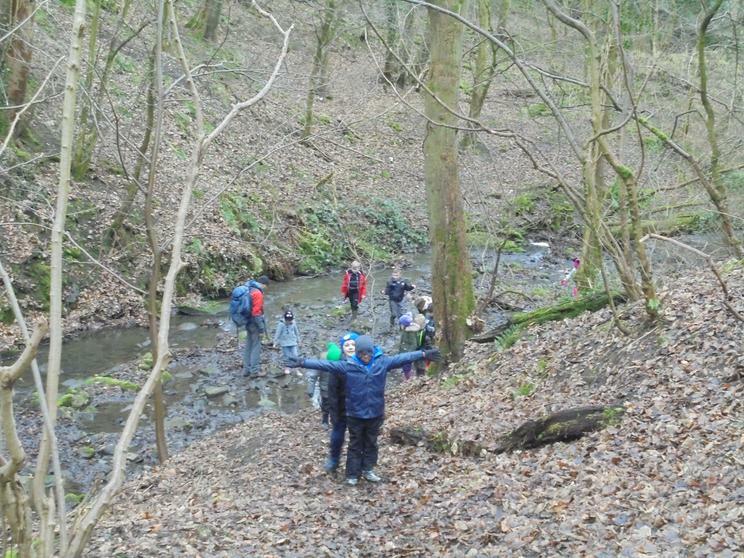 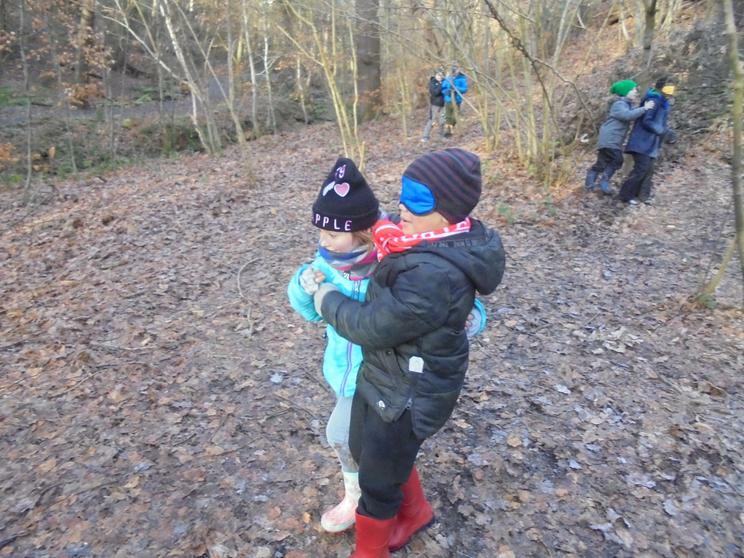 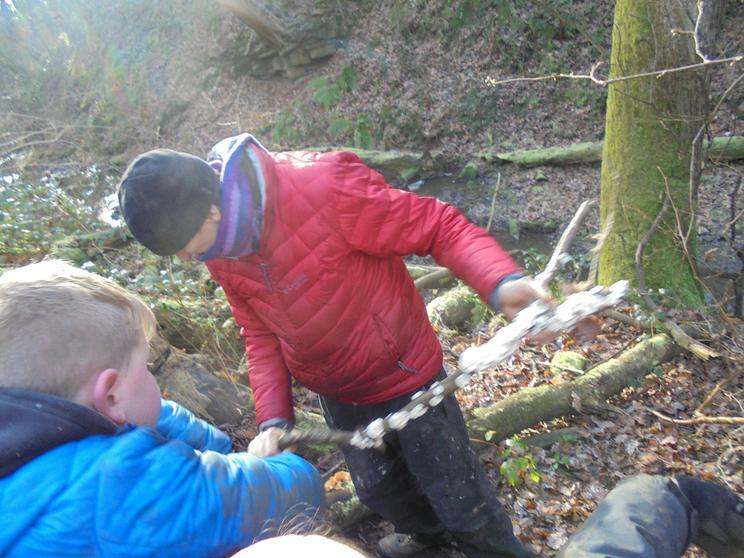 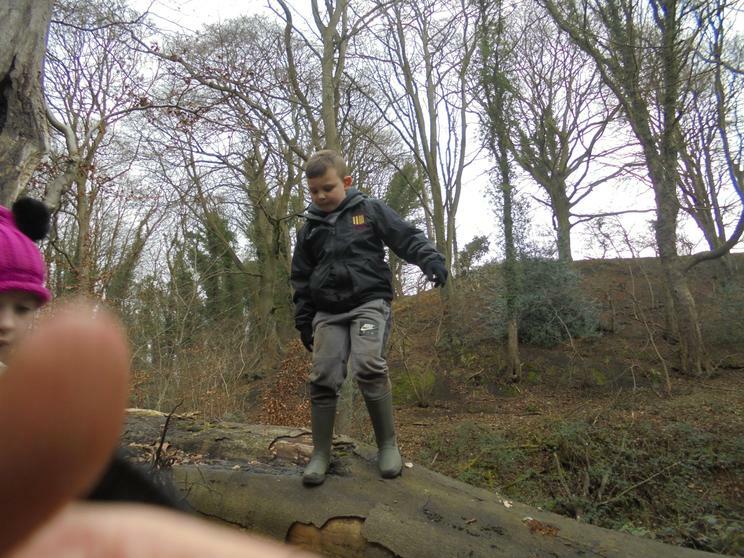 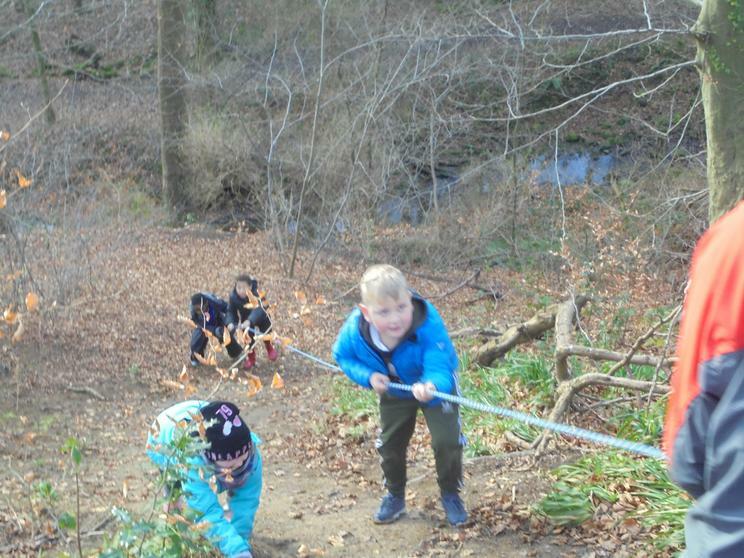 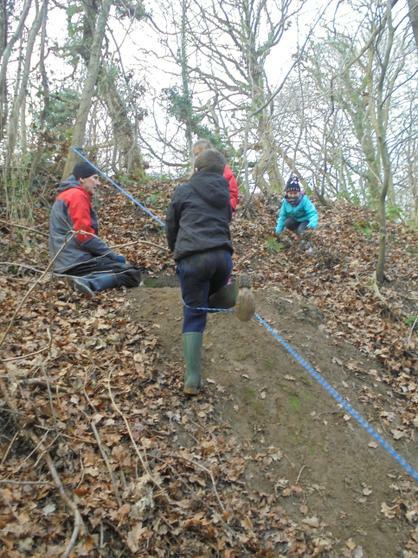 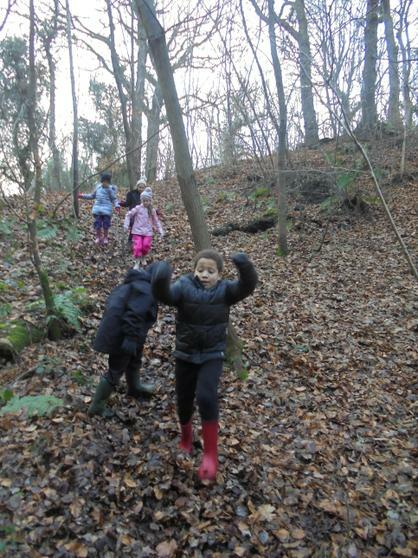 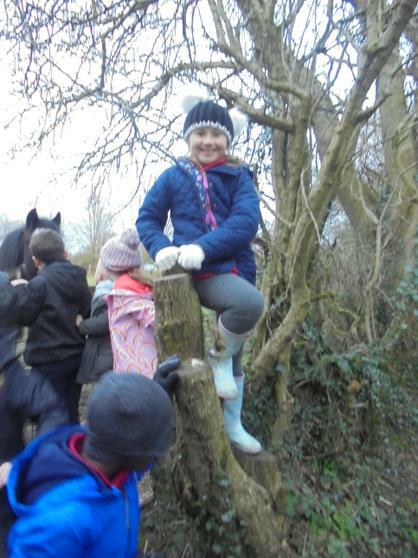 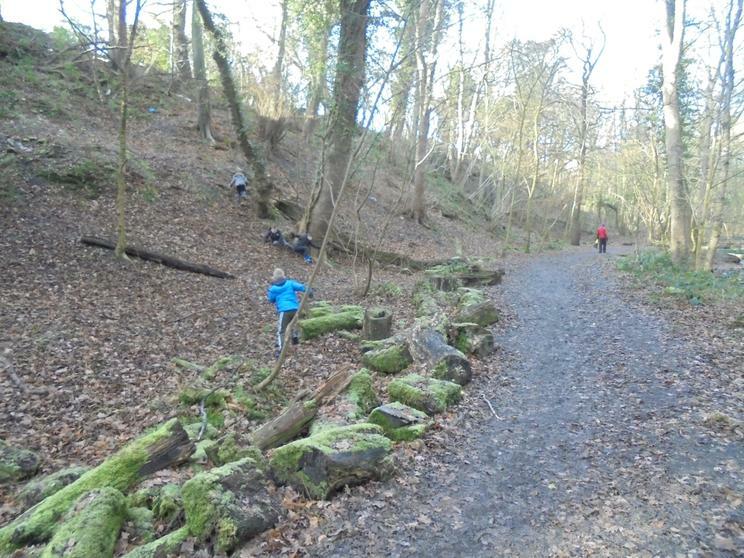 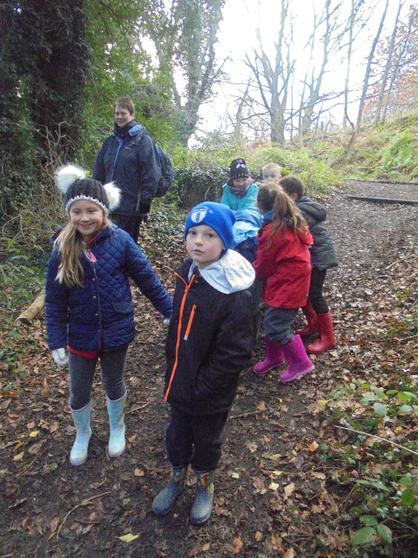 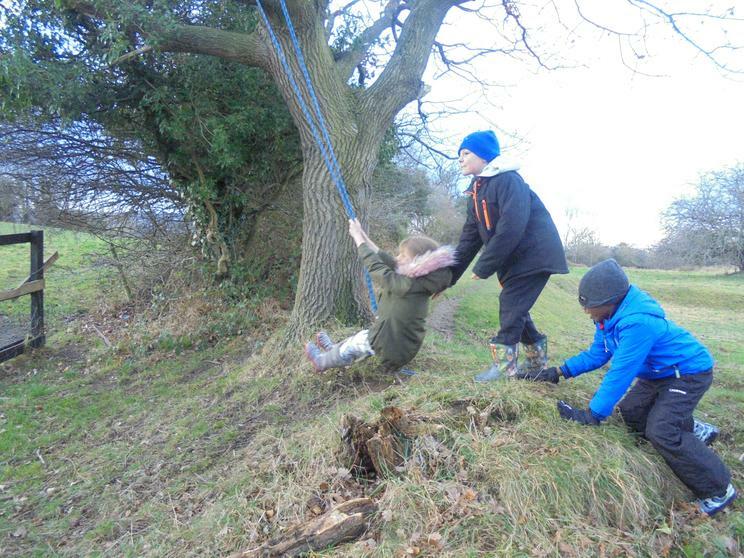 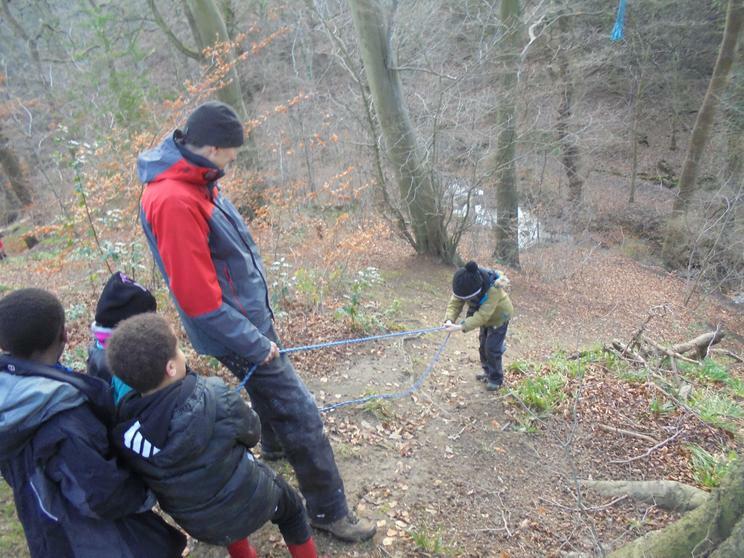 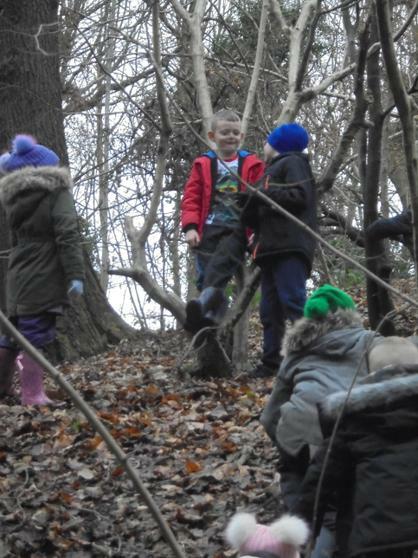 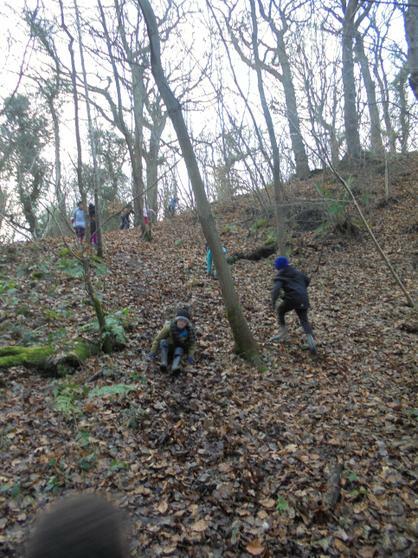 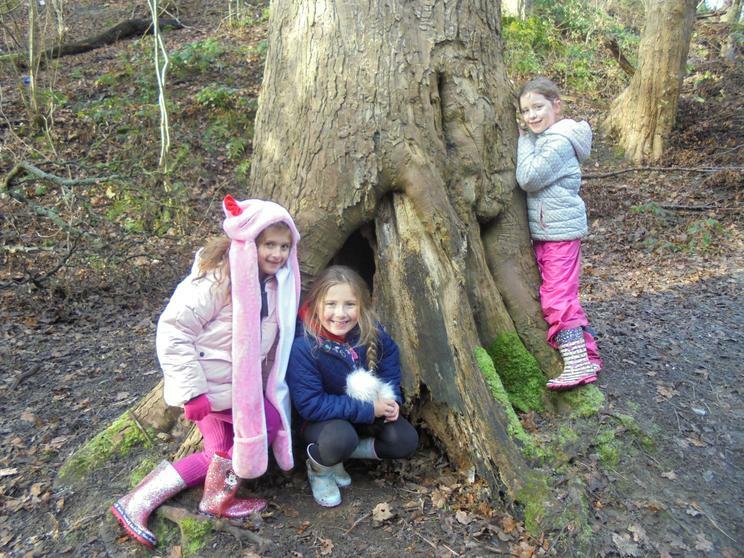 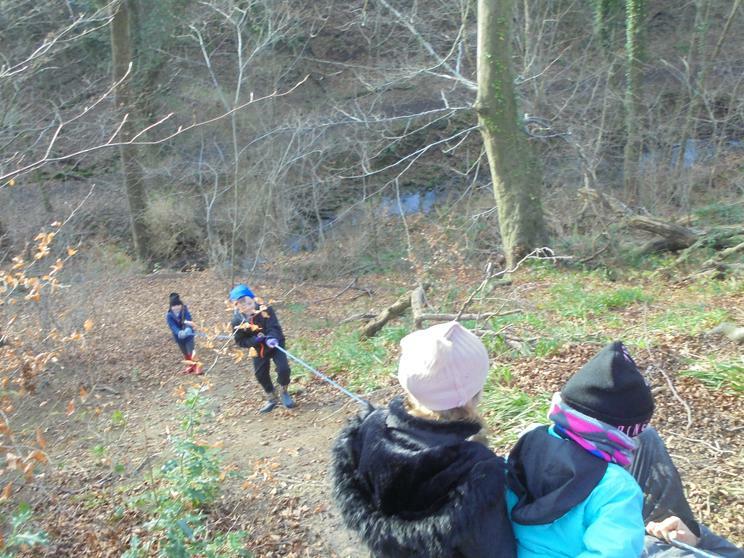 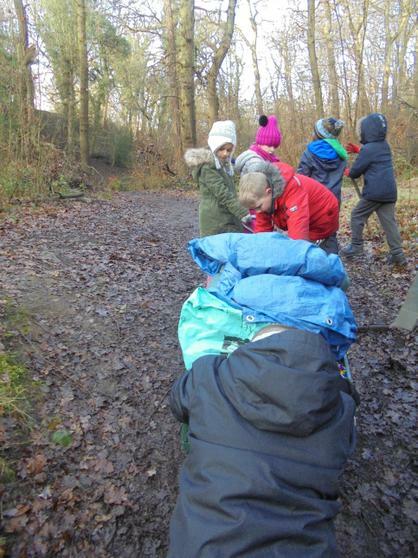 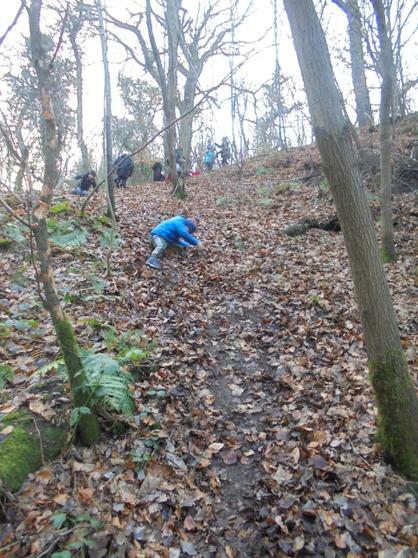 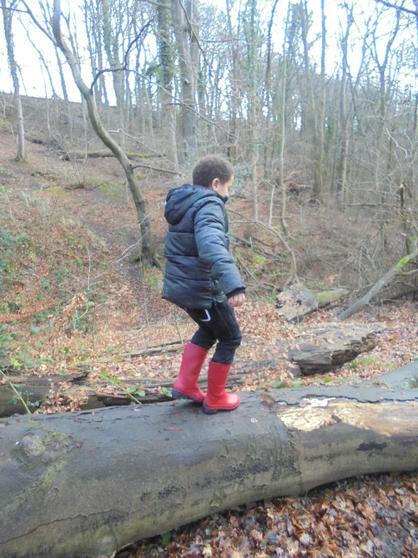 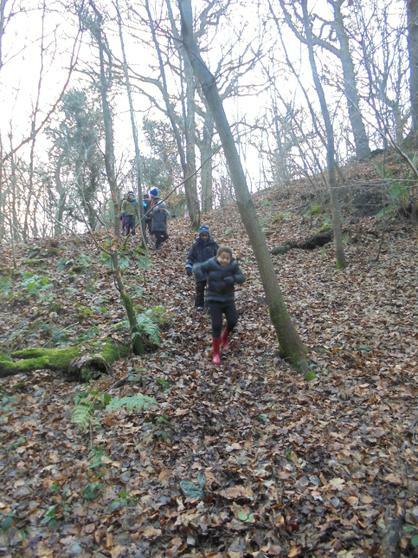 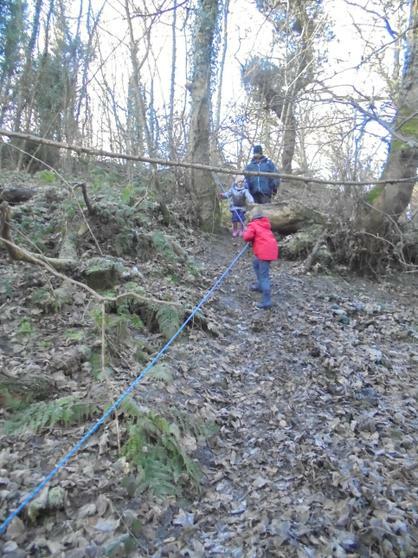 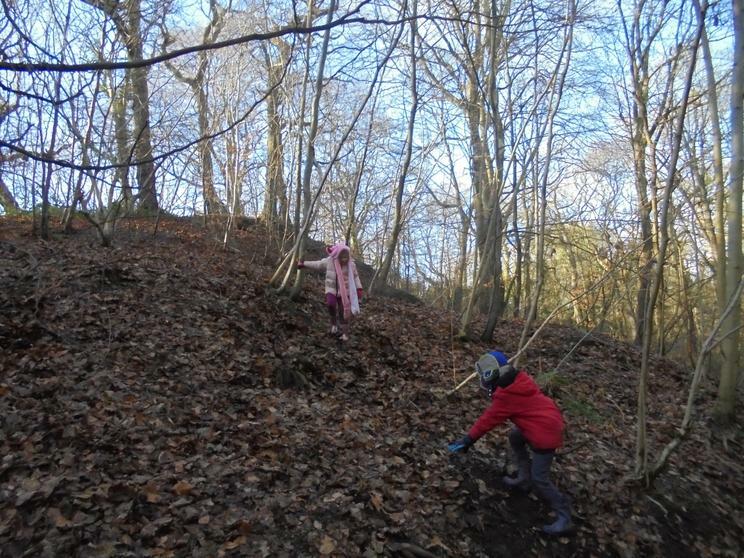 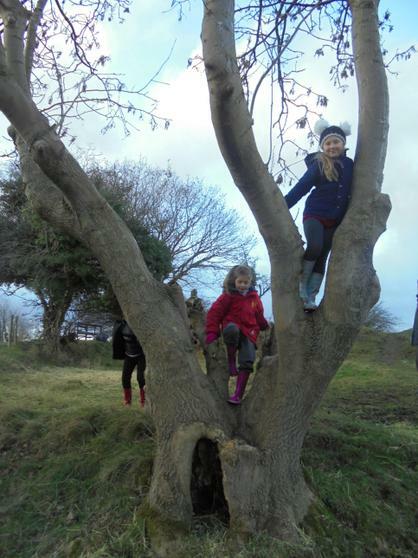 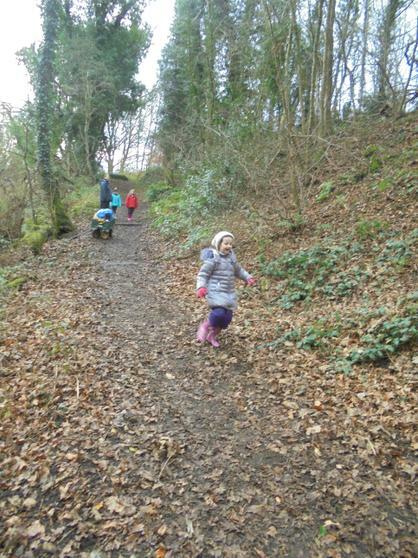 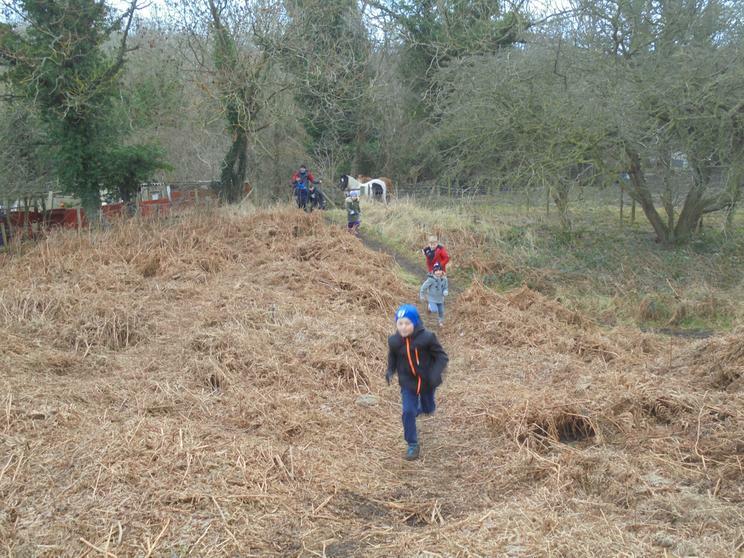 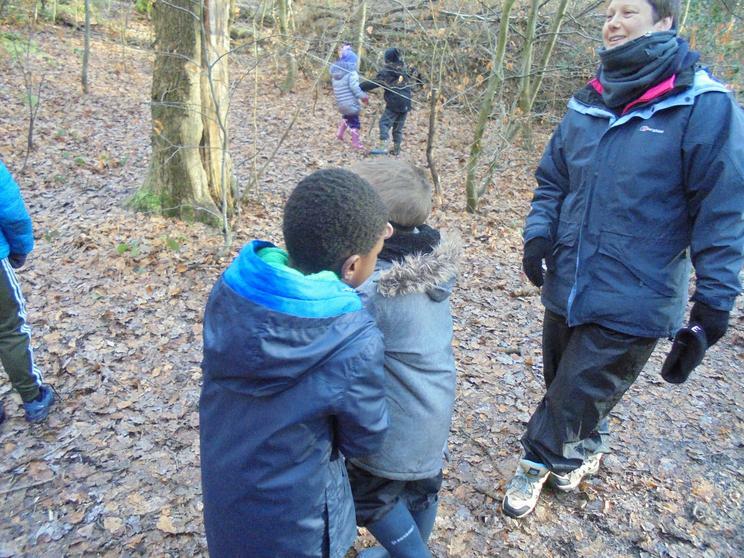 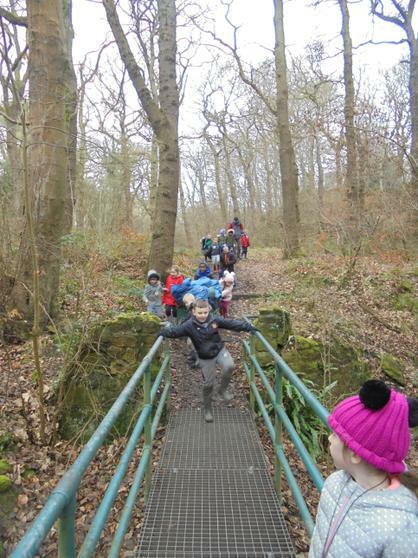 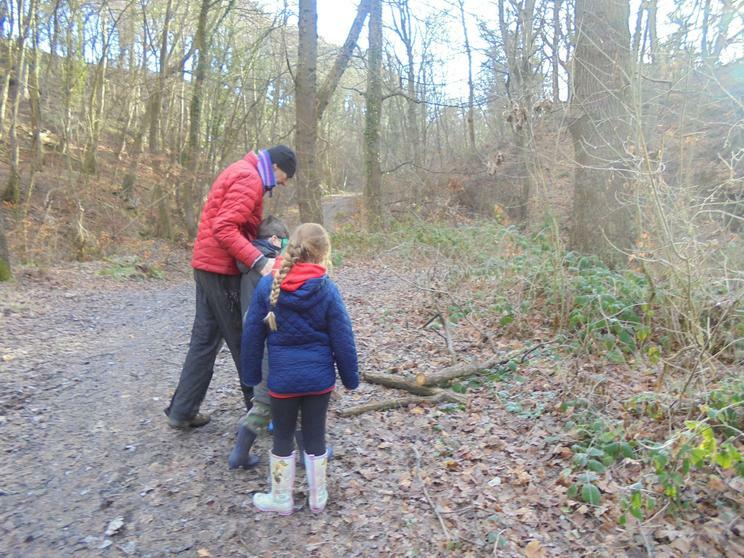 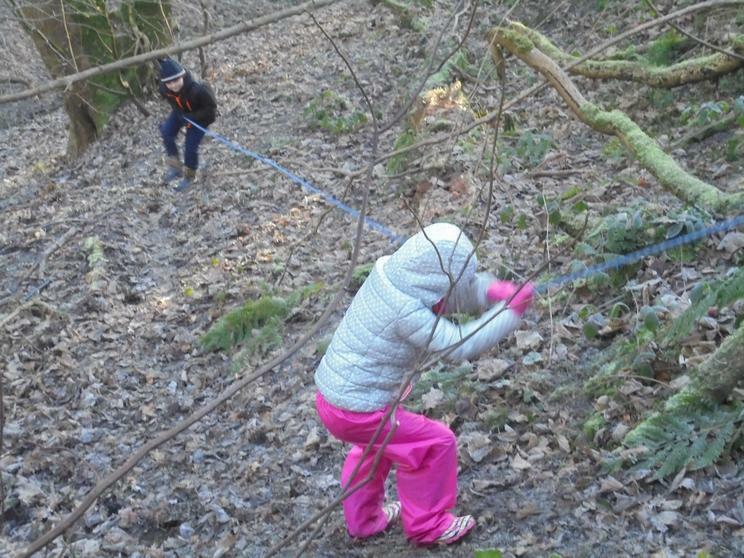 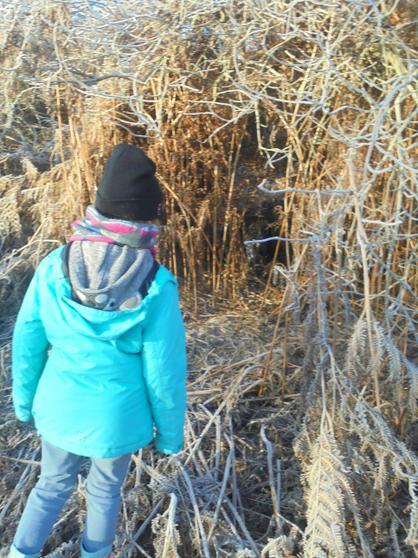 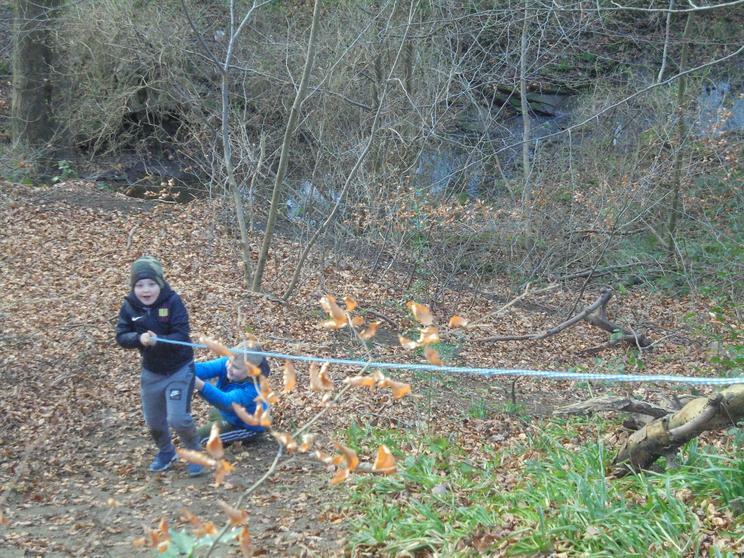 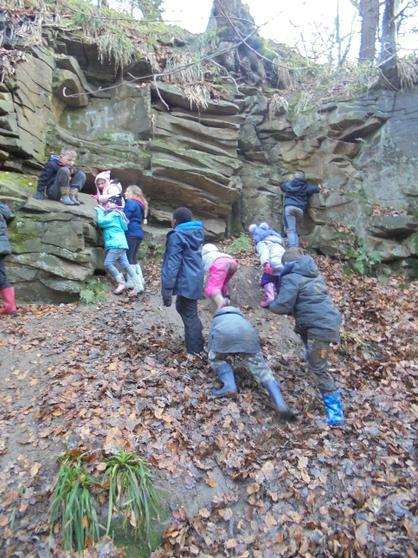 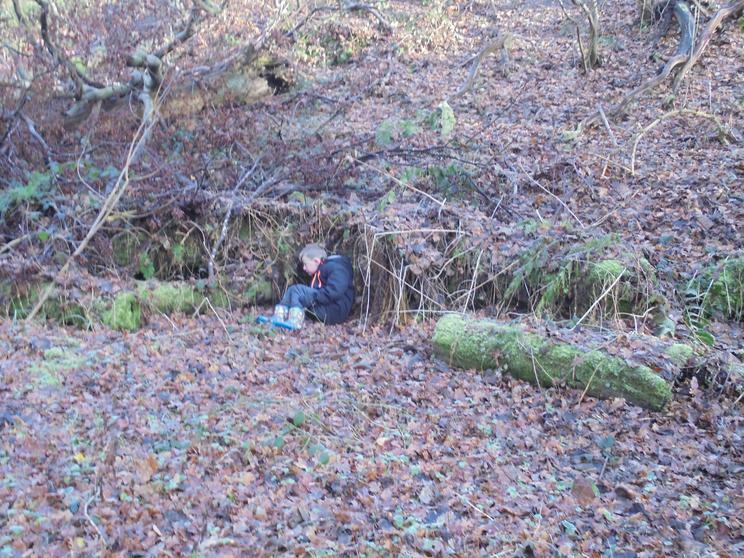 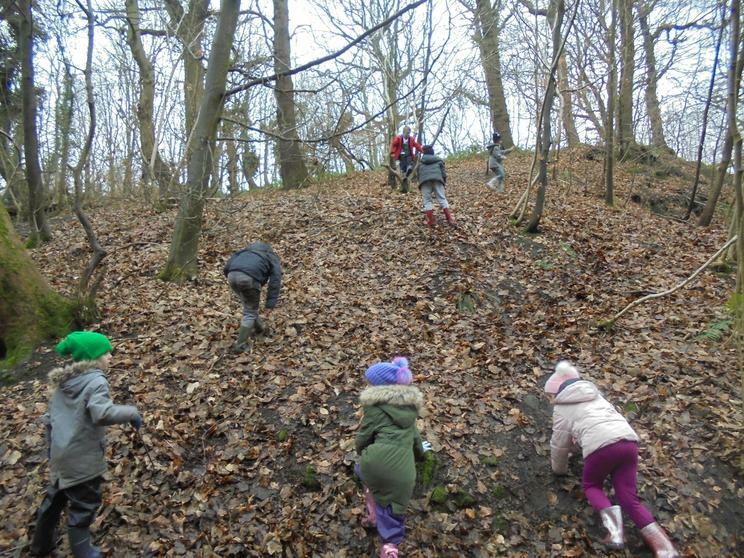 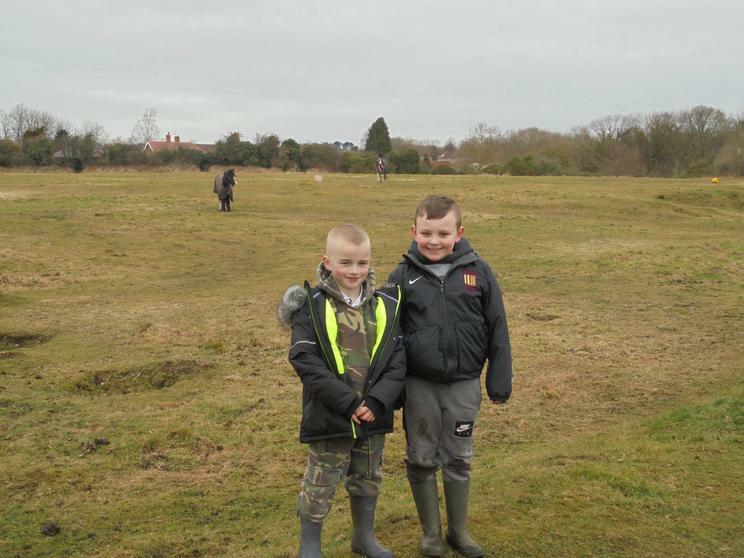 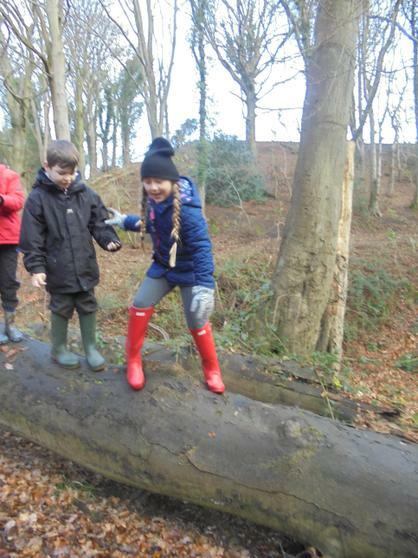 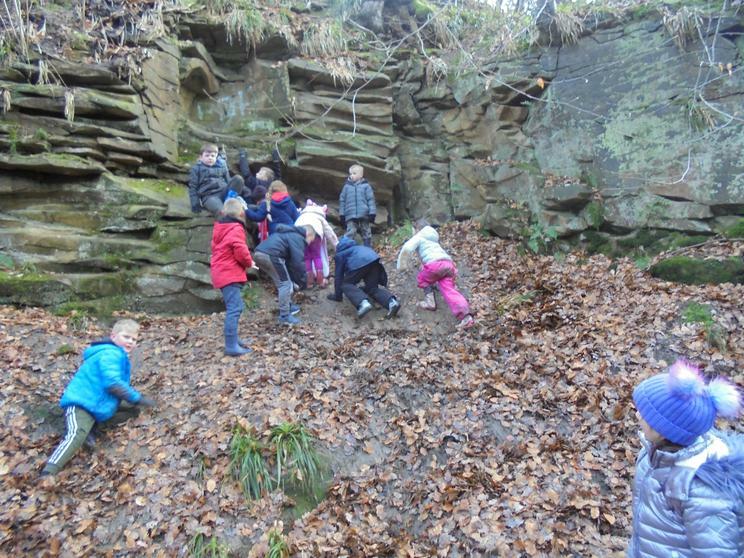 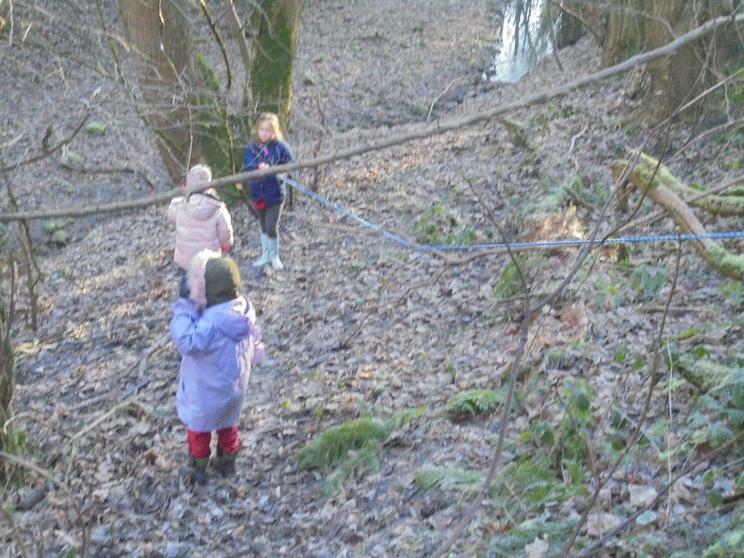 The children found a very slippy log to walk along, a great spot for a den and a most amazing slope to slide down. 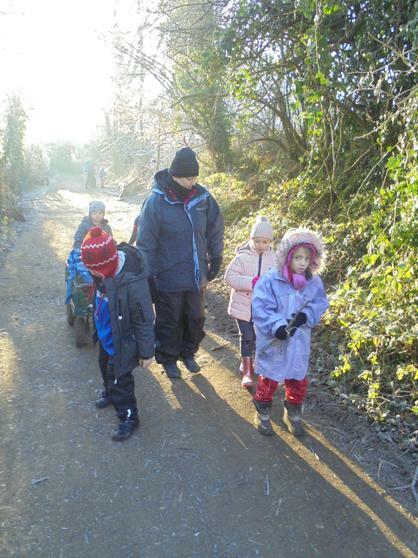 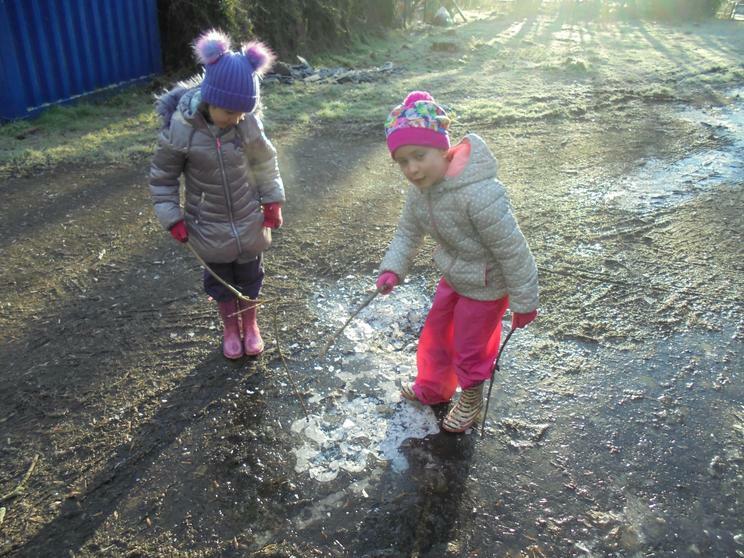 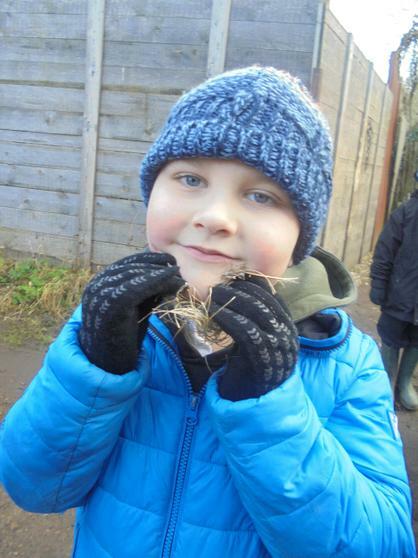 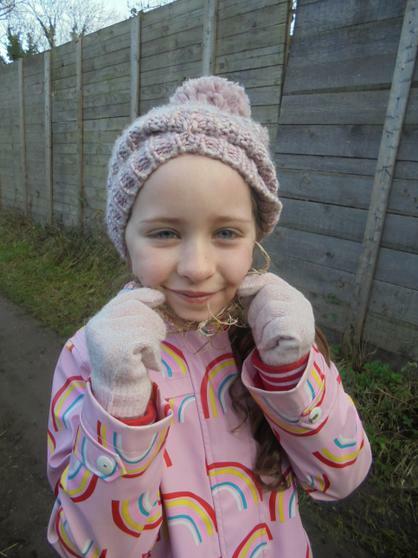 In this weather it is very important that the children have enough layers on so please could all carers make sure children are well dressed for the outside.